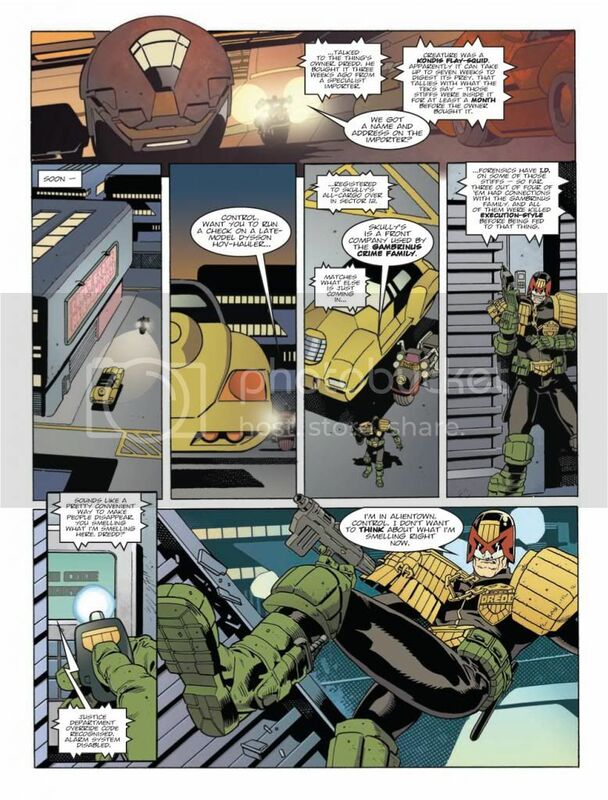 - because hardly anyone will have read any Dredd, I've tried to make each section as comprehensive as possible to give a good feeling for where he stats out at. 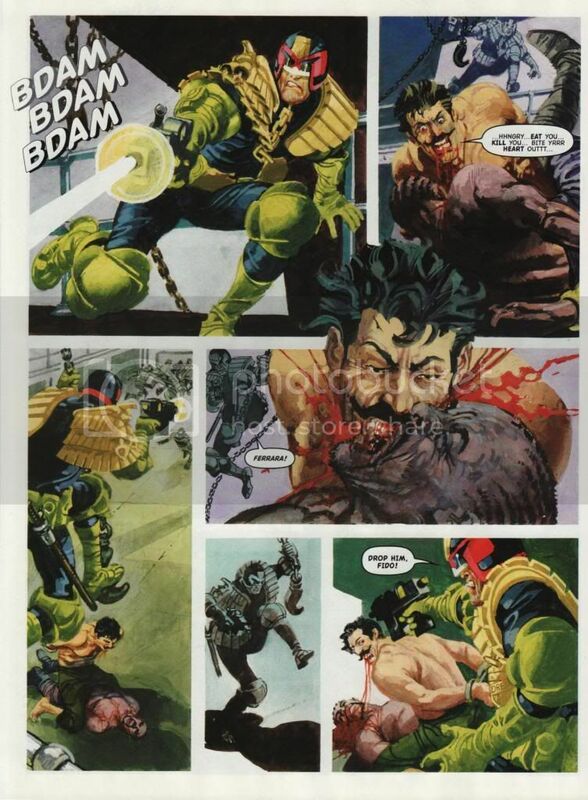 However, I'm also aware that not many people (okay, noone) is going to sit and read every one of the many thousands of scans this thread will eventually include. 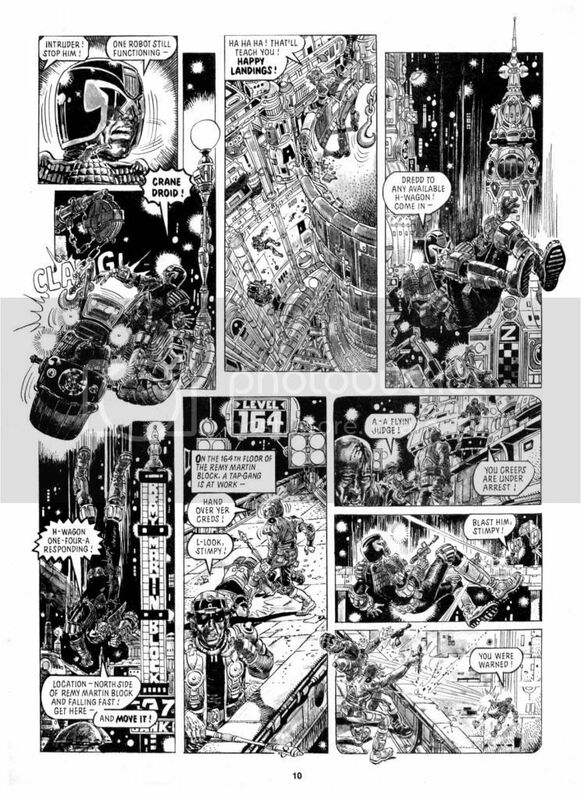 So, for each sub-section I've highlighted a handful of the best showings. 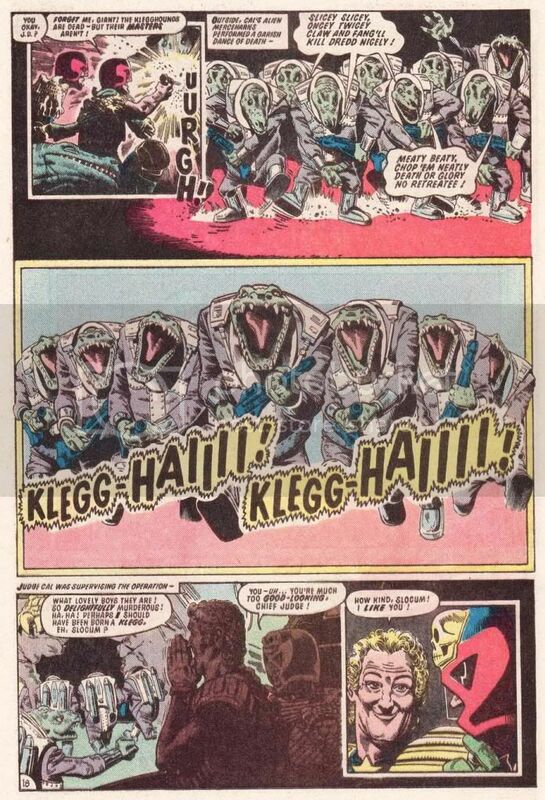 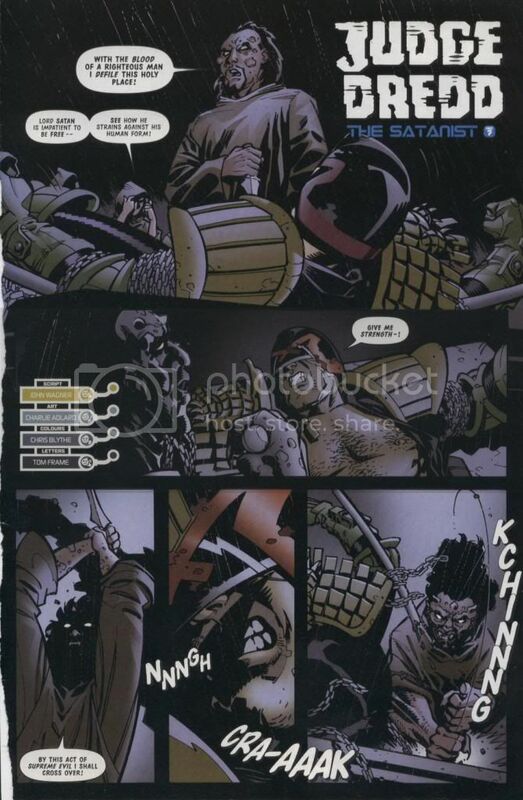 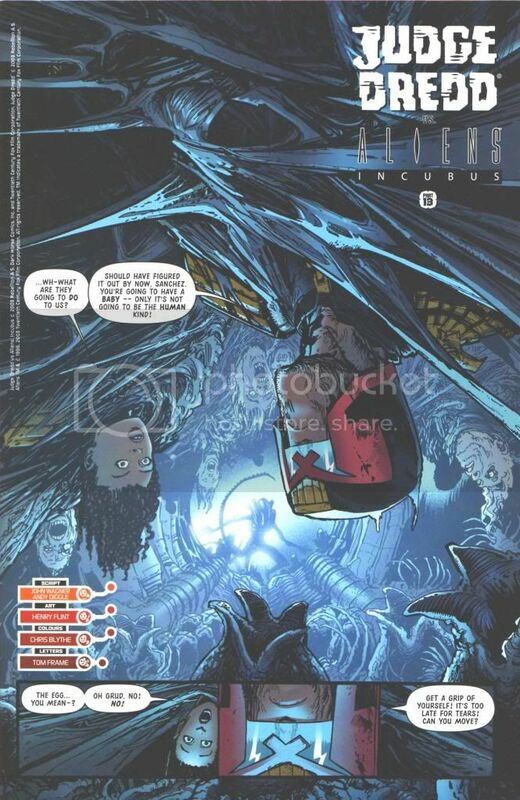 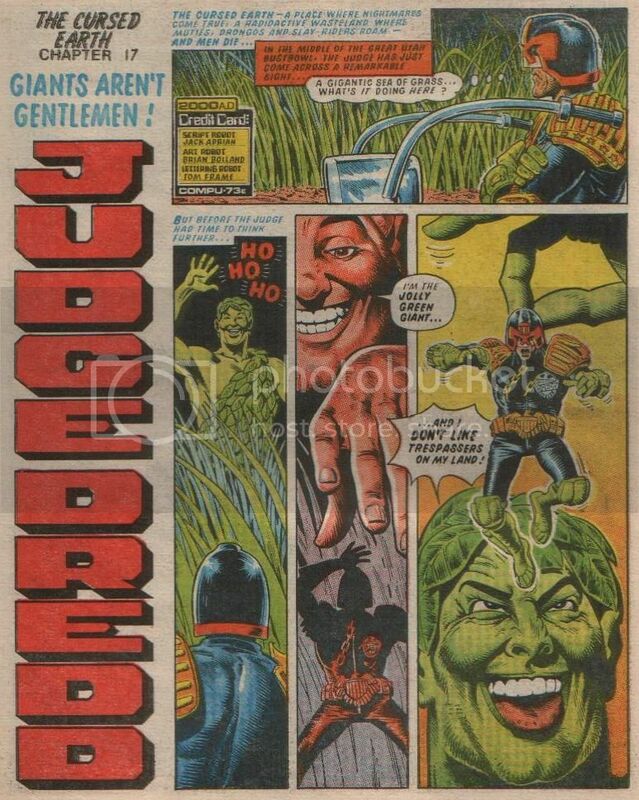 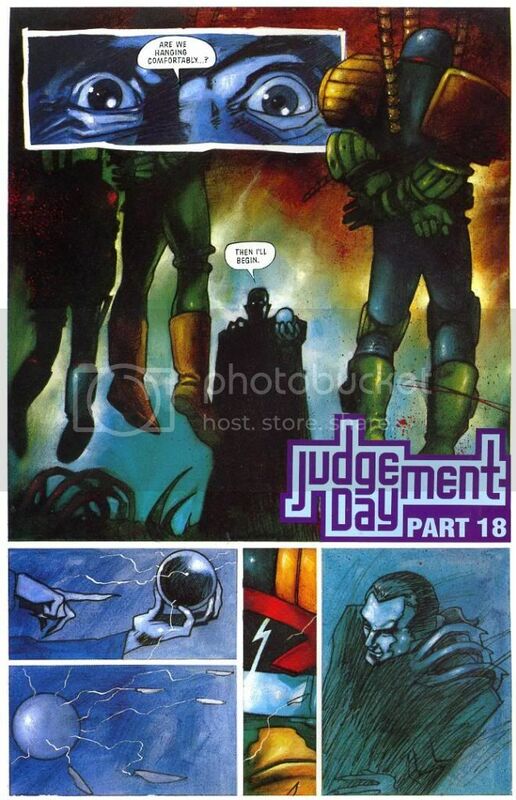 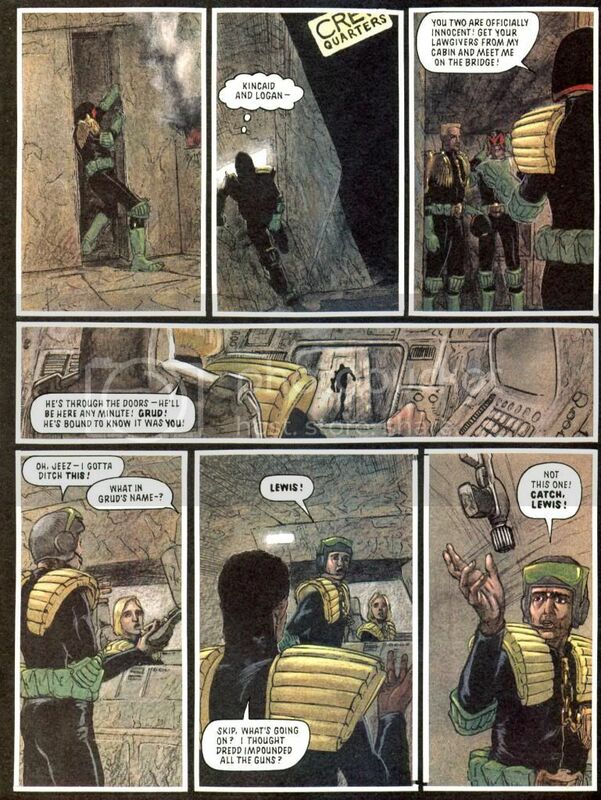 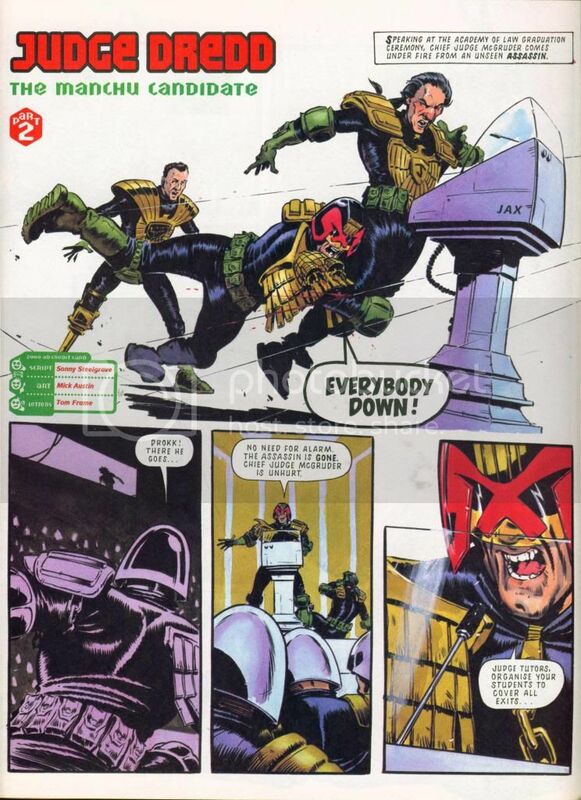 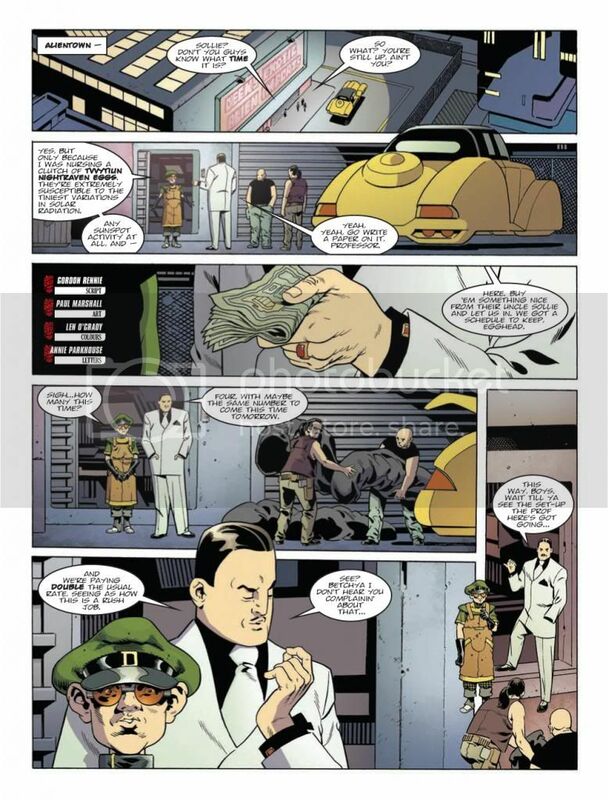 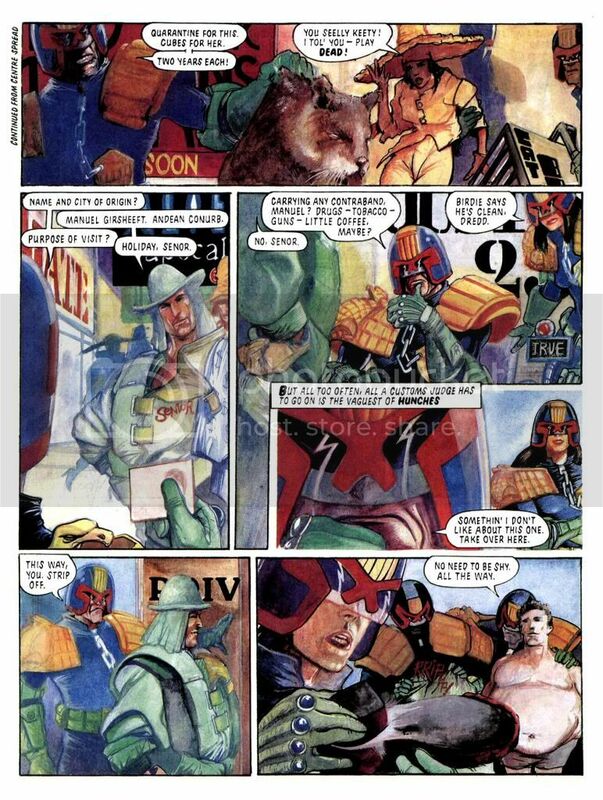 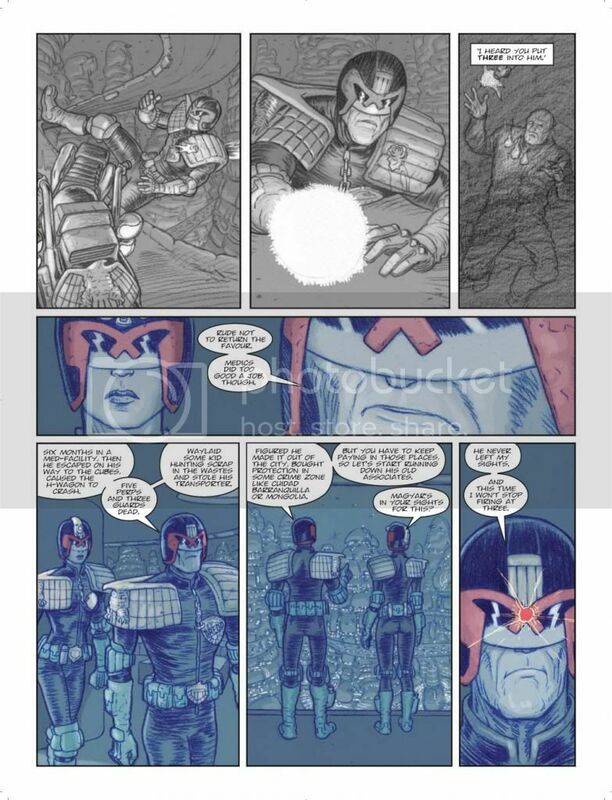 If you just want to see Dredd's best showings for each section, keep an eye out for "***" next to the issue number. 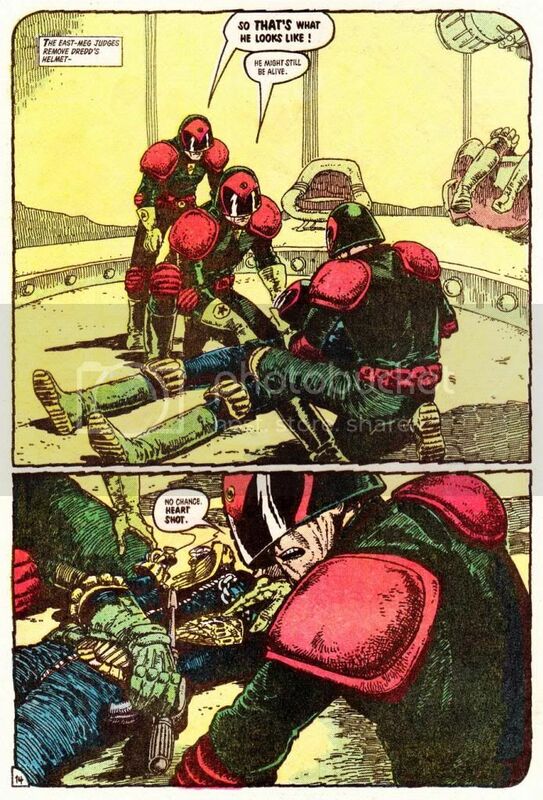 Alternatively, press Control + F and search for "***". 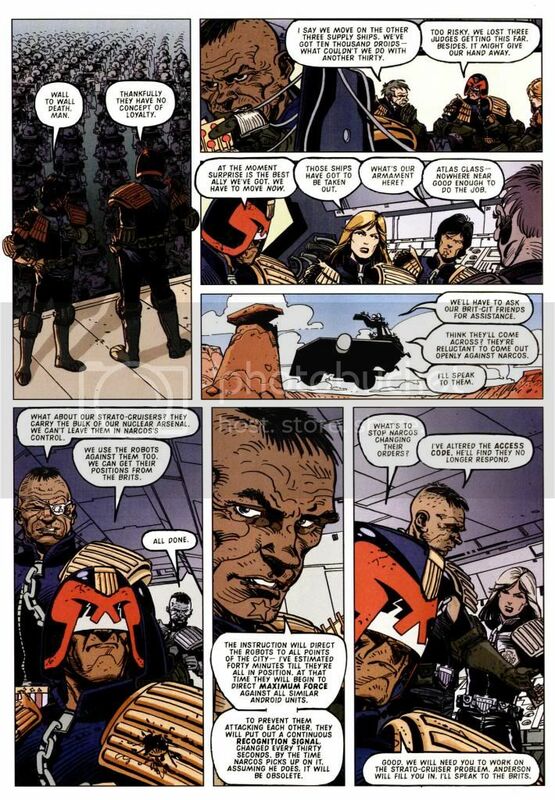 - the reason I have reserved 50 posts is because, eventually, this thread will extend beyond just Dredd himself. 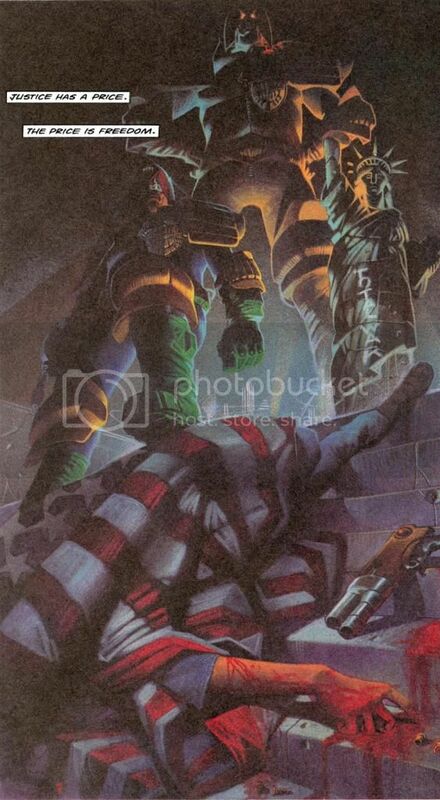 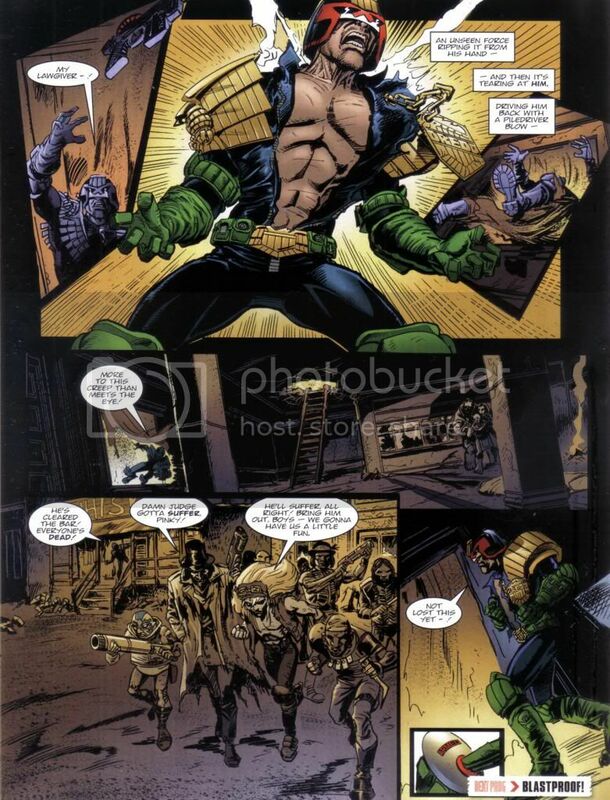 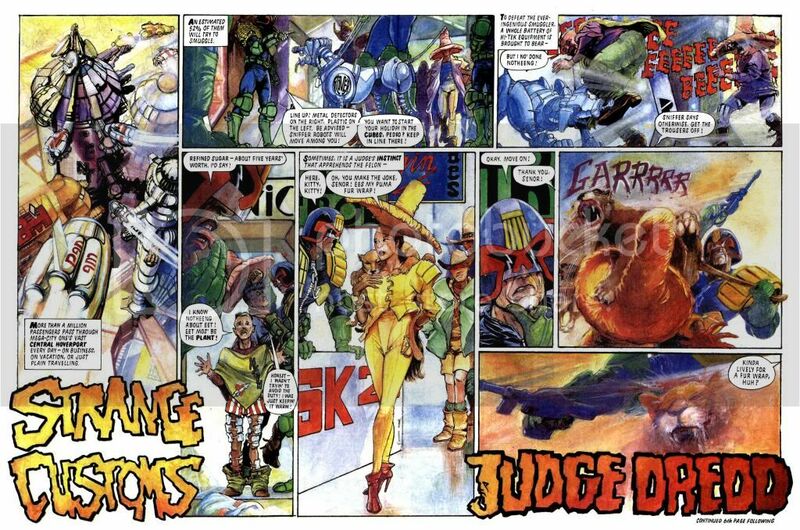 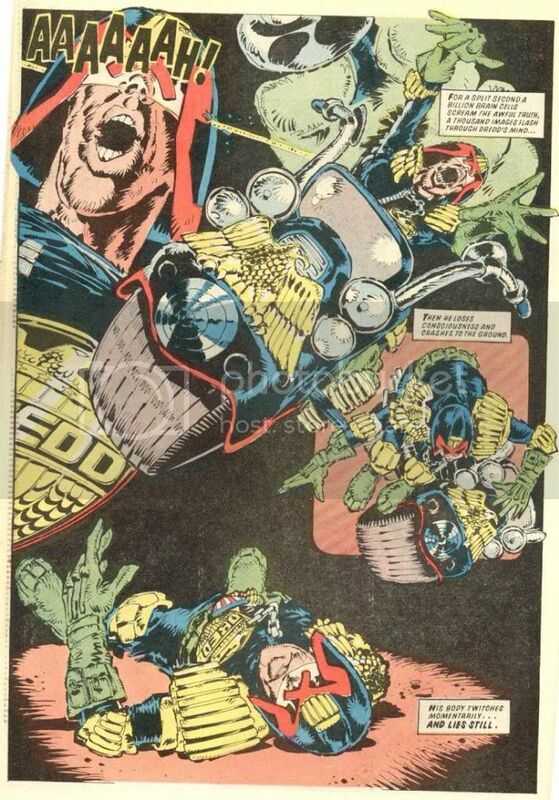 I'm obviously aware that a lot of his best combat showings will be pretty meaningless to people who aren't familiar with the guys Dredd is fighting against. 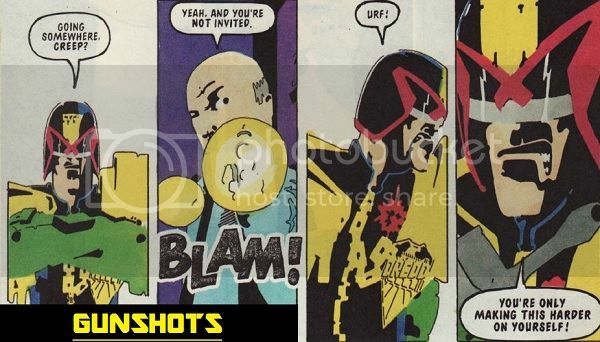 So, eventually, the final 20 or 25 posts I've reserved will be dedicated not to Dredd, but to a broad reaching "Context" section which will include a ton of showings for all of Dredd's major allies and adversaries. 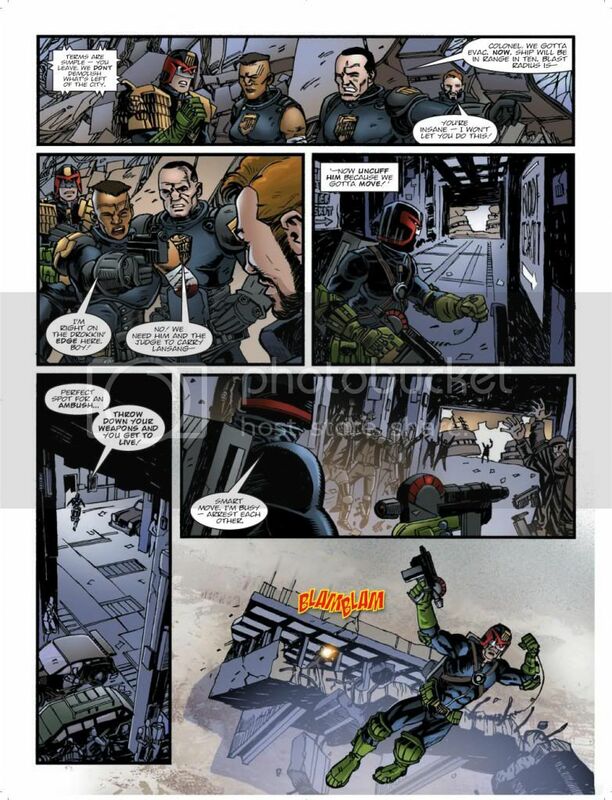 This will hopefully allow others to make their own minds up on how impressive Dredd's showings are. 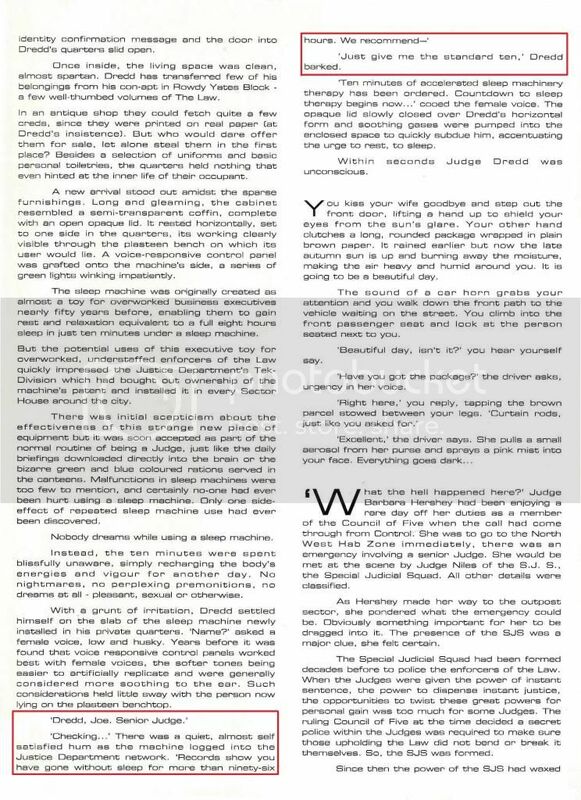 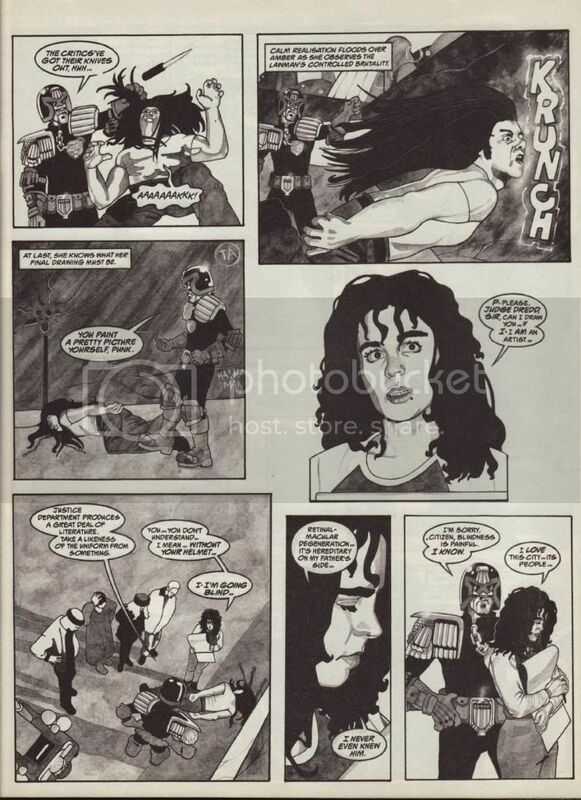 - I have all of the scans saved and uploaded to photobucket, it's now just a case of finding the time to type each section up. 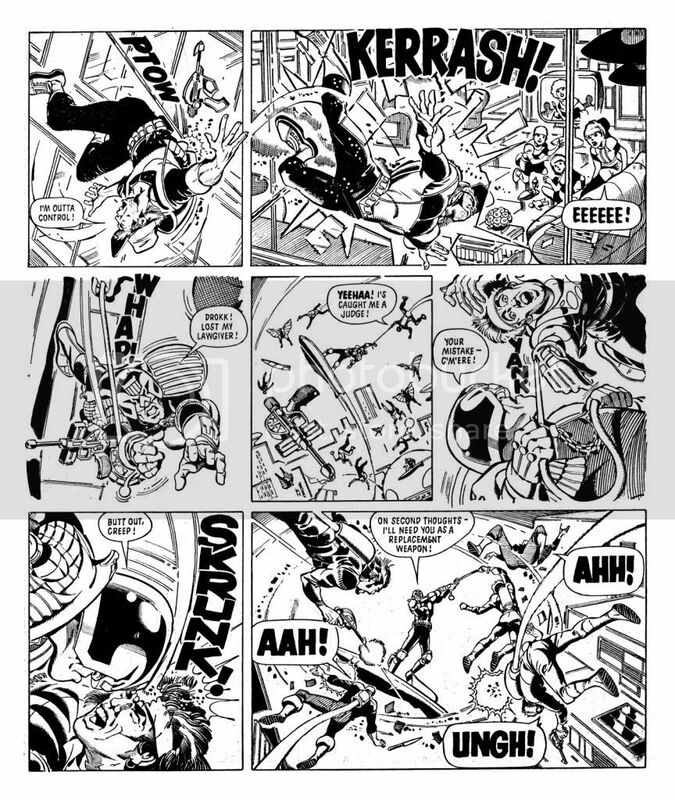 Hopefully new sections will go up as a steady drip-feed as and when I have time/inclination to do so. 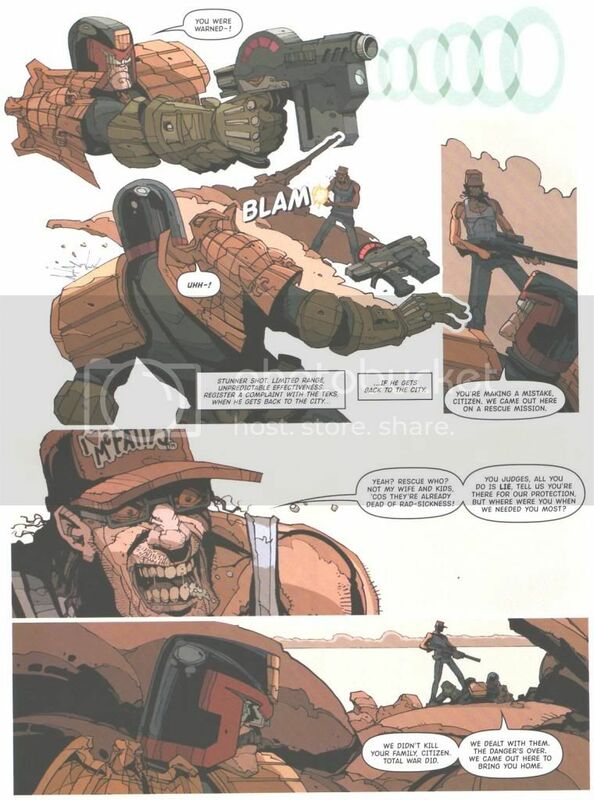 If you have any questions, please ask! 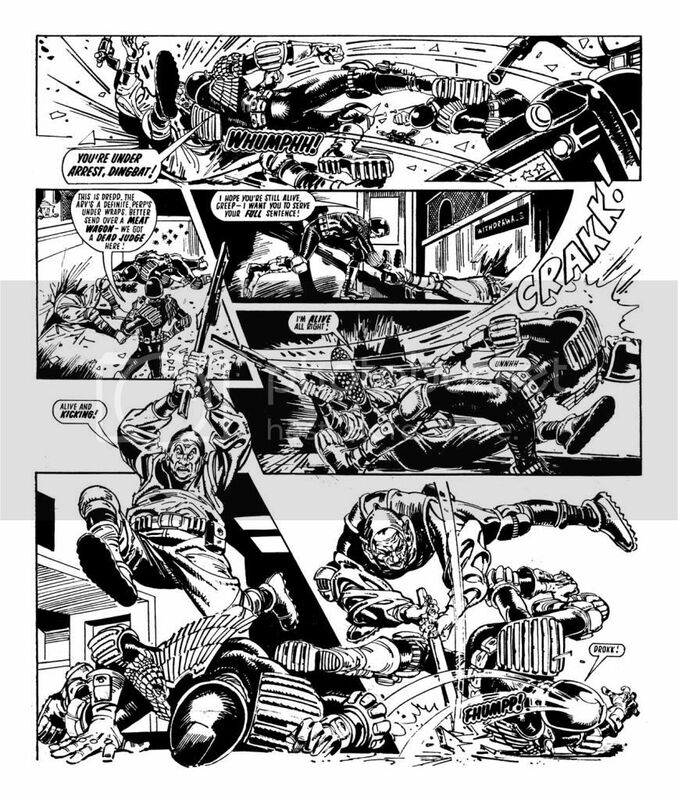 Make sure to check back as I will be adding and updating sections on a regular basis.
. 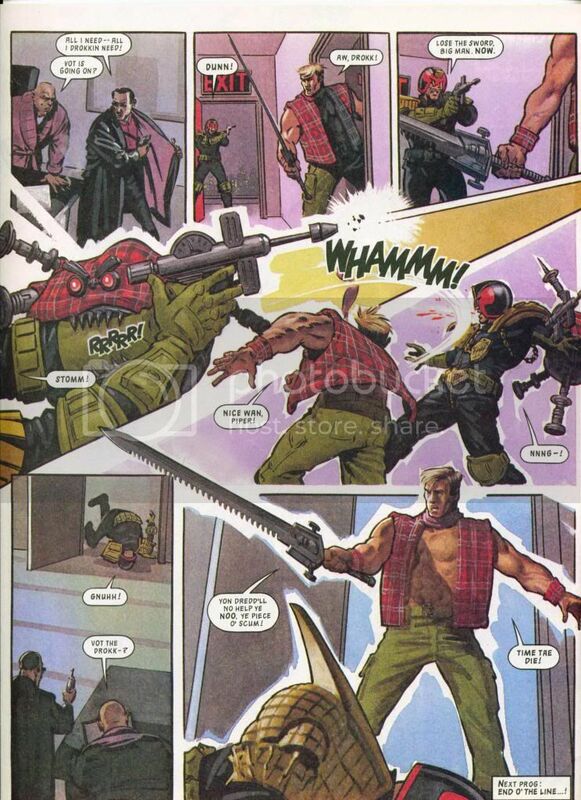 Cutting Damage - Added 04/10/2016!
. 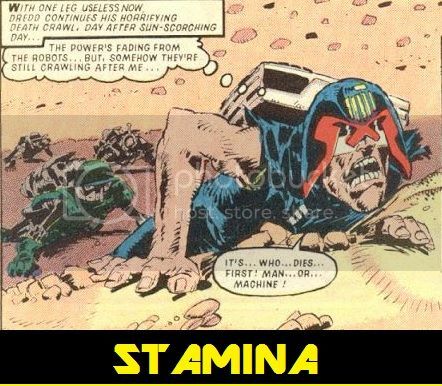 Stamina - Added 04/10/2016! 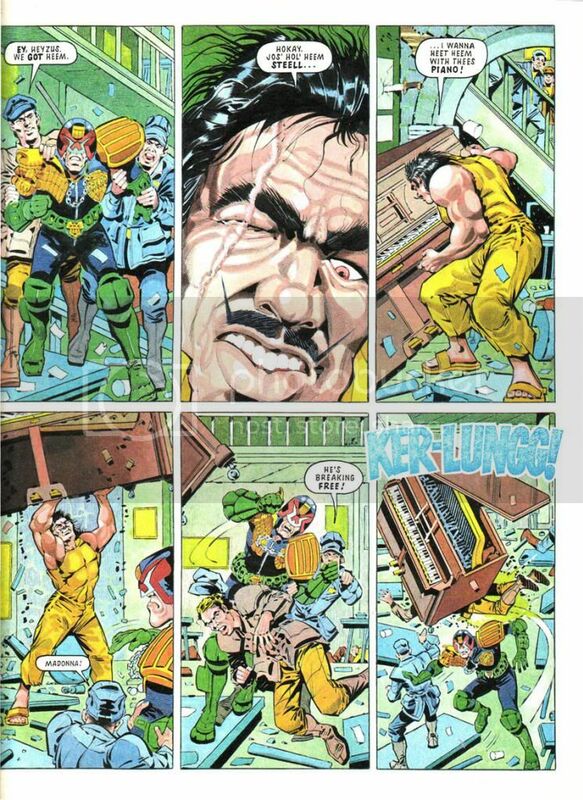 “Pure” strength feats including displays of lifting, throwing, catching etc. 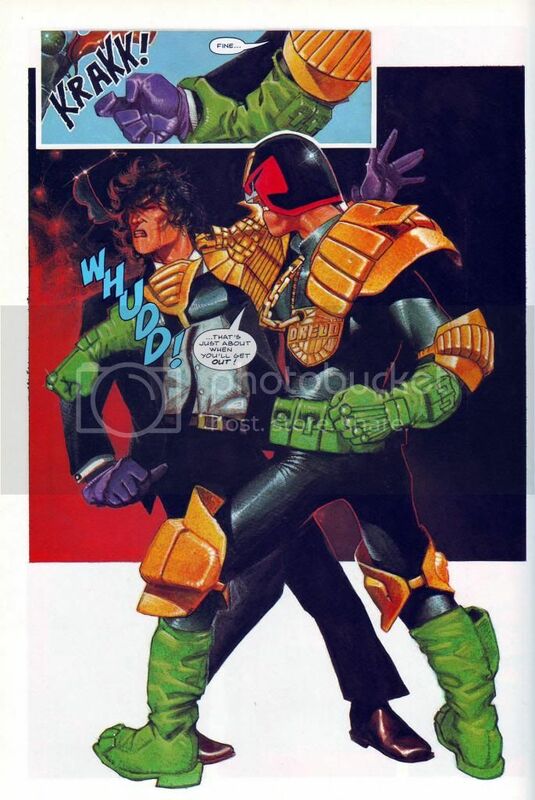 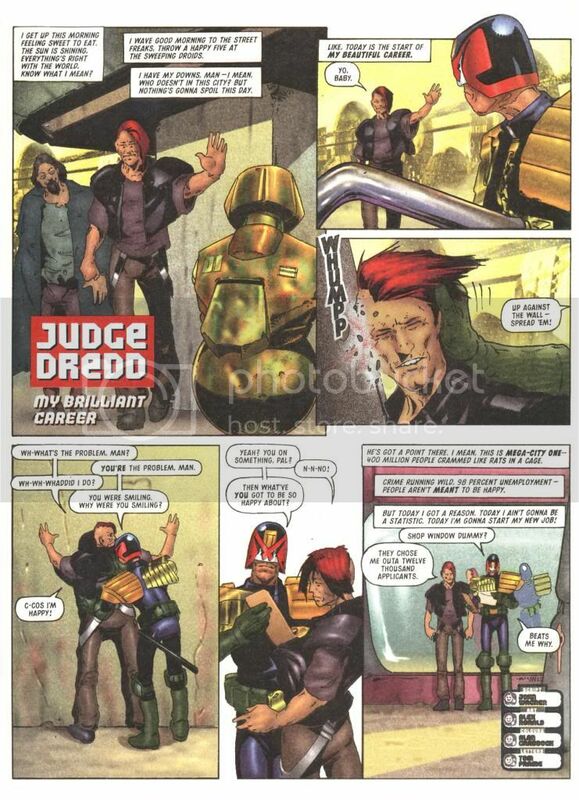 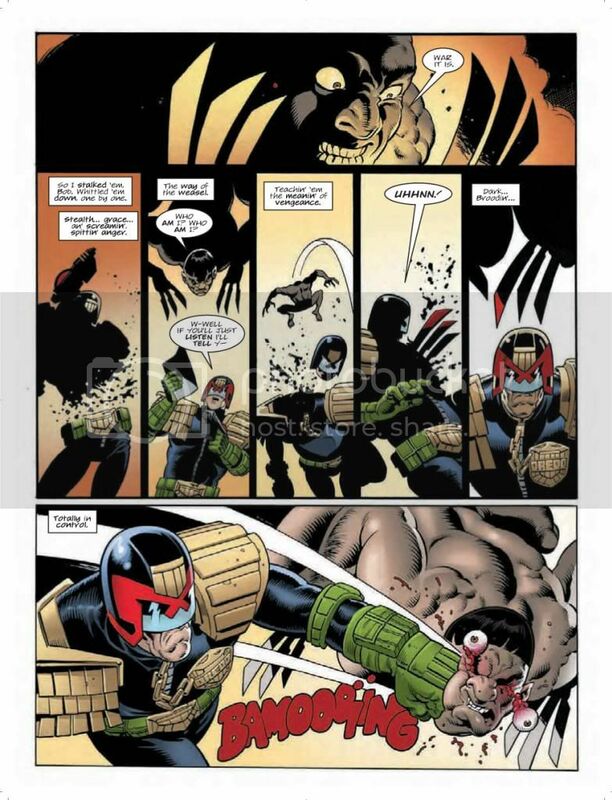 Showings involving Dredd punching, kicking etc. 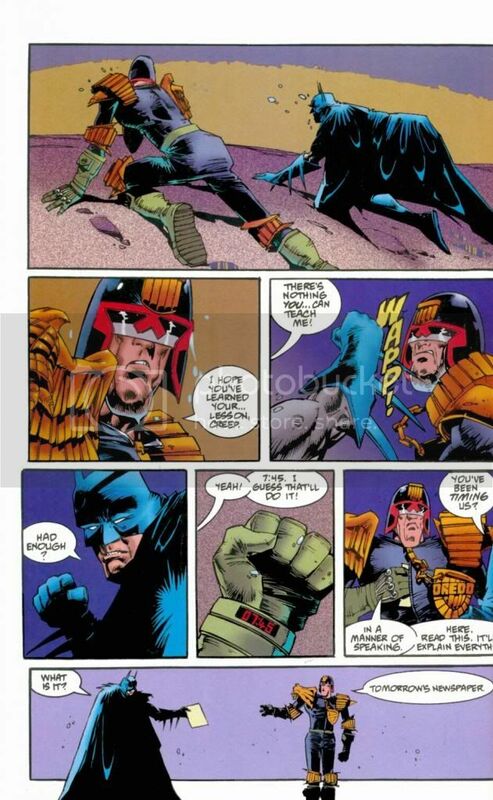 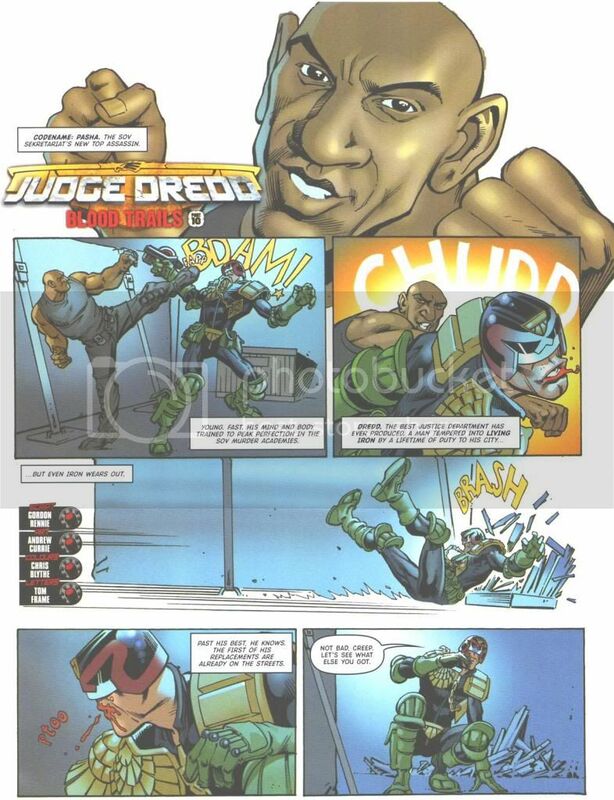 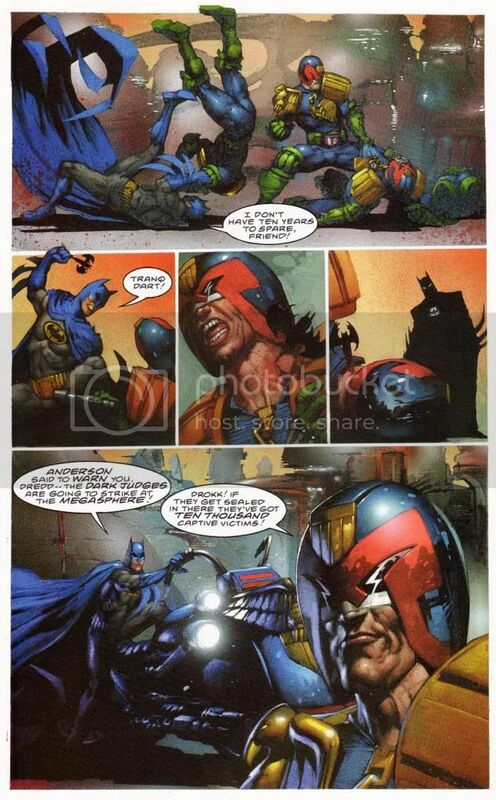 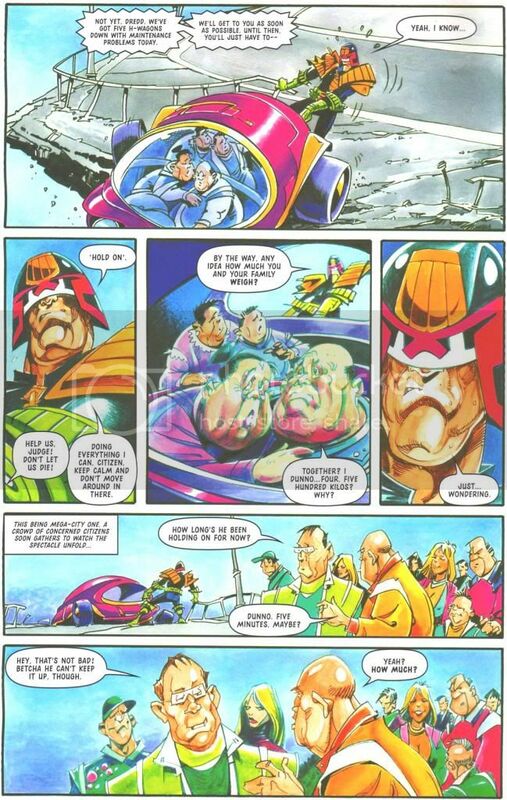 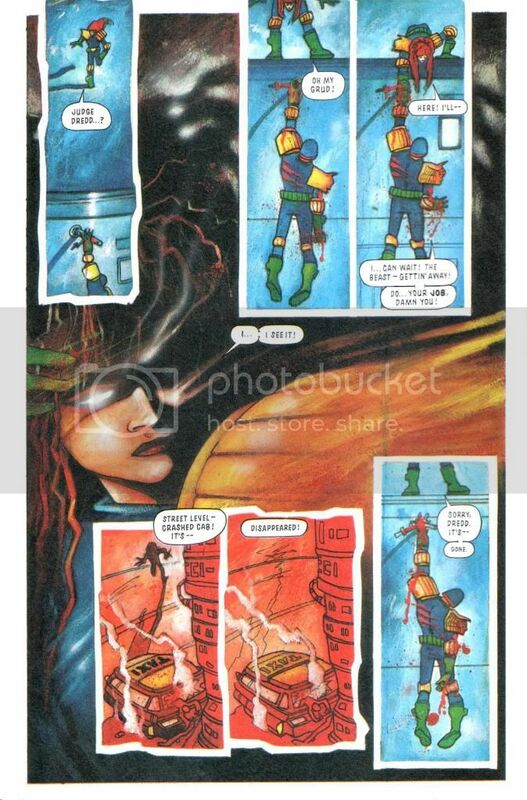 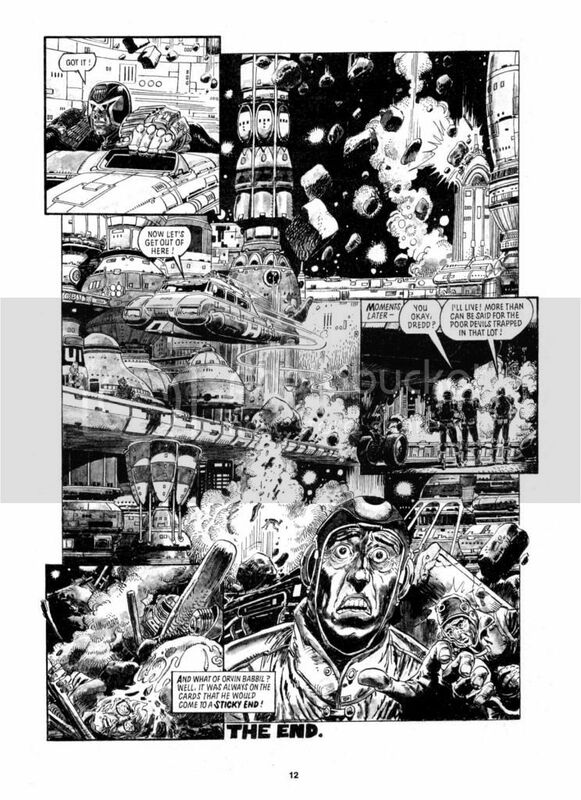 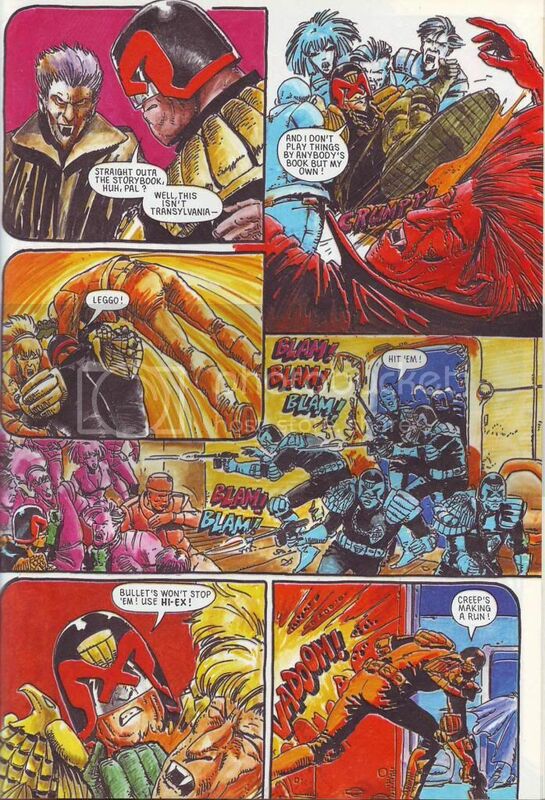 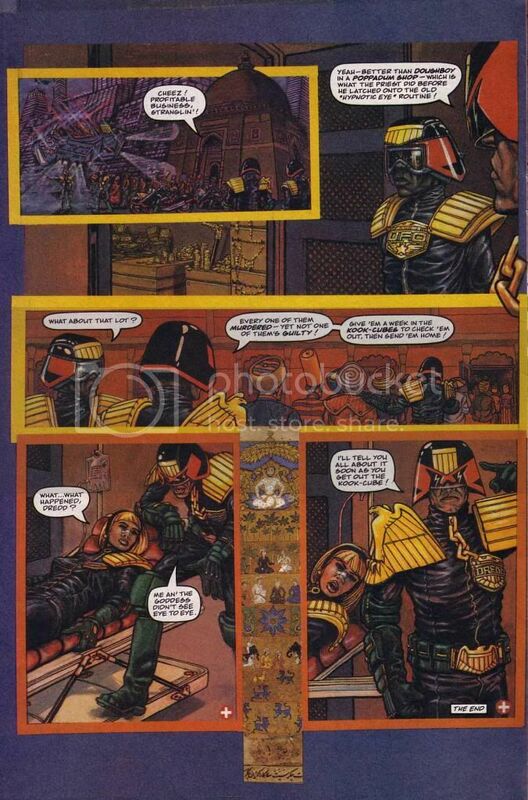 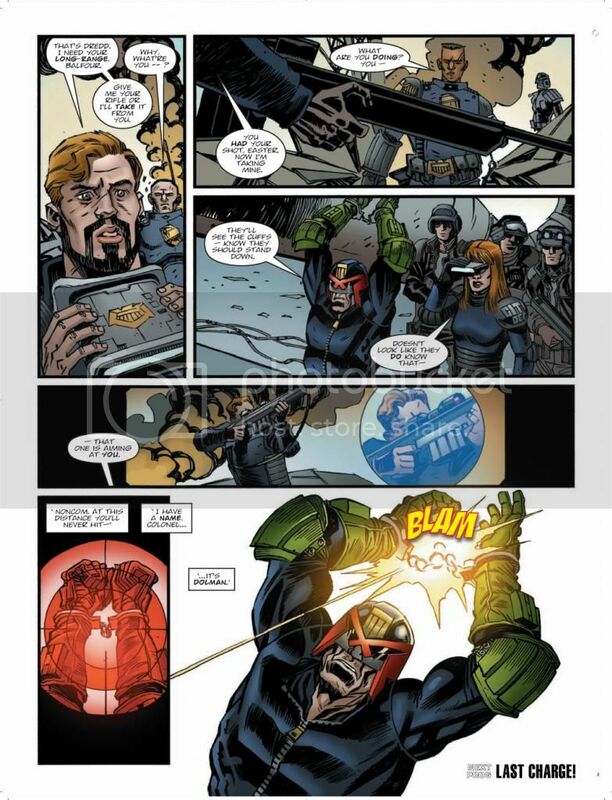 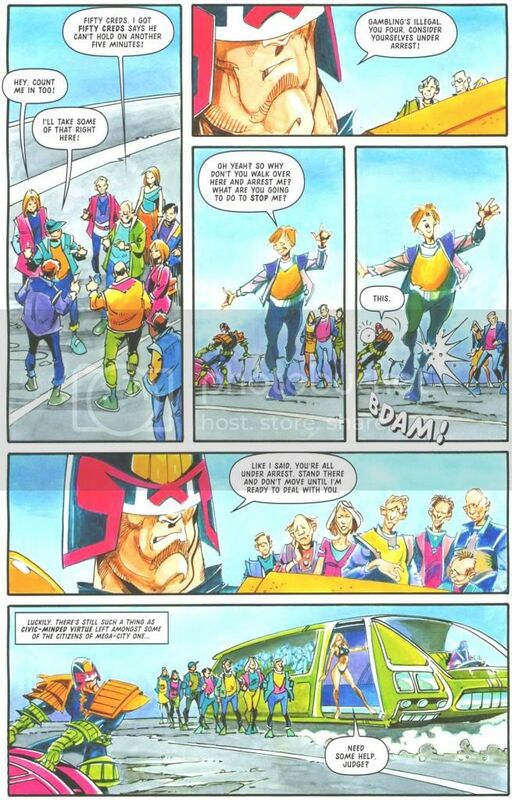 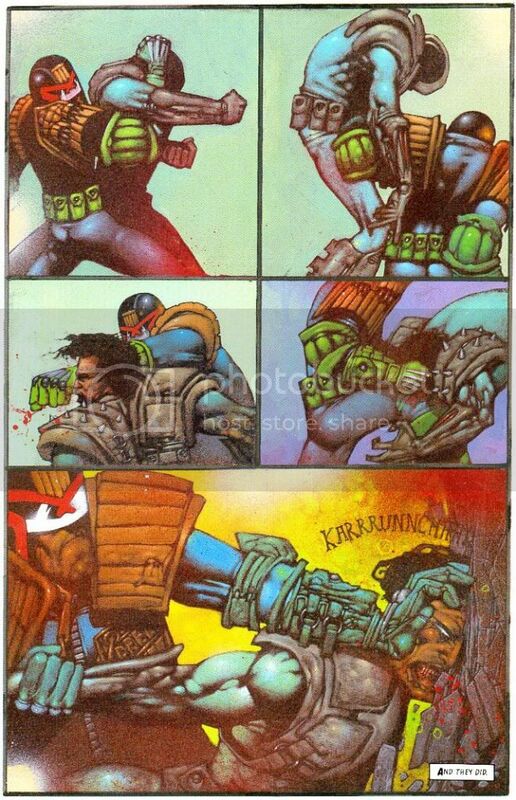 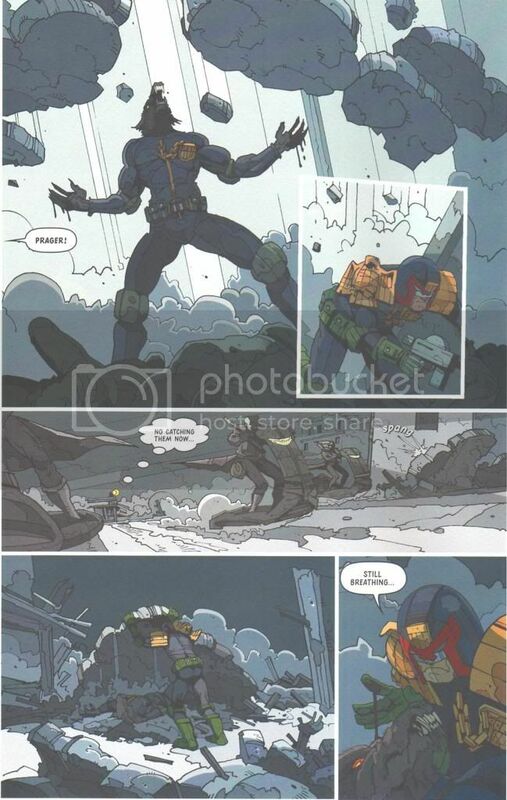 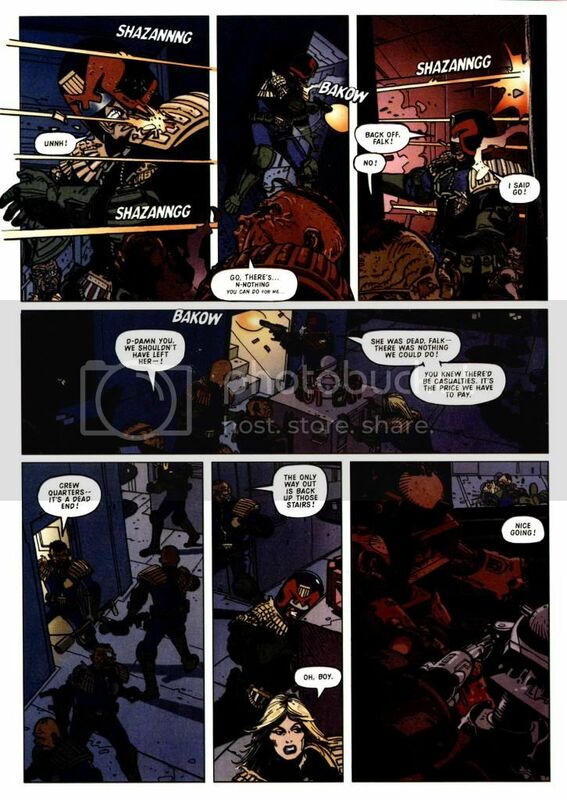 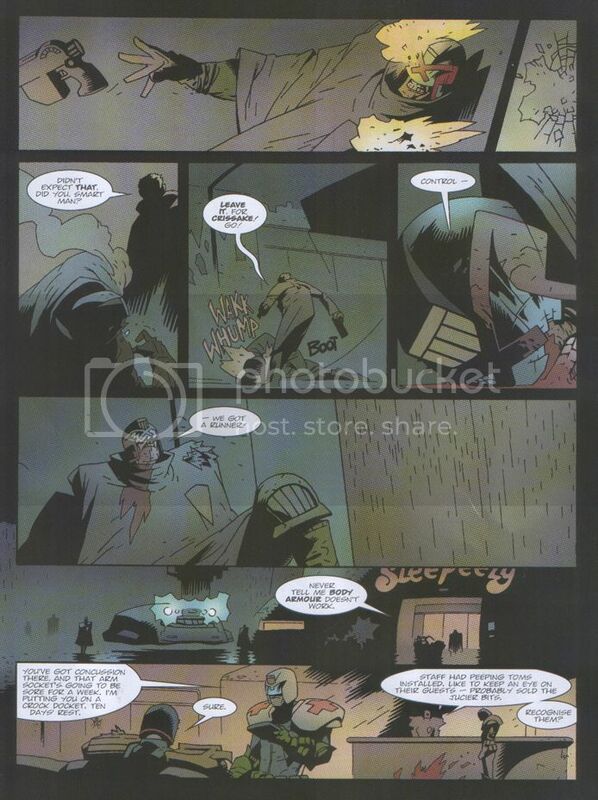 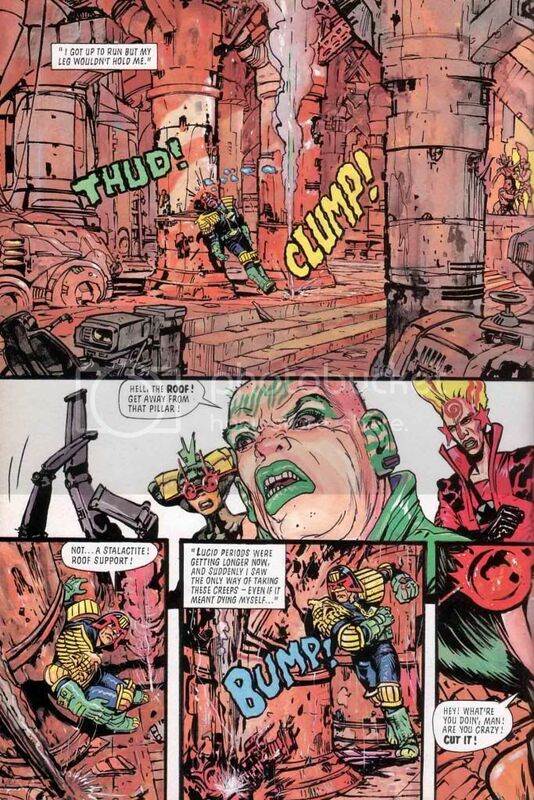 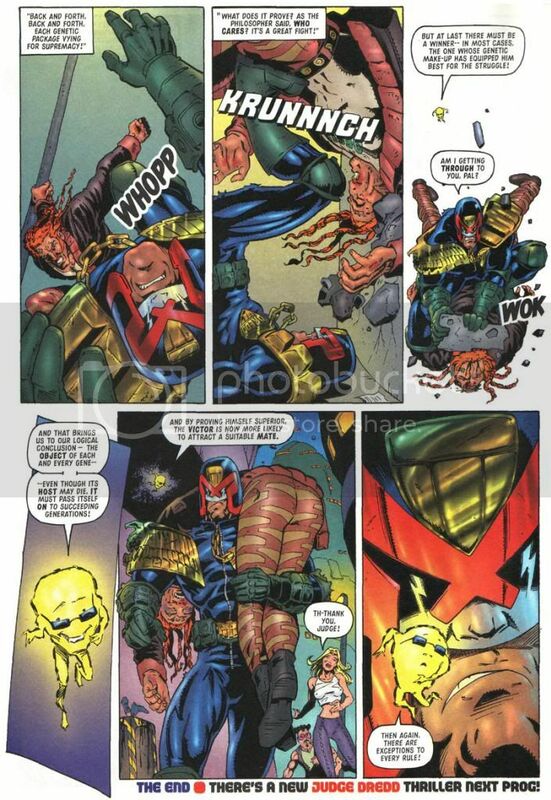 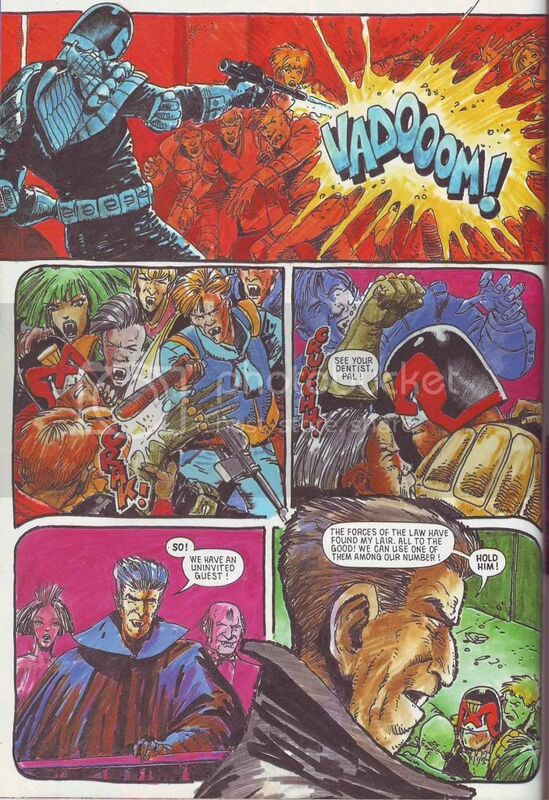 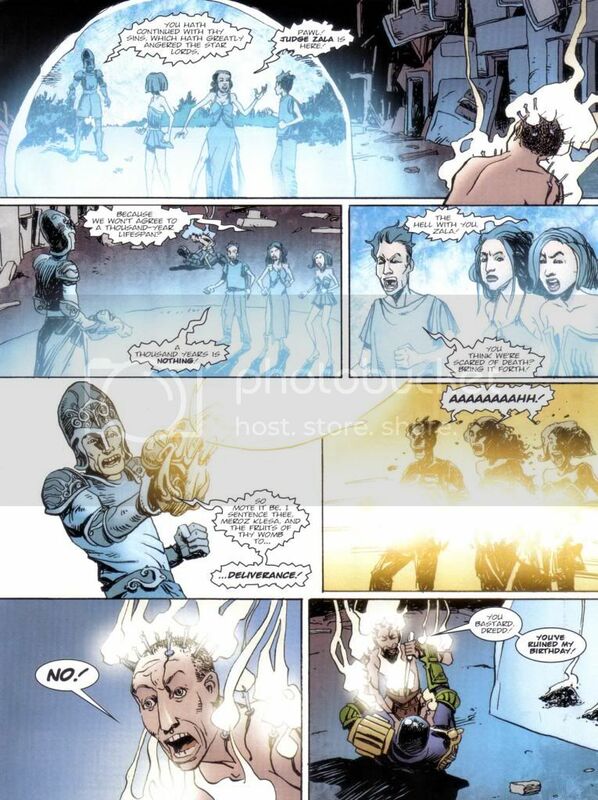 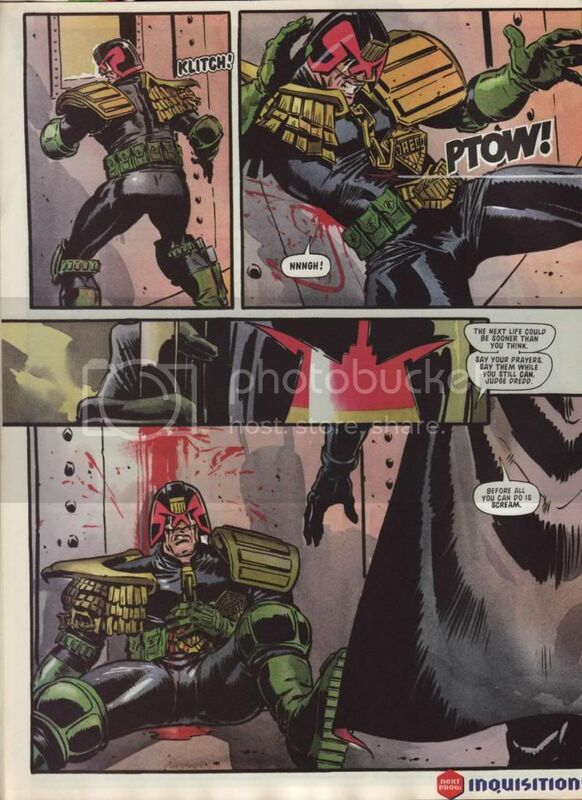 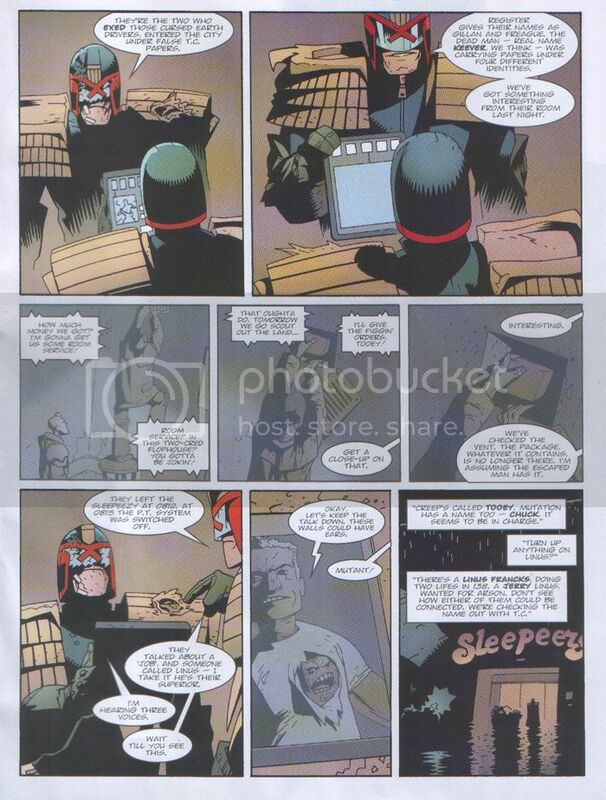 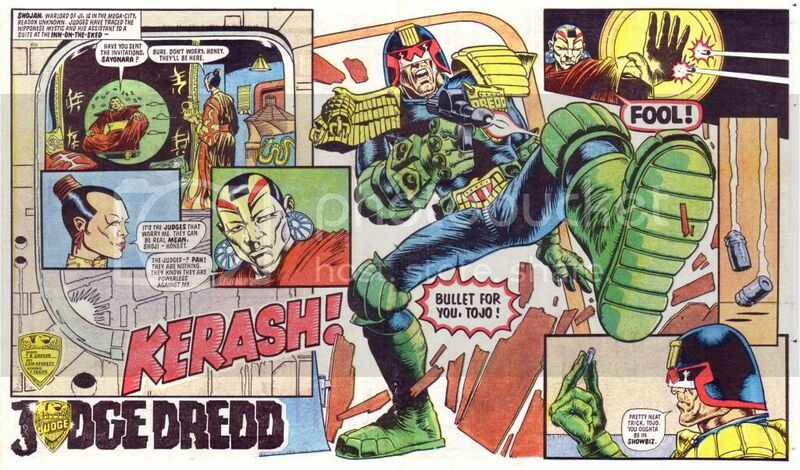 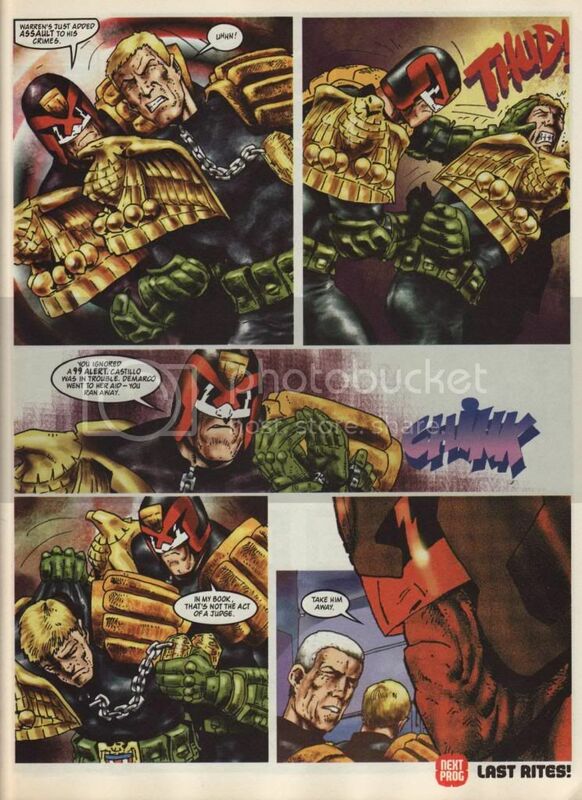 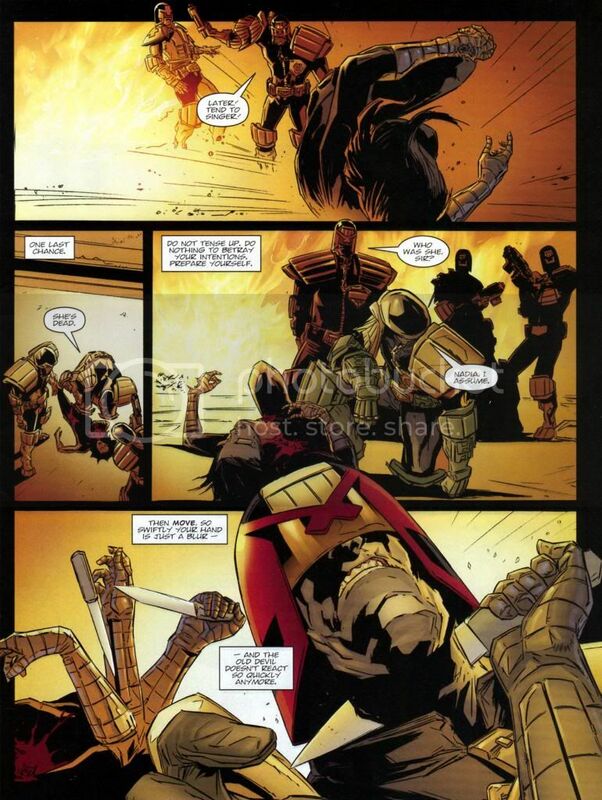 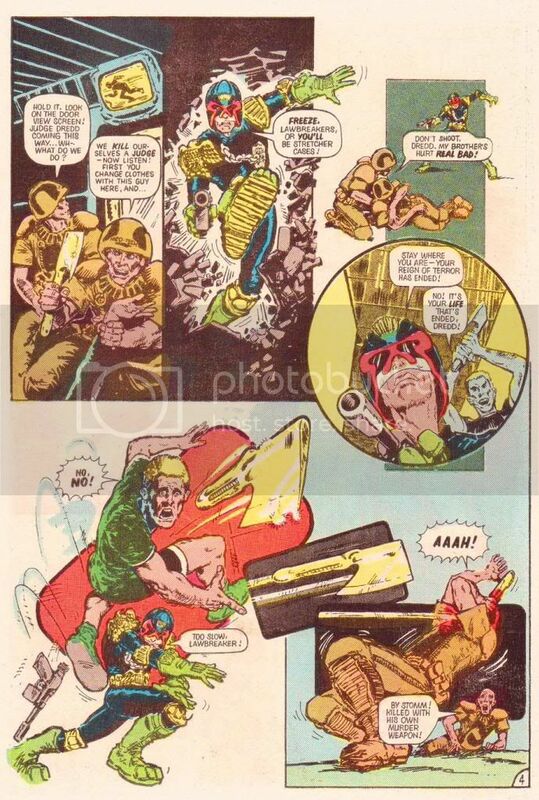 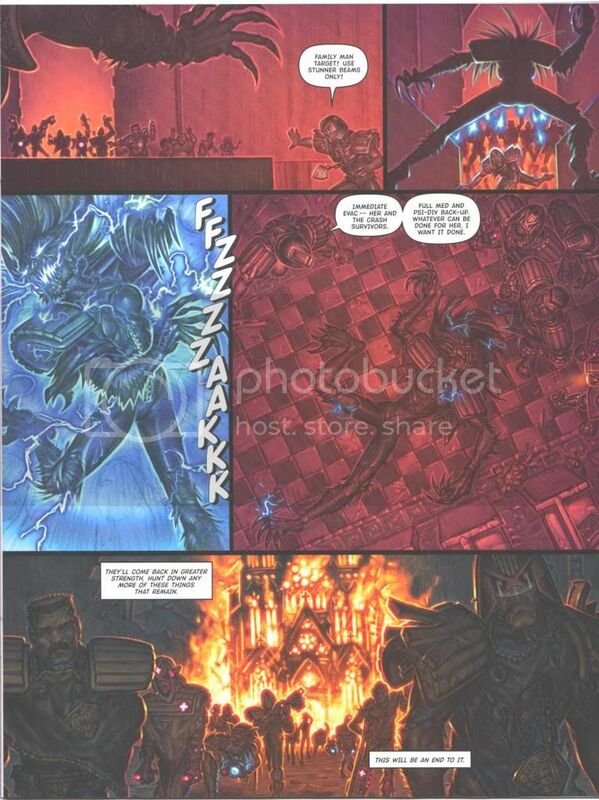 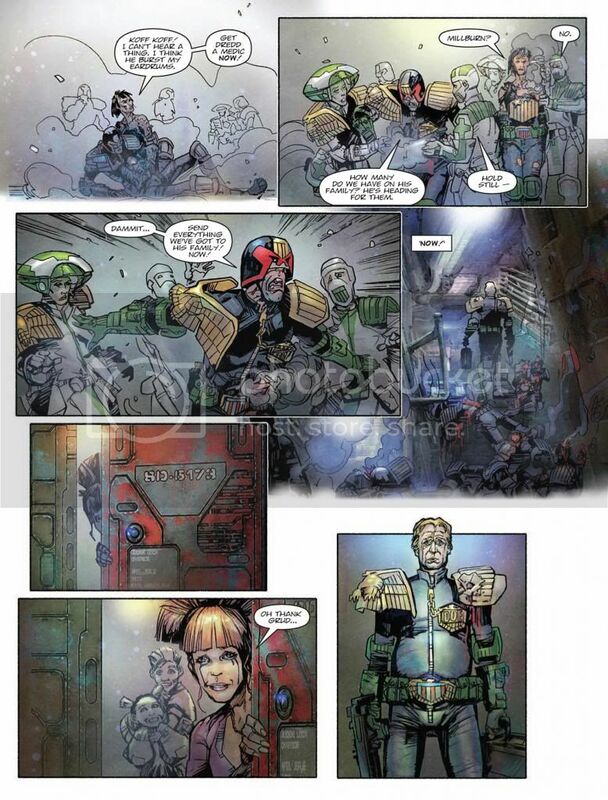 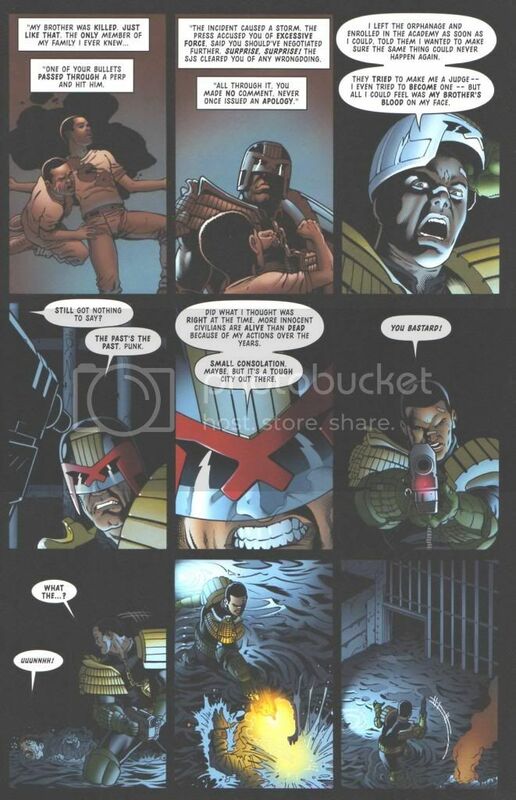 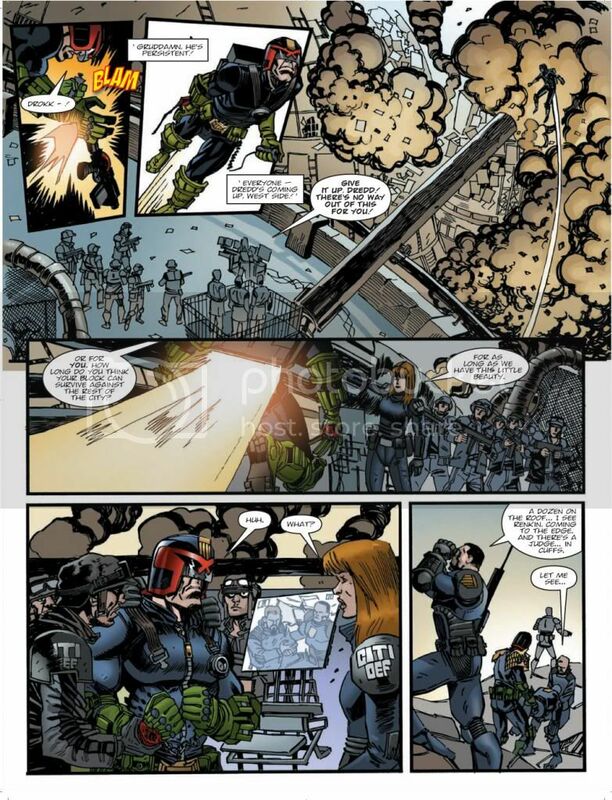 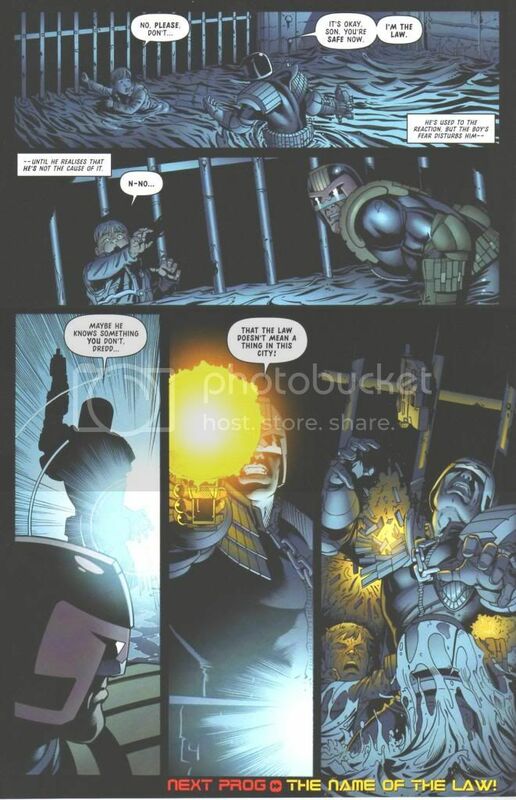 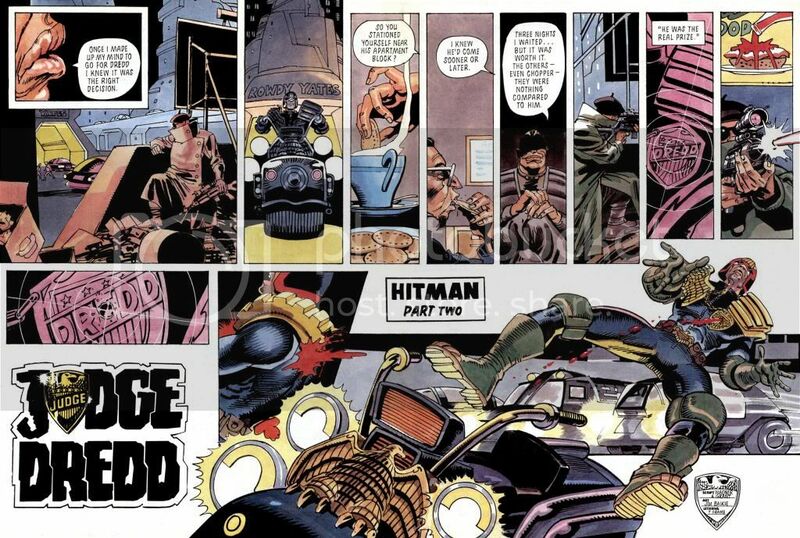 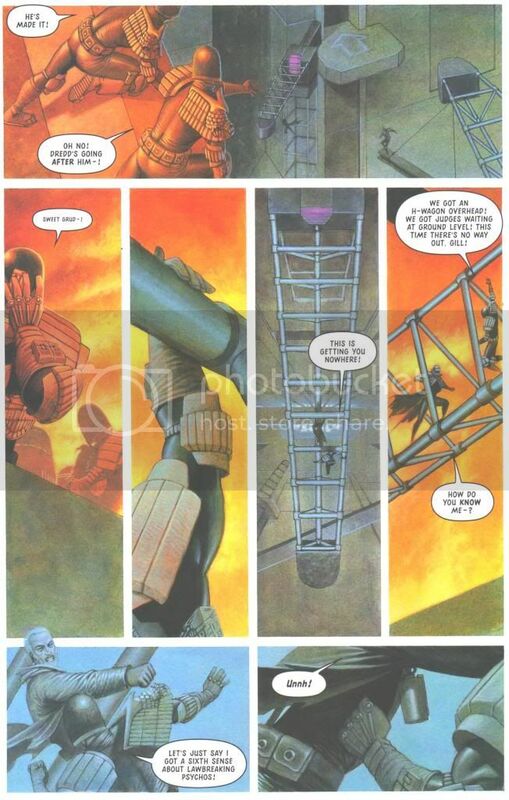 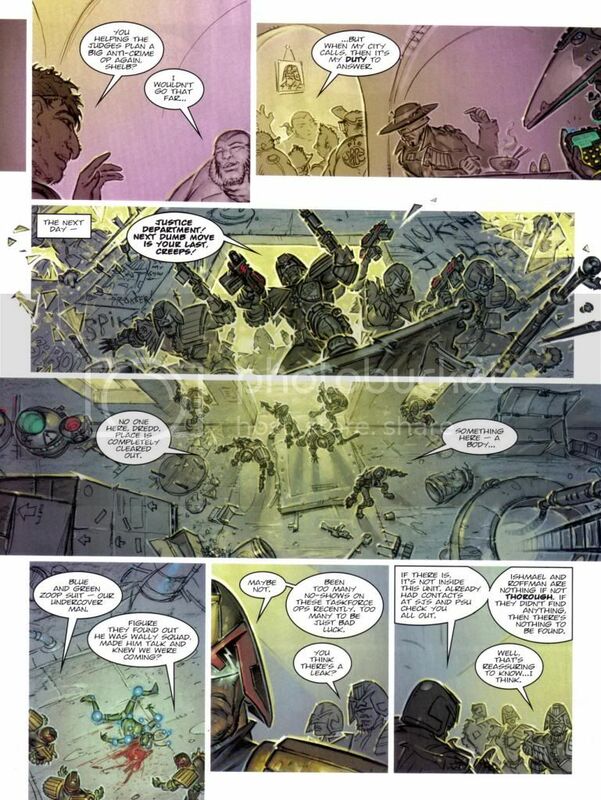 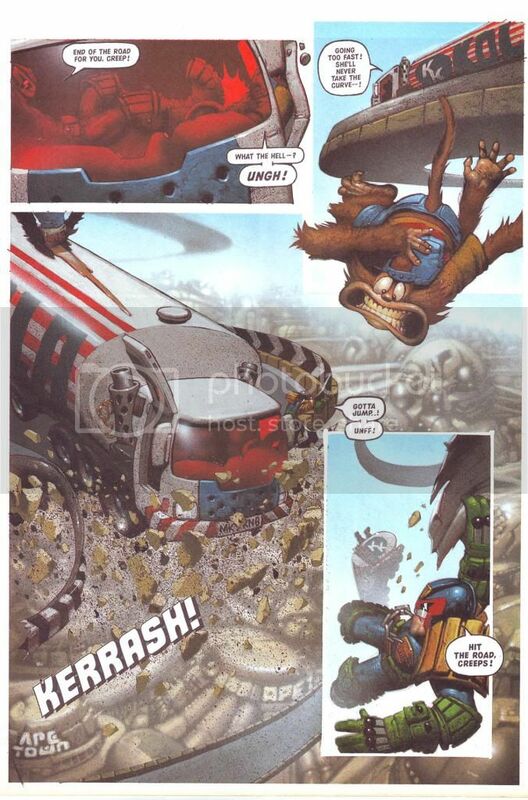 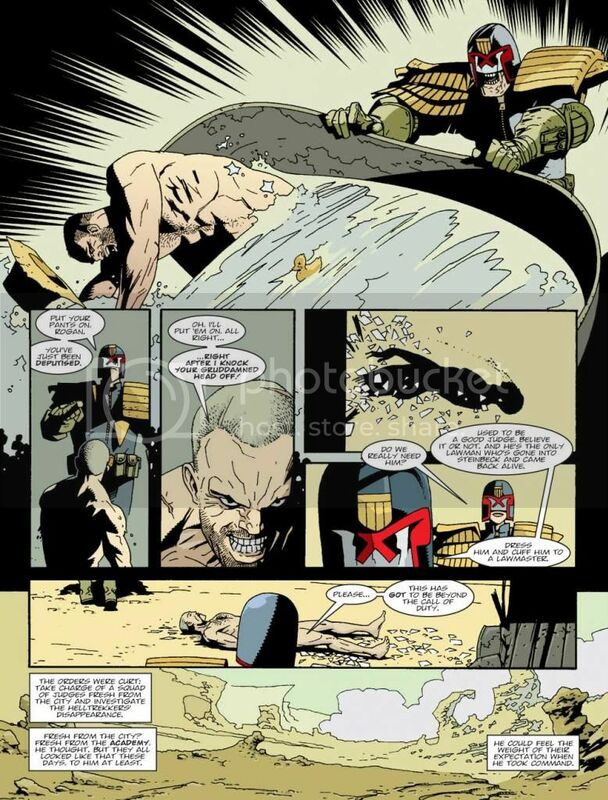 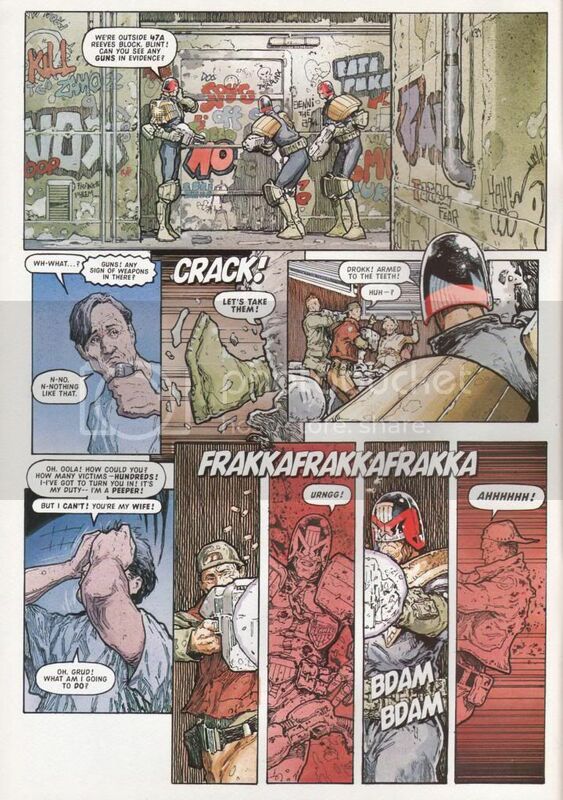 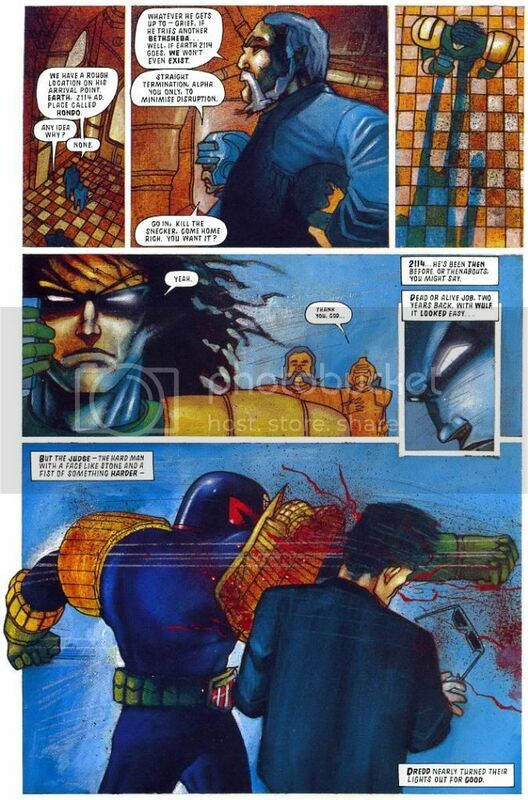 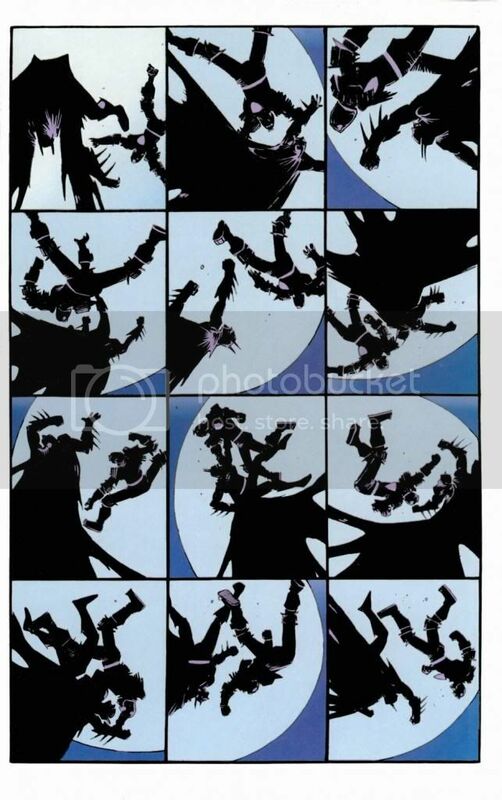 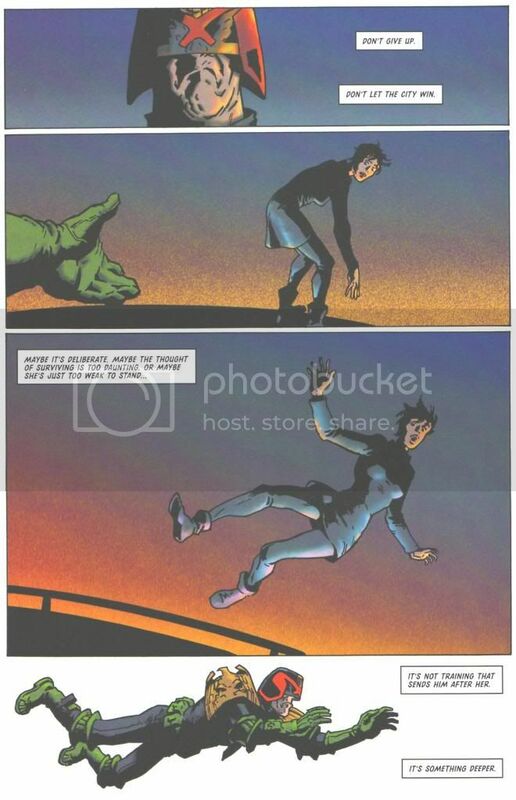 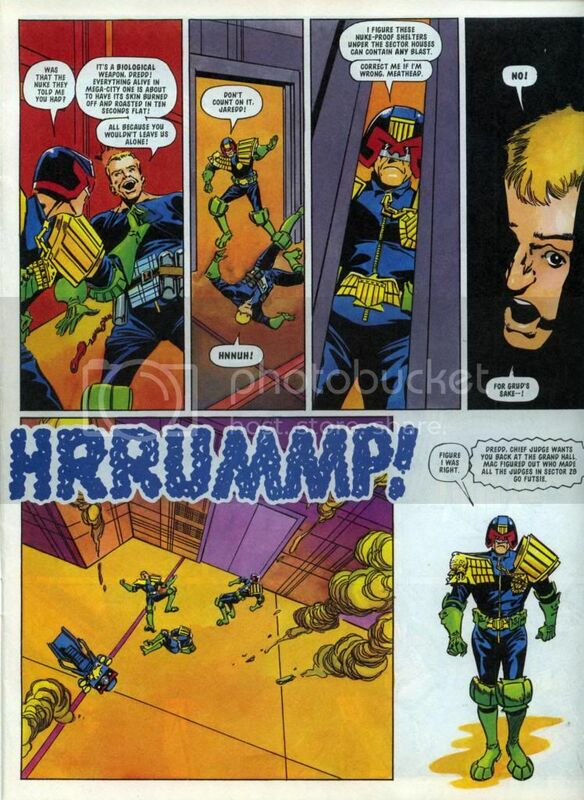 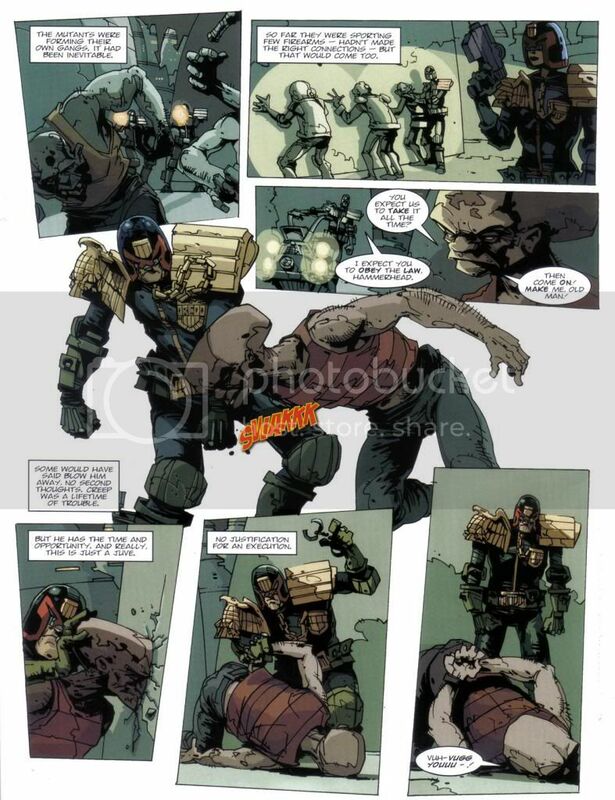 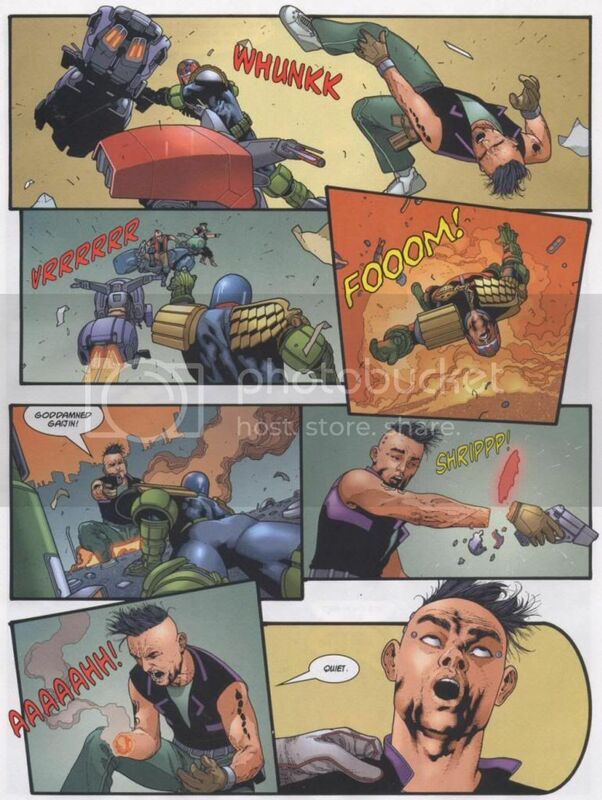 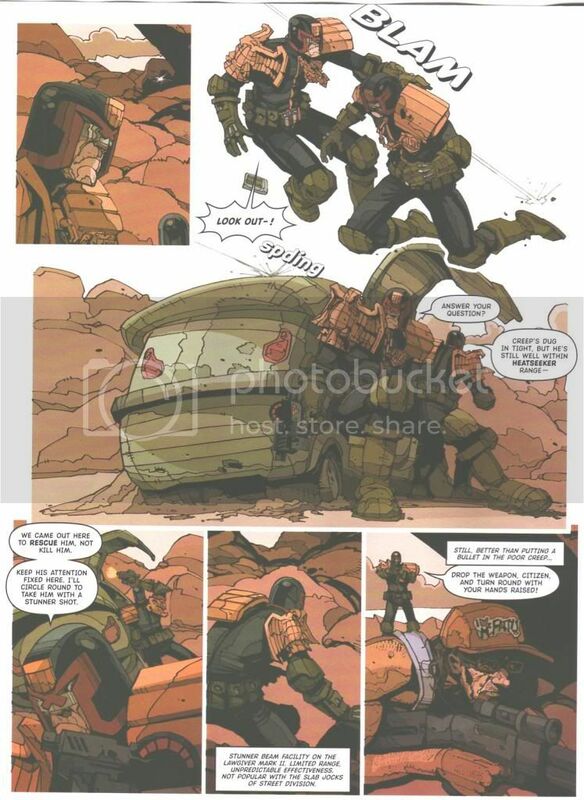 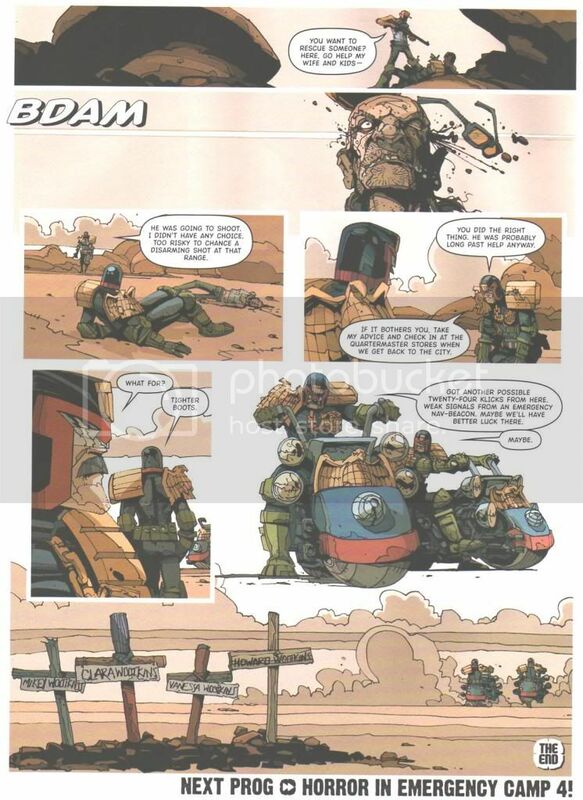 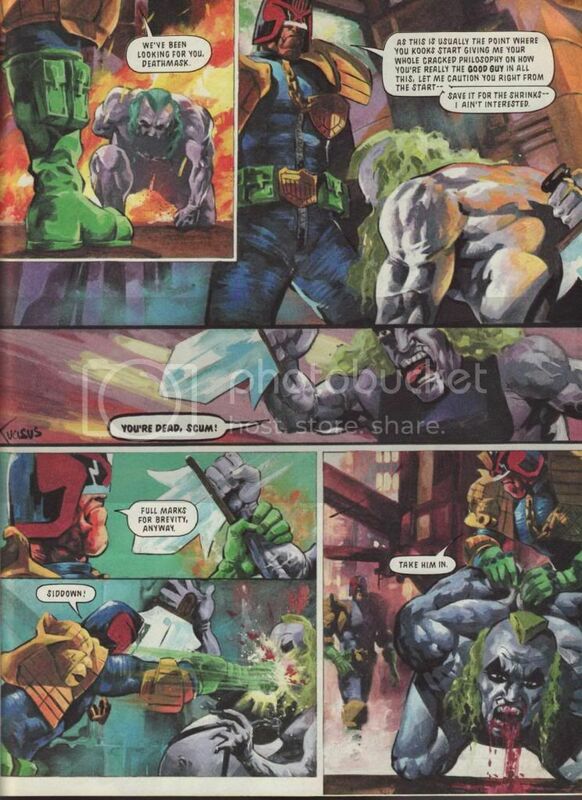 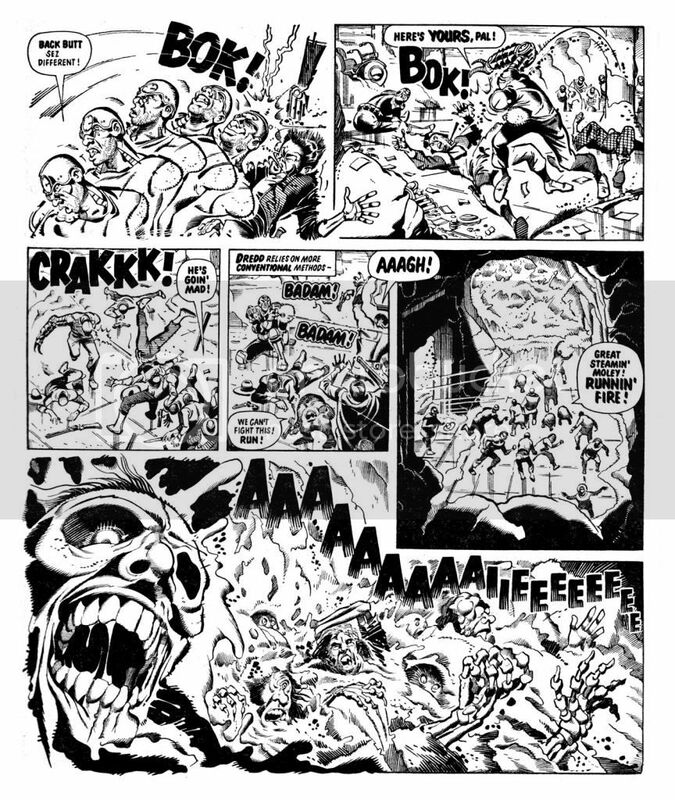 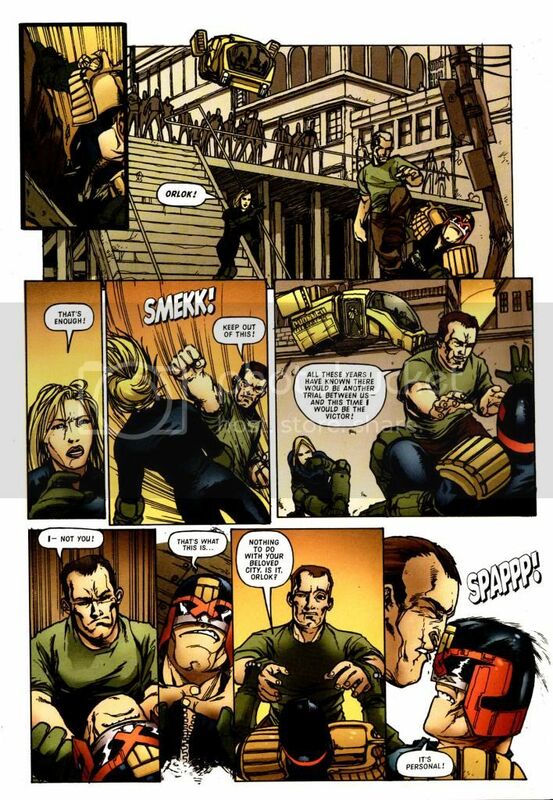 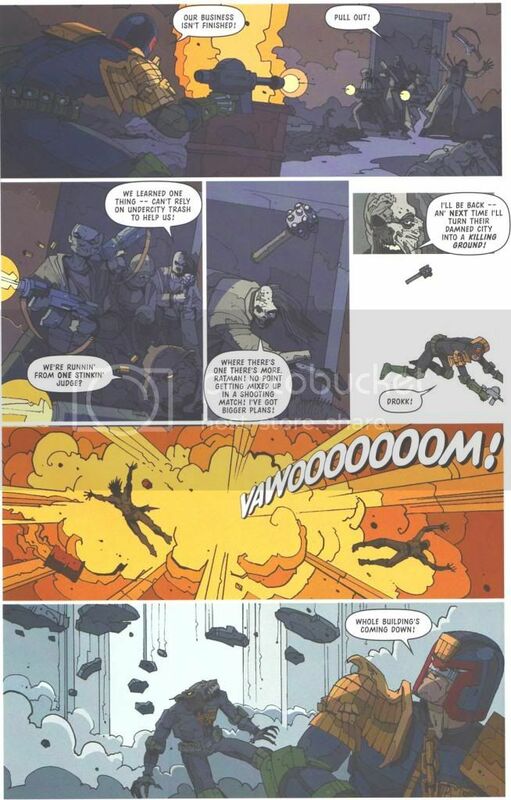 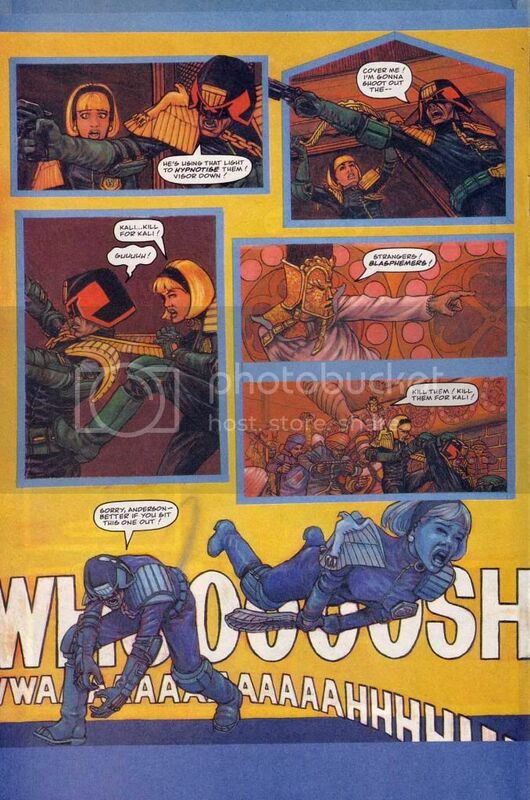 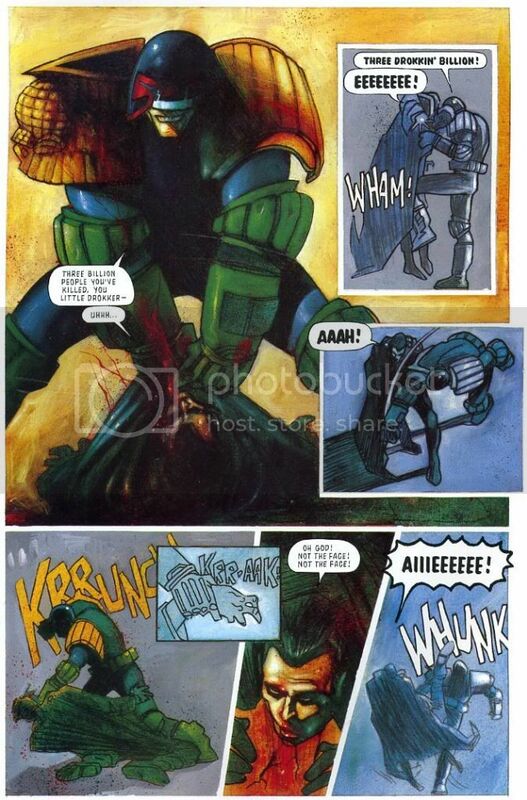 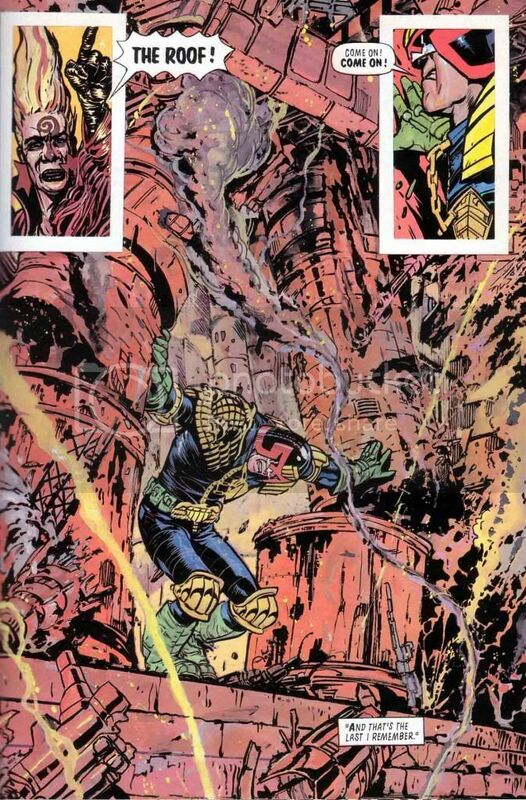 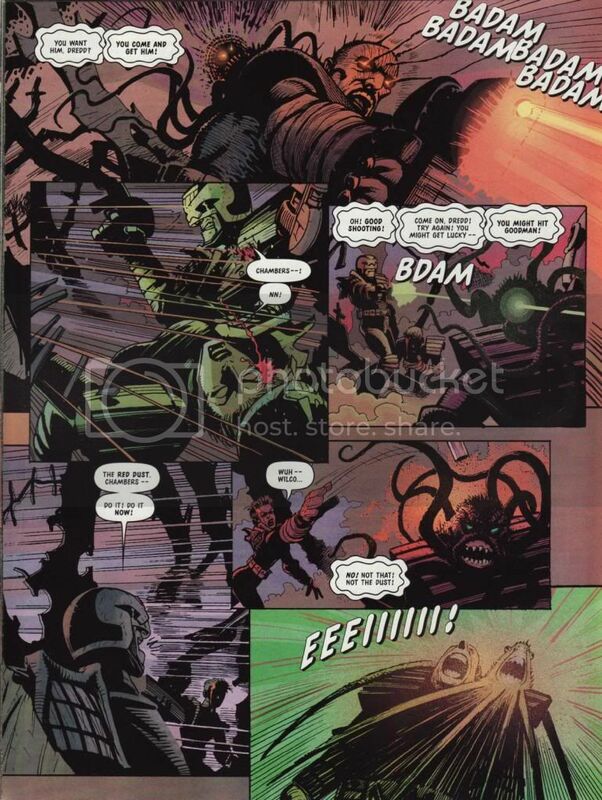 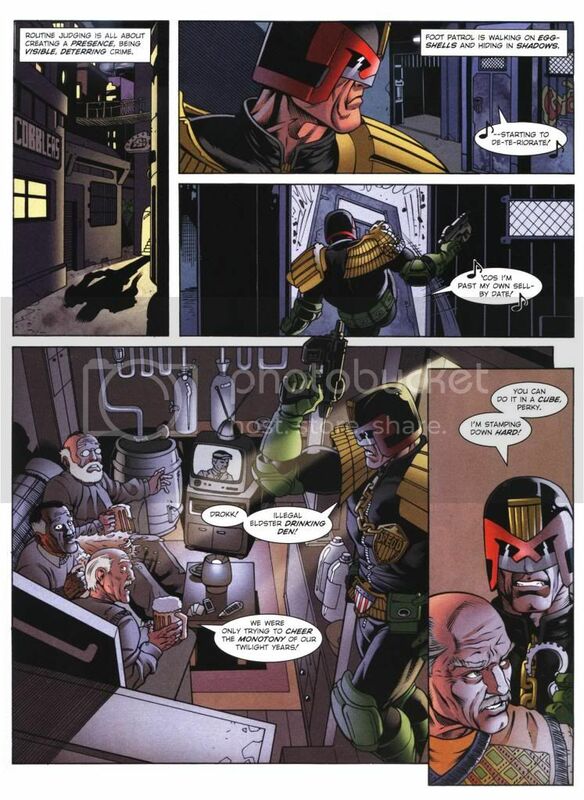 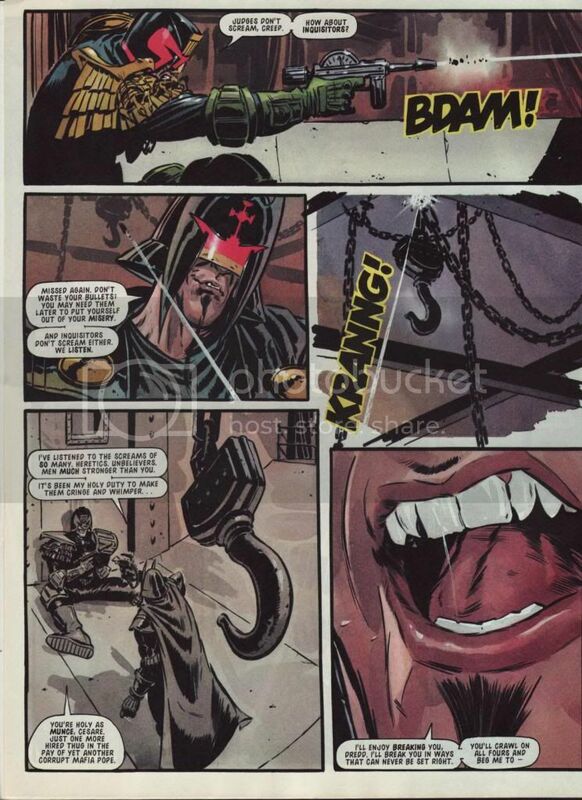 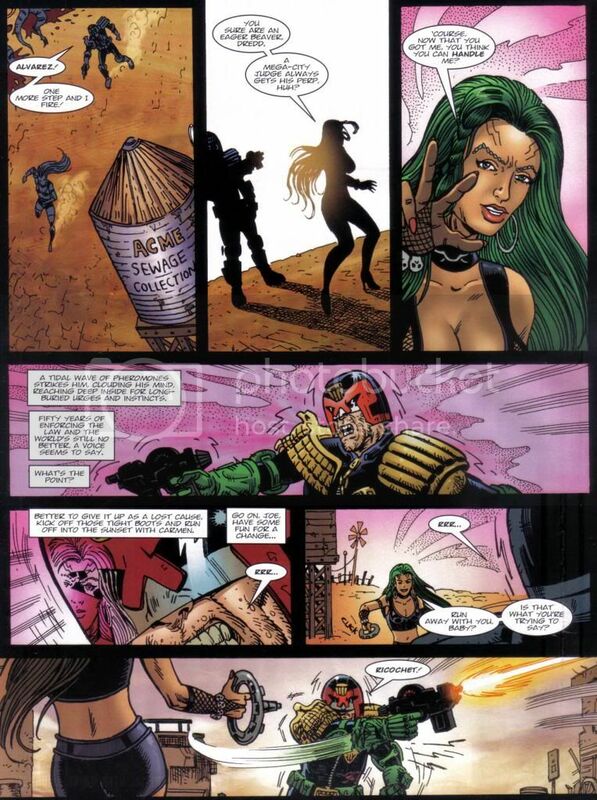 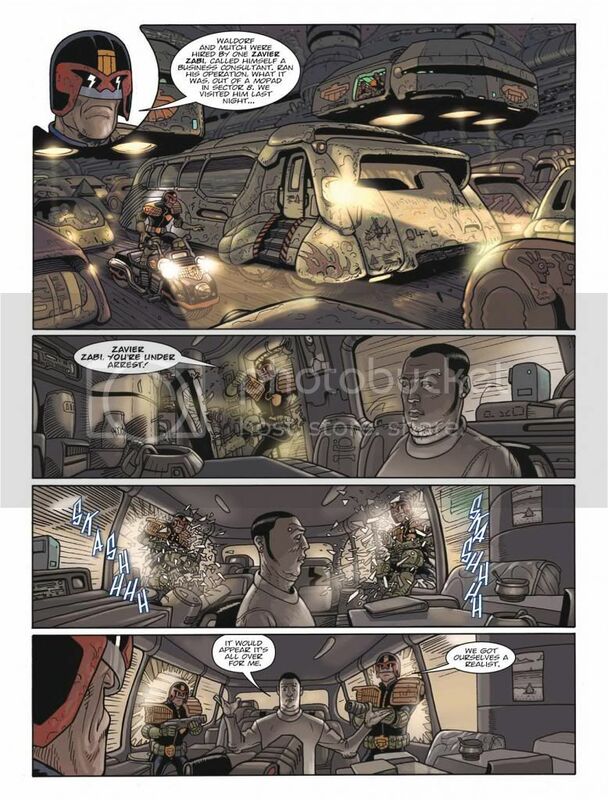 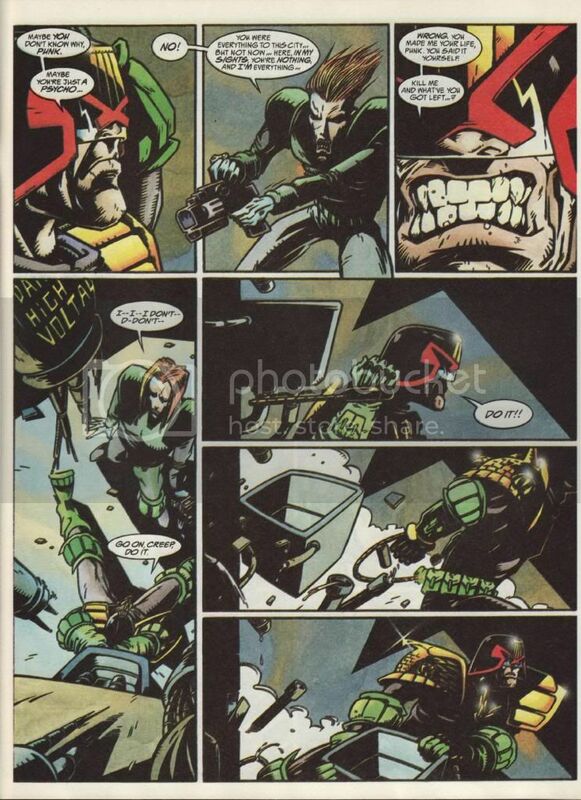 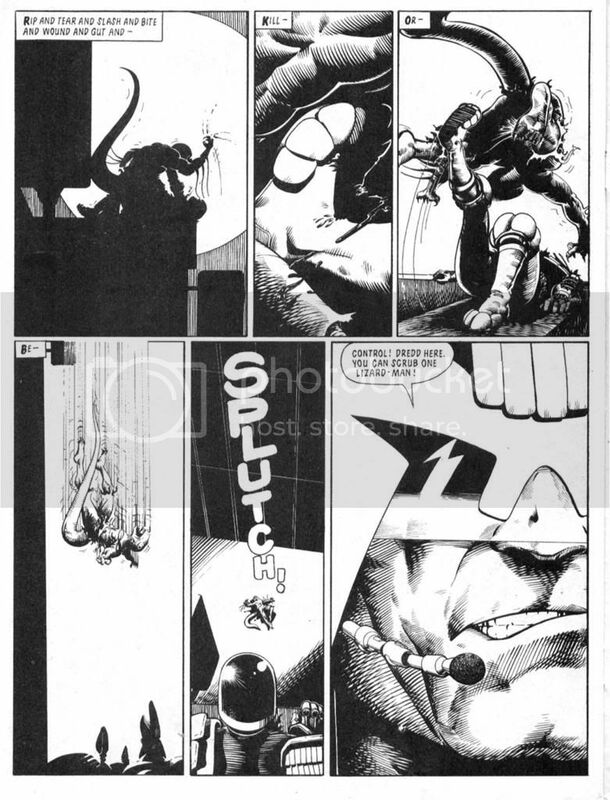 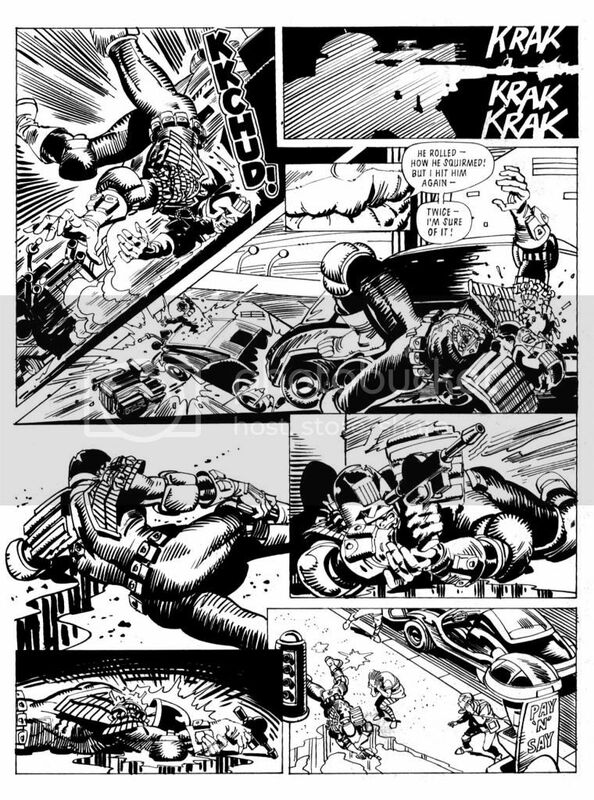 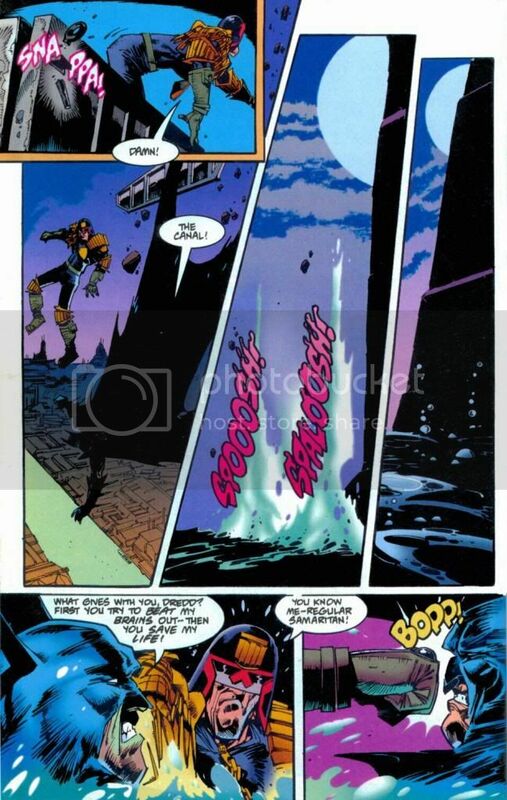 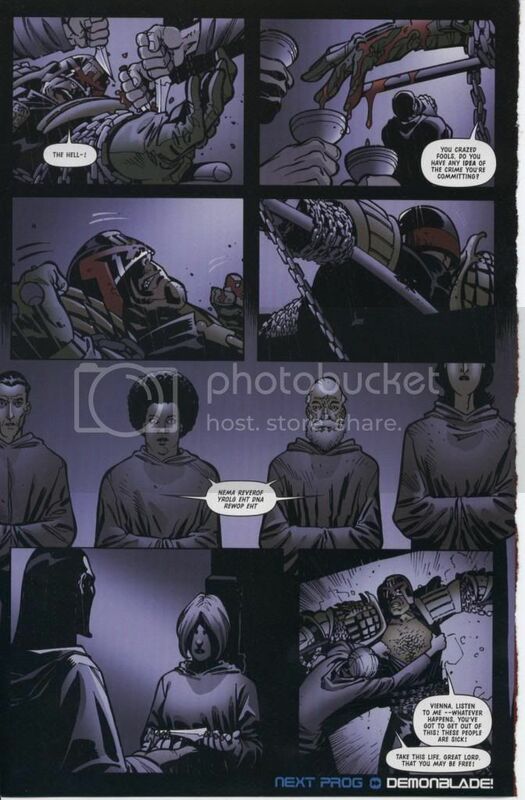 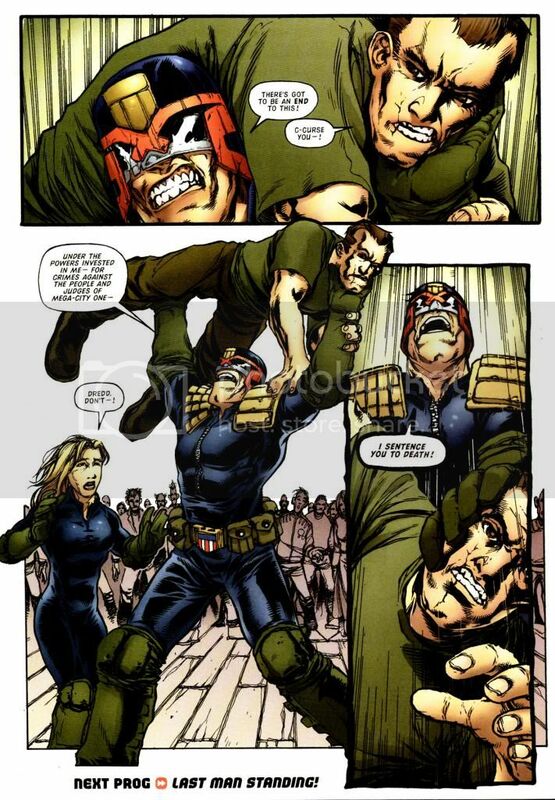 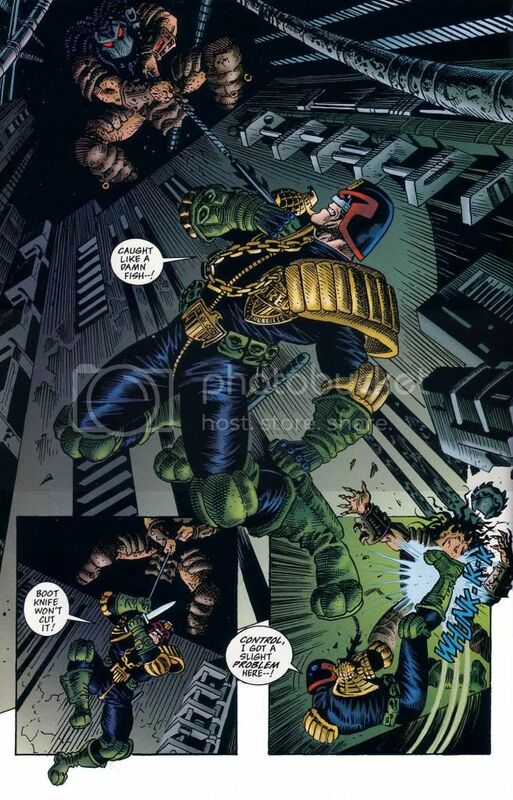 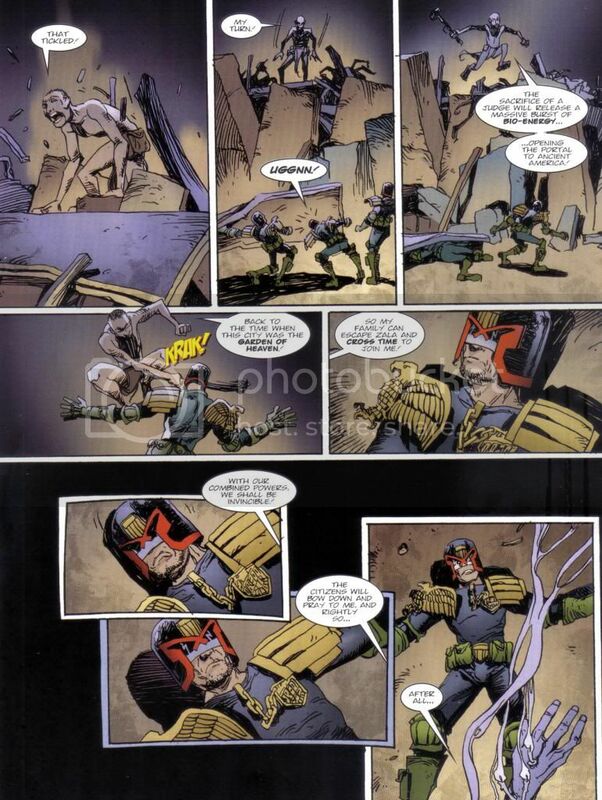 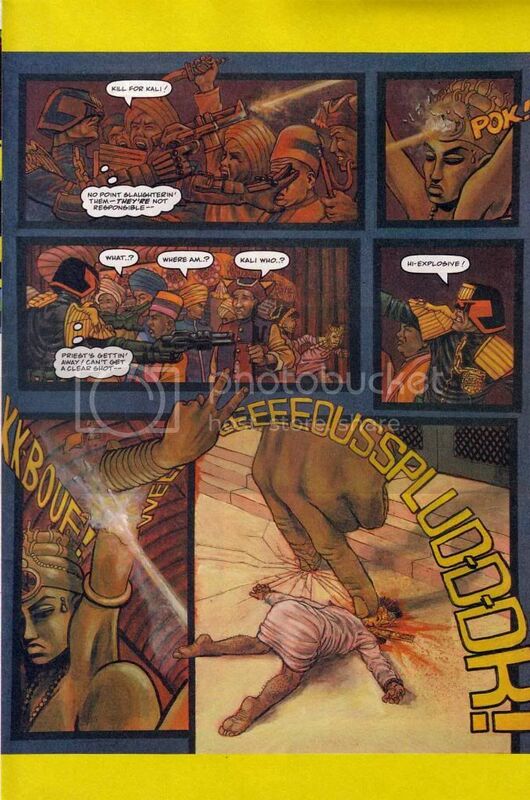 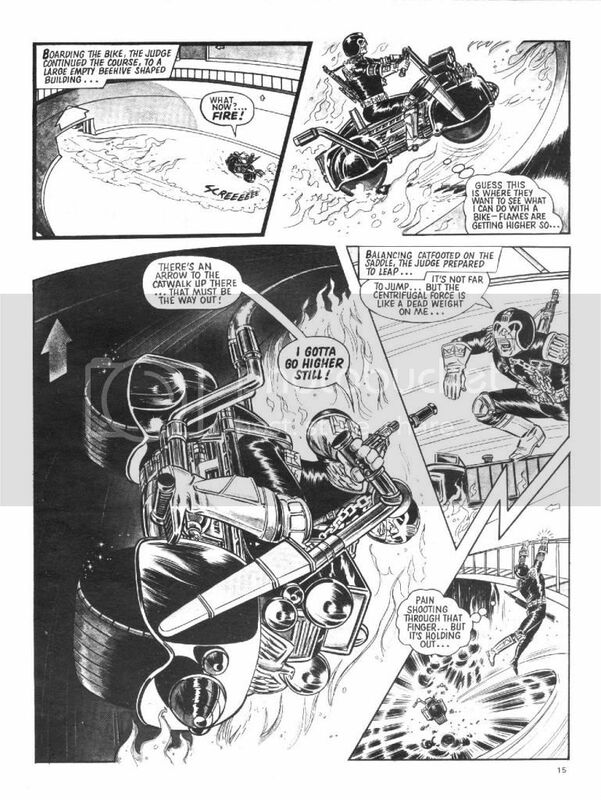 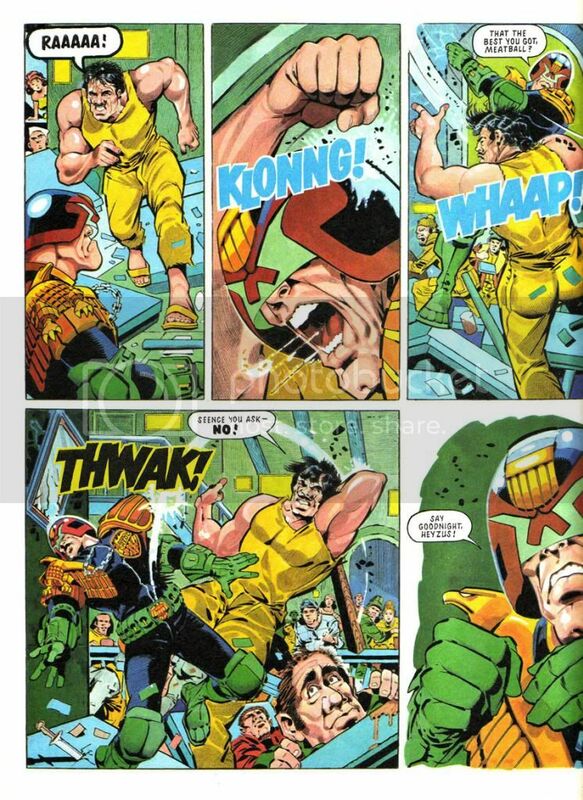 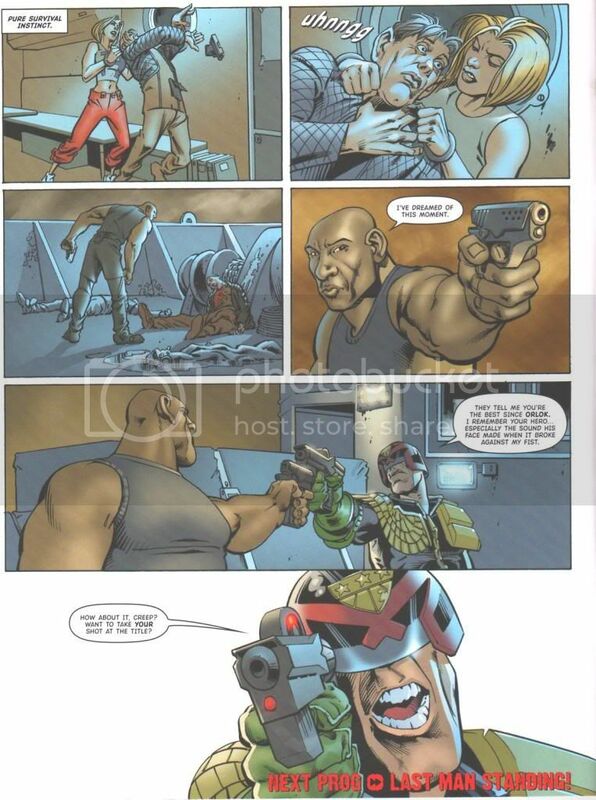 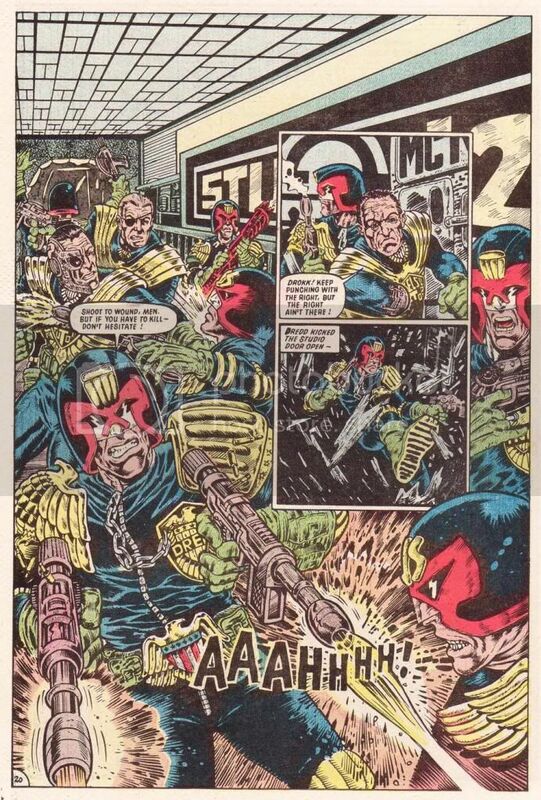 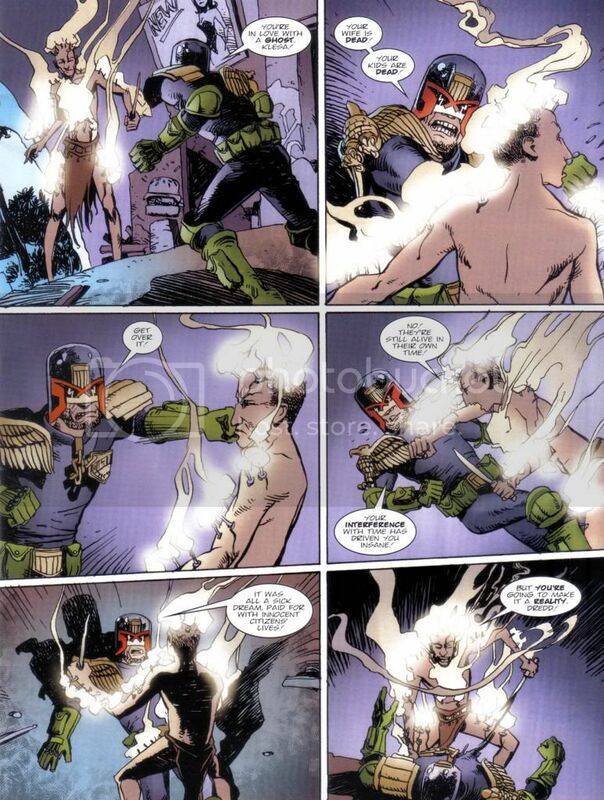 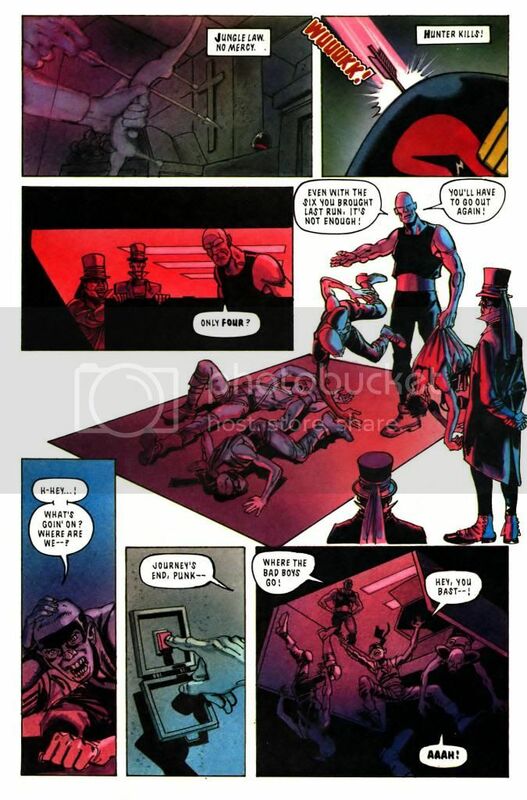 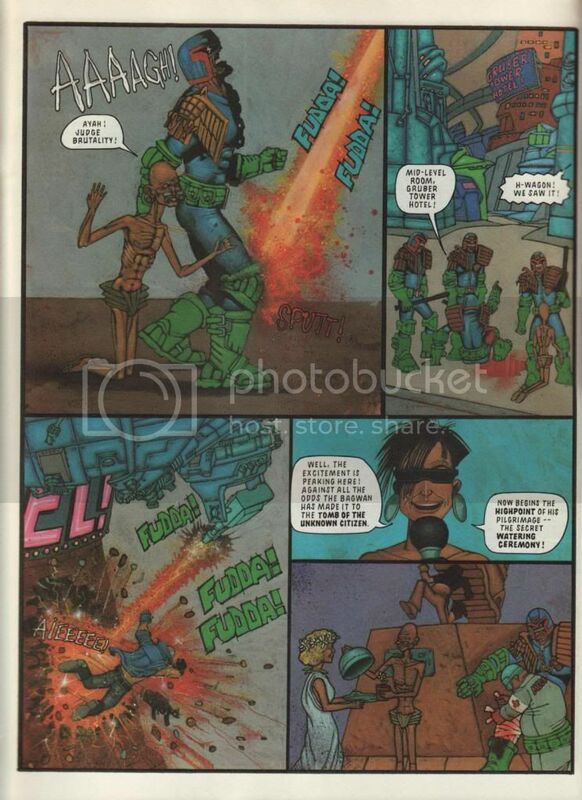 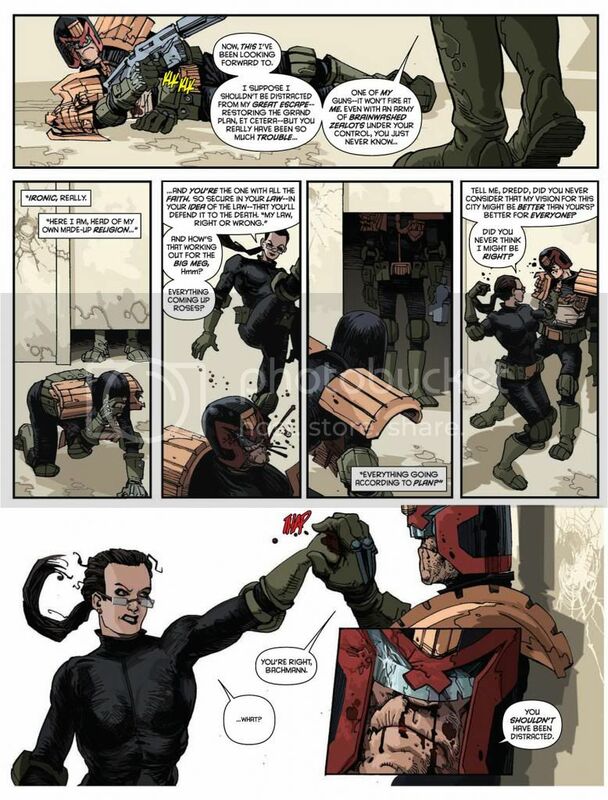 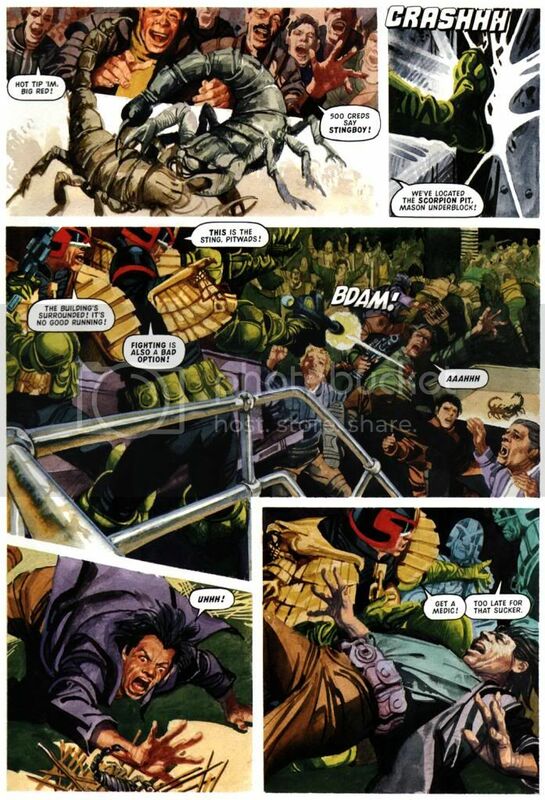 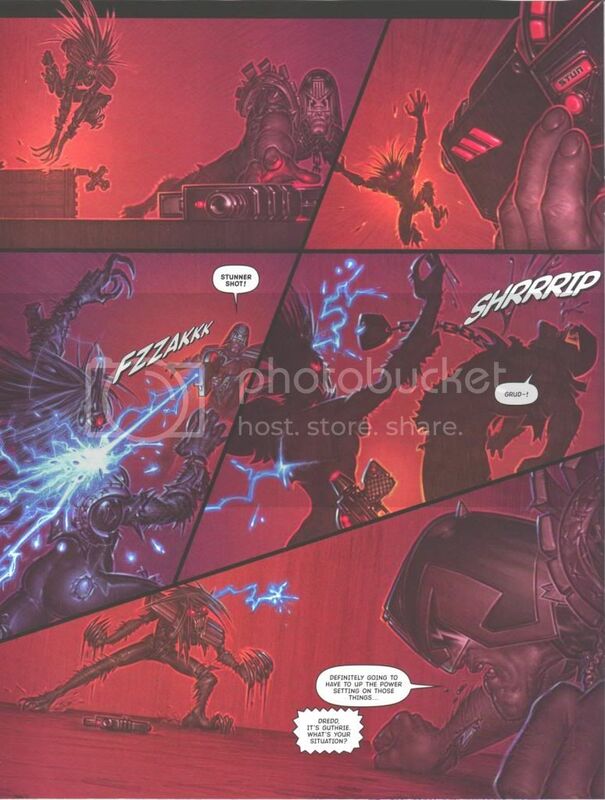 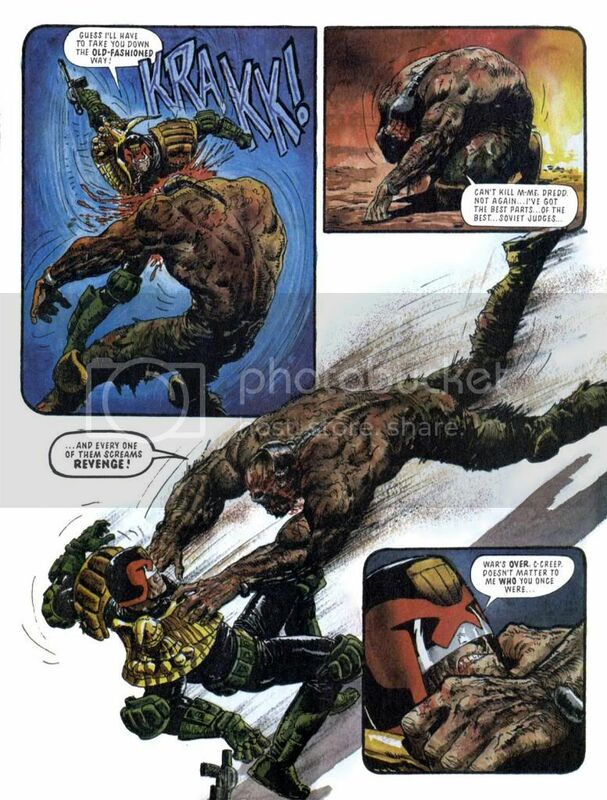 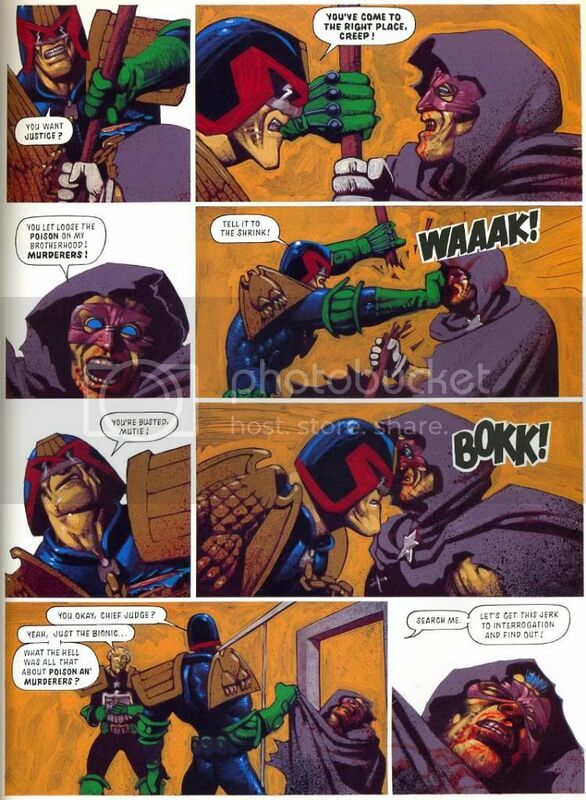 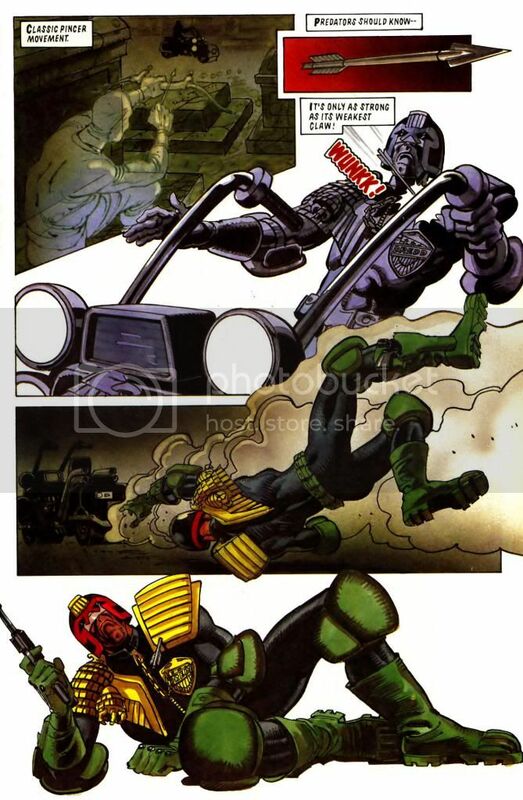 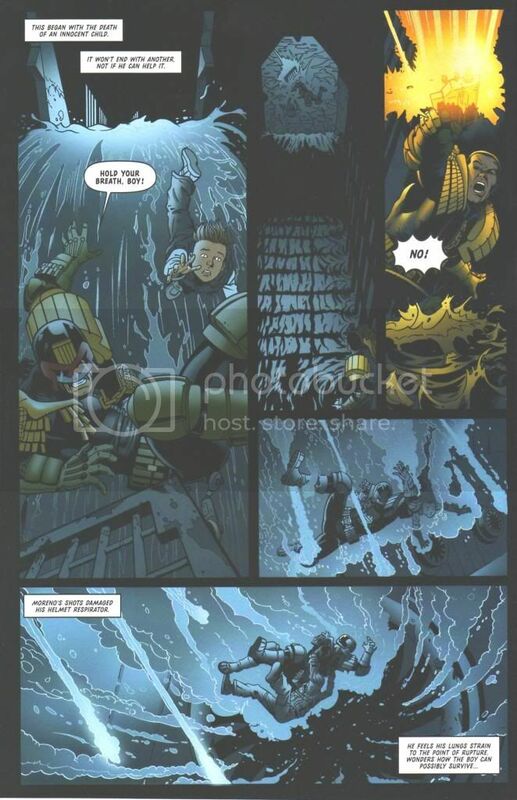 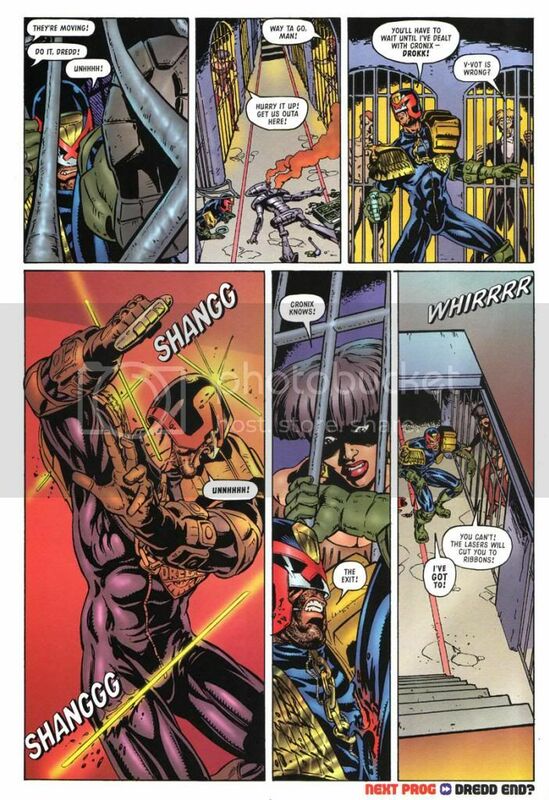 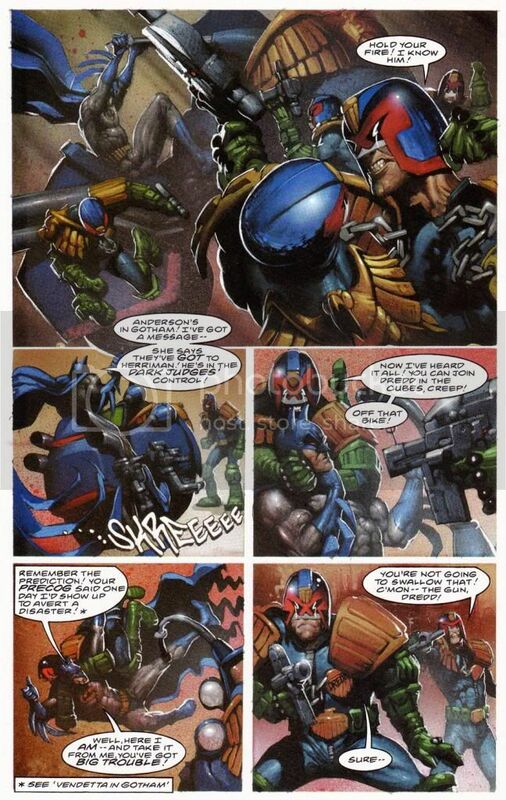 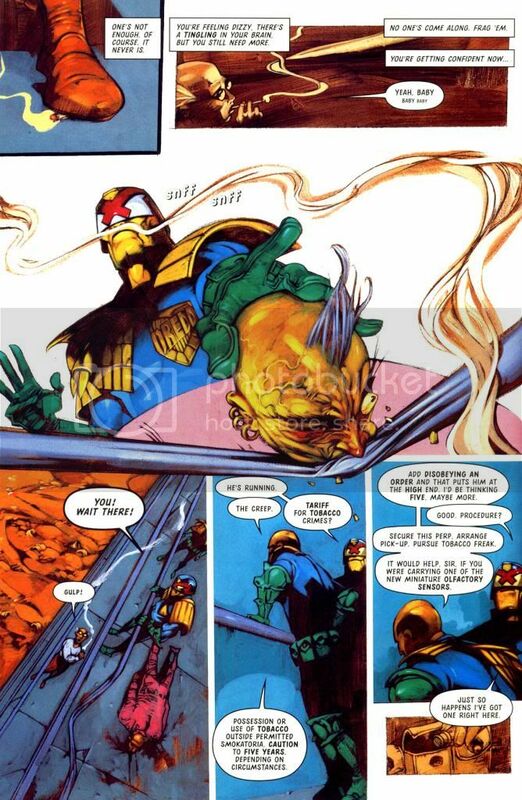 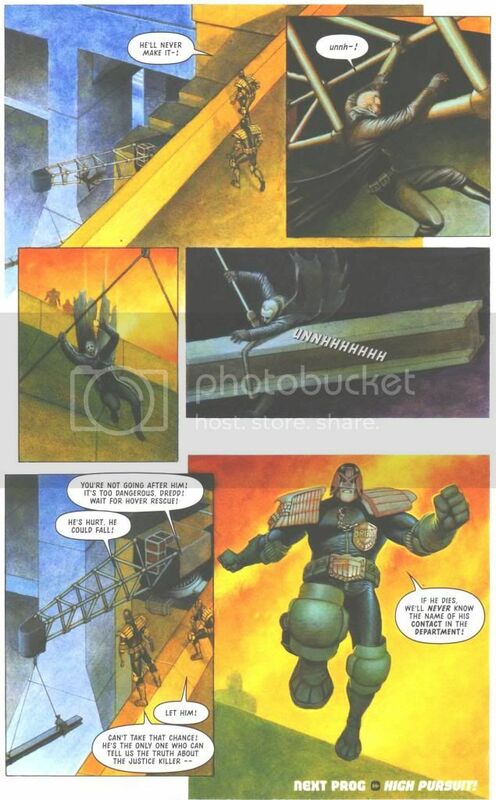 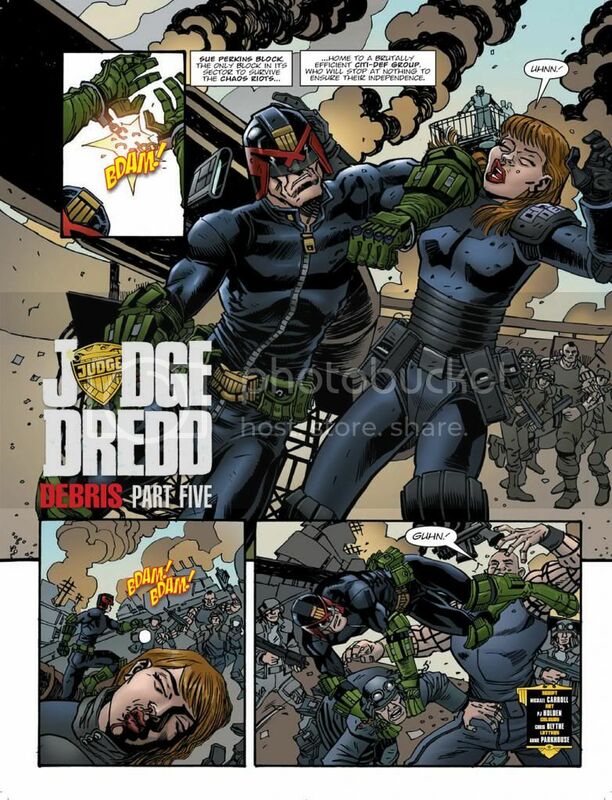 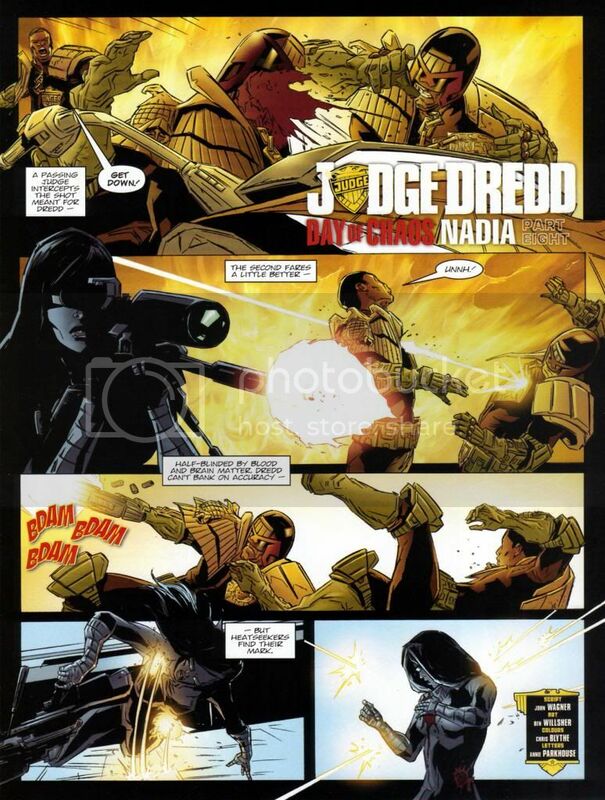 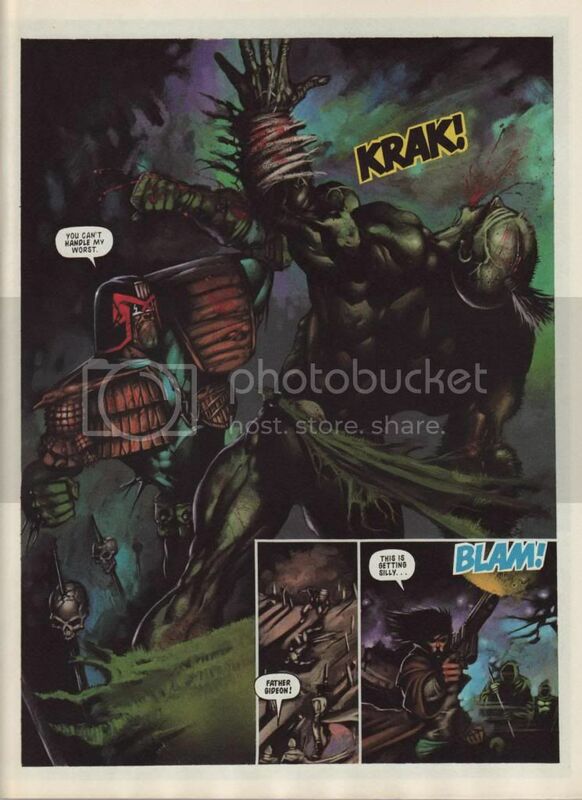 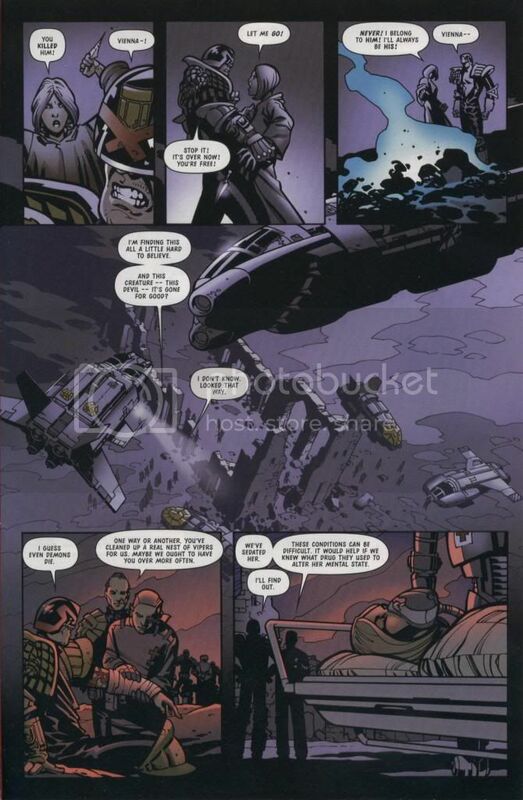 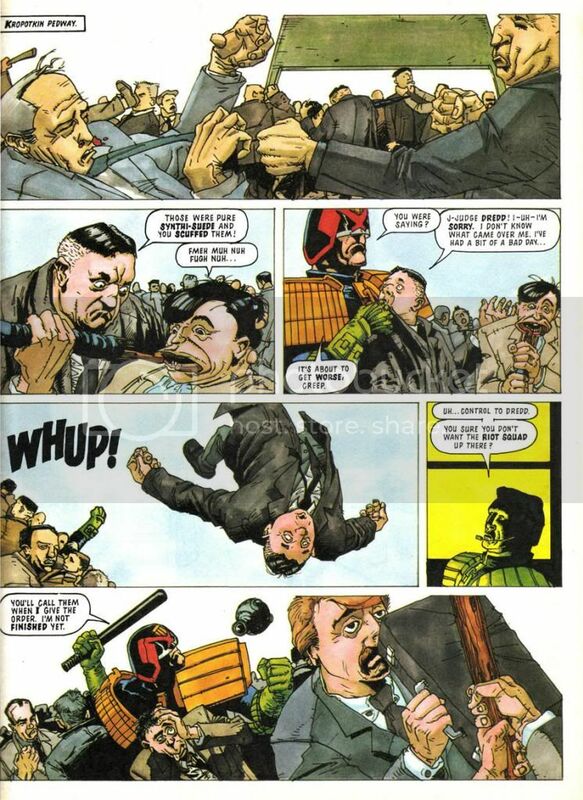 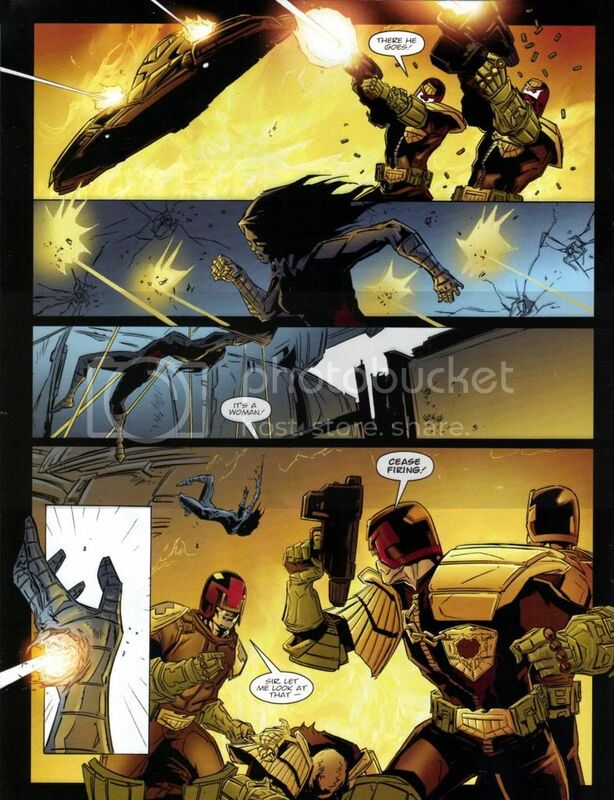 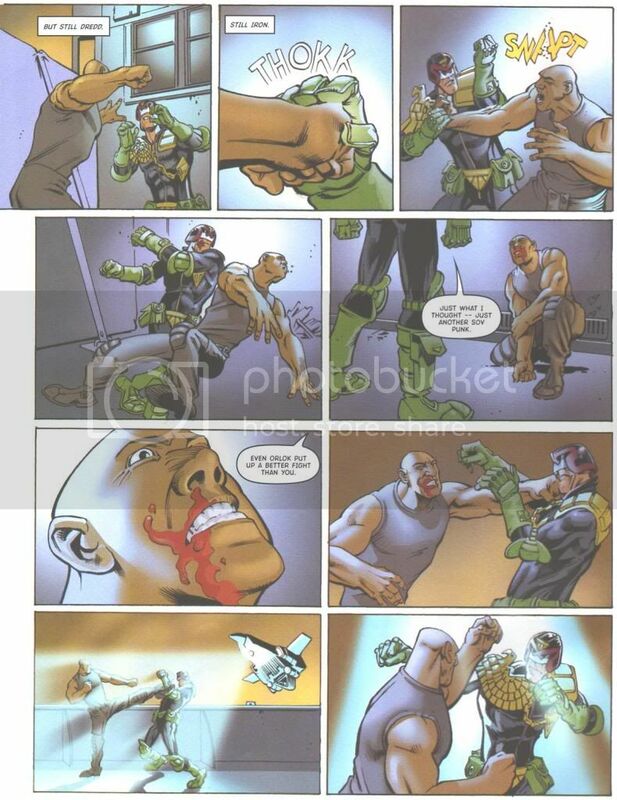 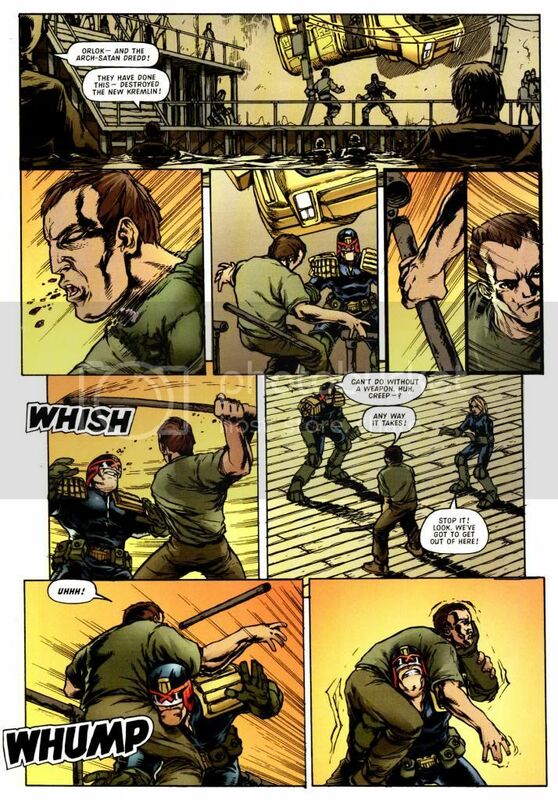 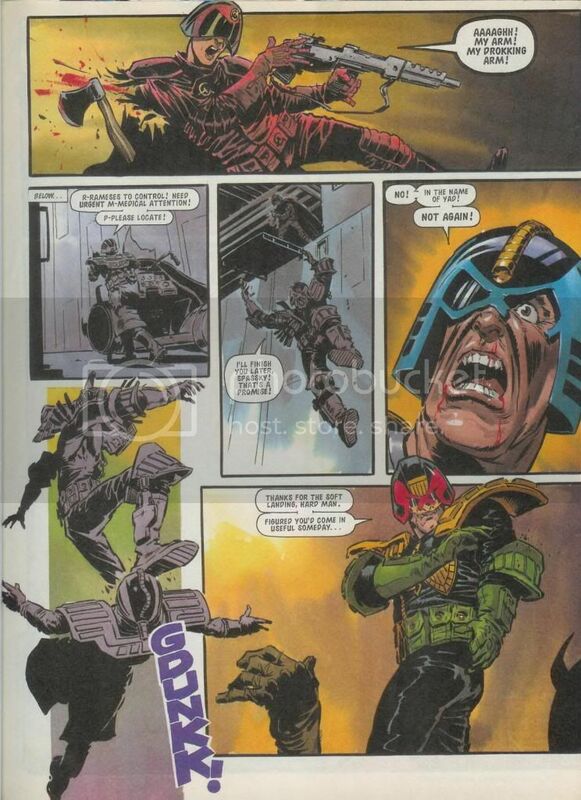 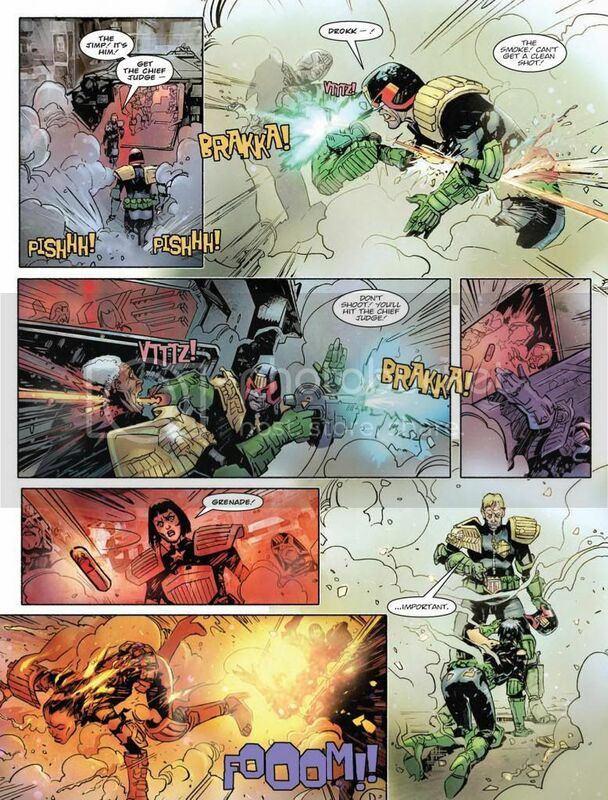 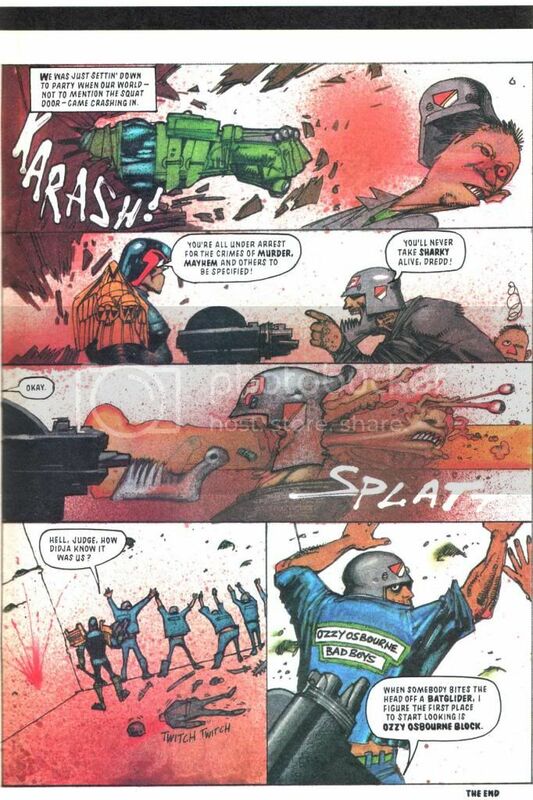 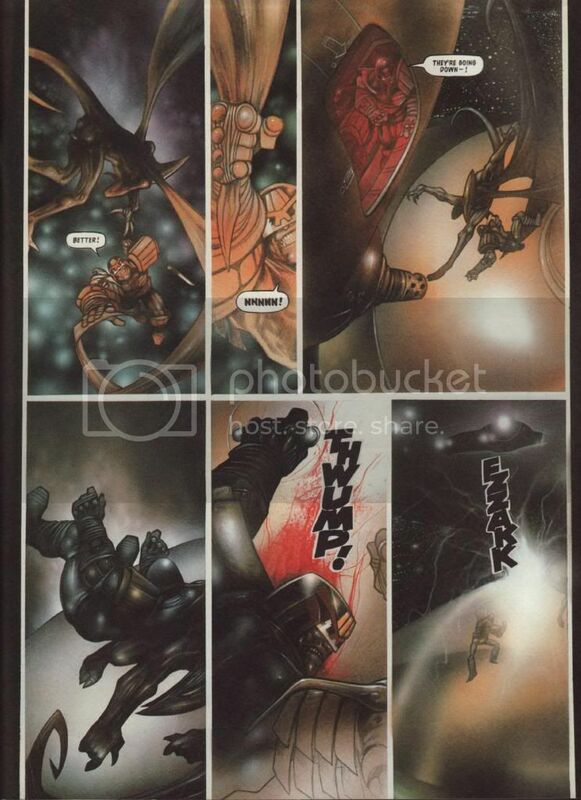 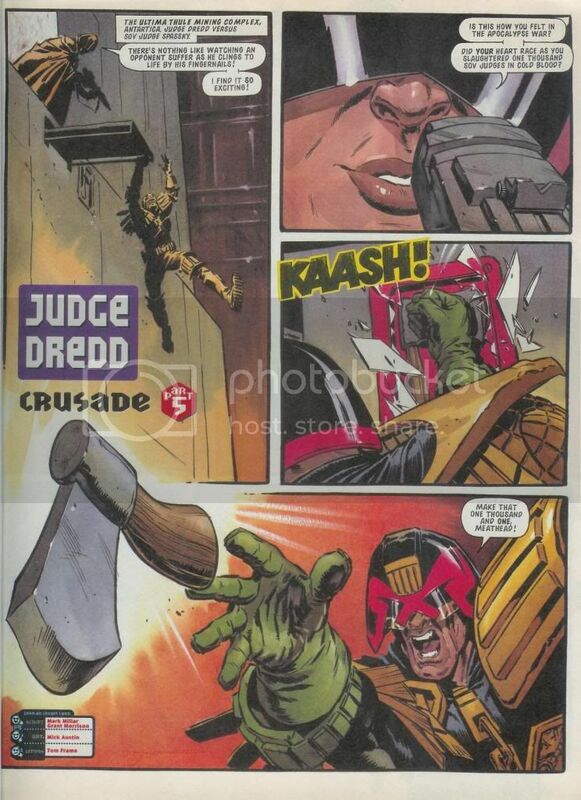 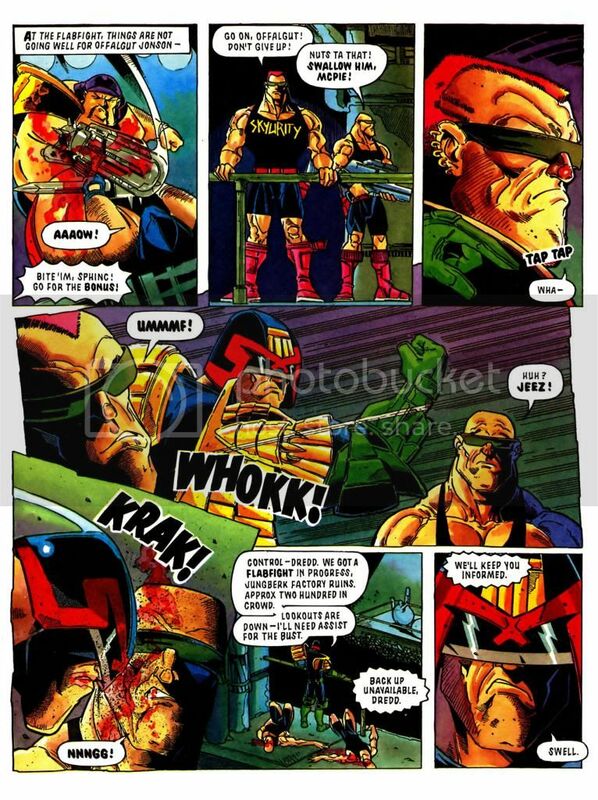 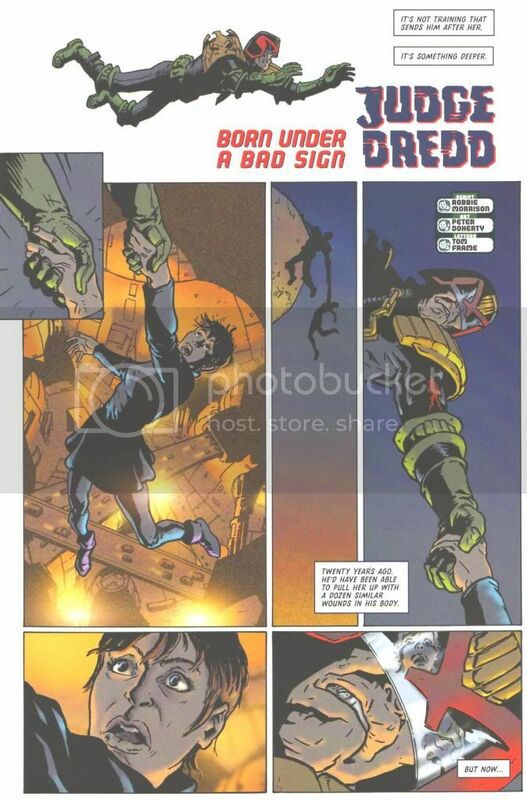 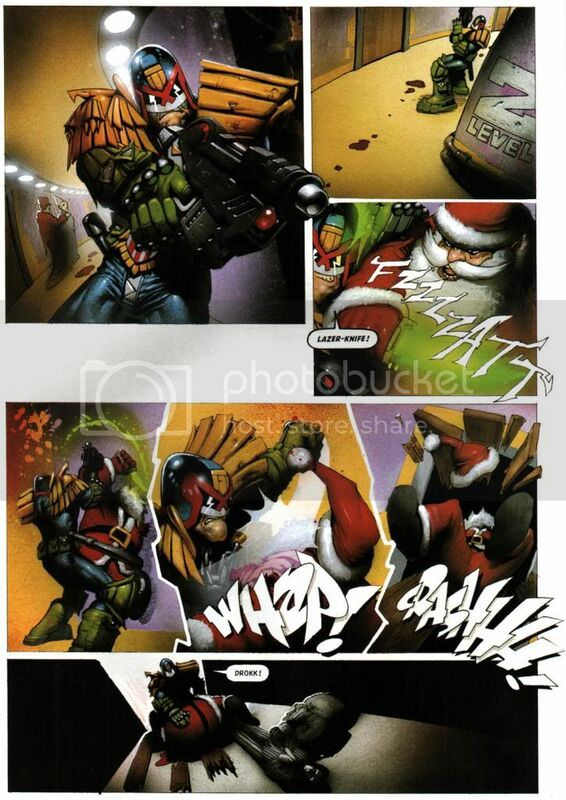 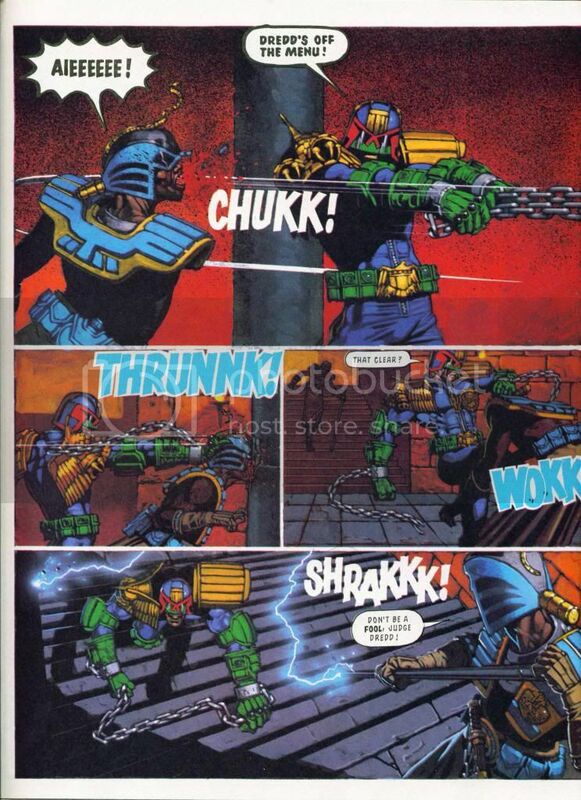 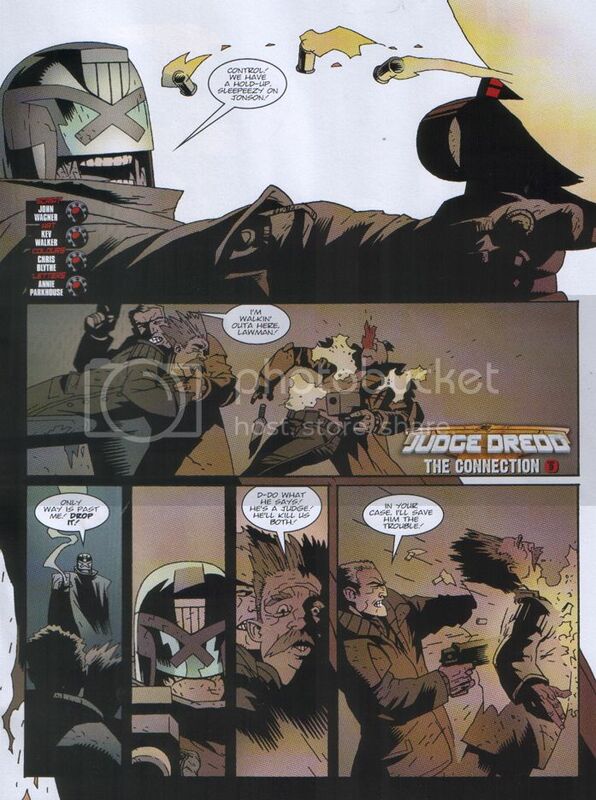 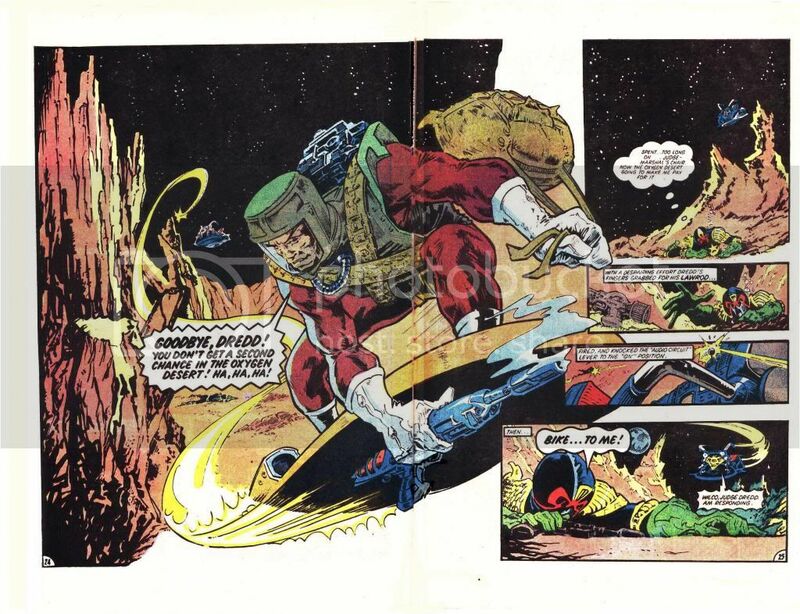 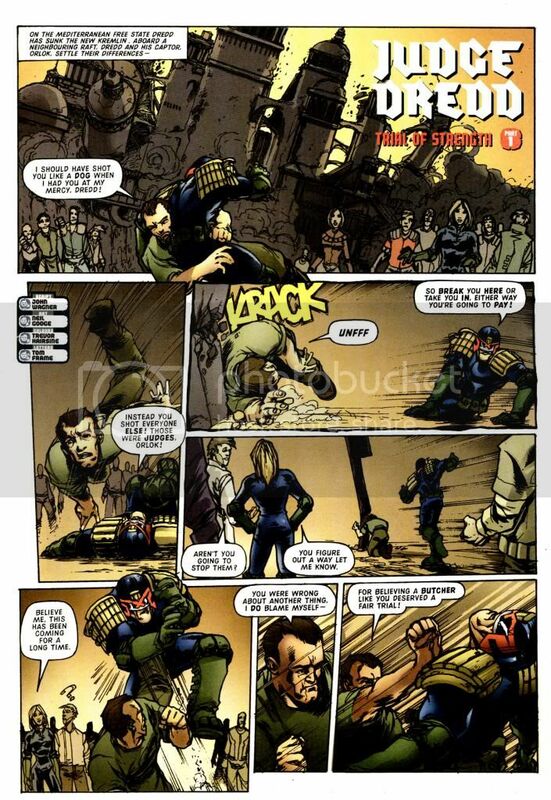 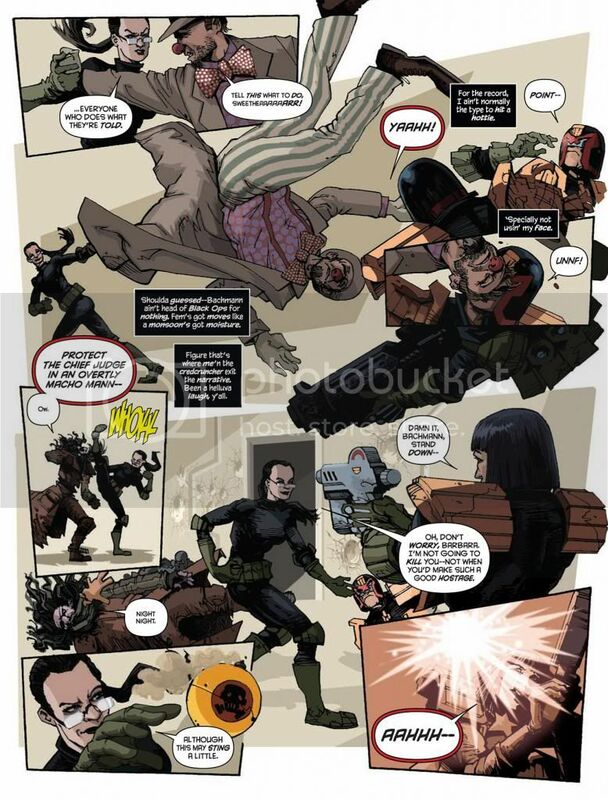 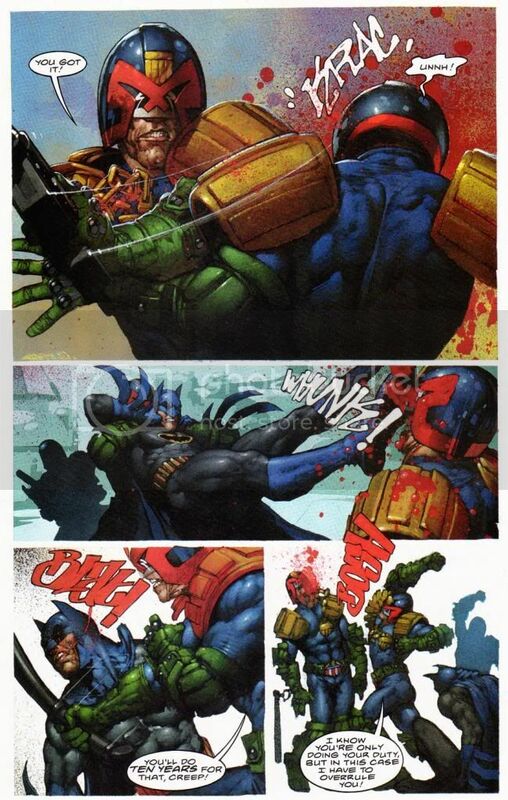 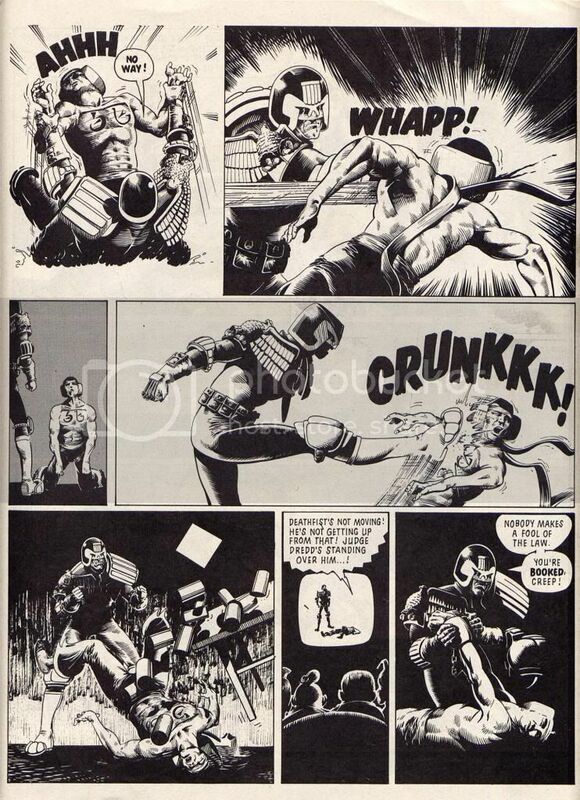 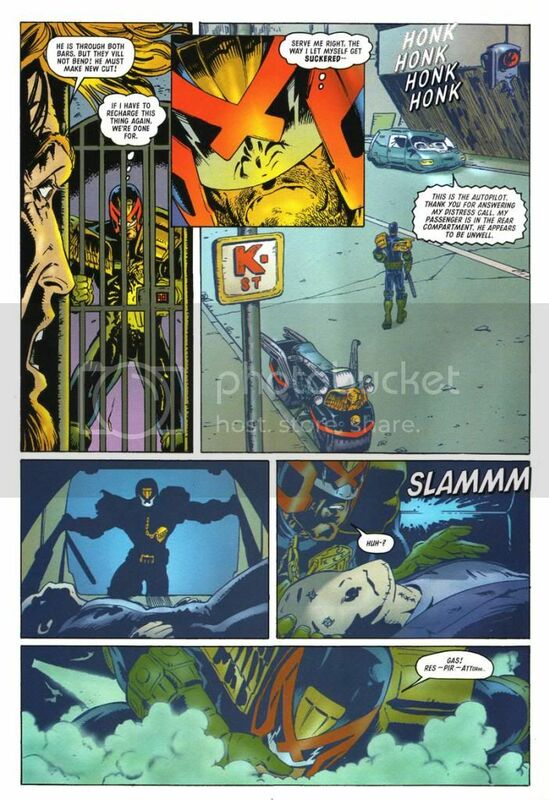 I’ve also included examples of Dredd slamming people head-first into things in this section. 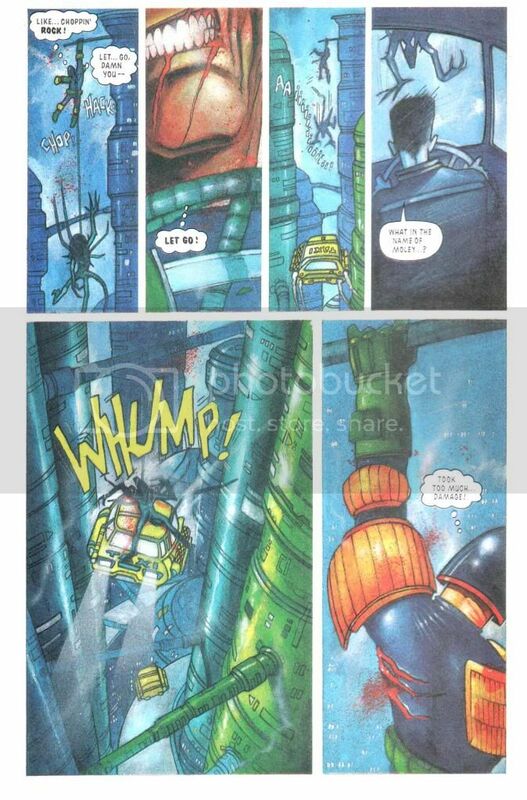 Let’s start with some more mundane stuff. 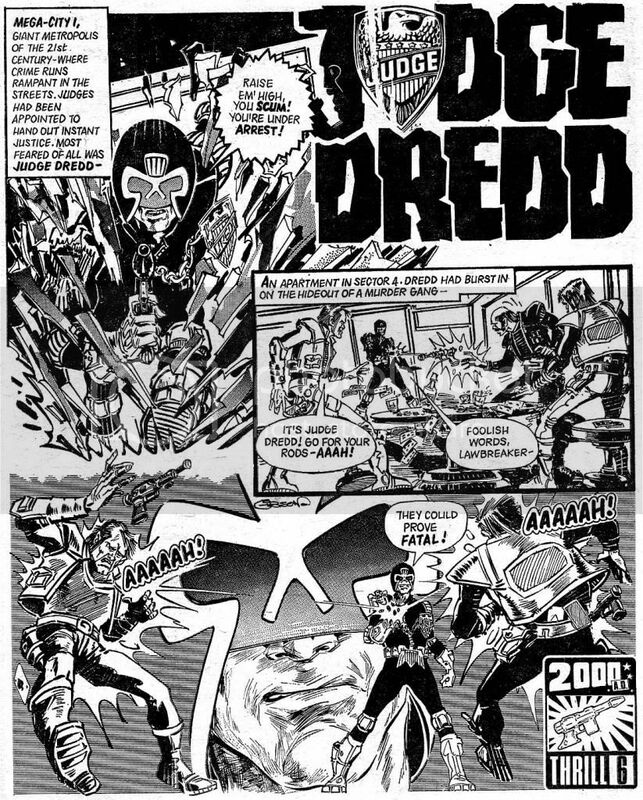 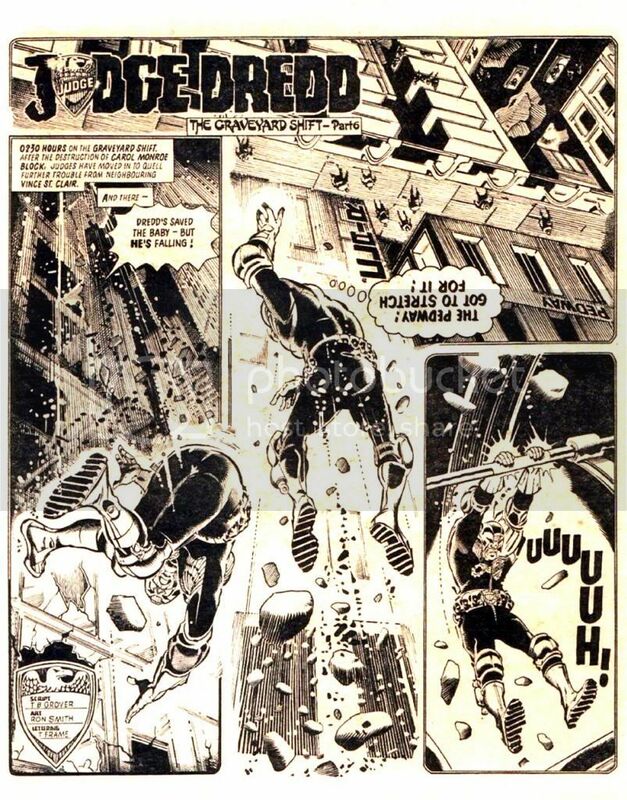 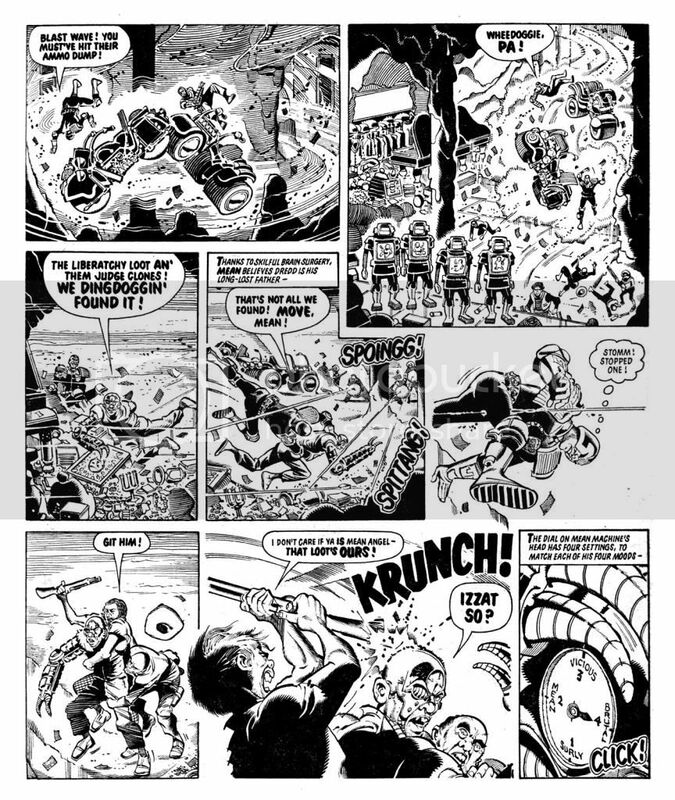 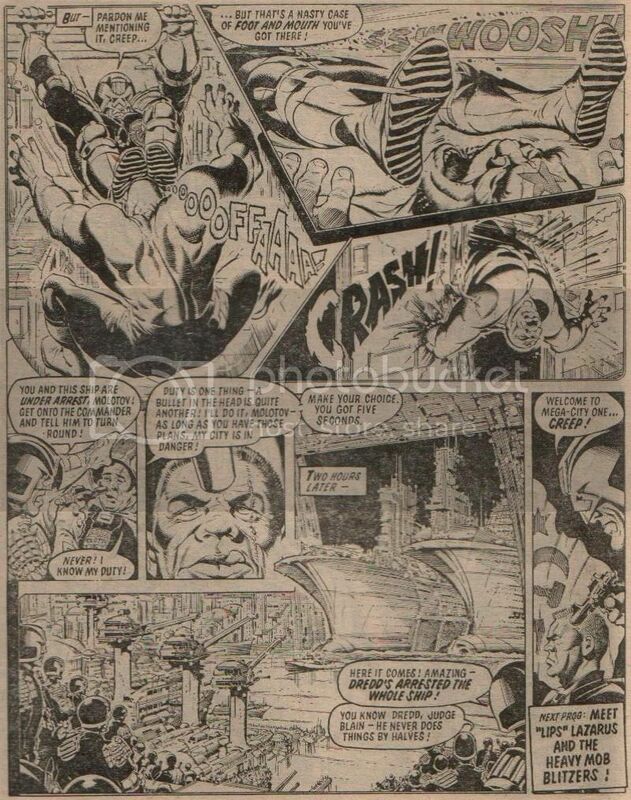 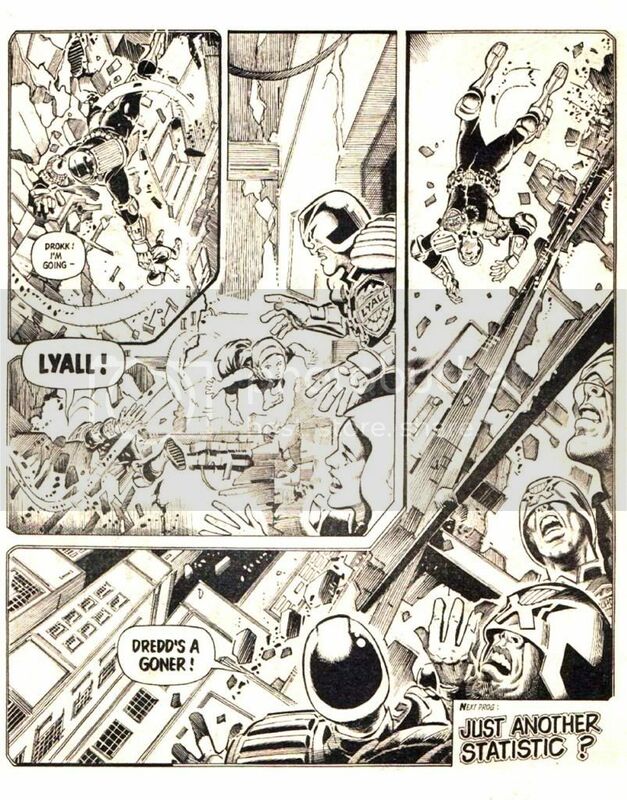 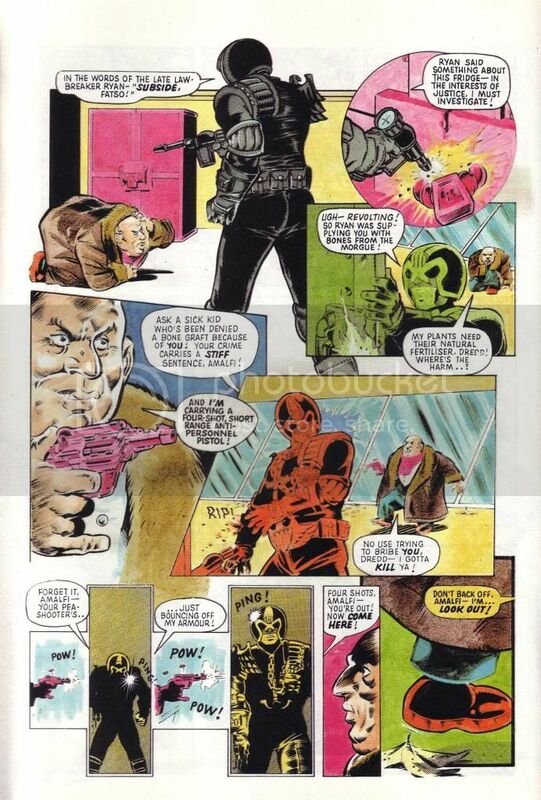 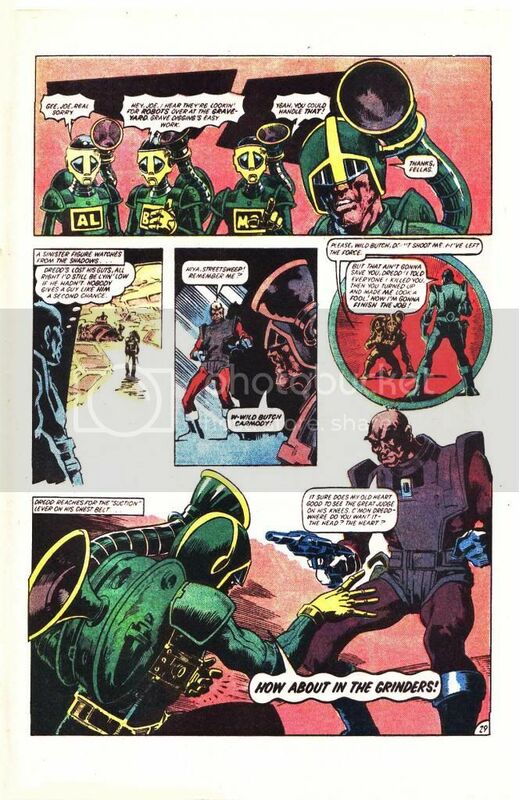 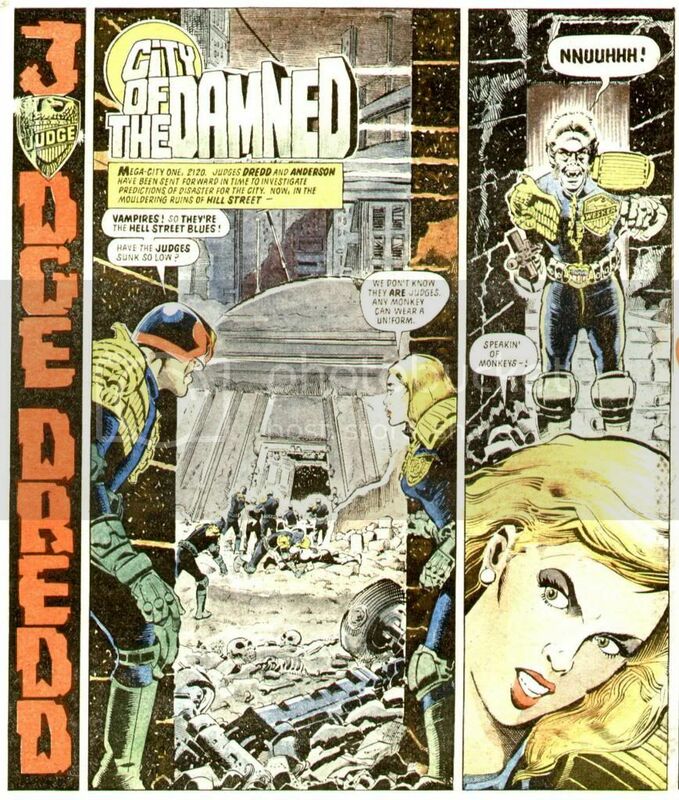 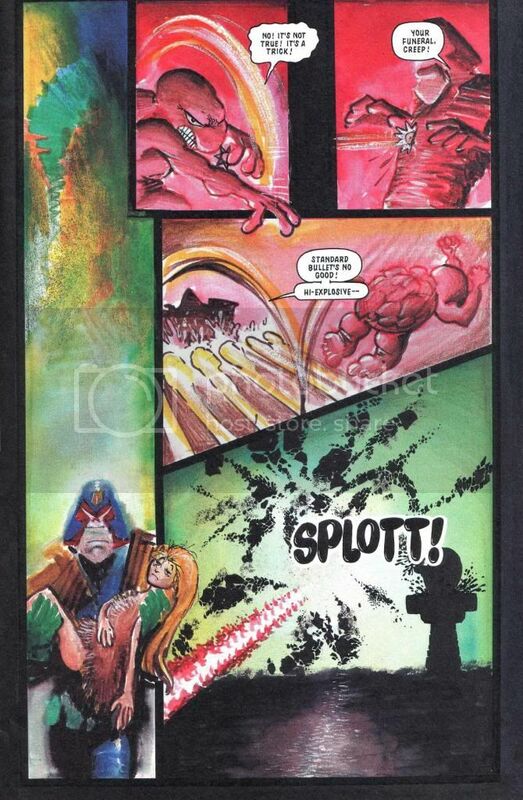 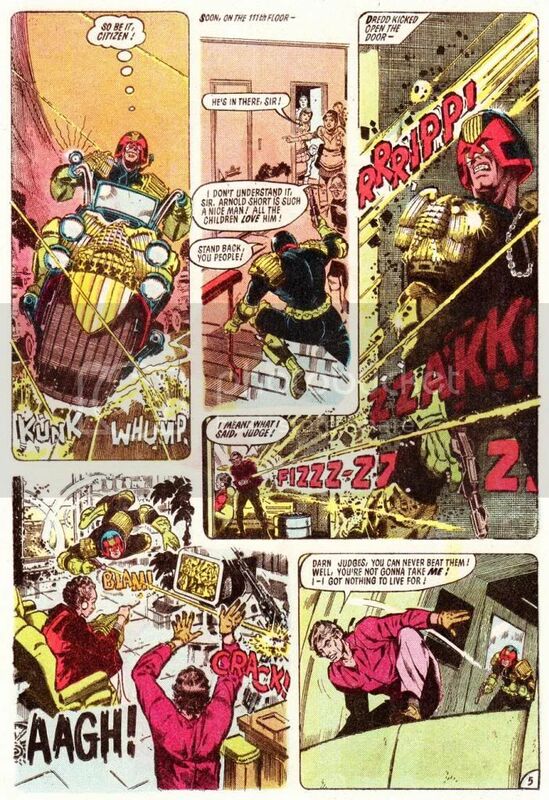 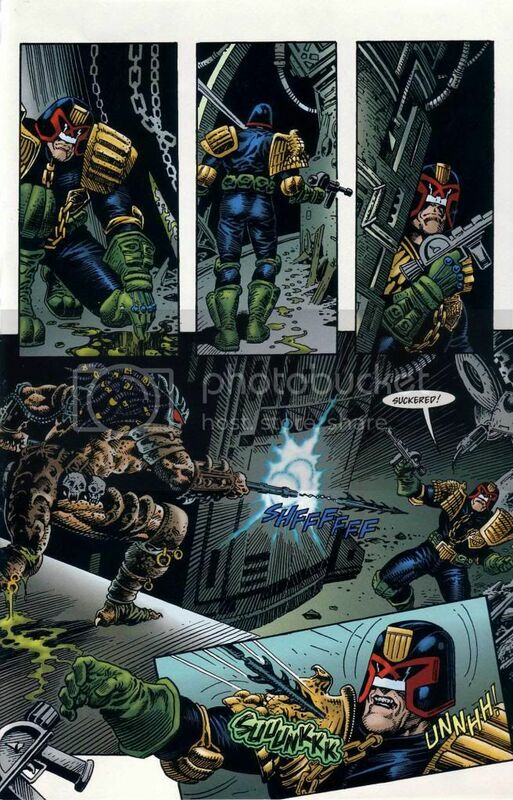 First, here’s an assortment of examples of Dredd striking wooden doors hard enough not merely to knock them down, but hard enough to reduce them to little more than wooden shrapnel. 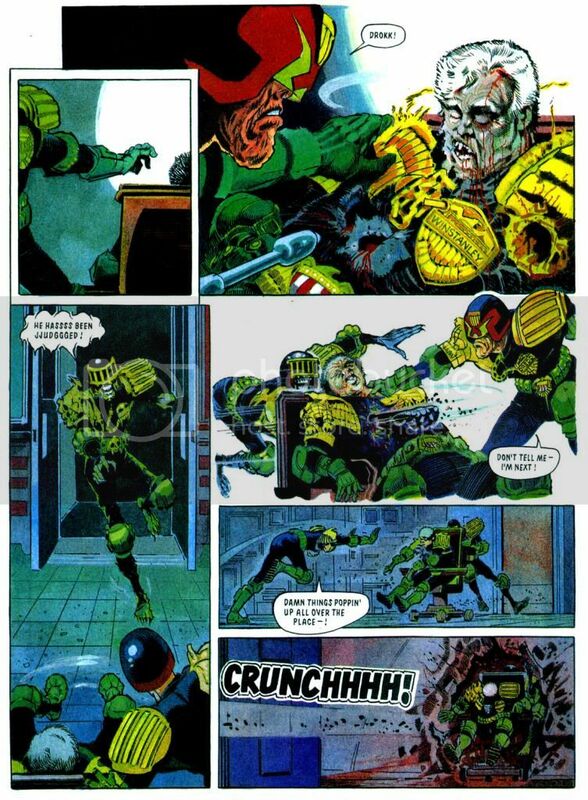 Next, here we have a selection of examples of Dredd knocking solid metal doors (many of them specialist security doors) off their hinges. 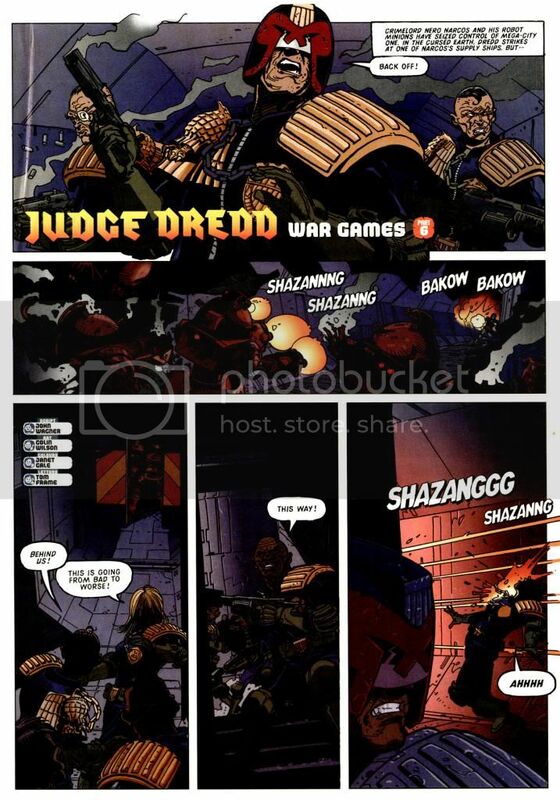 And now for the more interesting stuff! 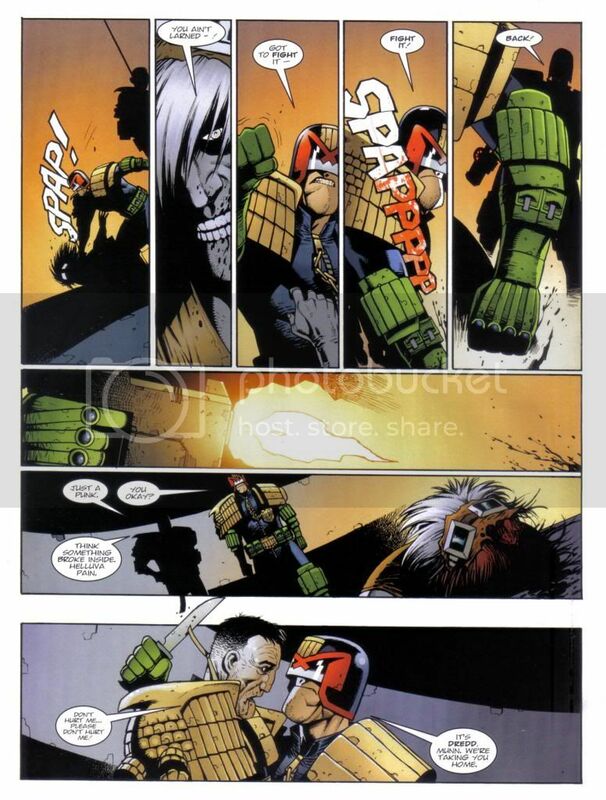 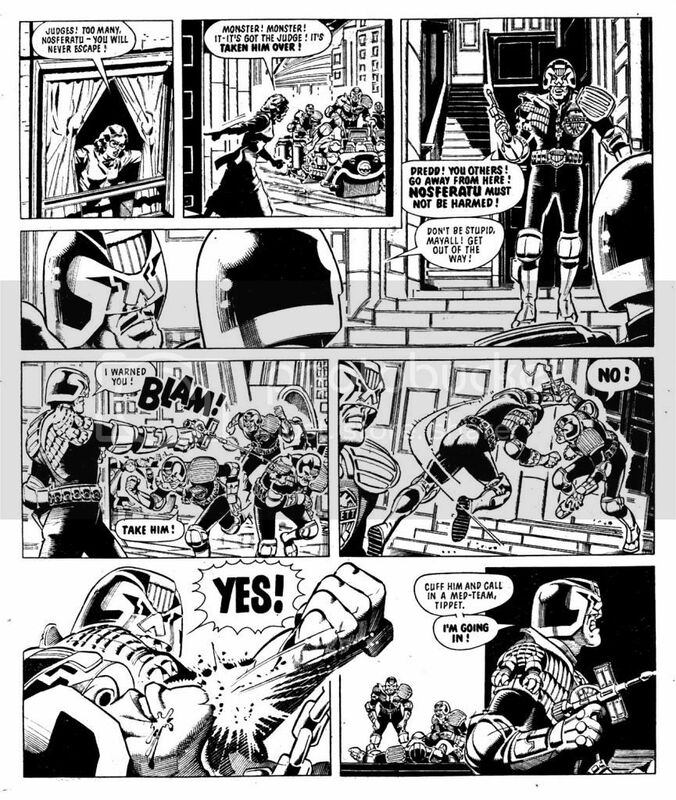 Showings involving Dredd’s physical strength being pitted against, or otherwise compared to, another character or characters. 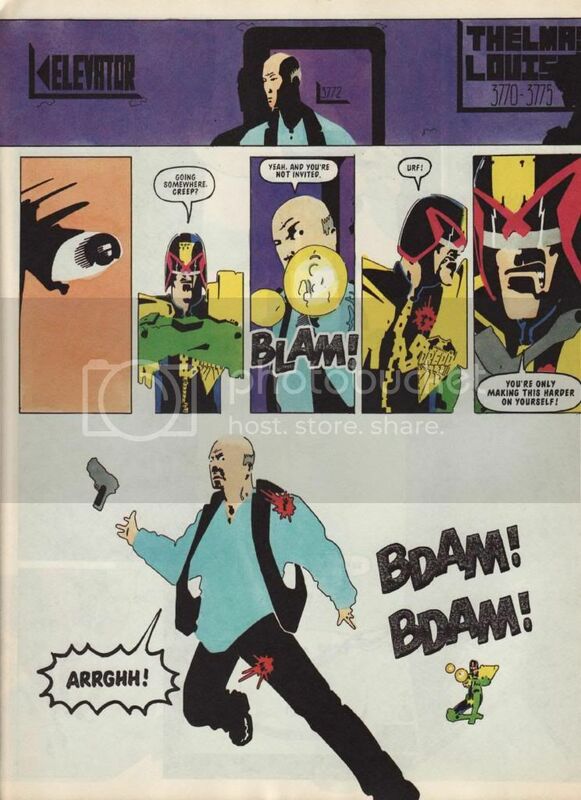 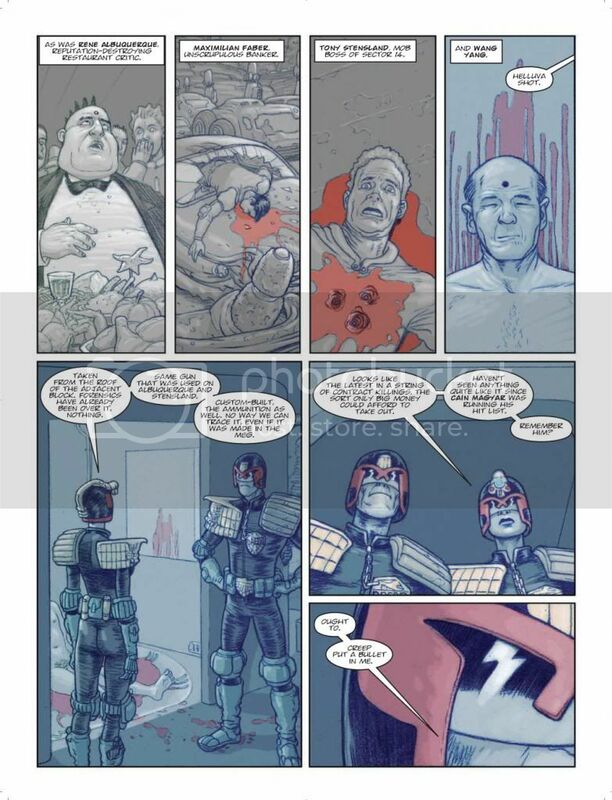 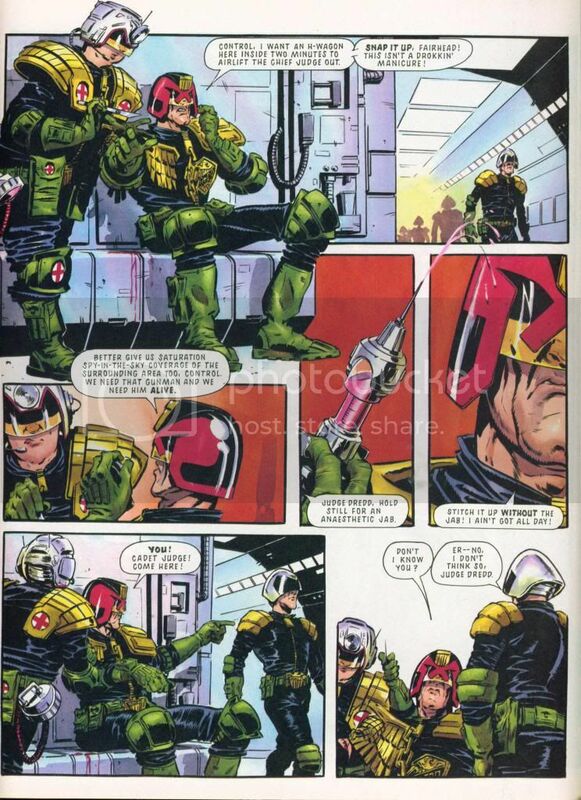 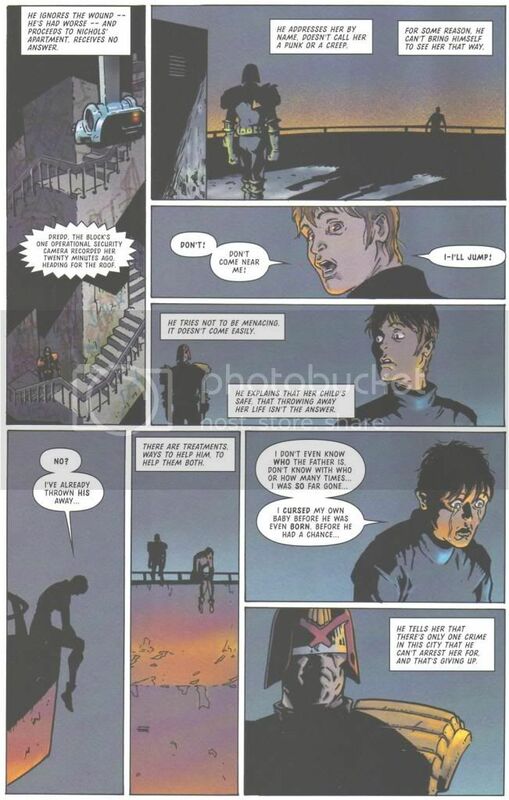 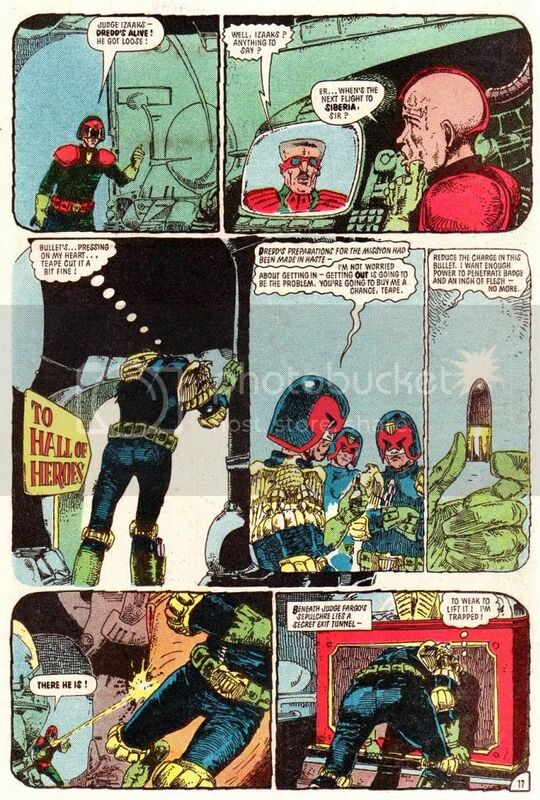 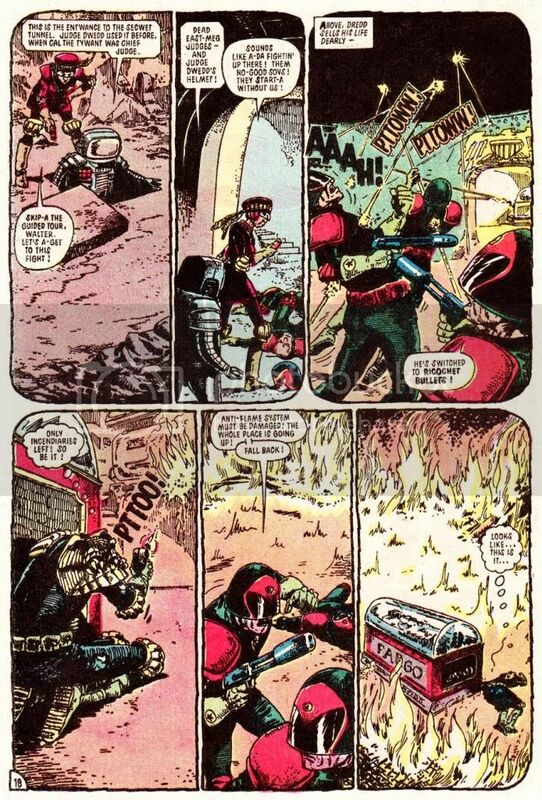 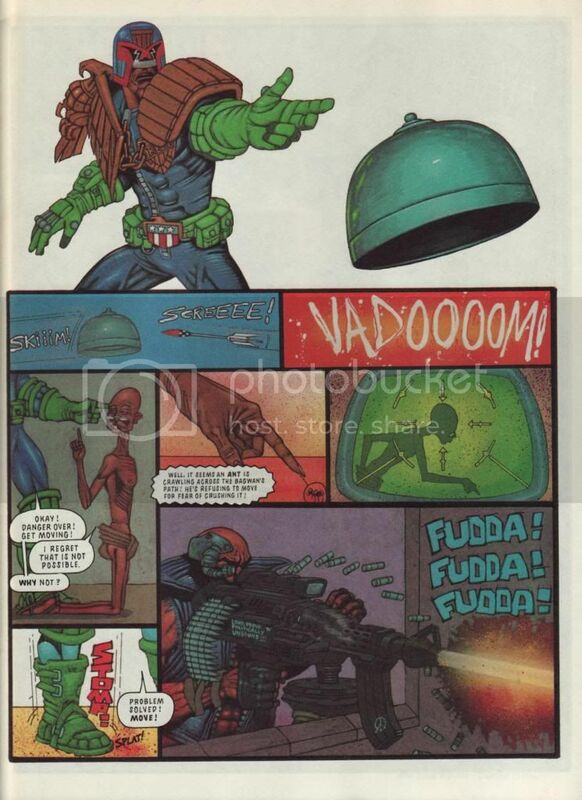 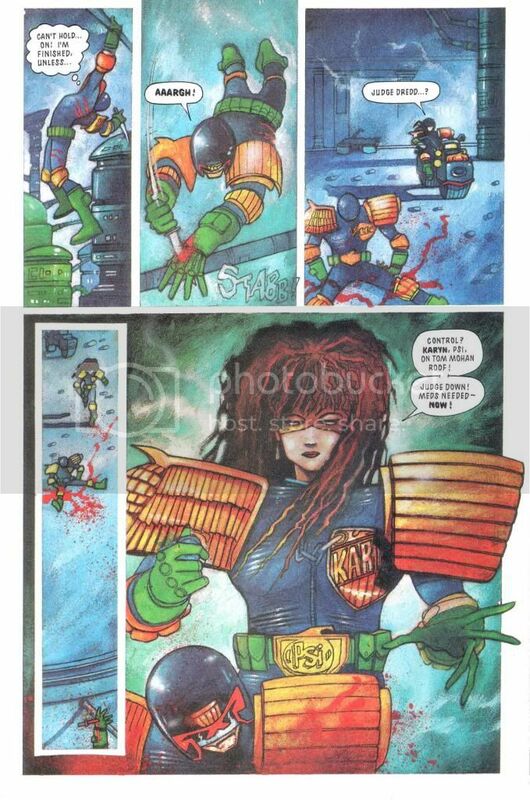 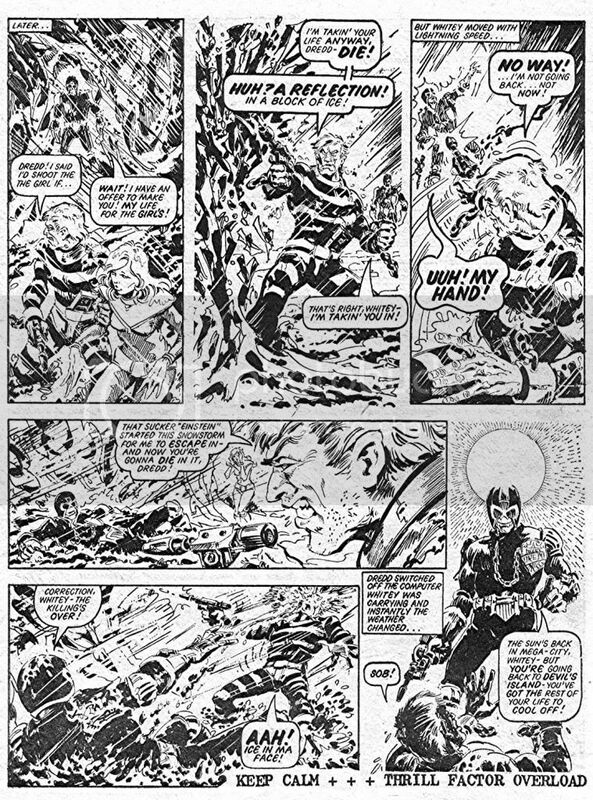 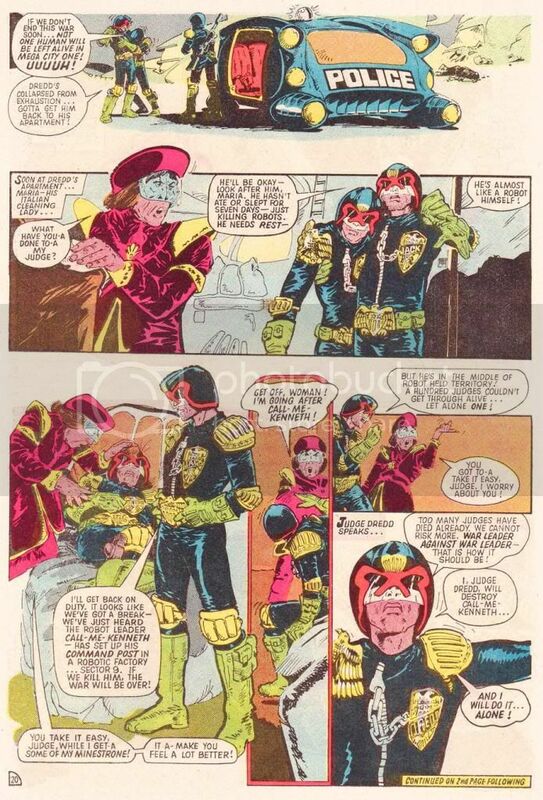 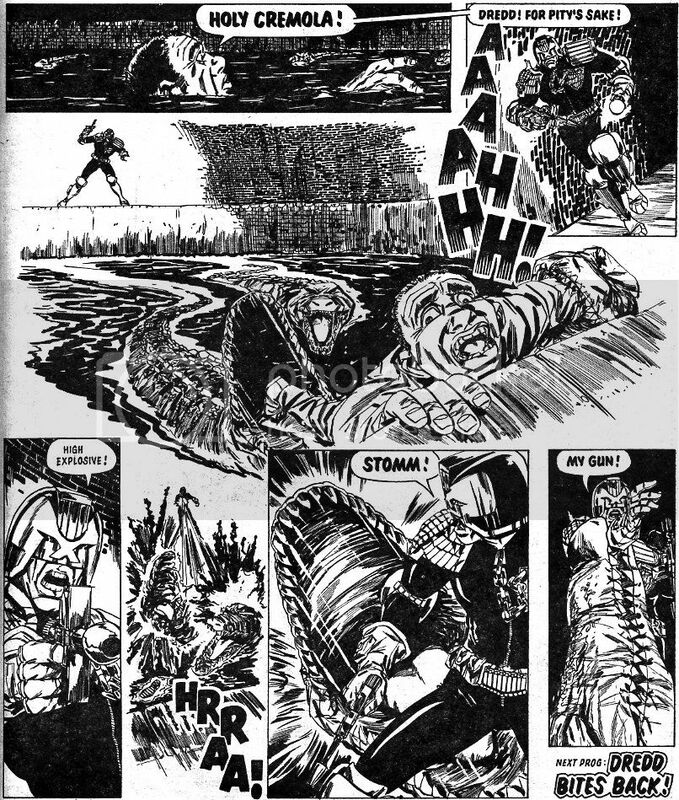 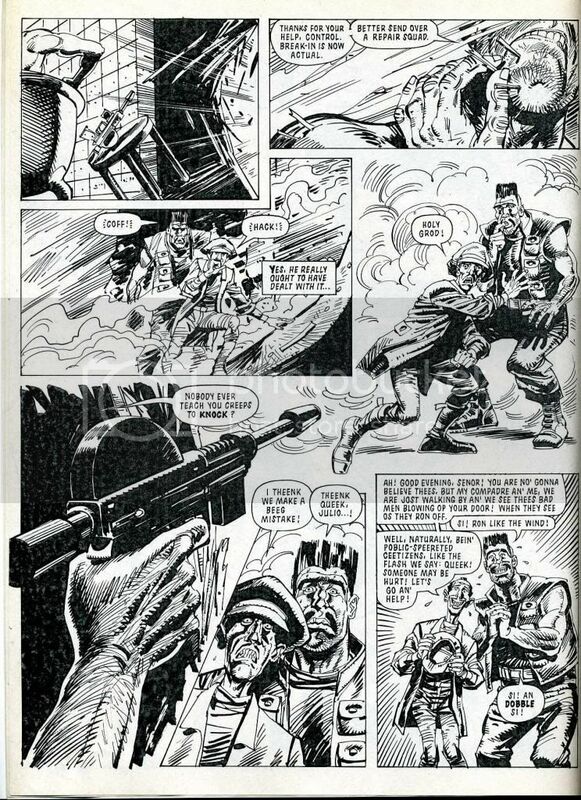 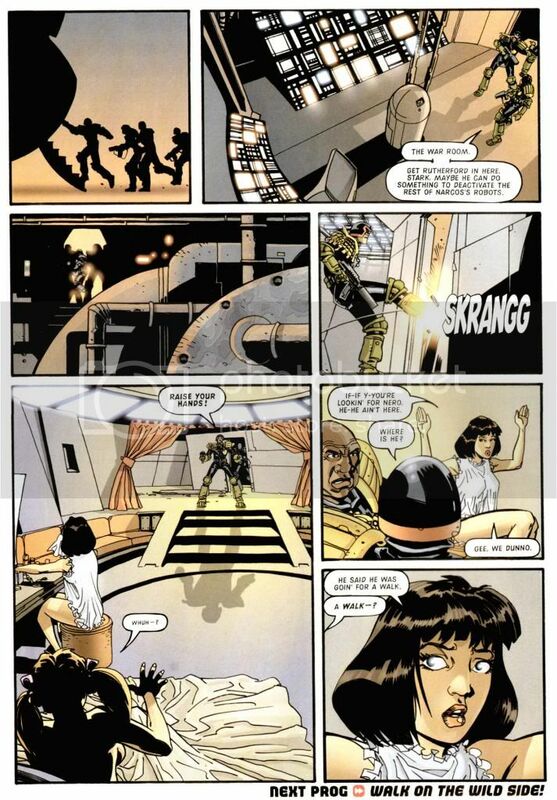 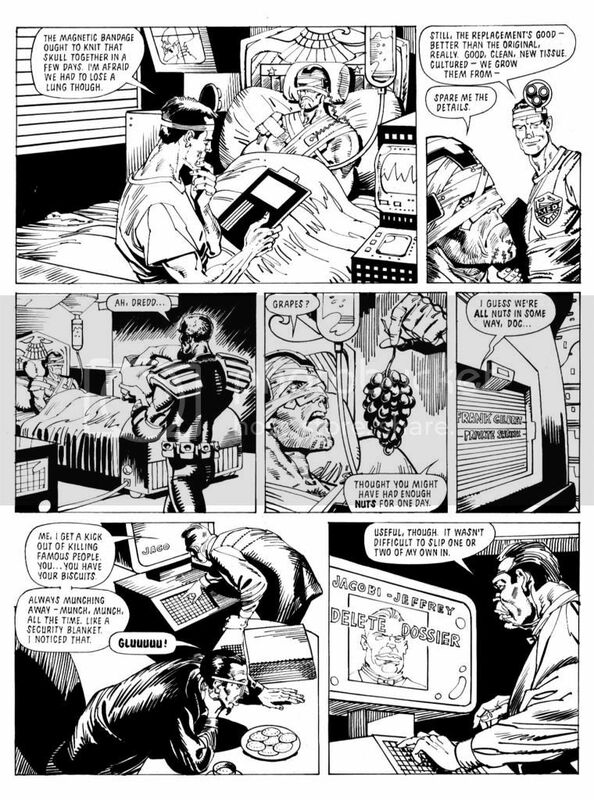 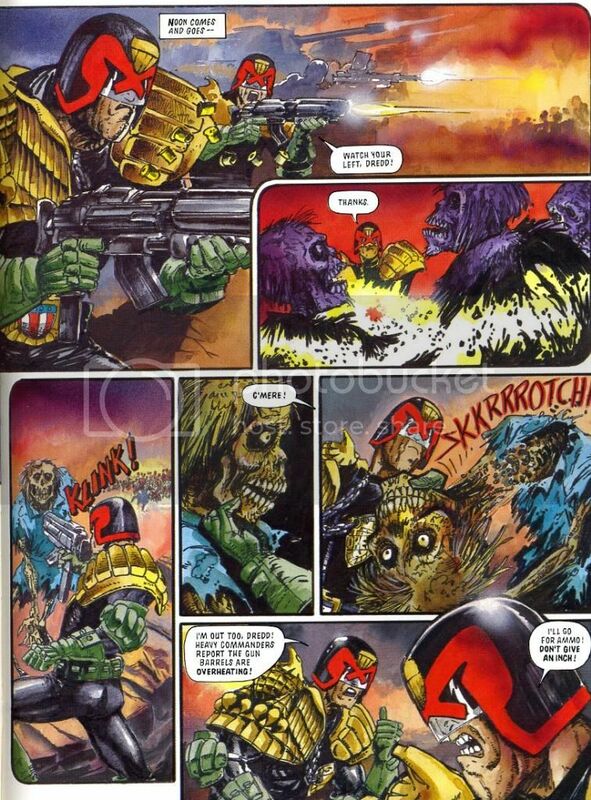 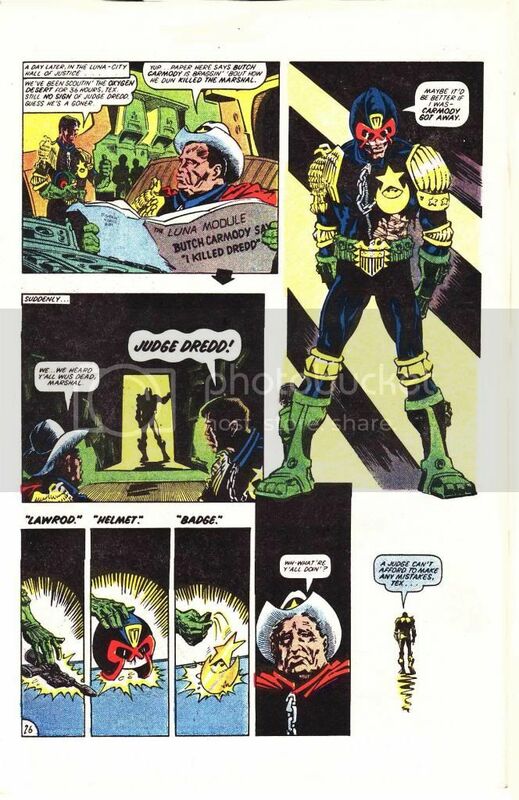 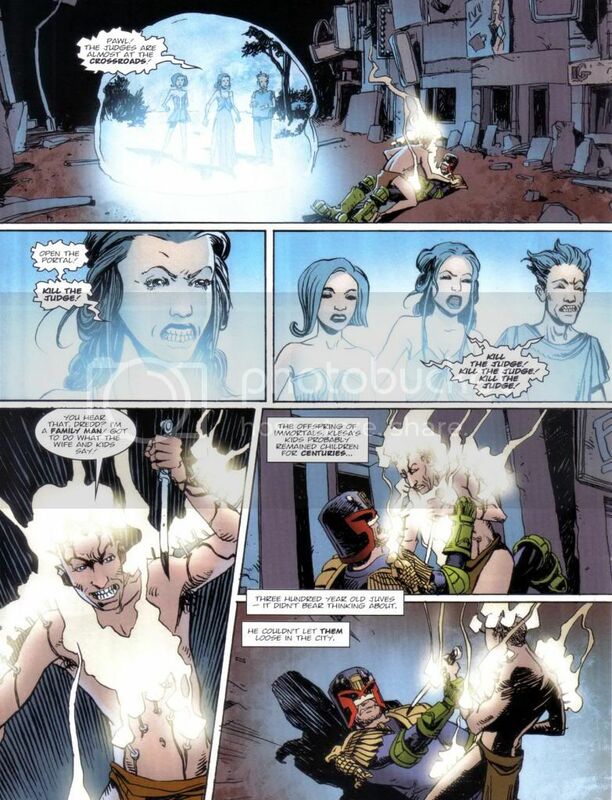 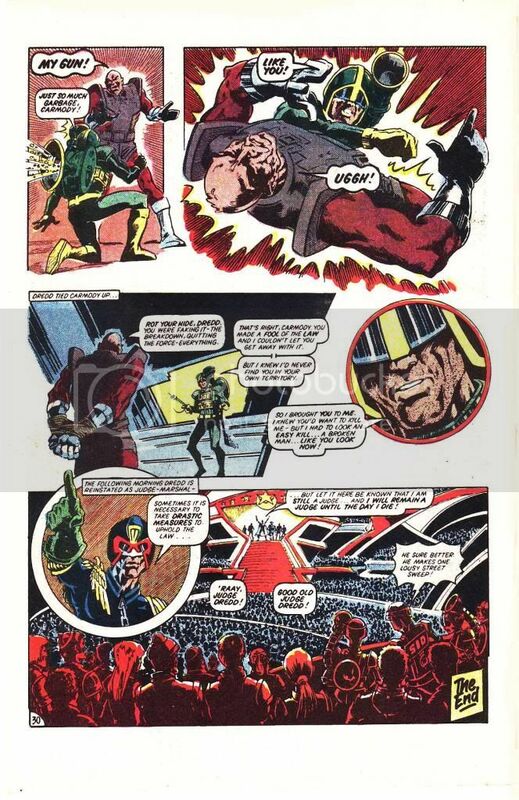 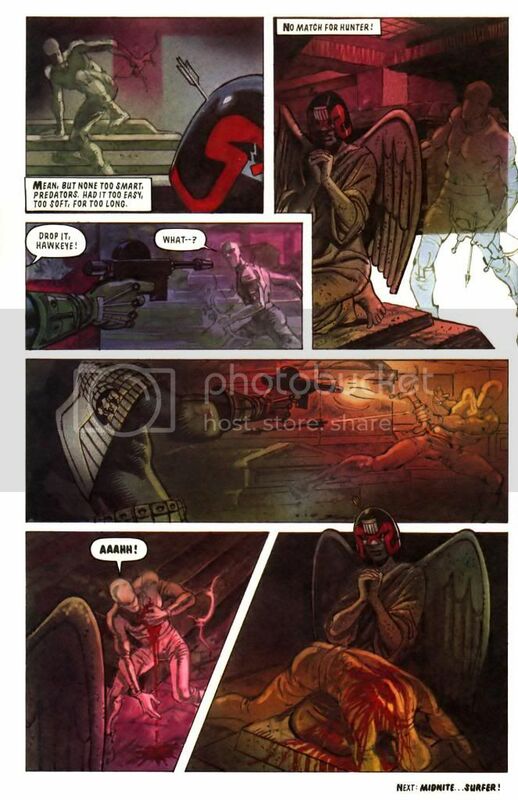 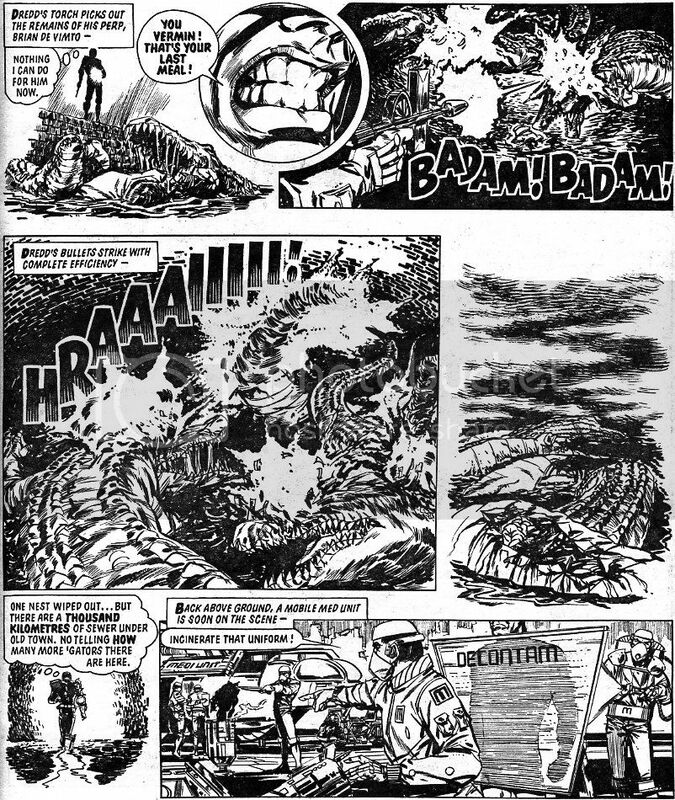 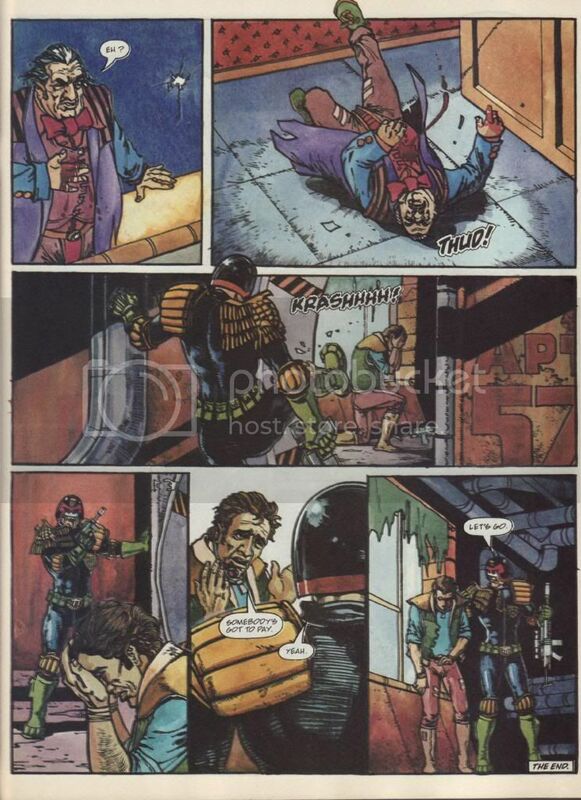 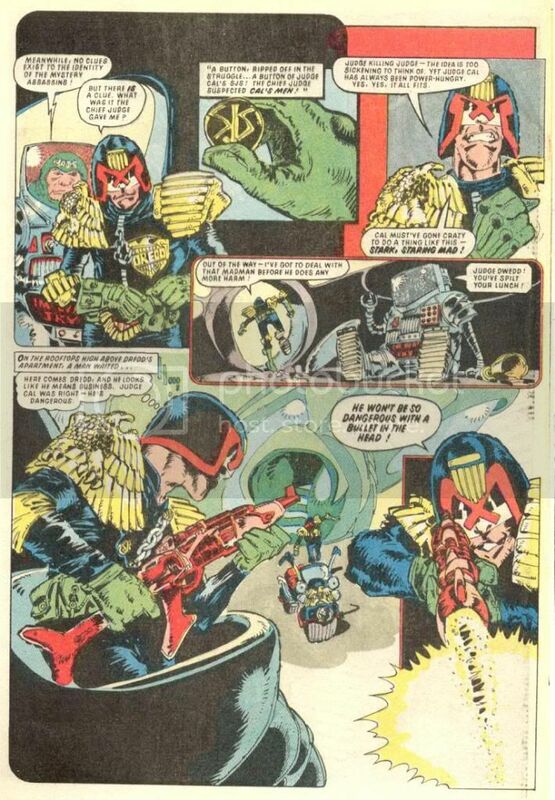 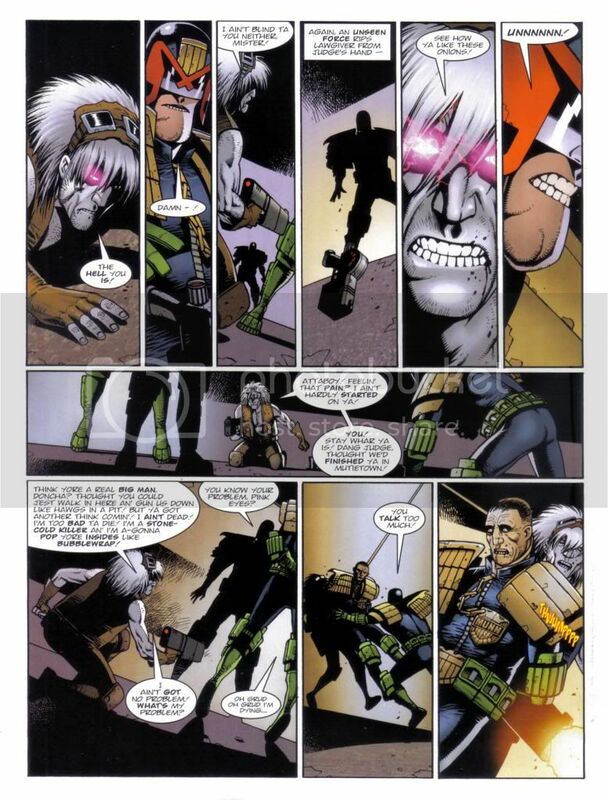 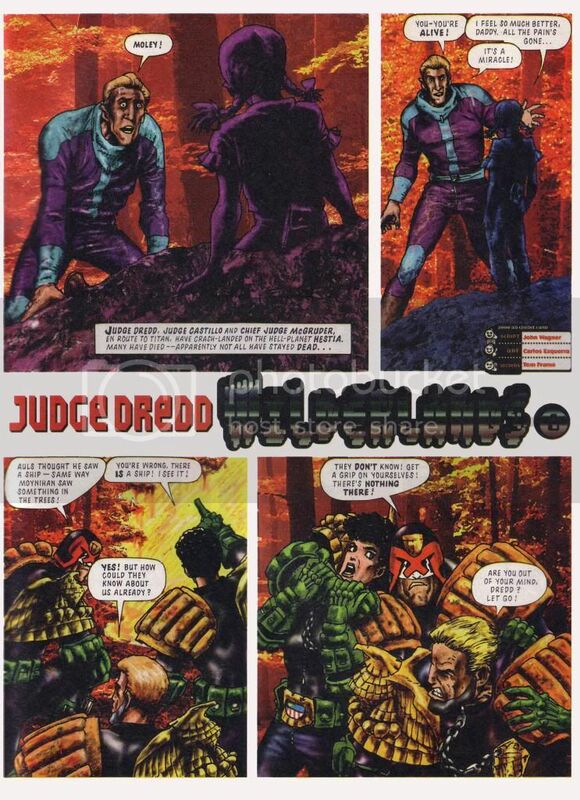 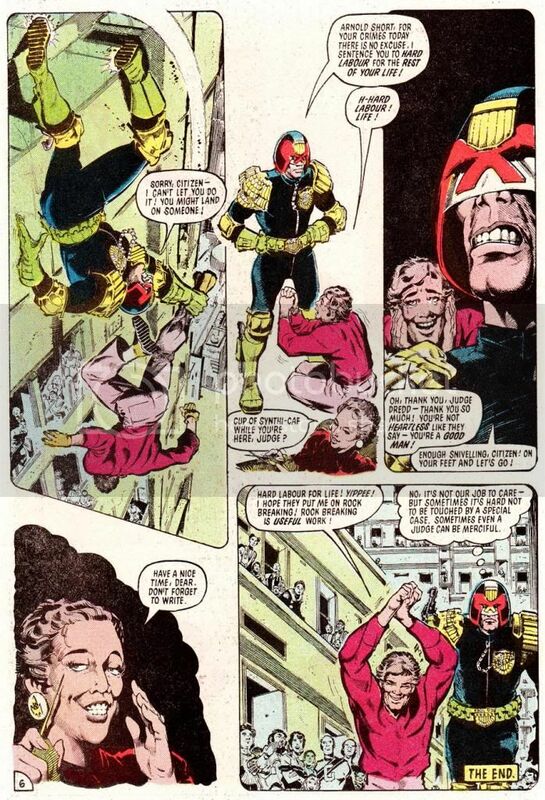 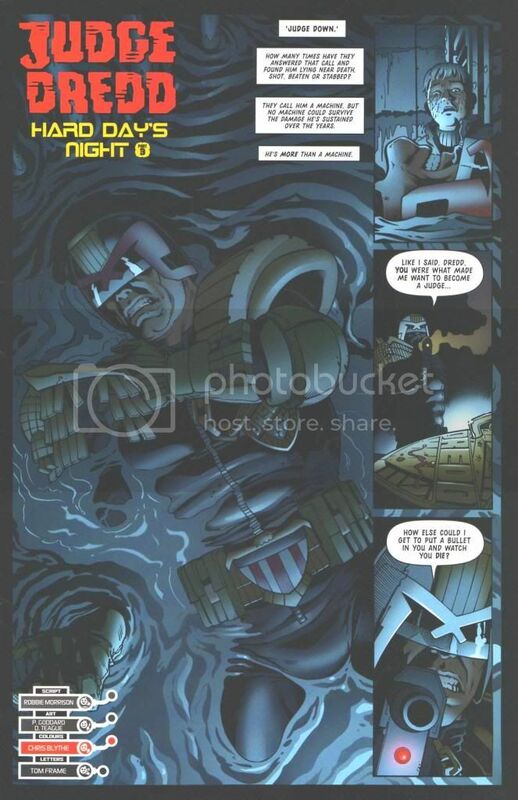 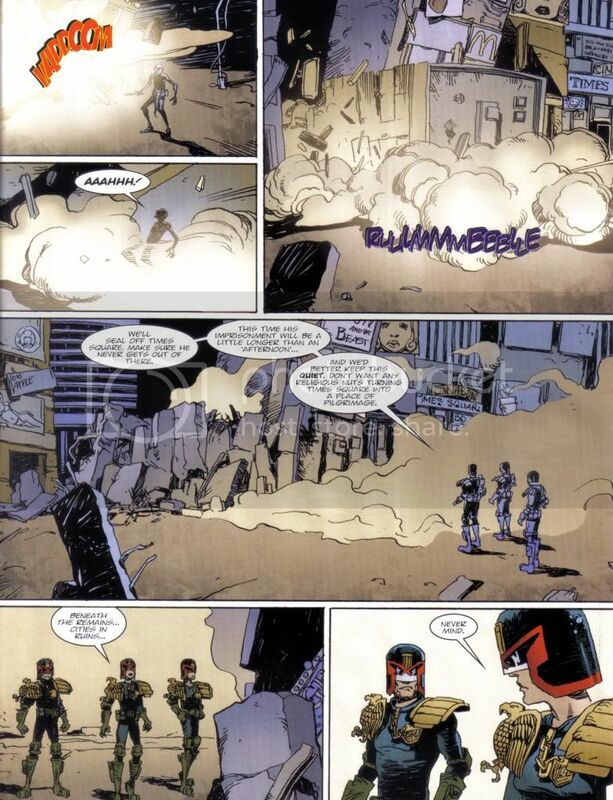 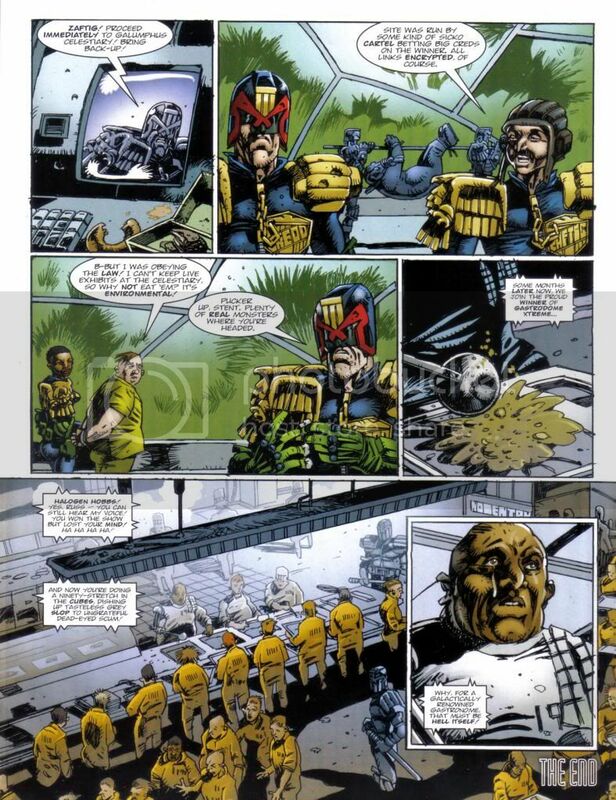 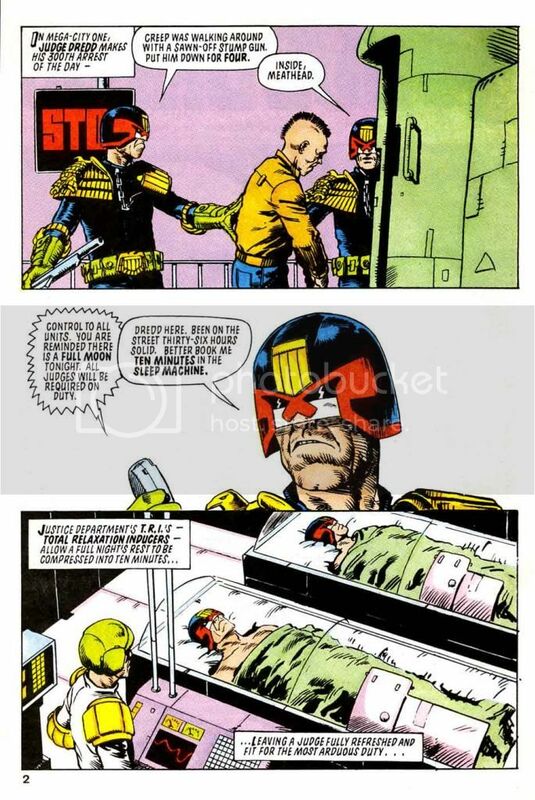 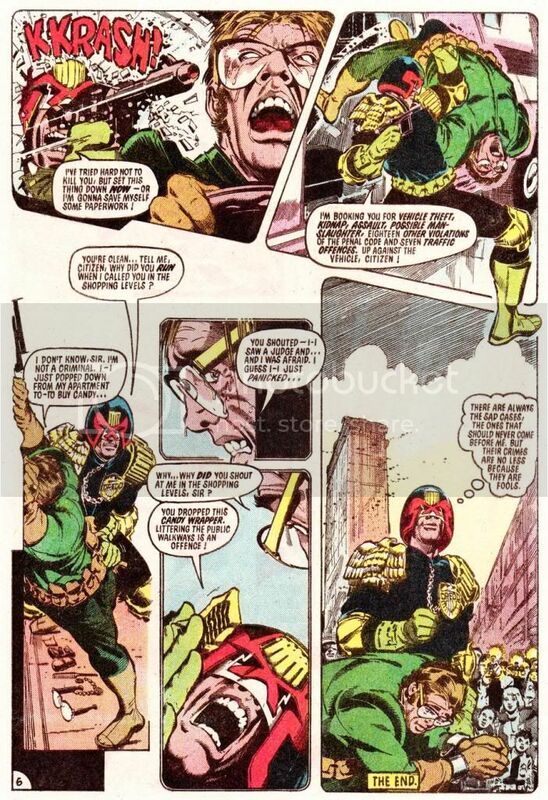 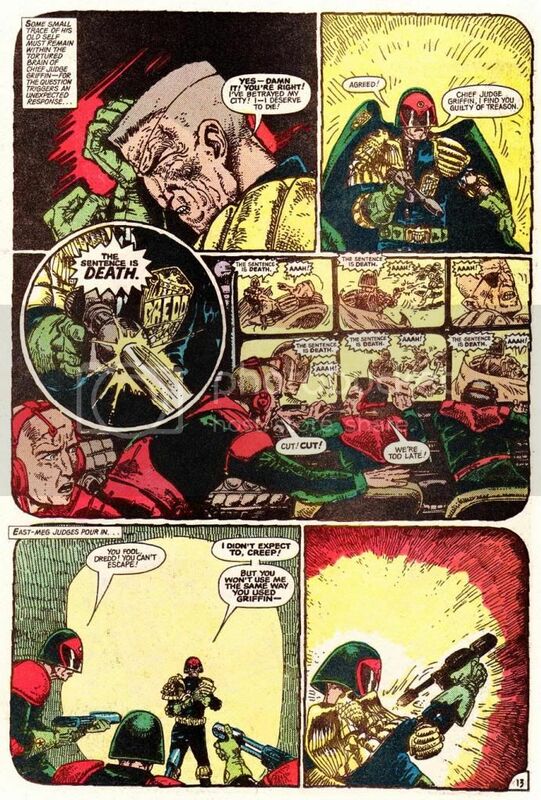 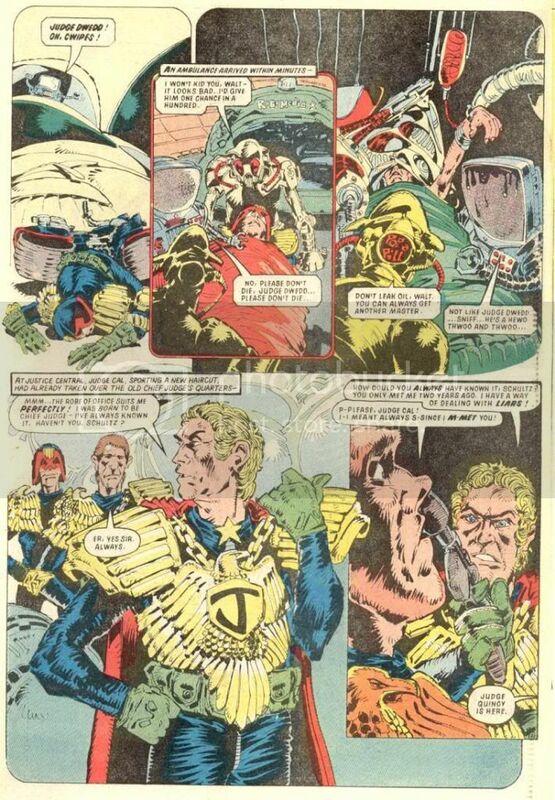 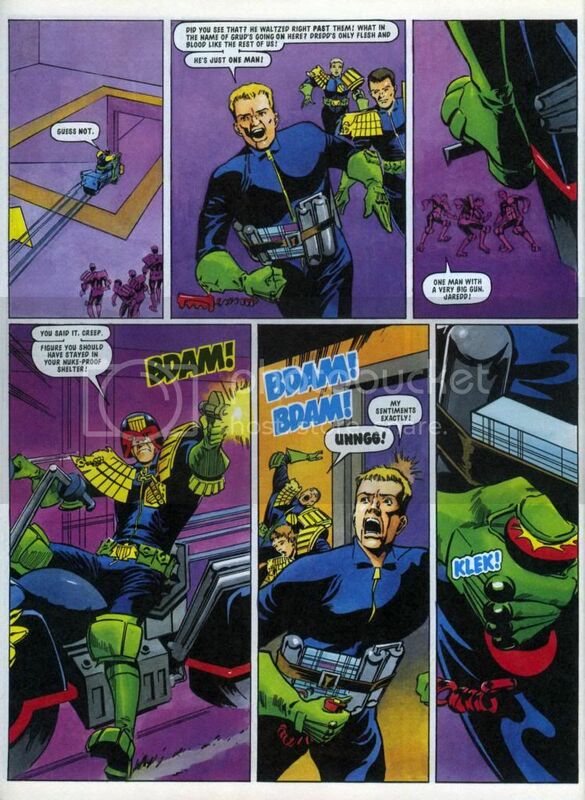 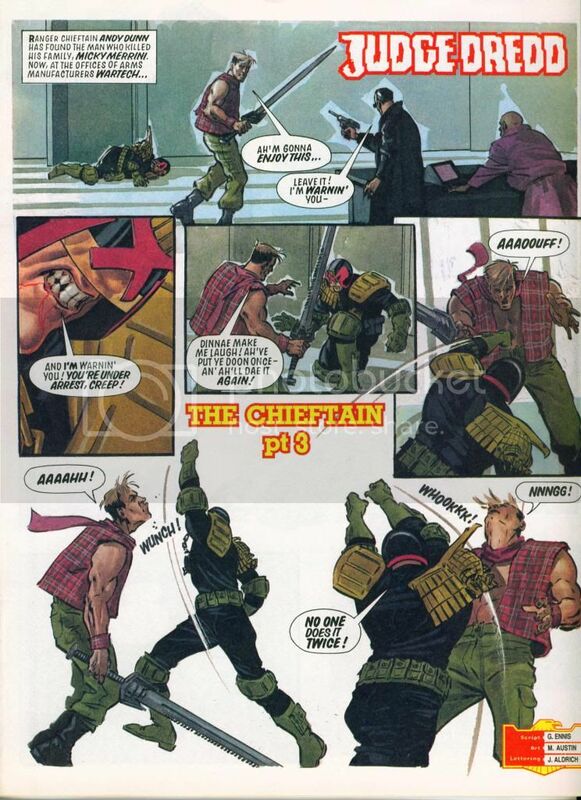 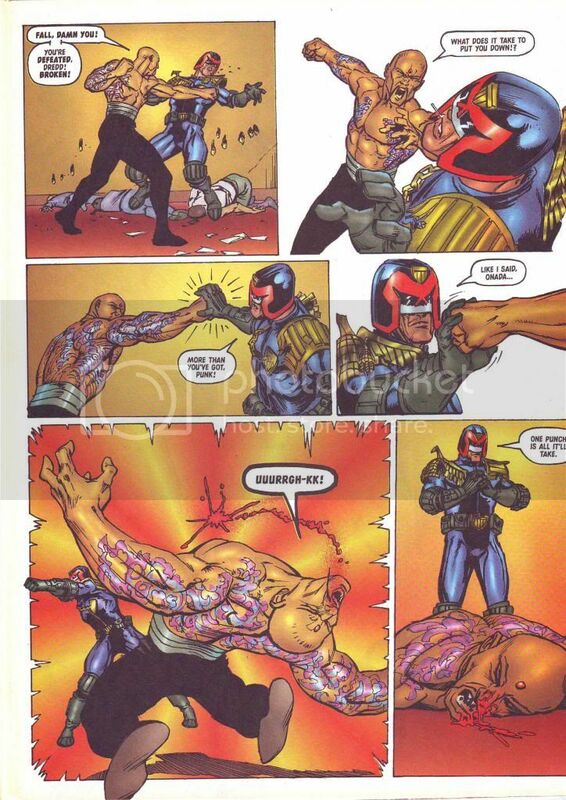 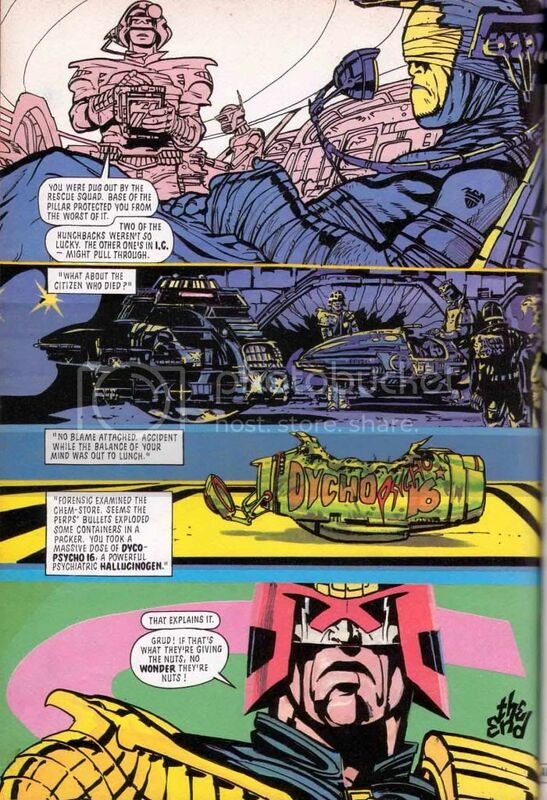 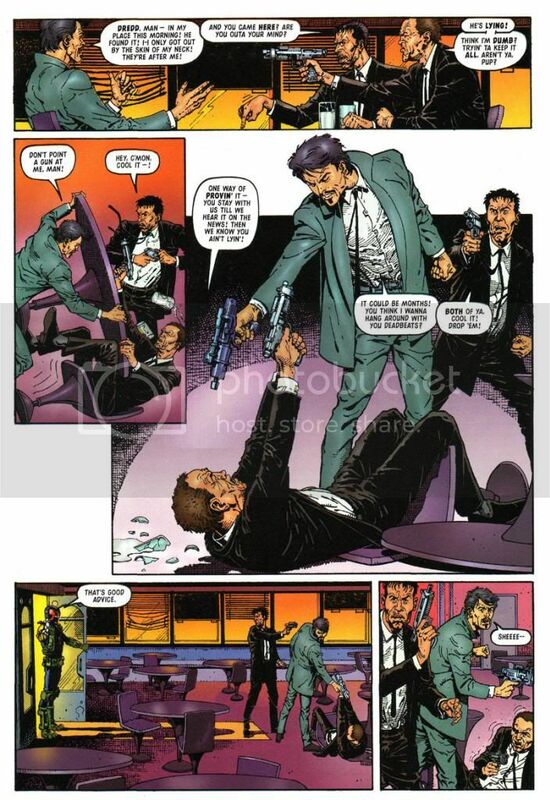 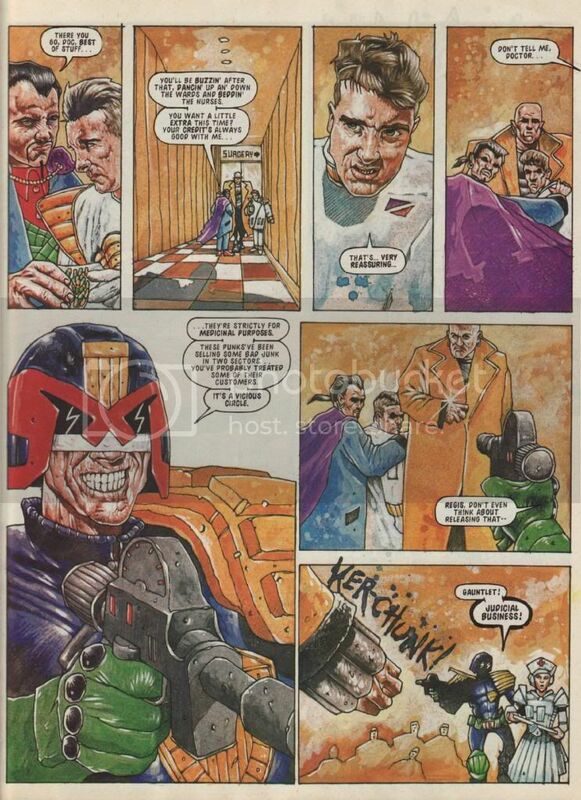 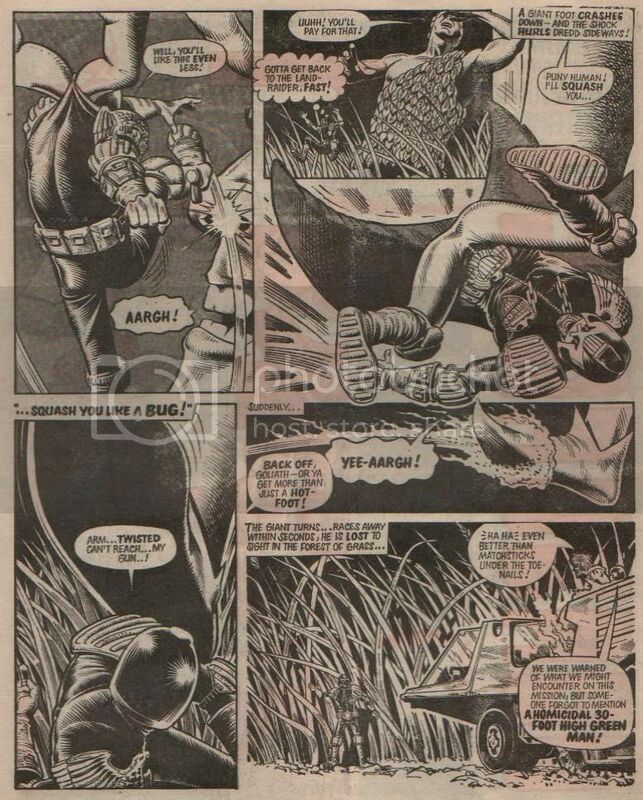 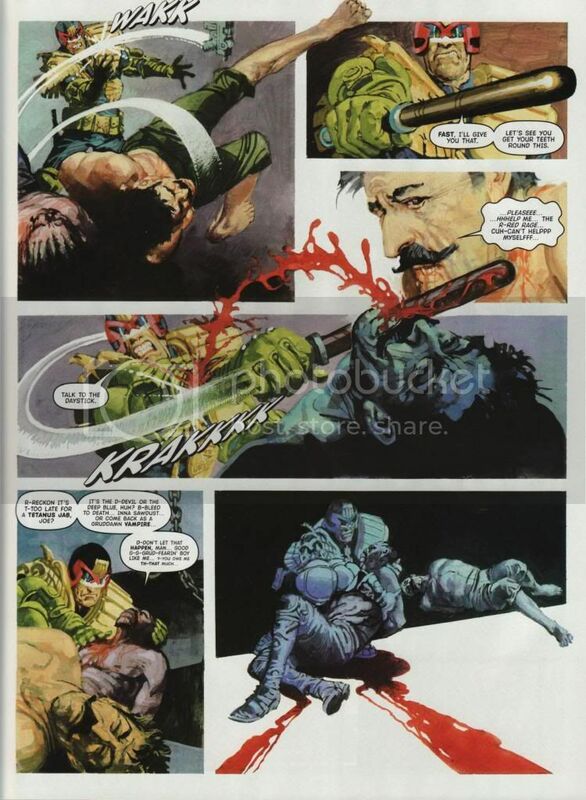 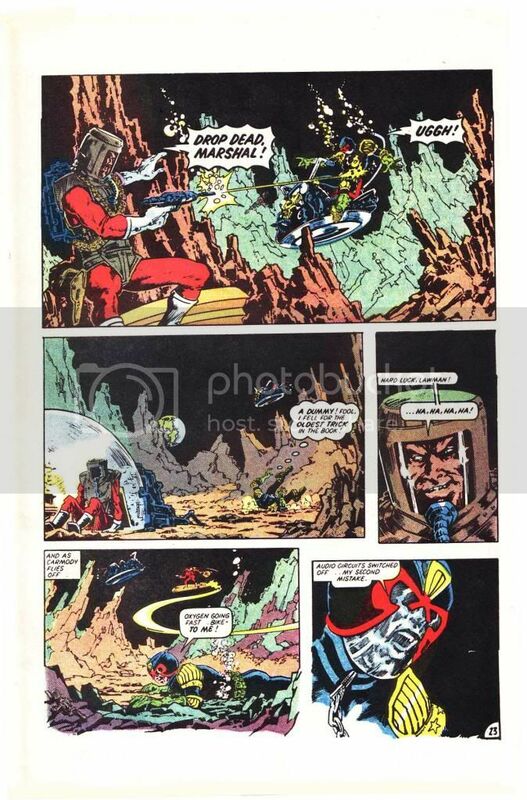 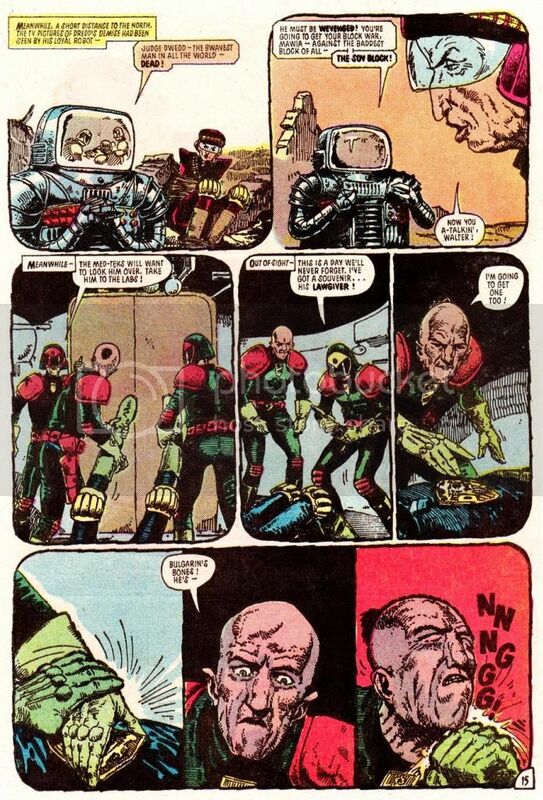 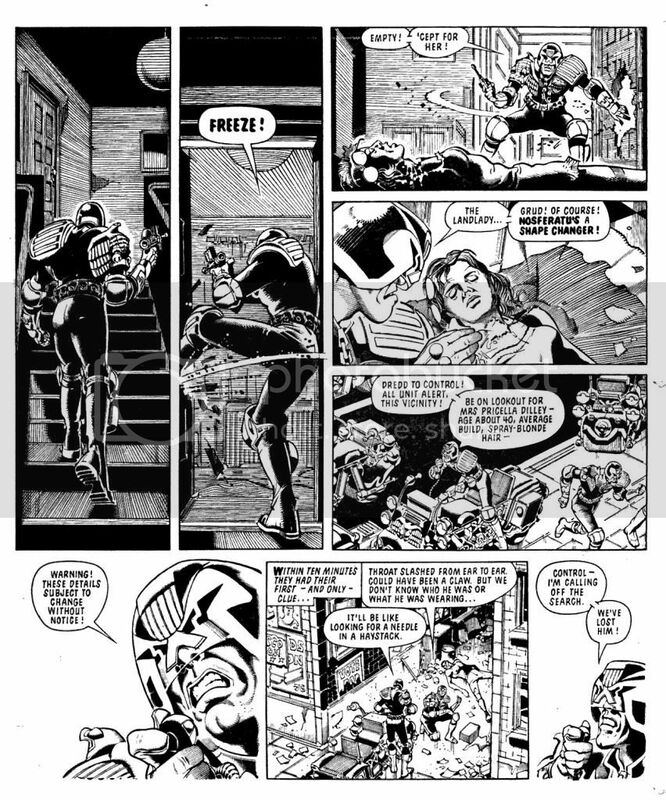 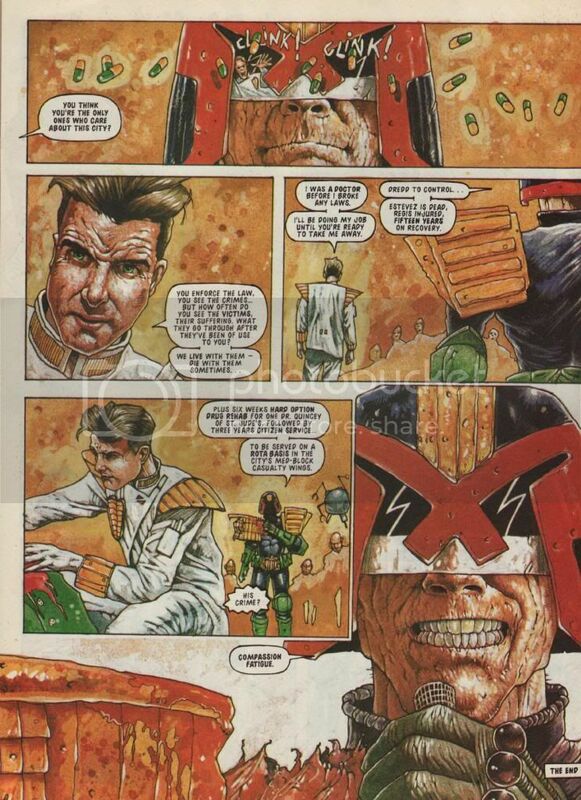 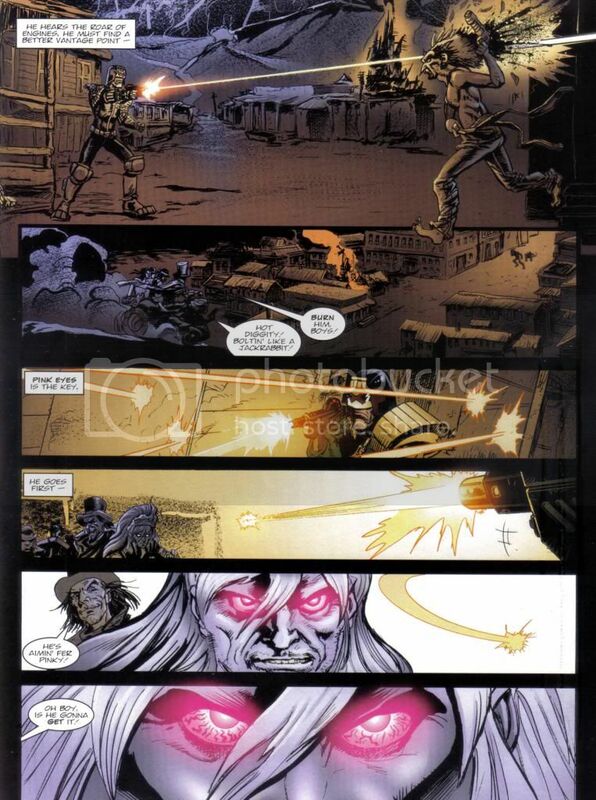 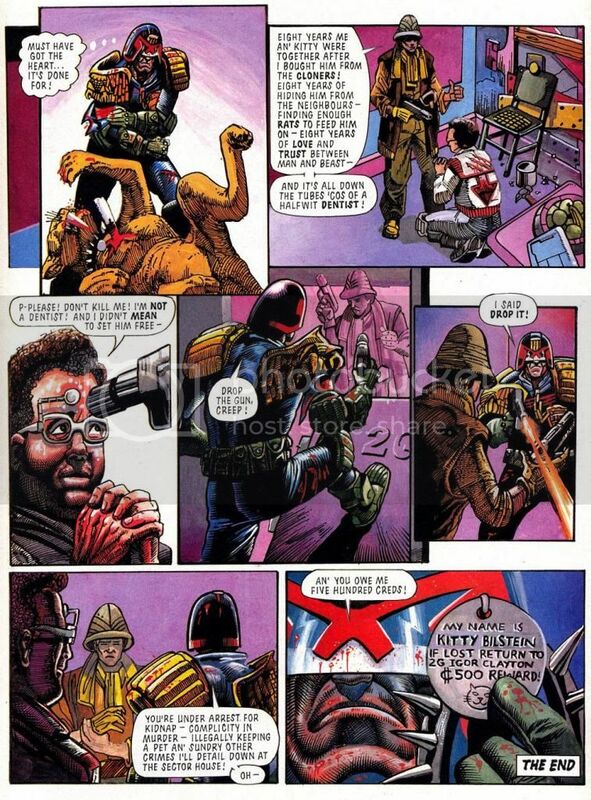 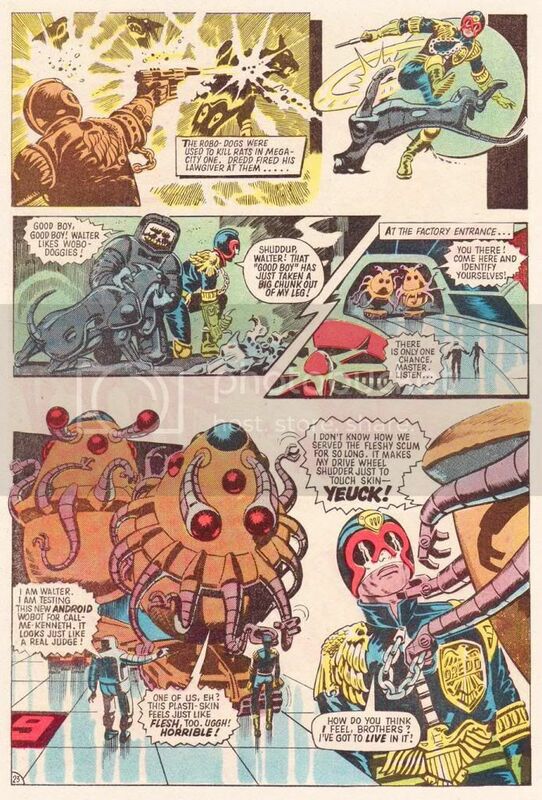 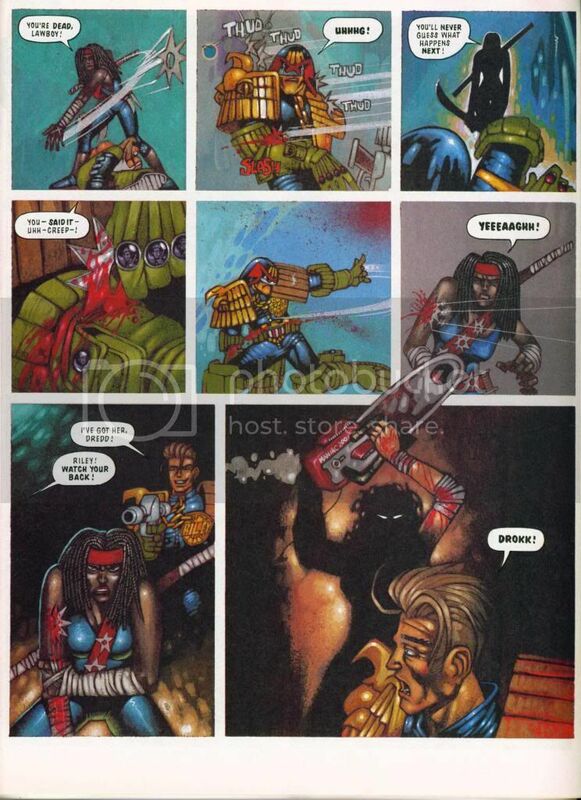 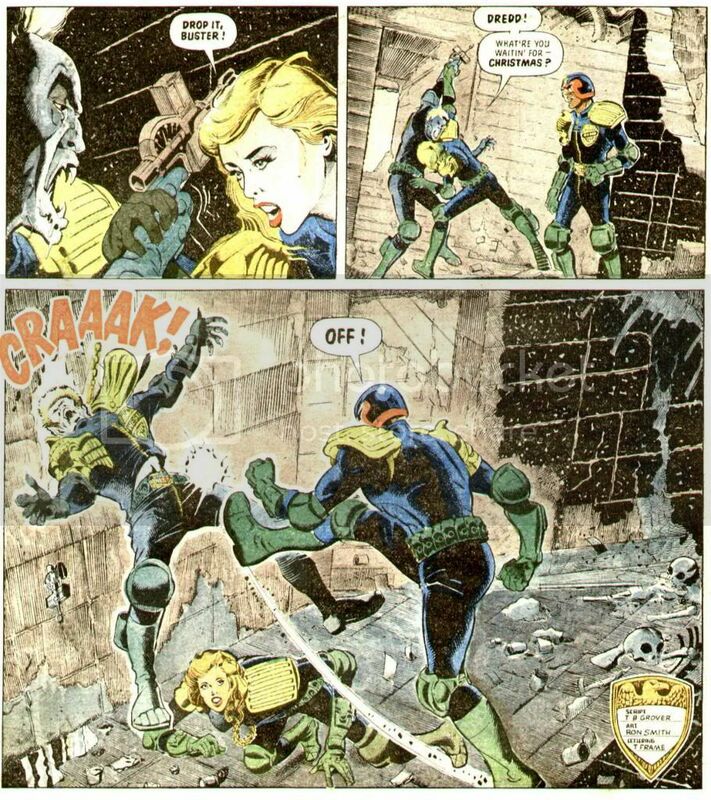 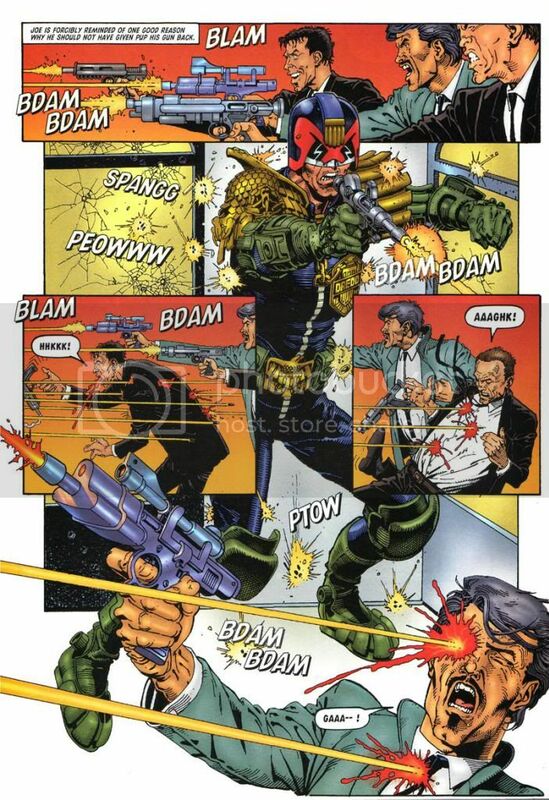 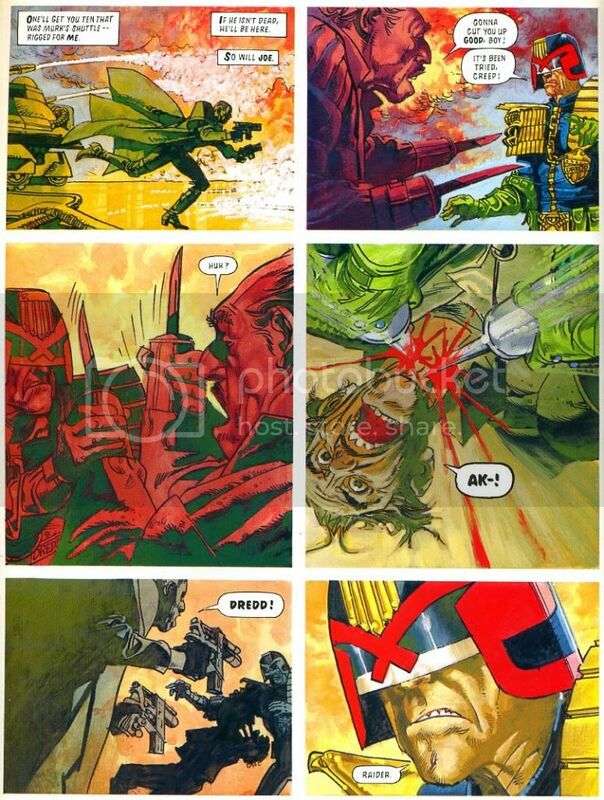 Examples of Dredd dealing with gunshot wounds. 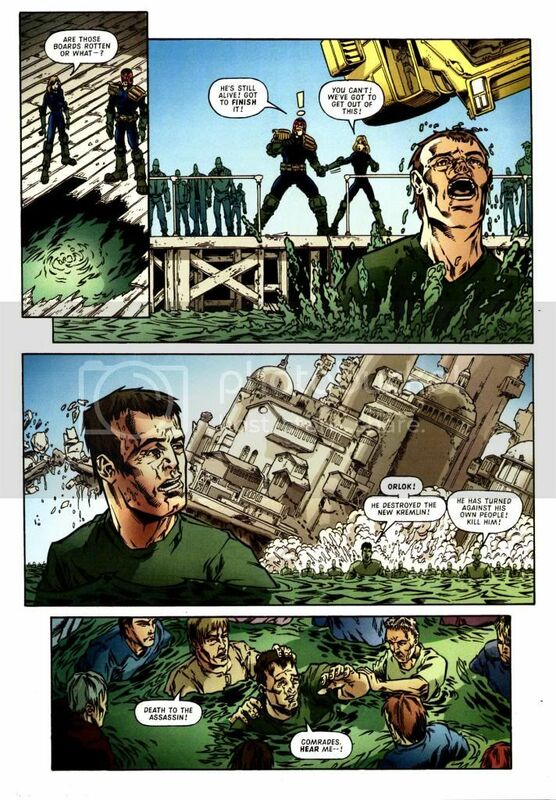 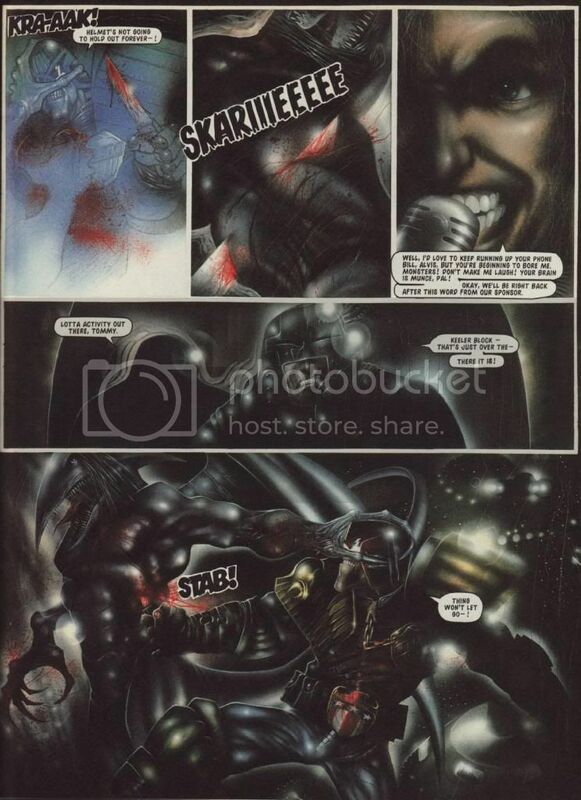 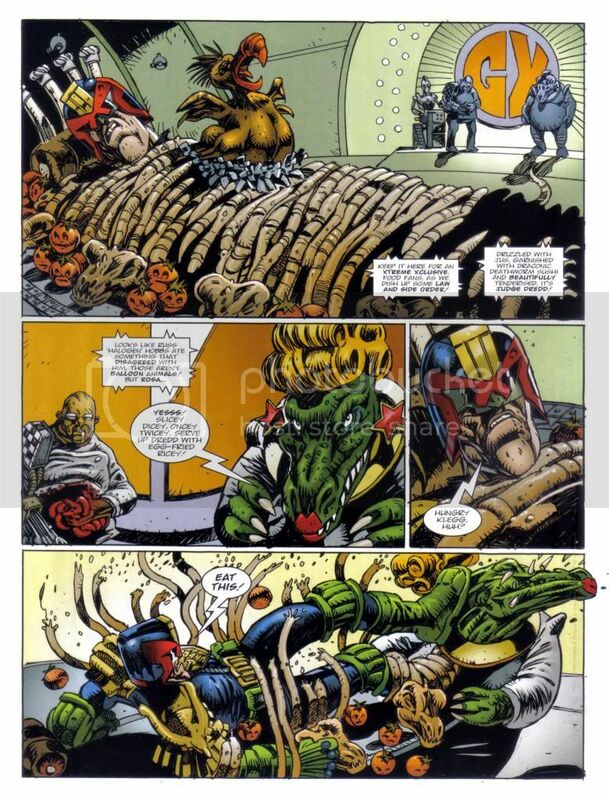 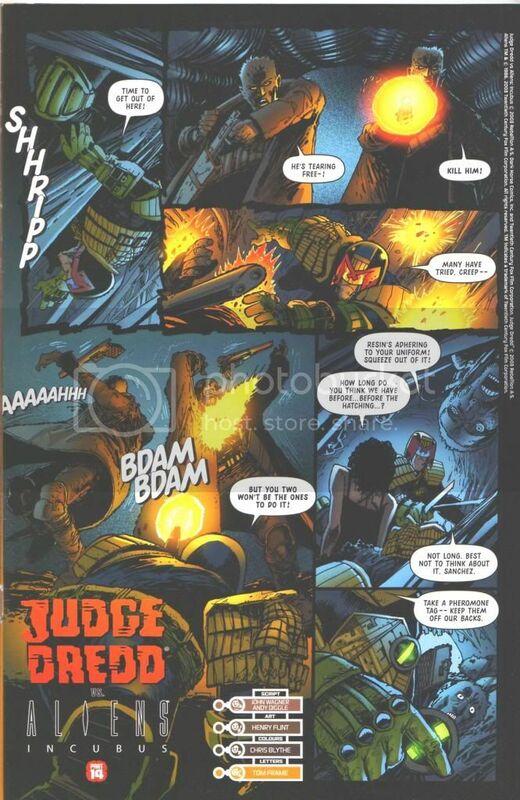 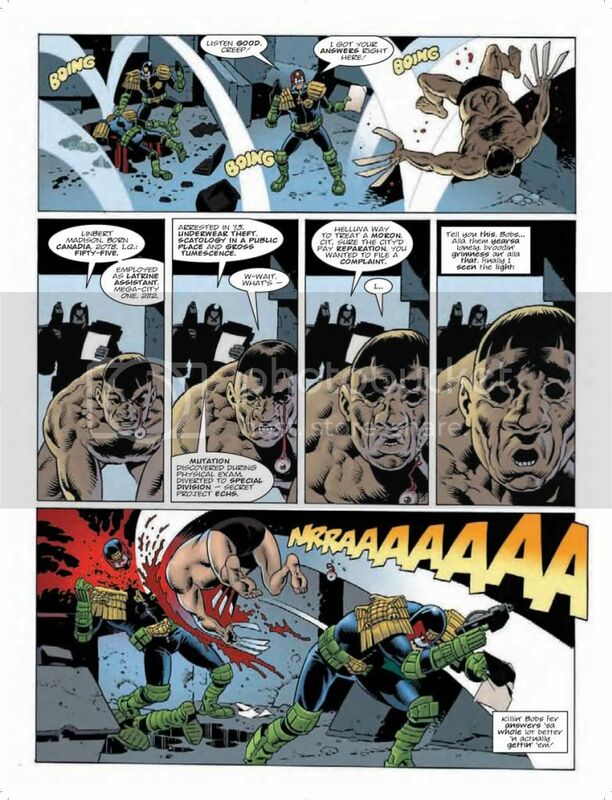 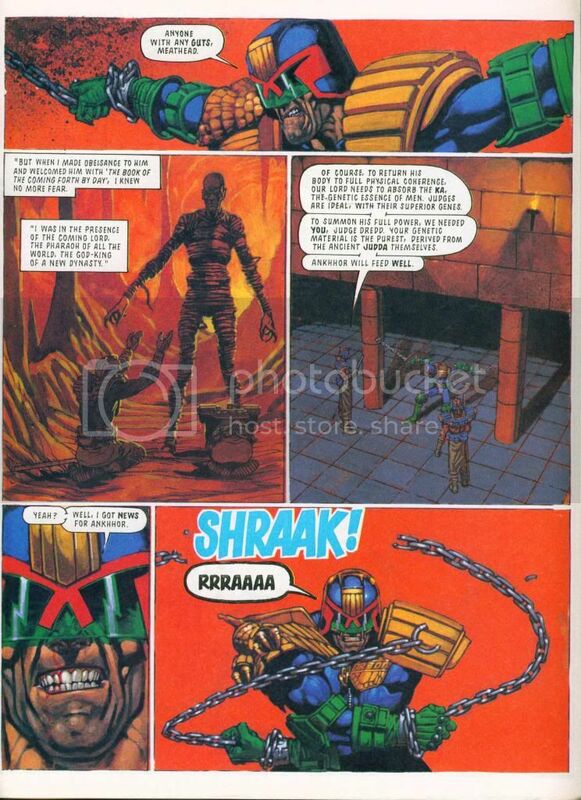 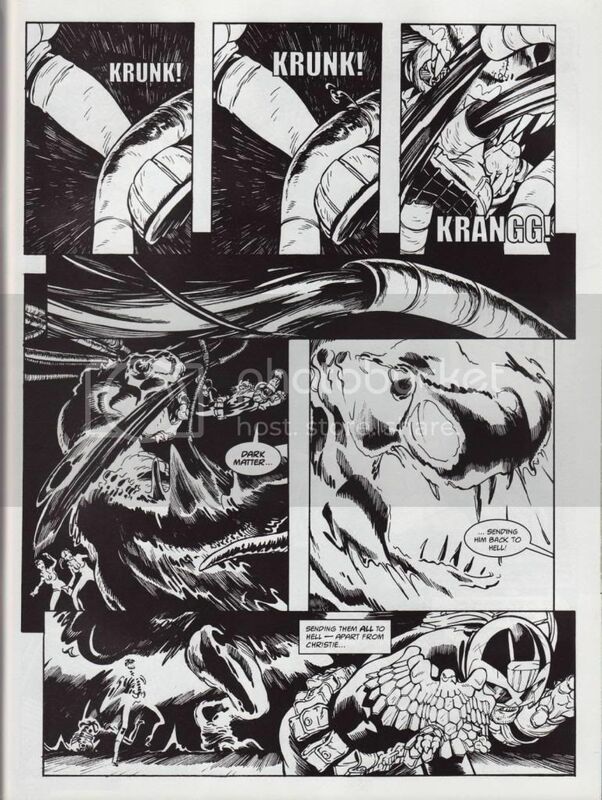 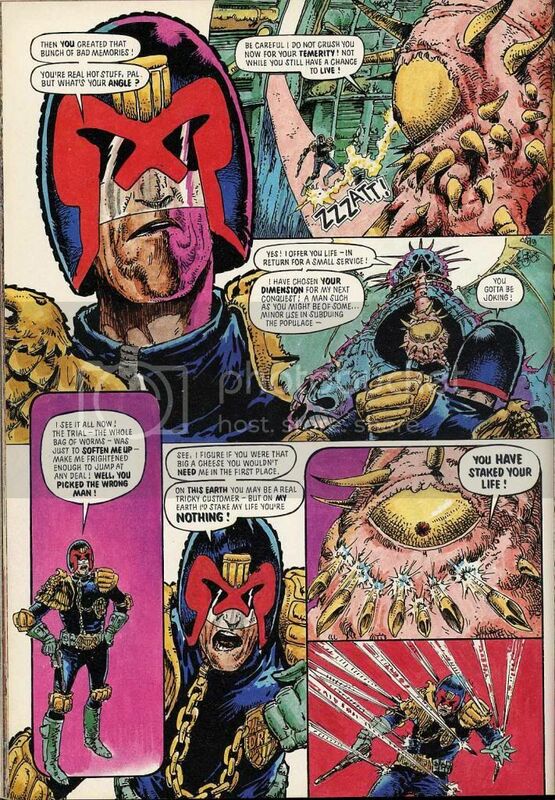 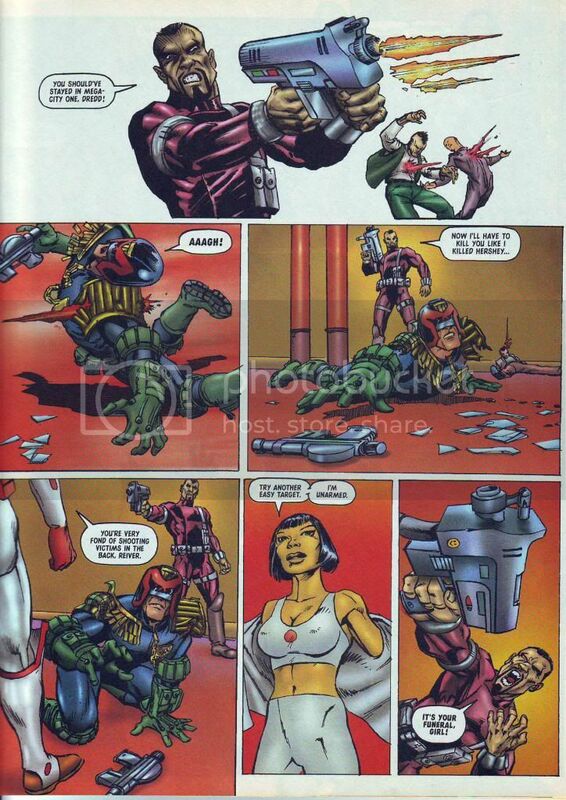 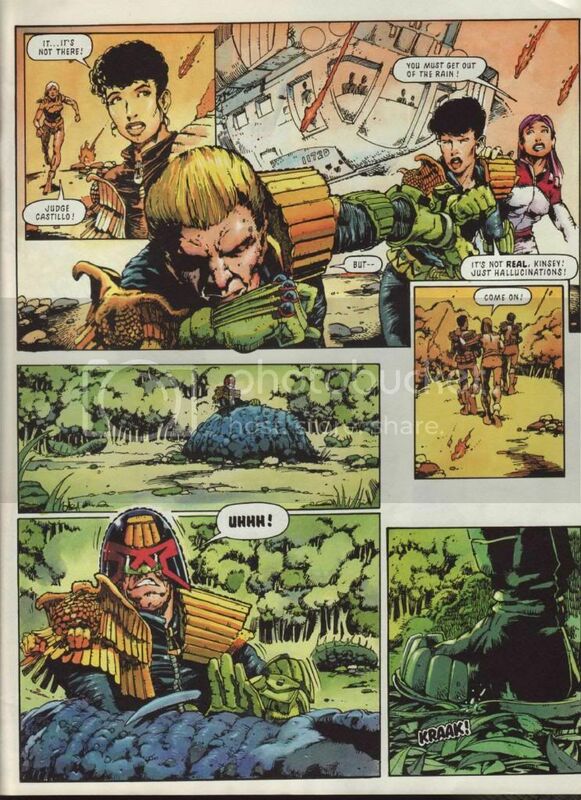 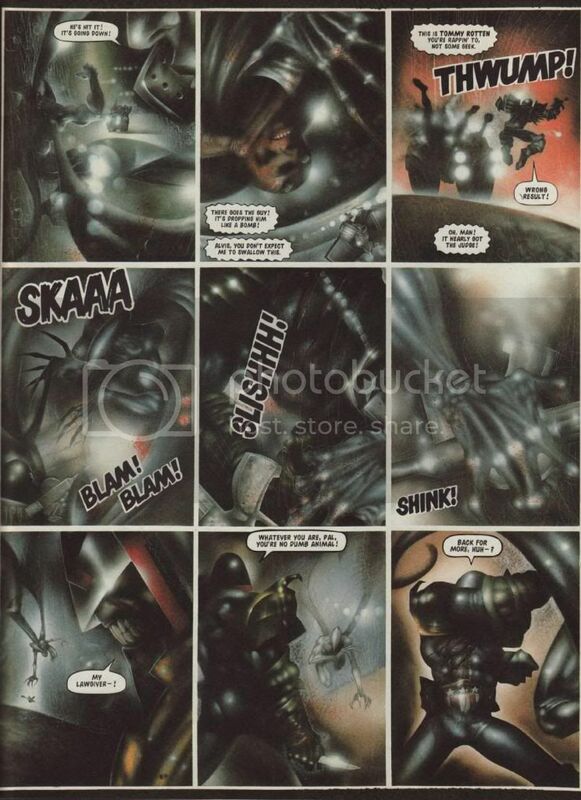 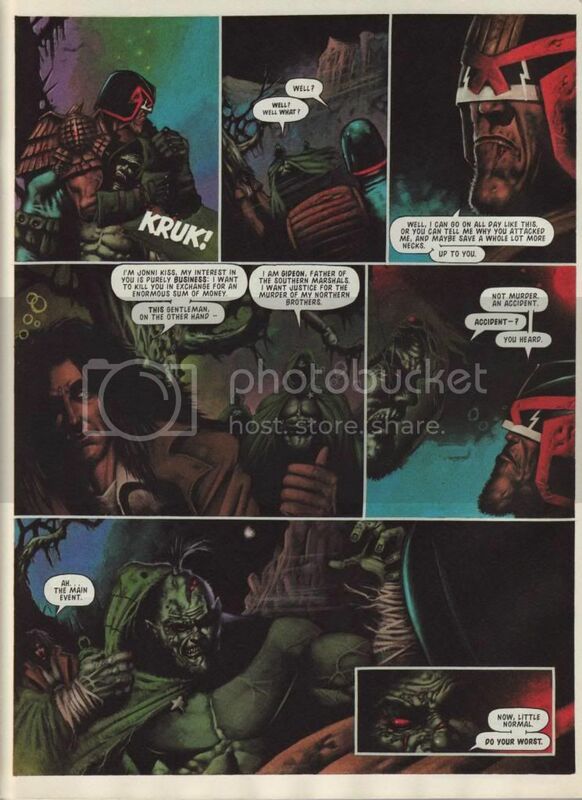 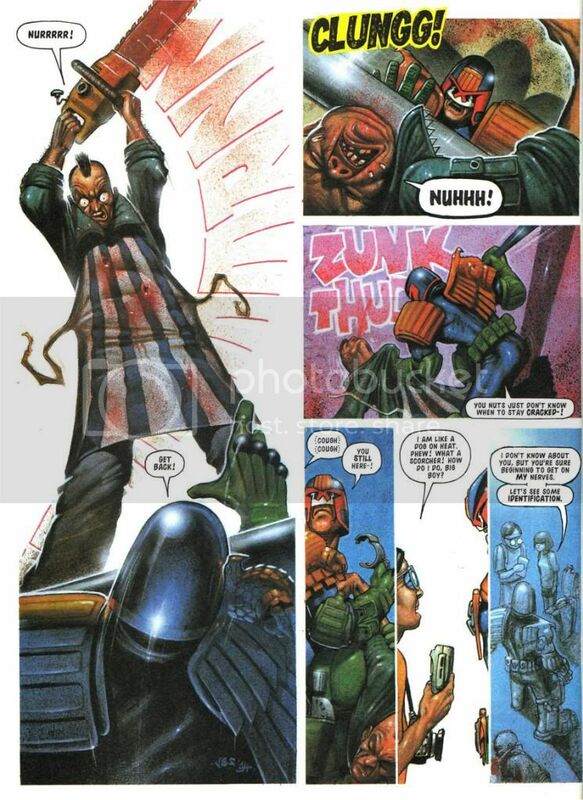 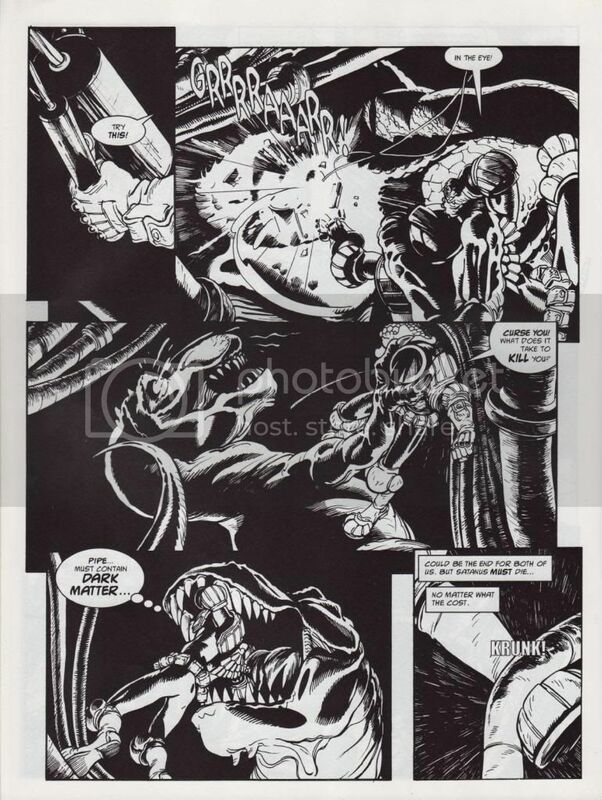 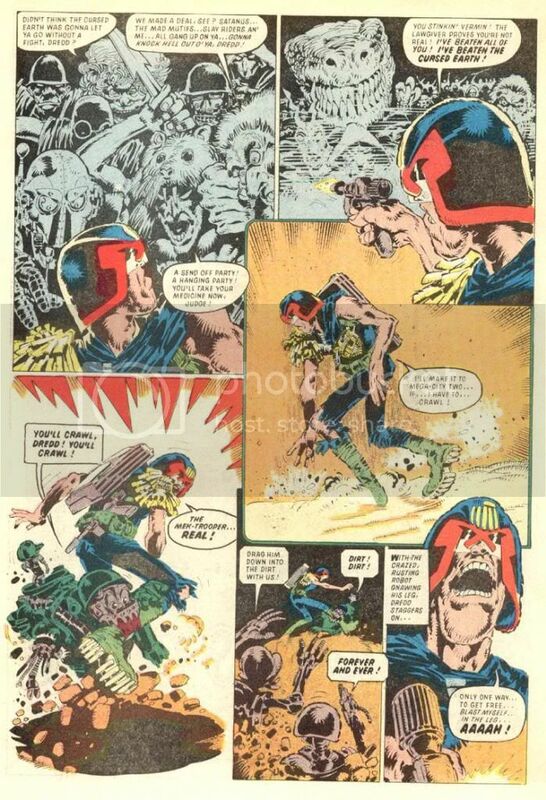 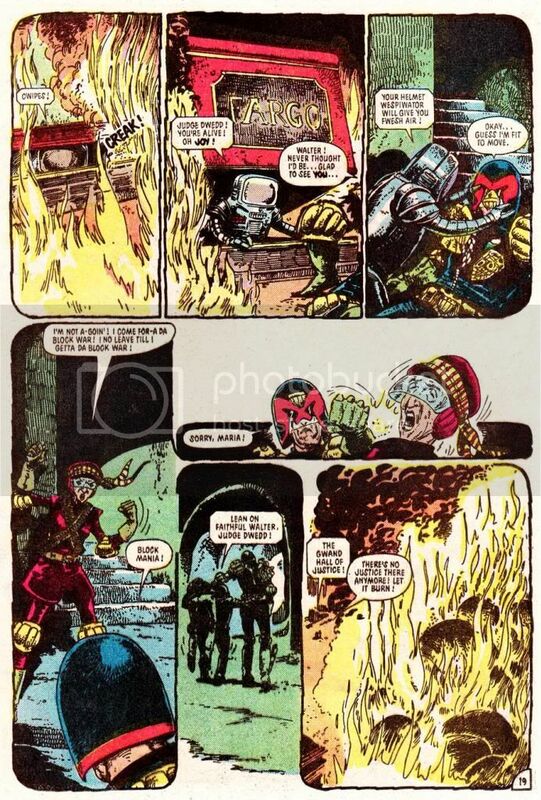 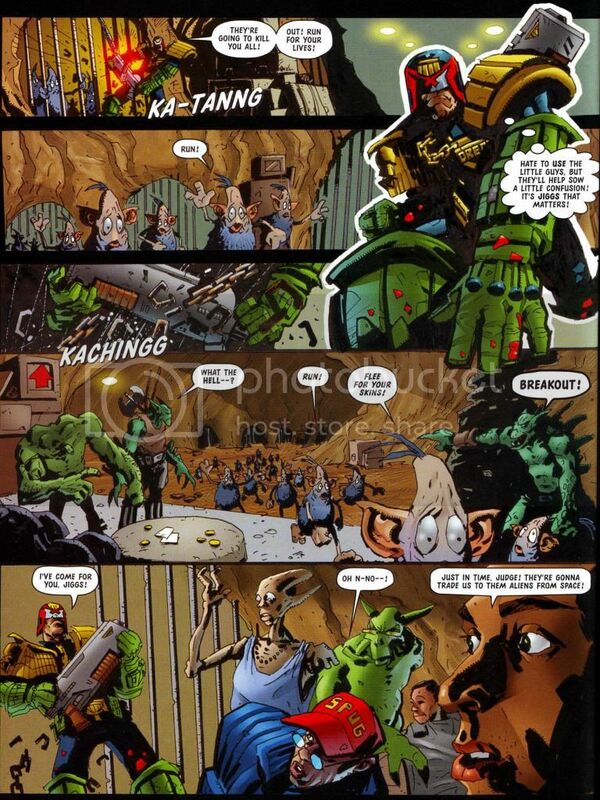 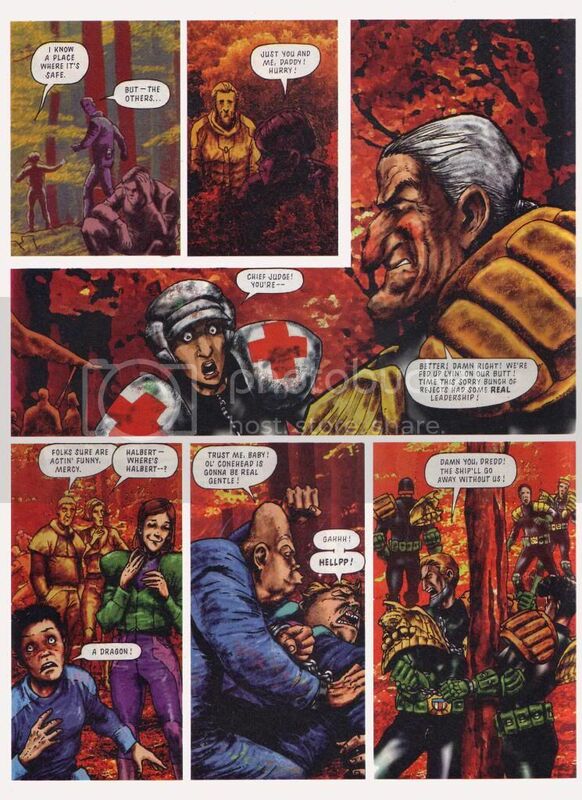 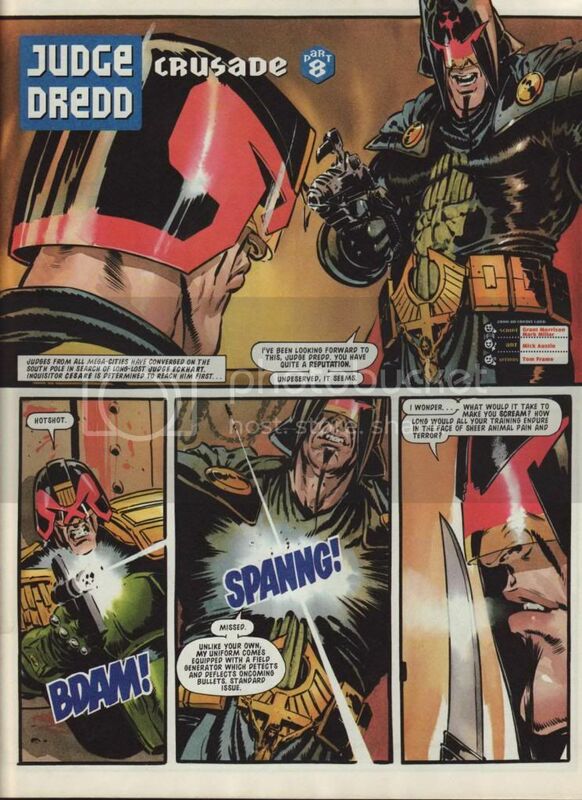 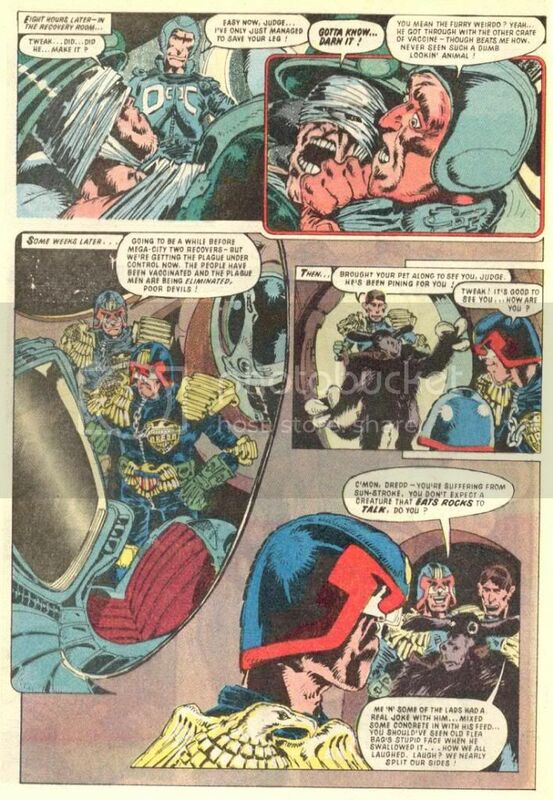 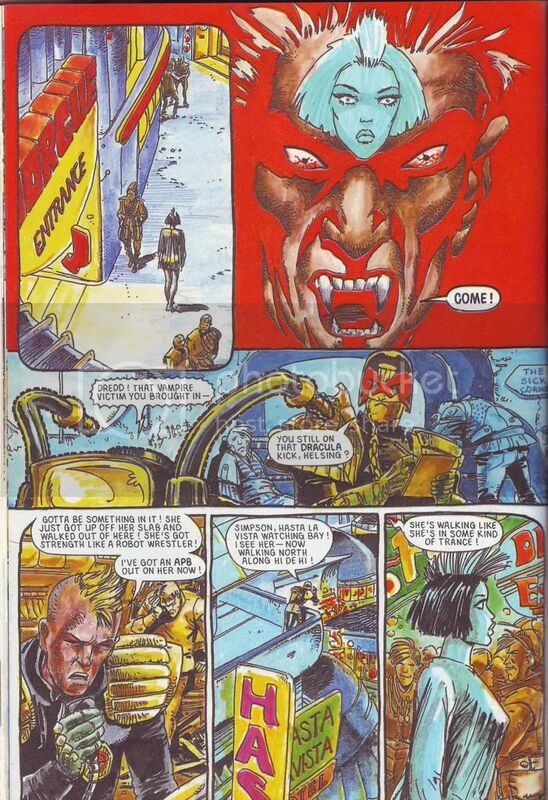 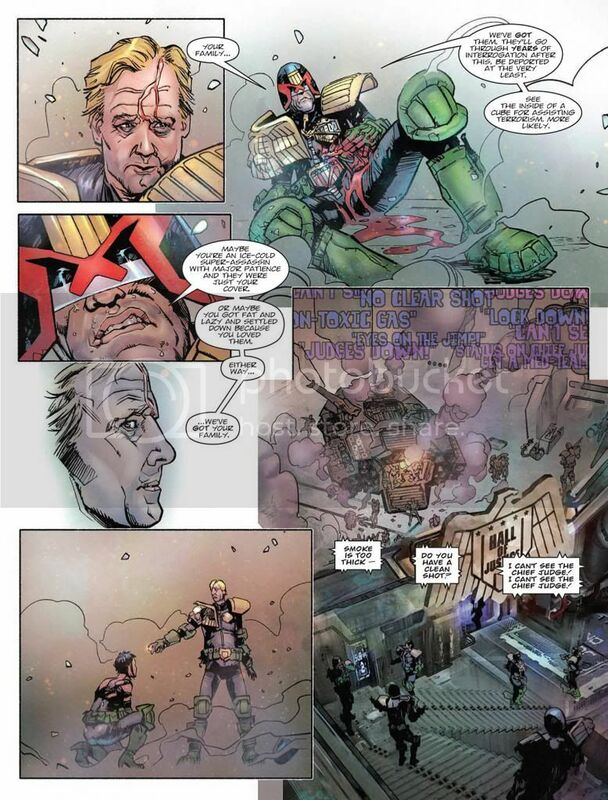 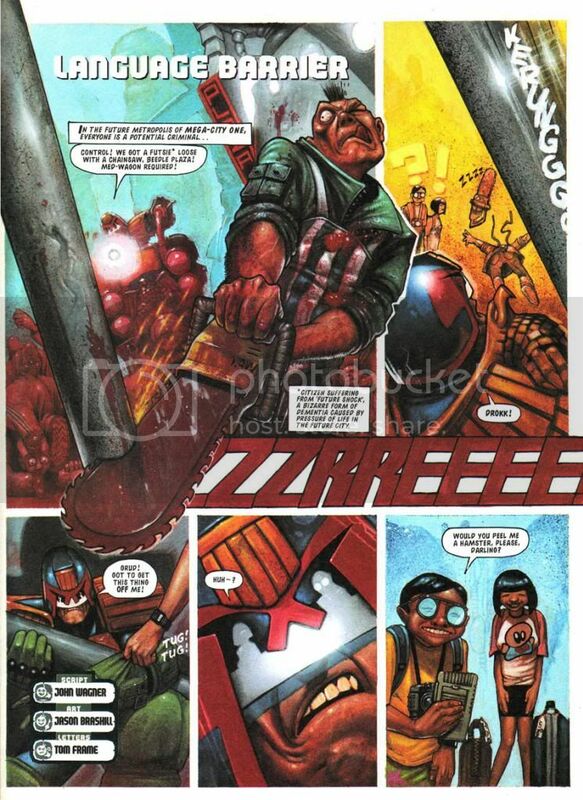 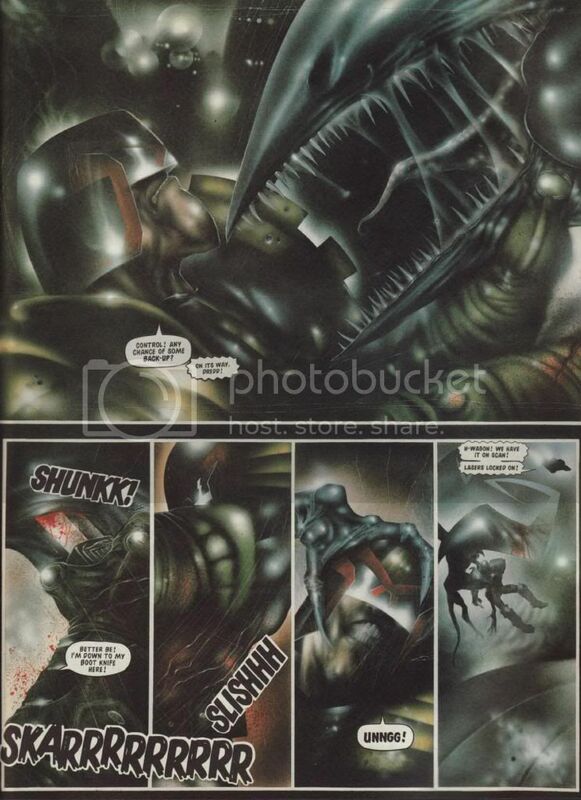 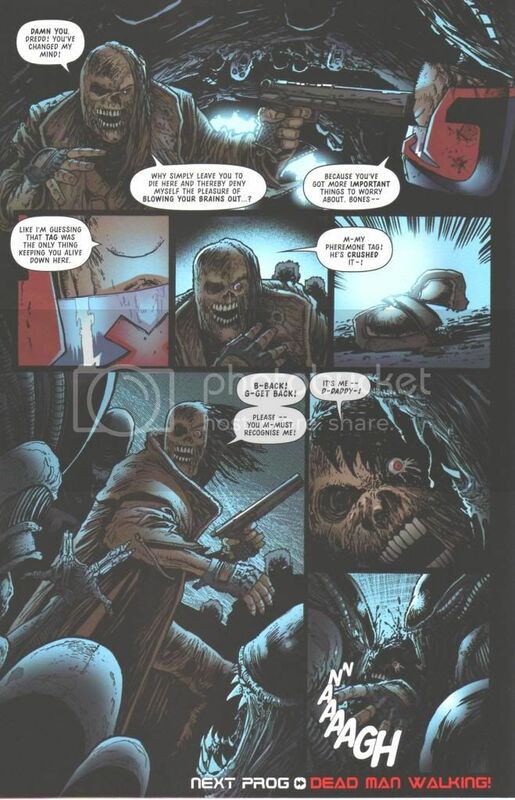 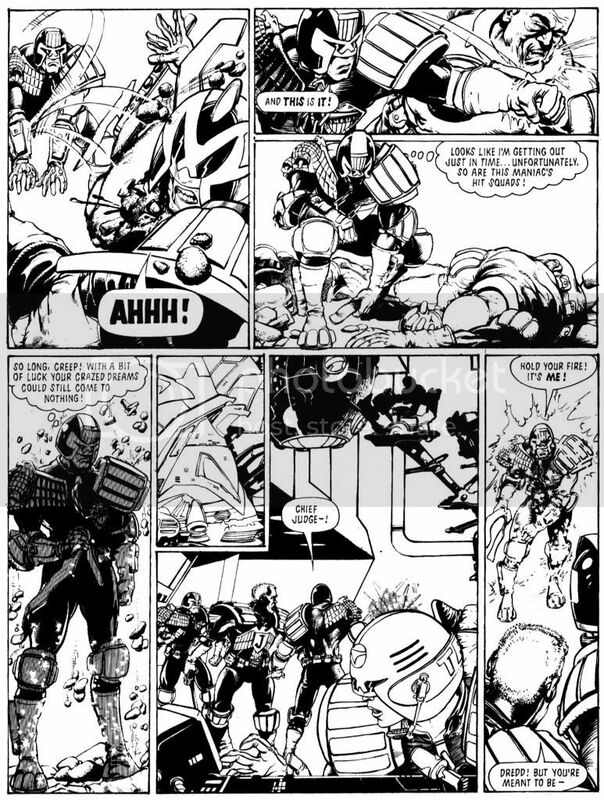 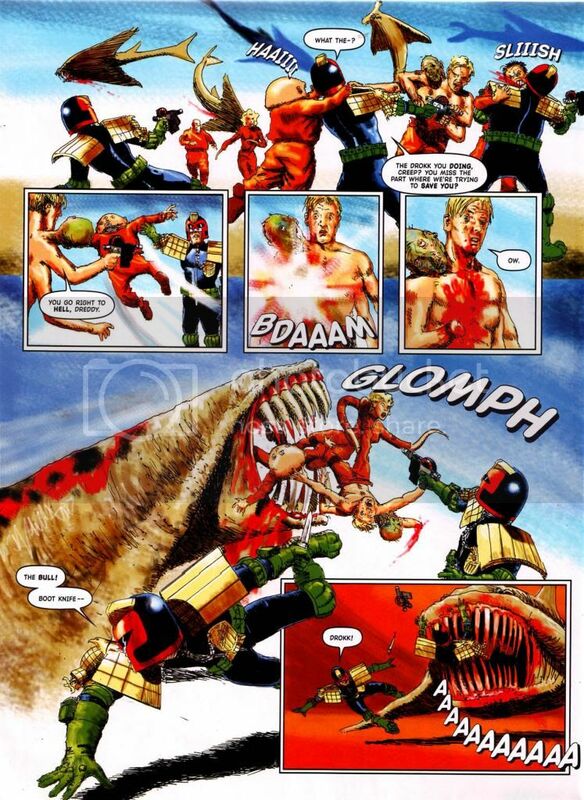 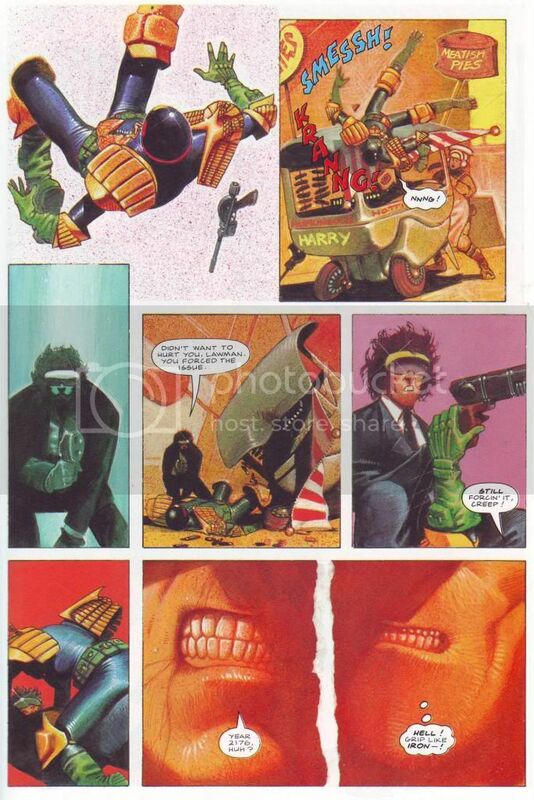 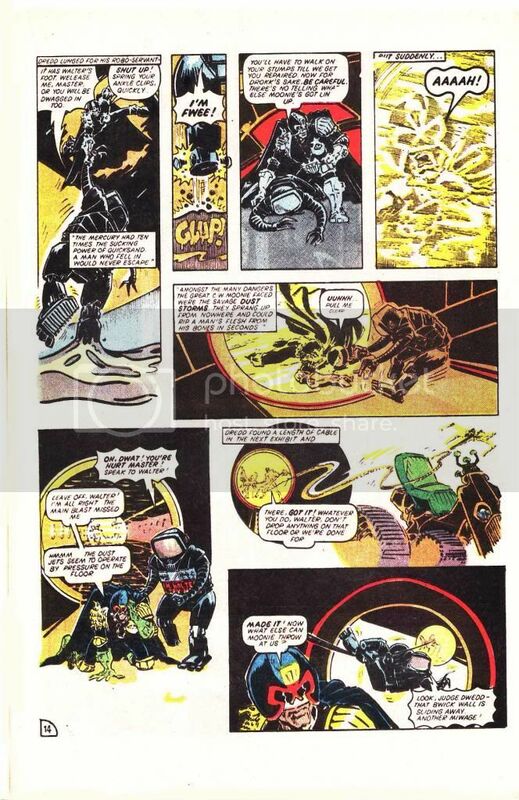 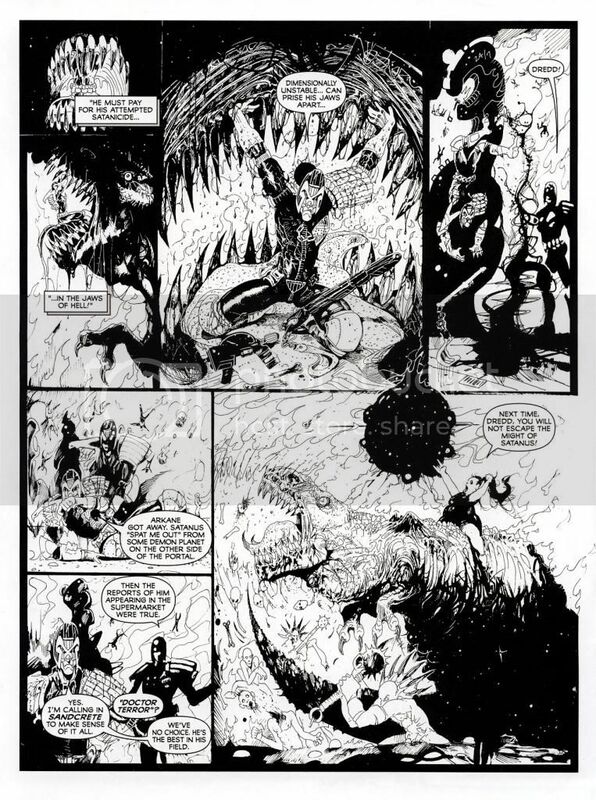 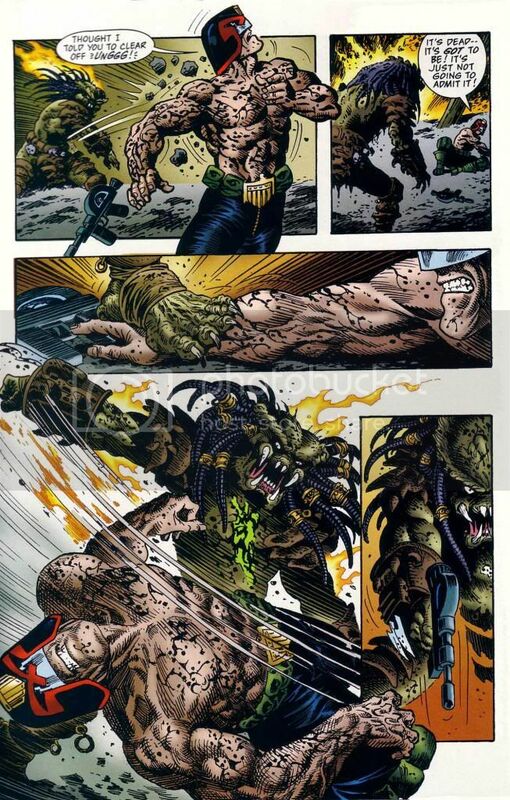 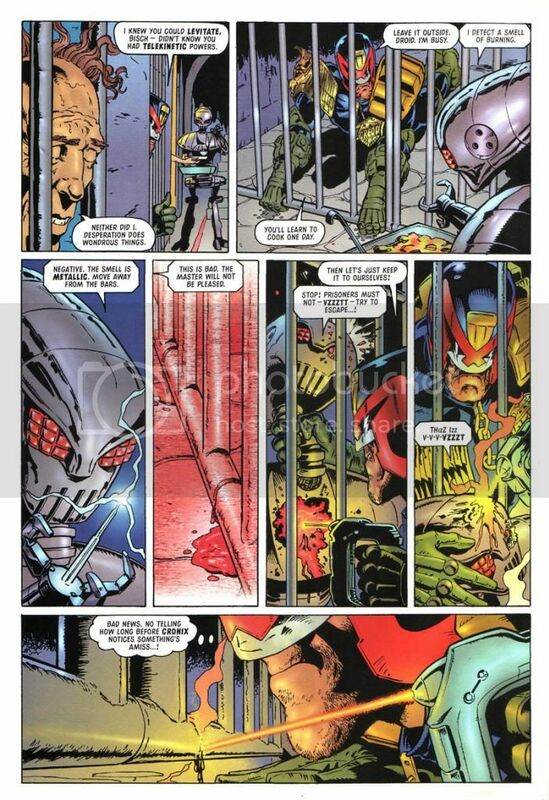 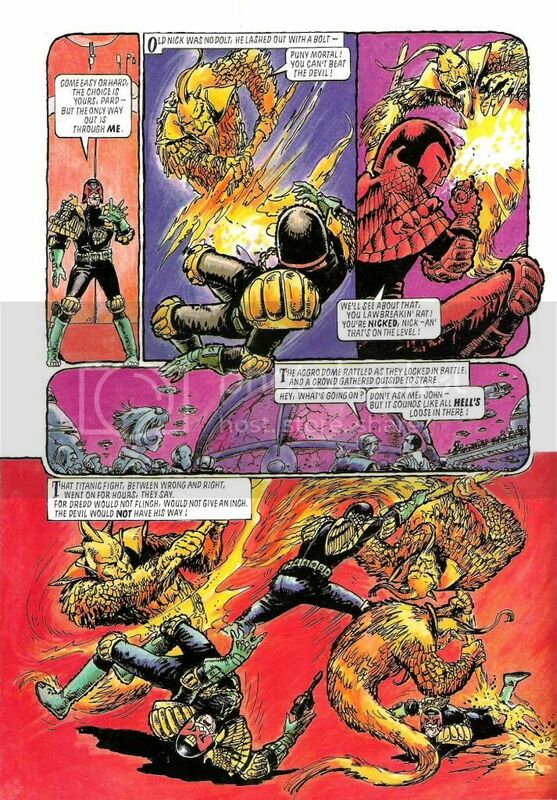 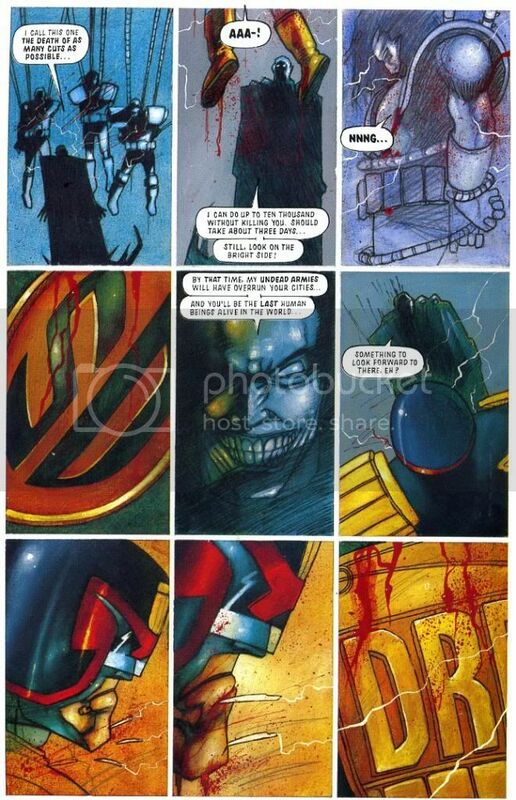 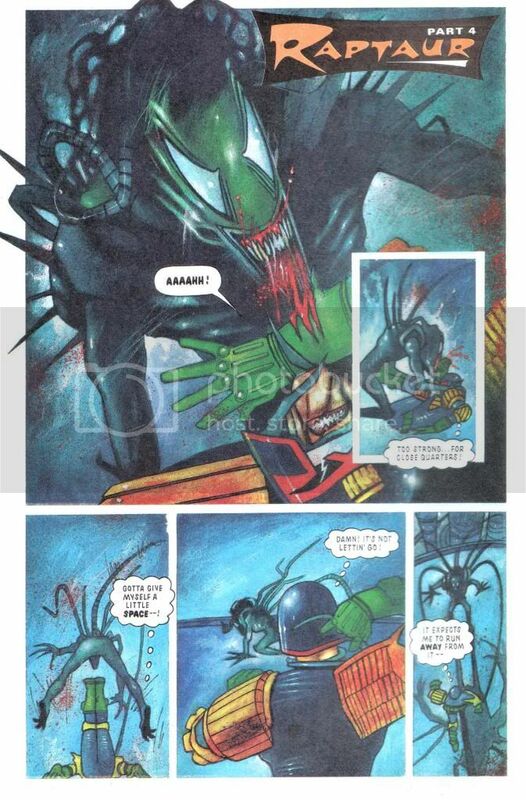 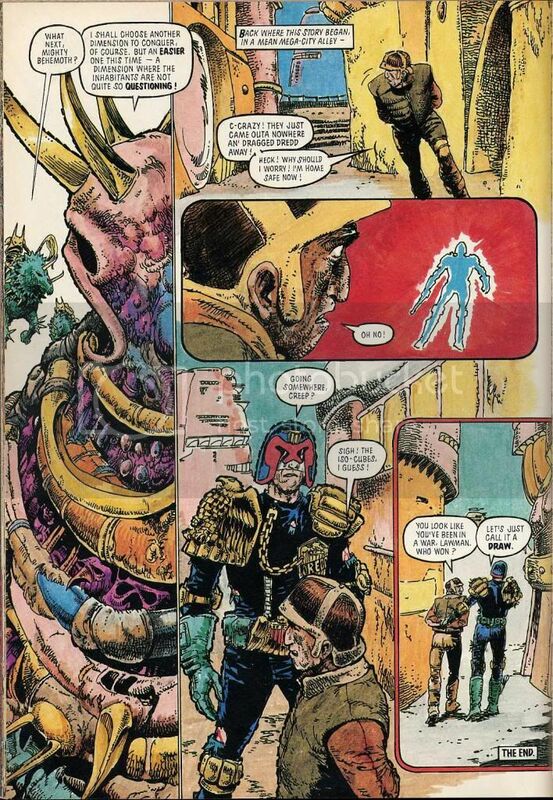 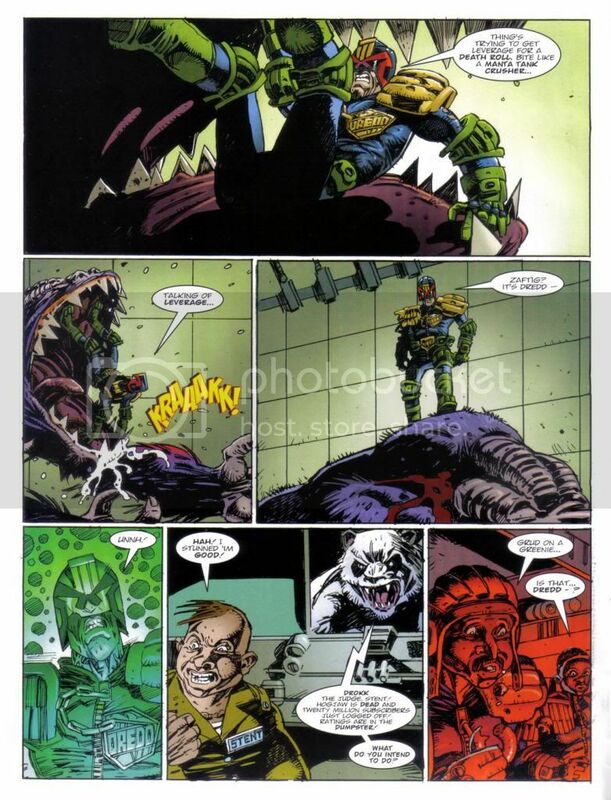 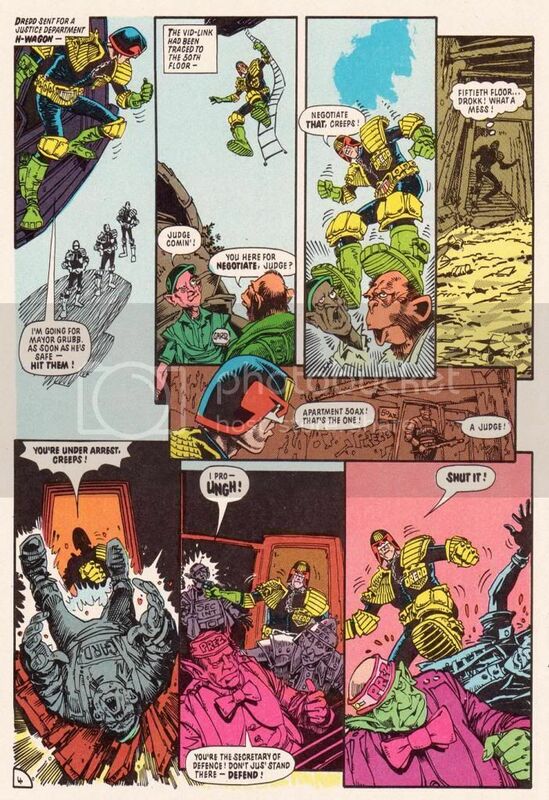 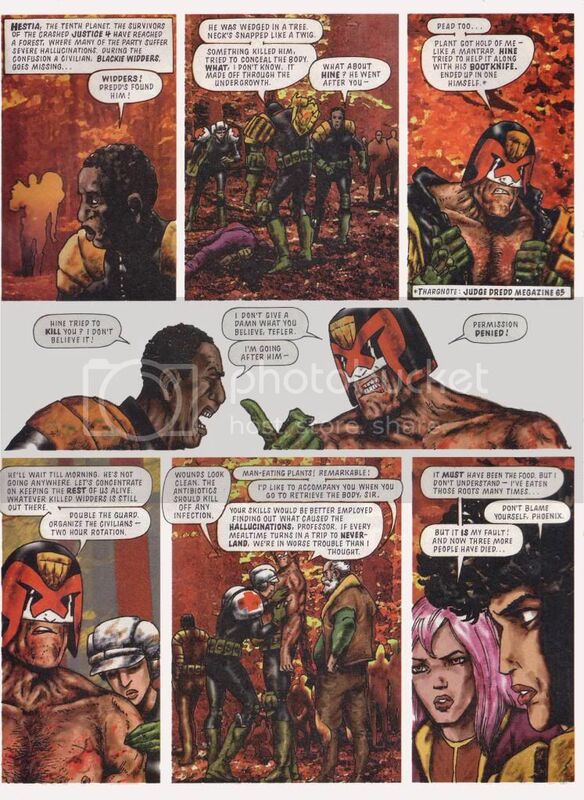 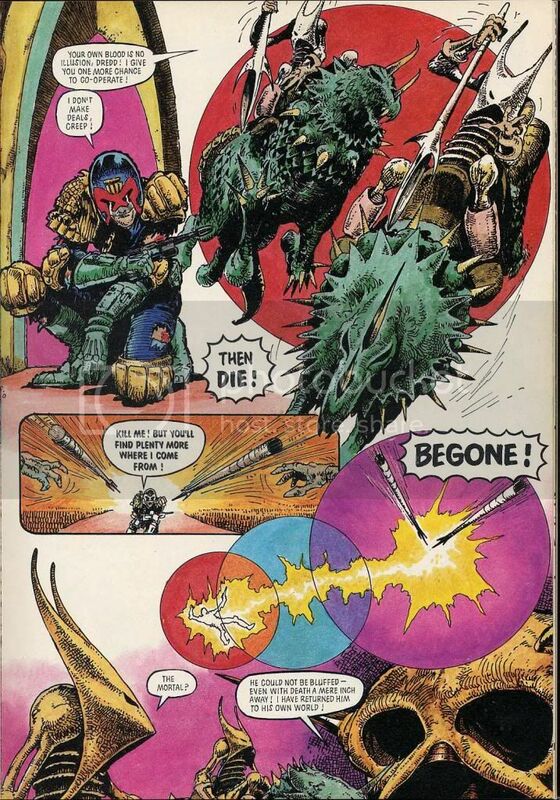 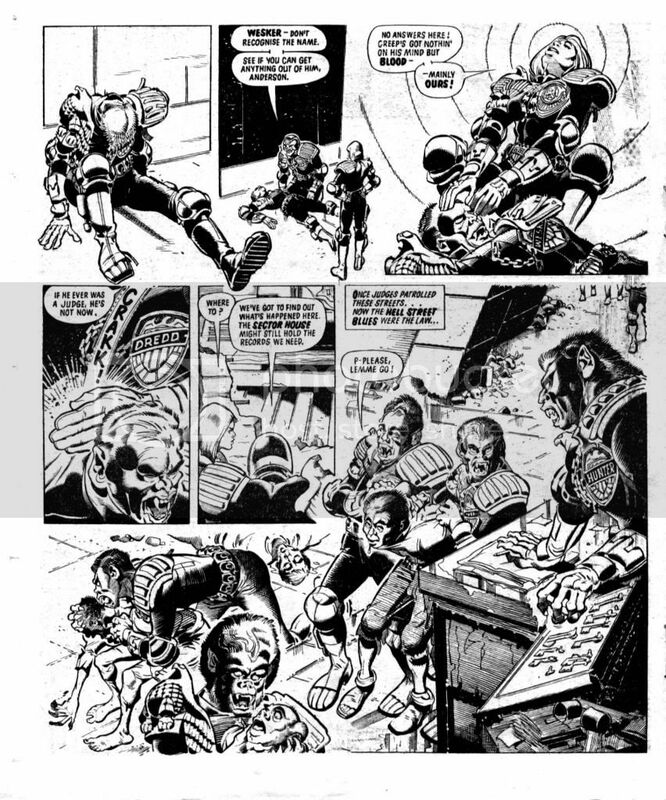 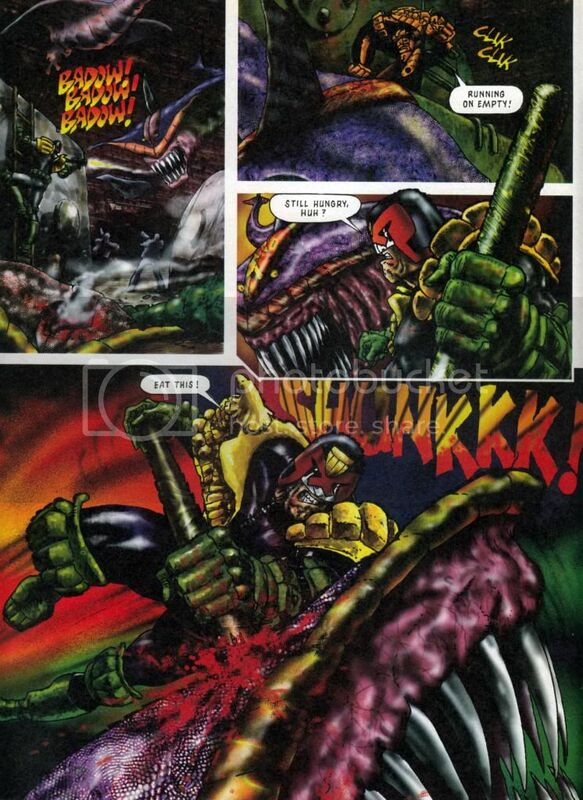 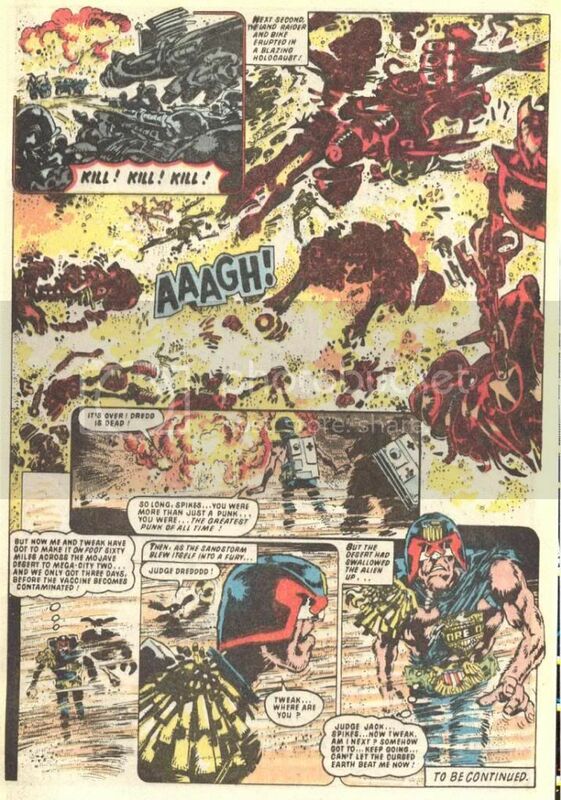 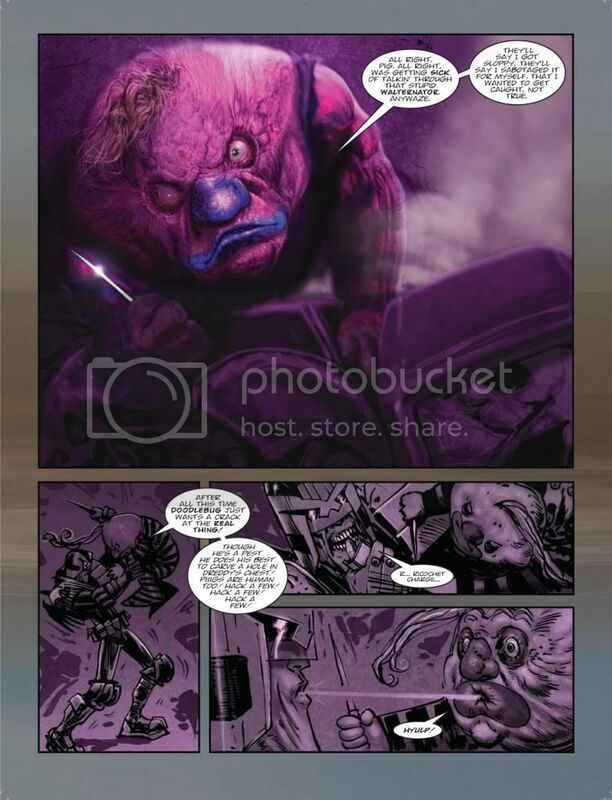 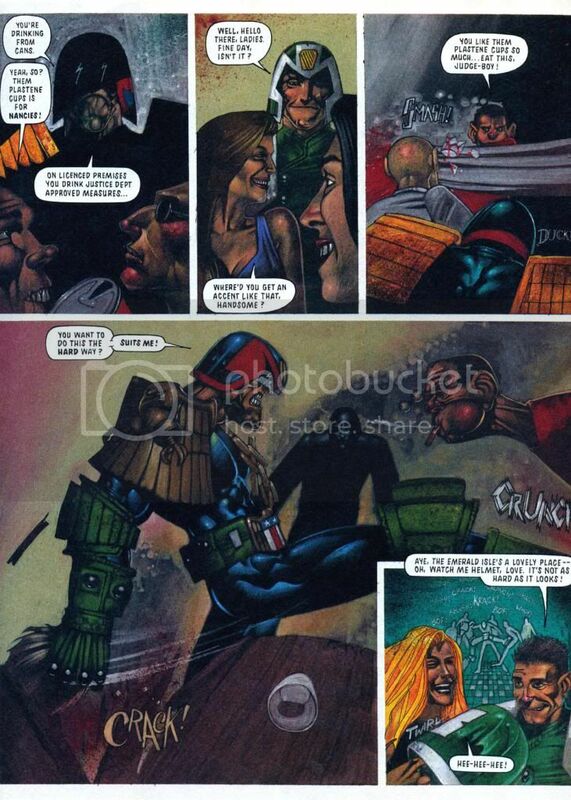 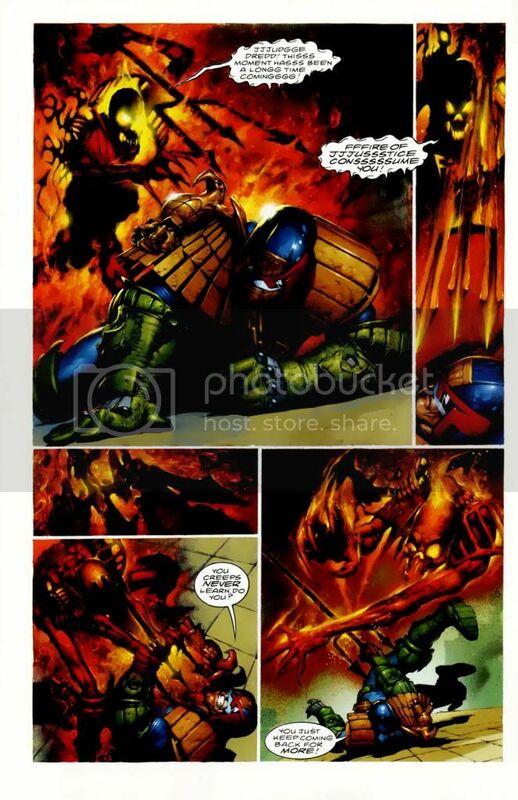 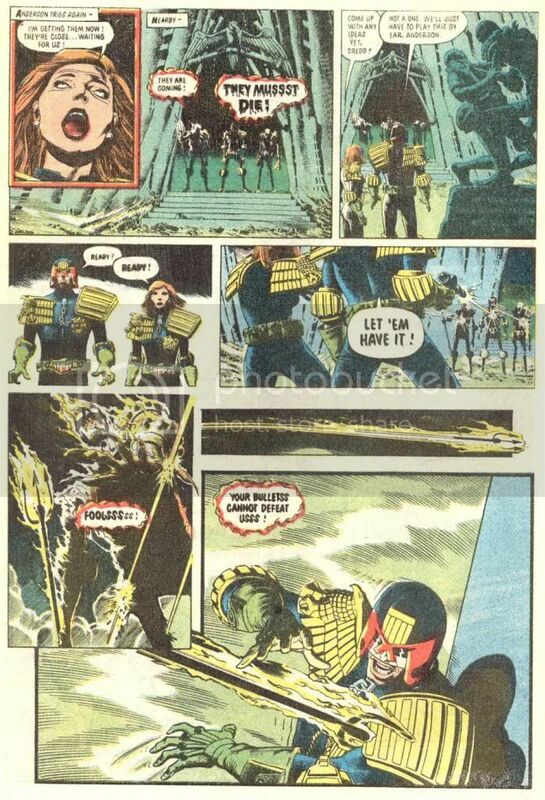 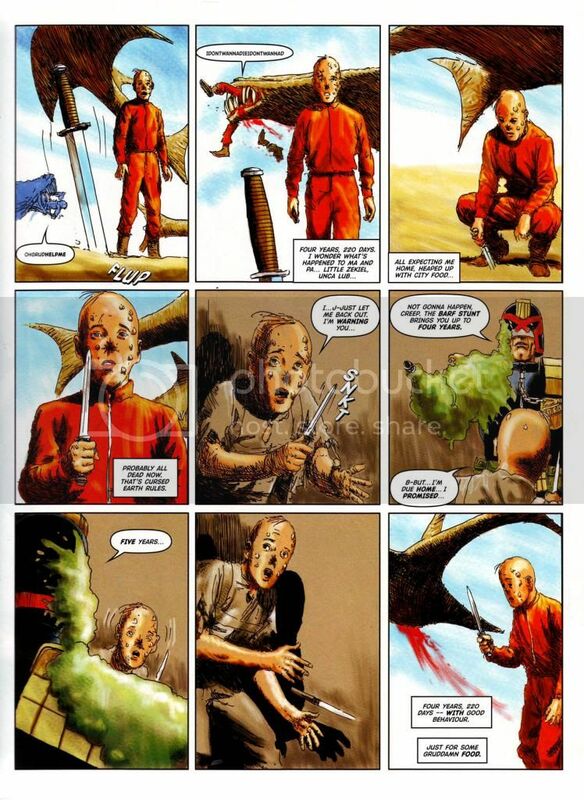 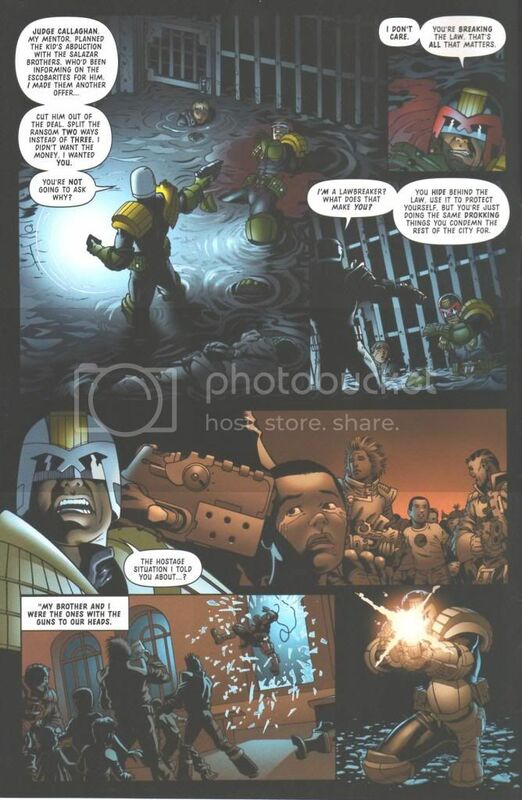 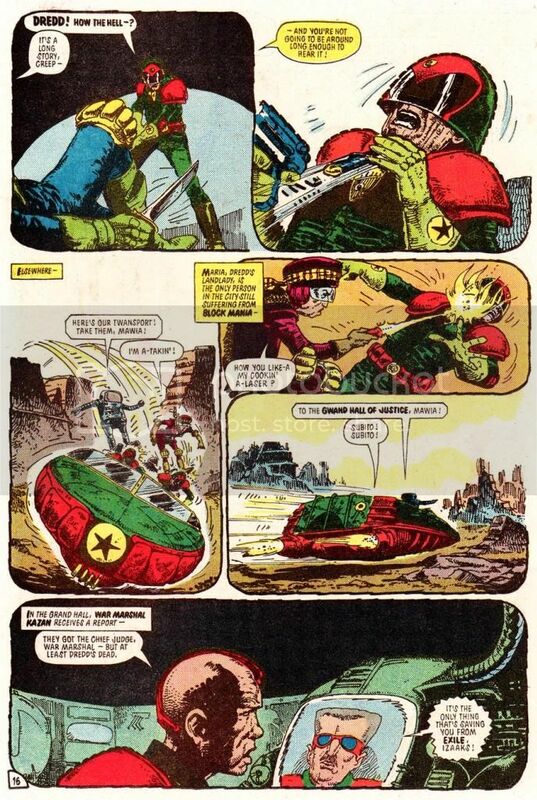 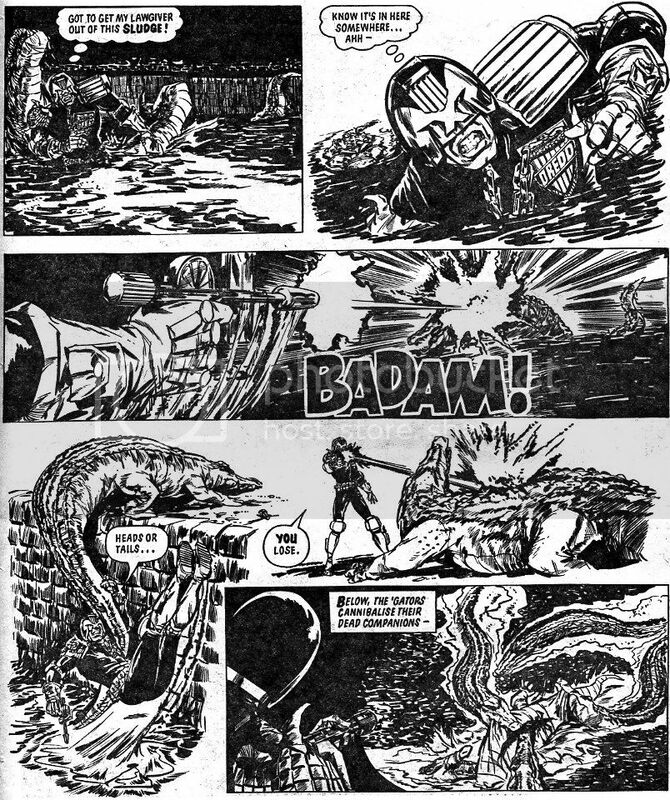 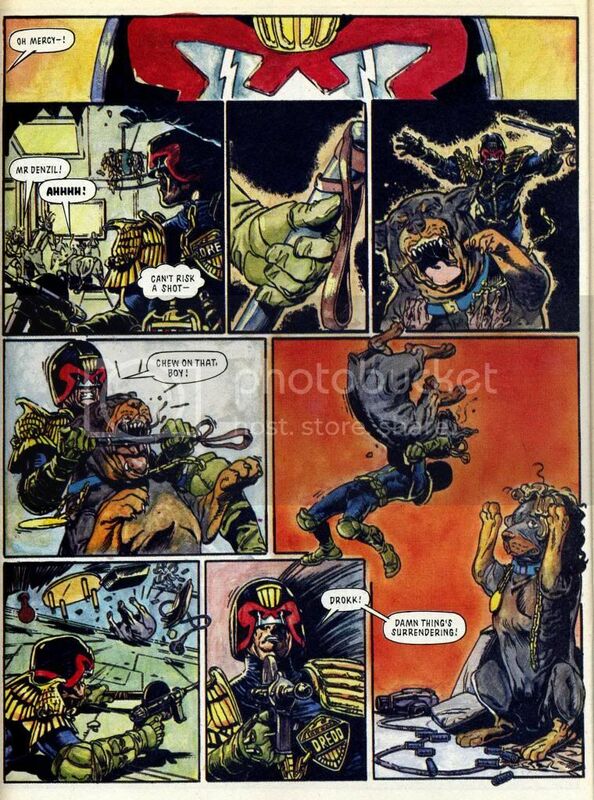 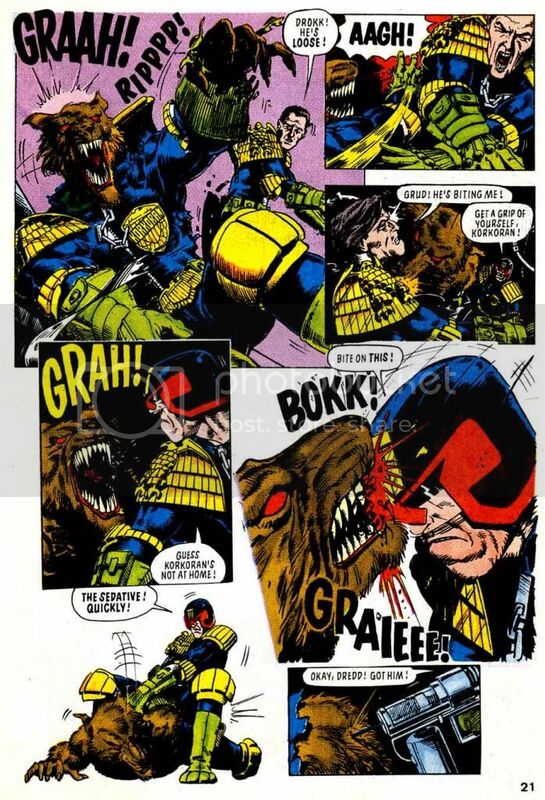 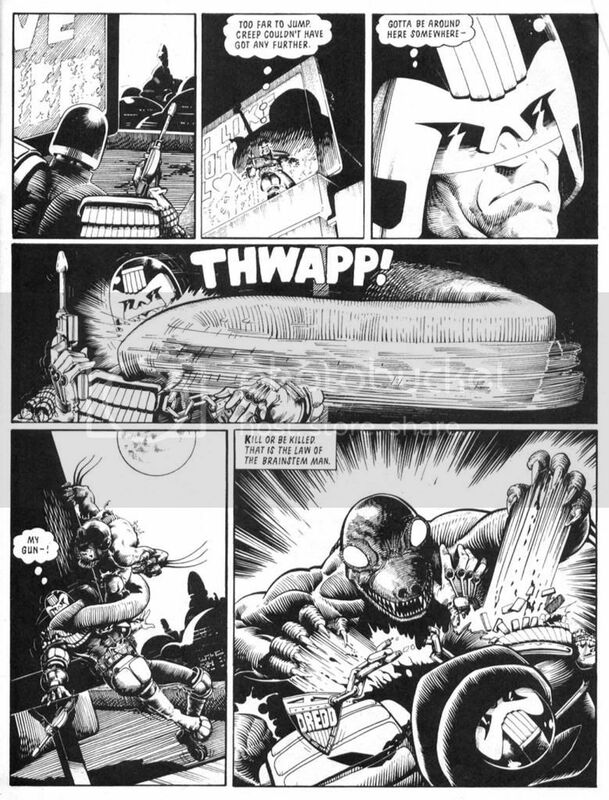 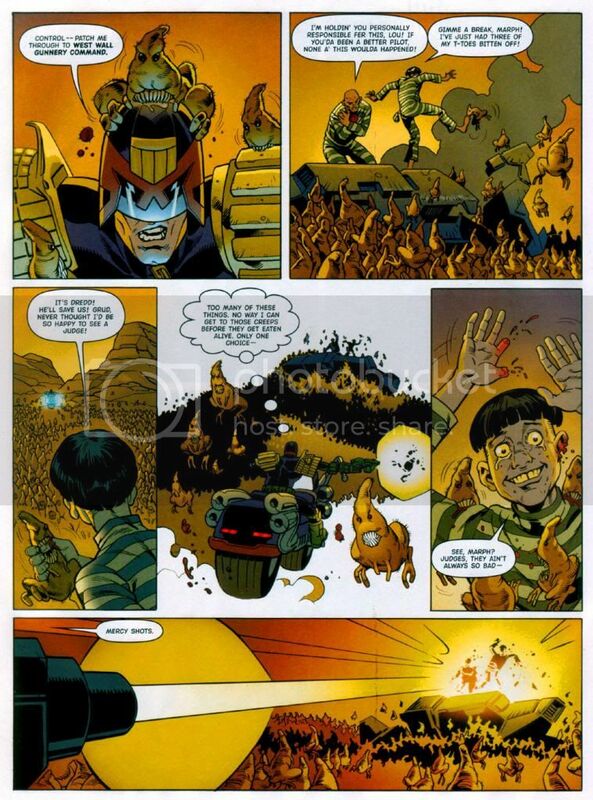 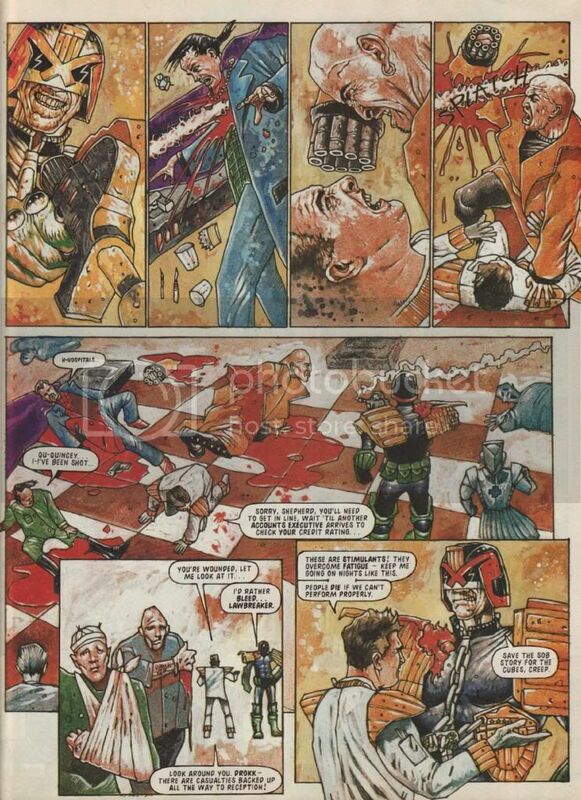 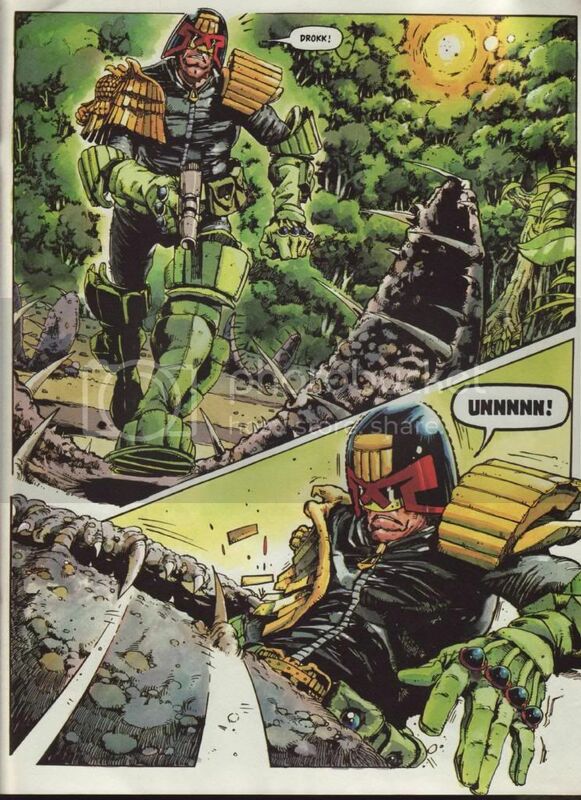 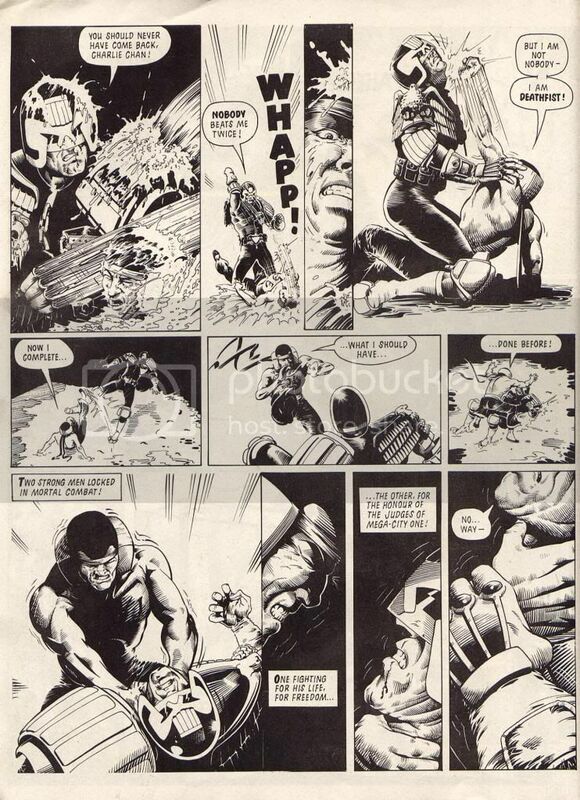 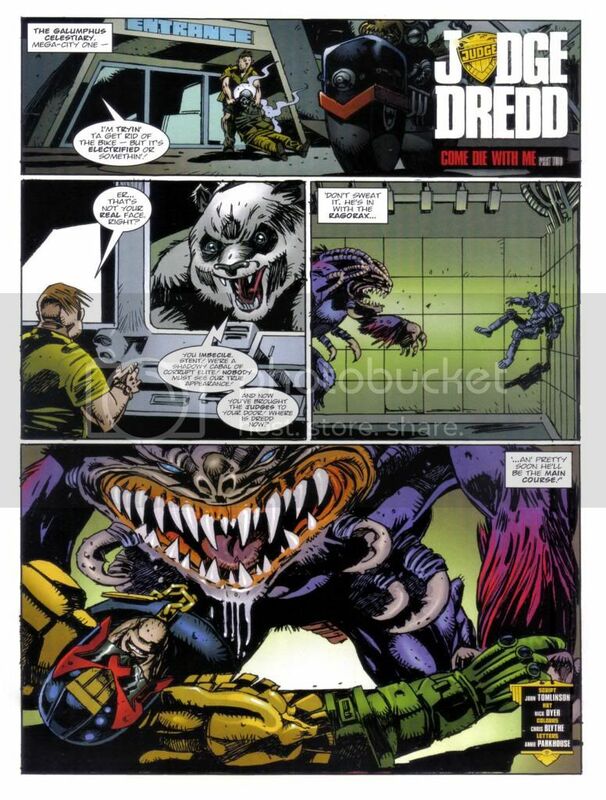 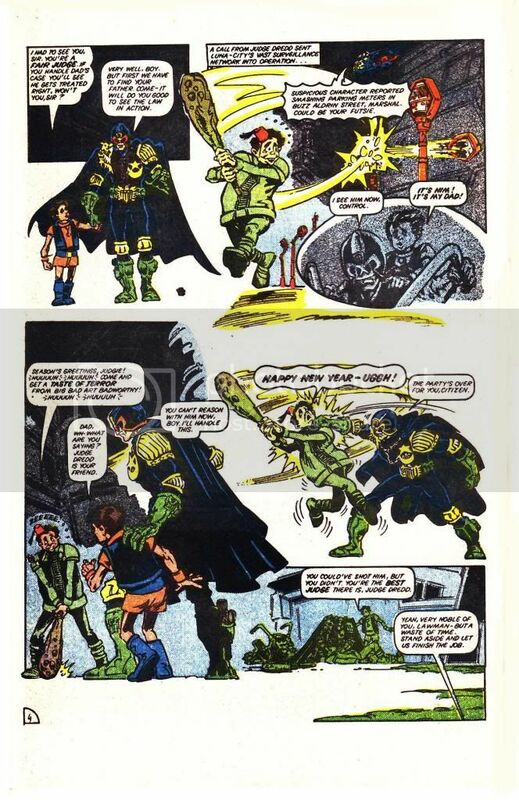 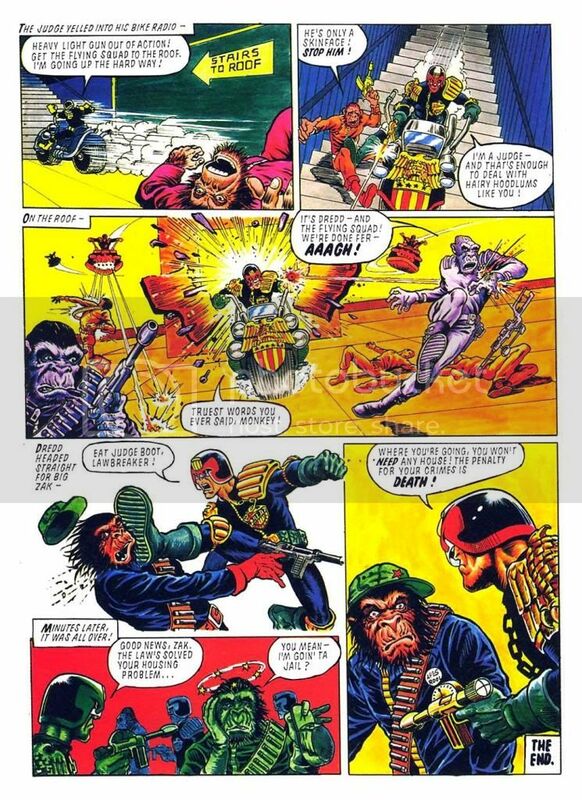 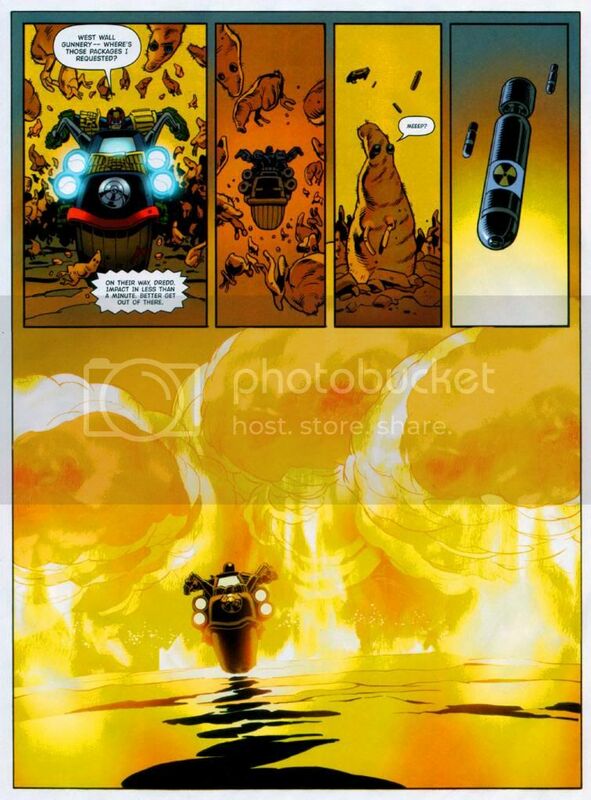 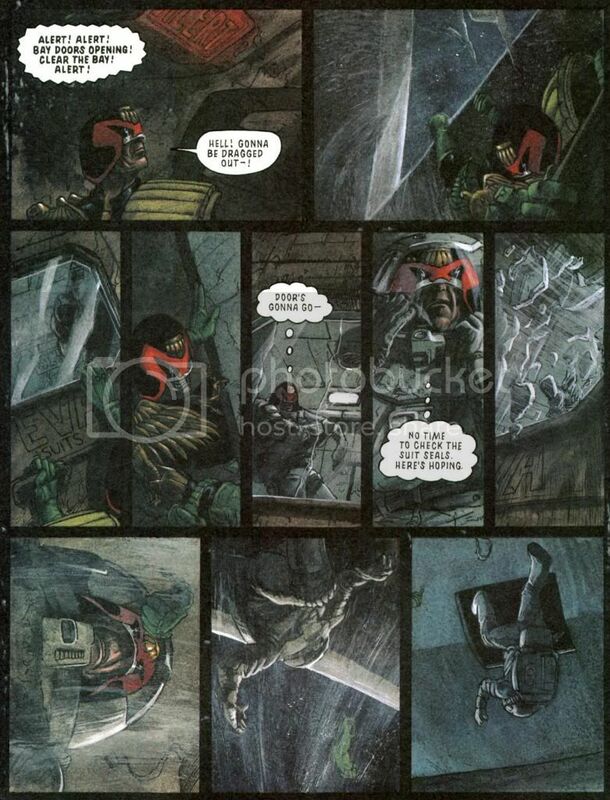 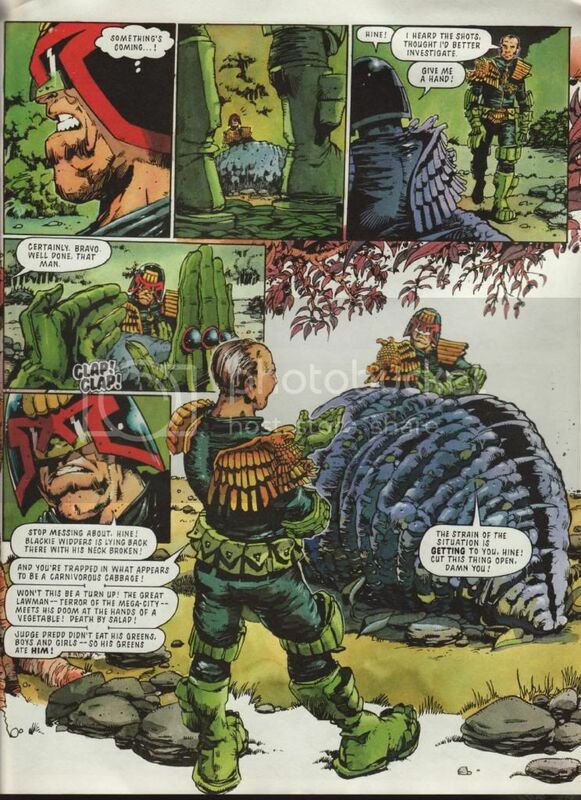 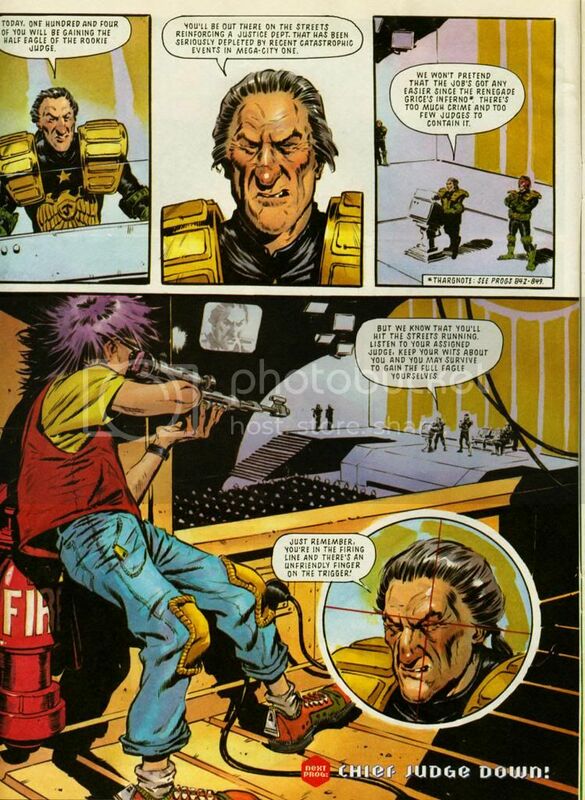 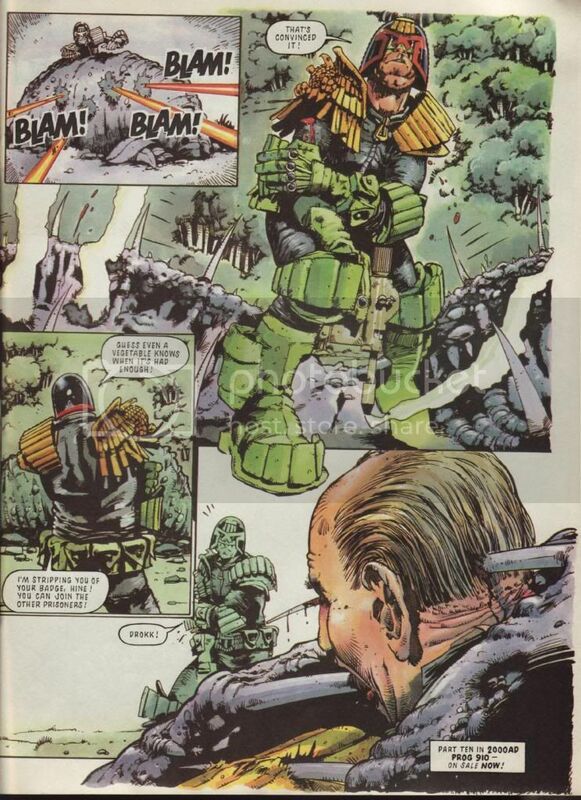 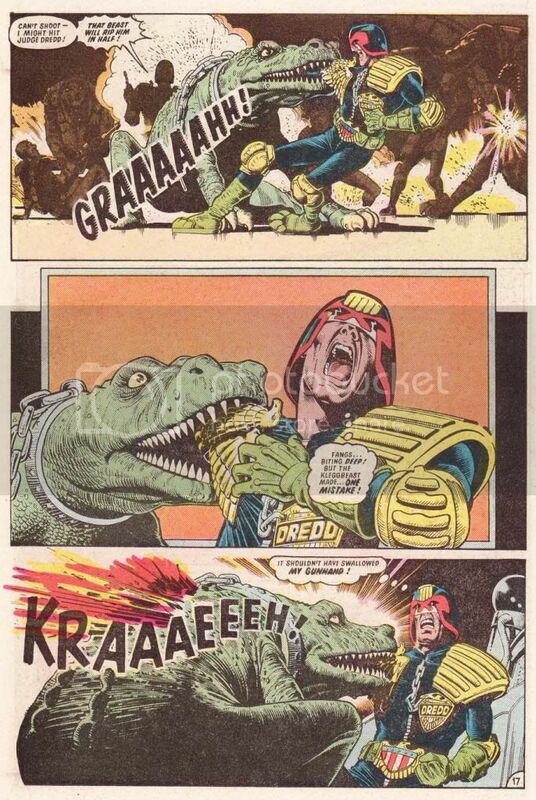 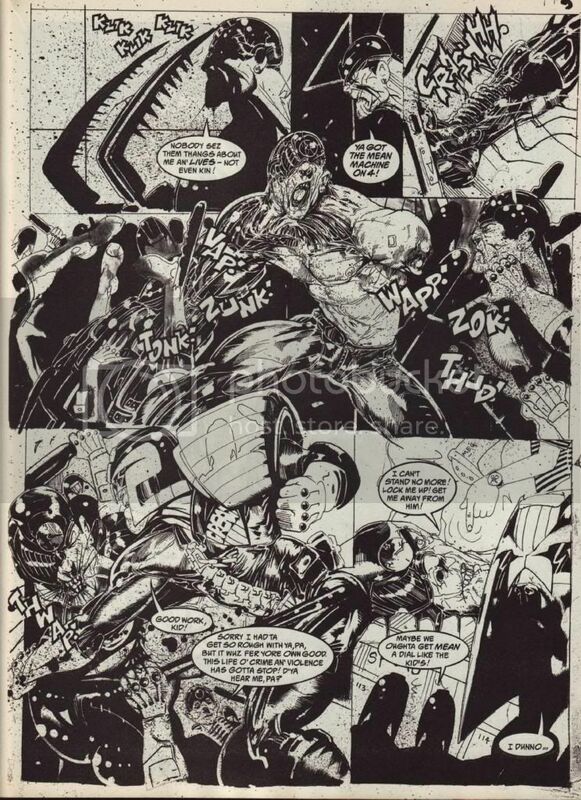 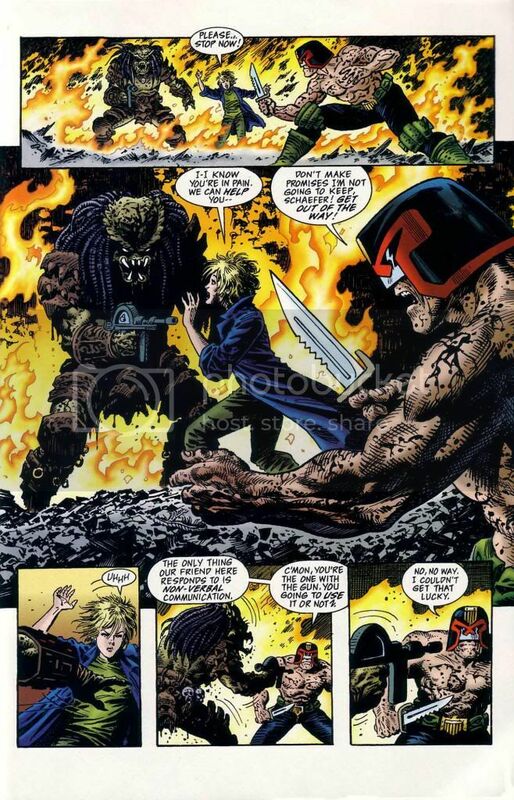 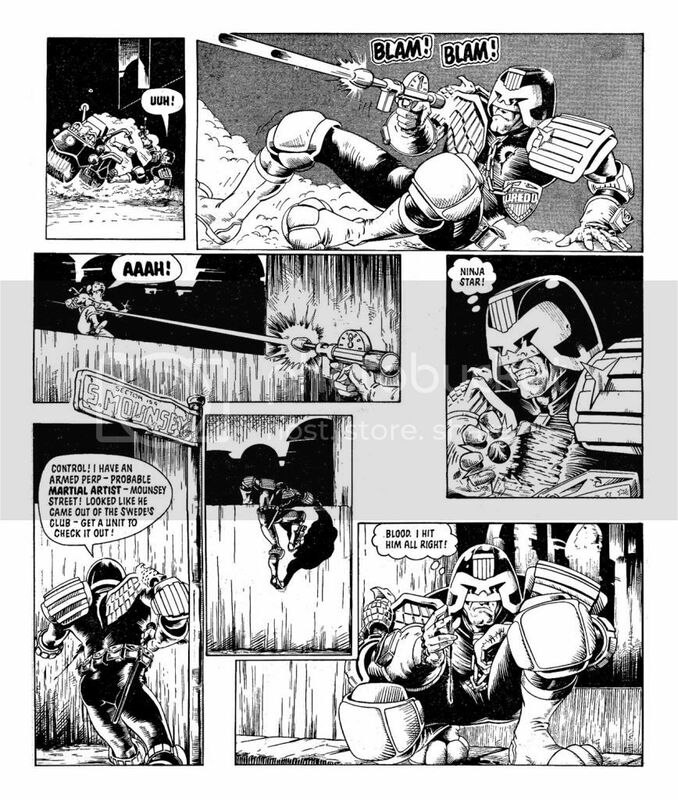 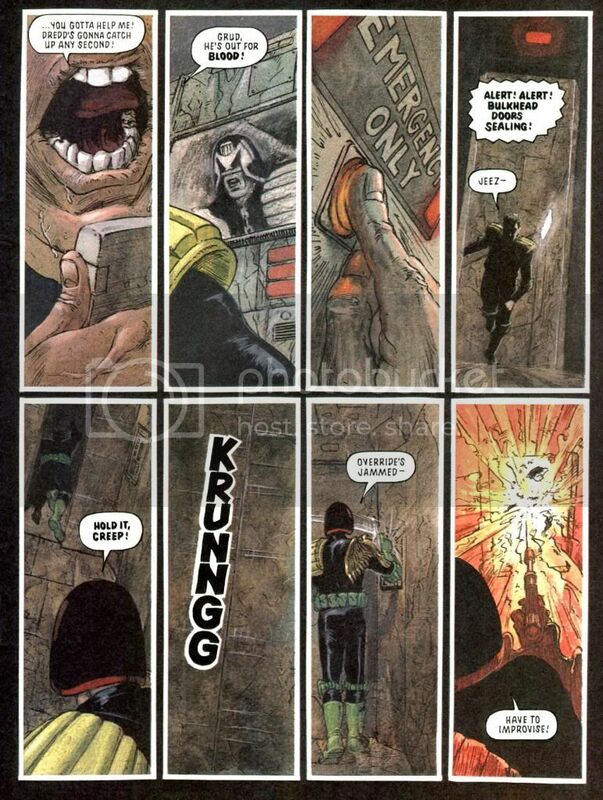 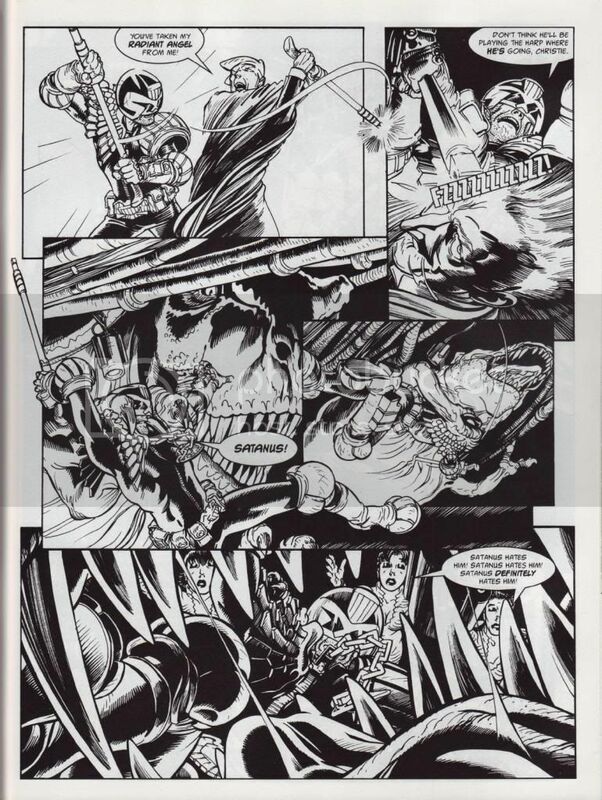 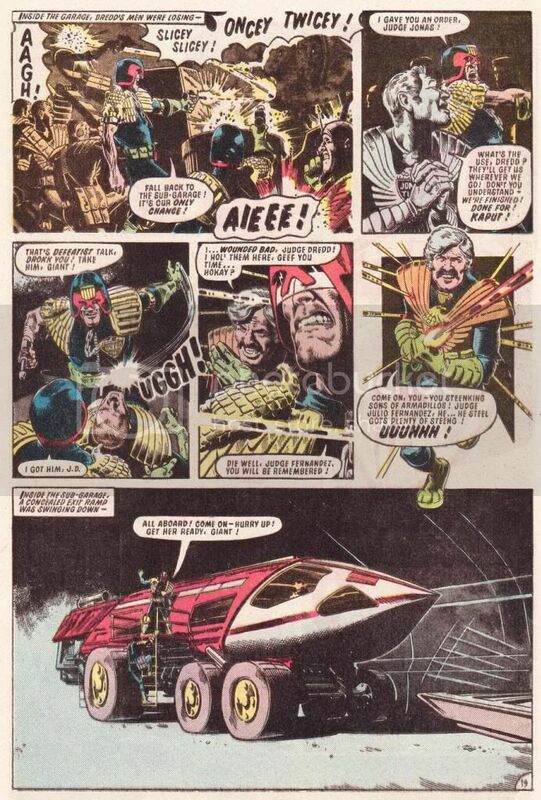 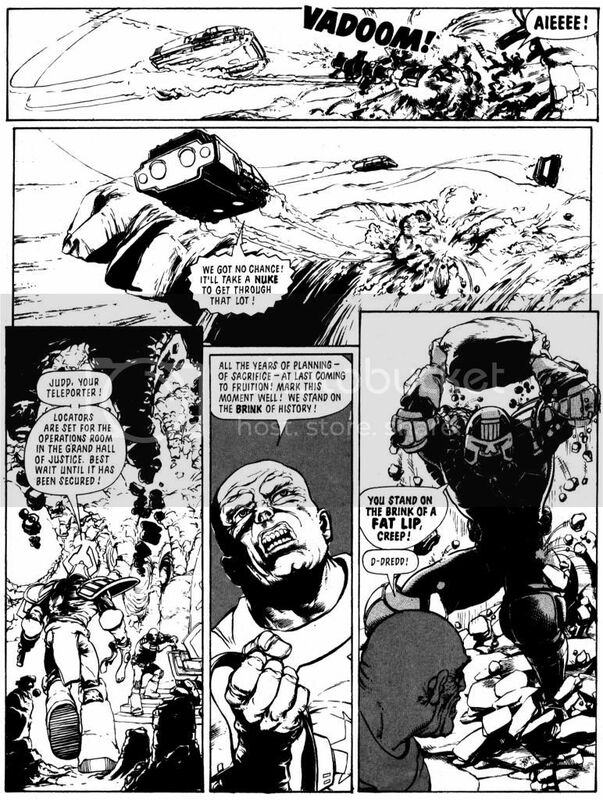 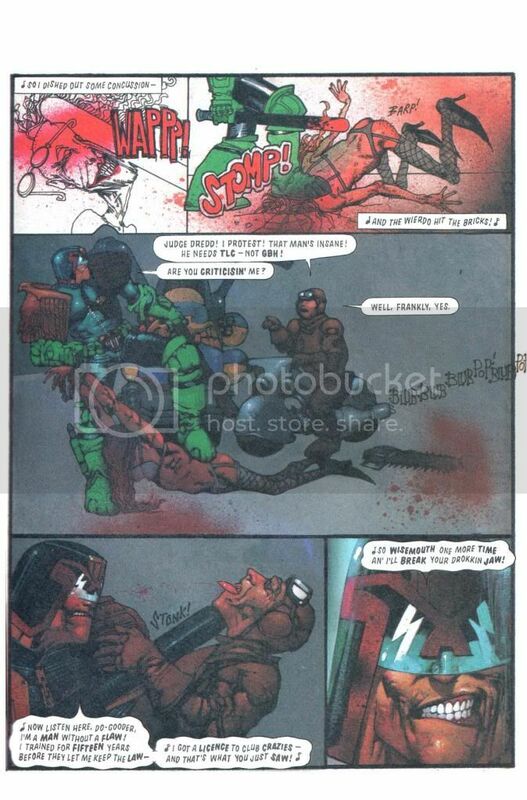 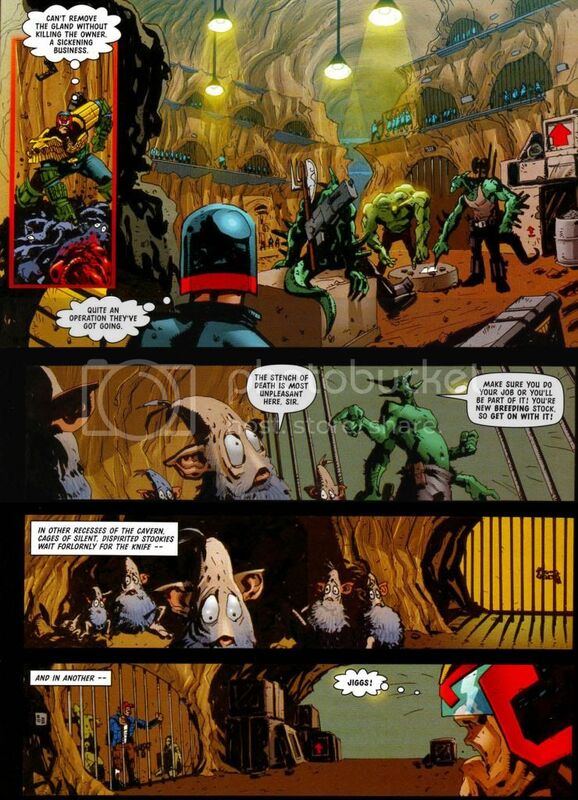 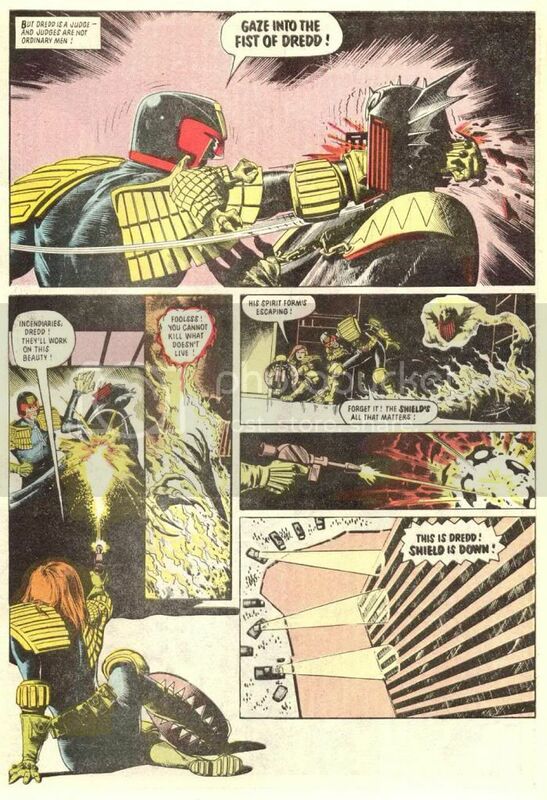 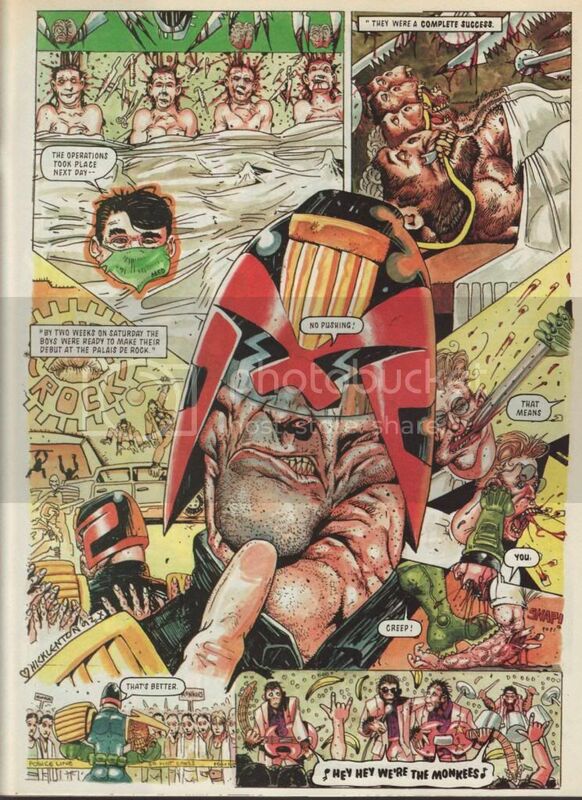 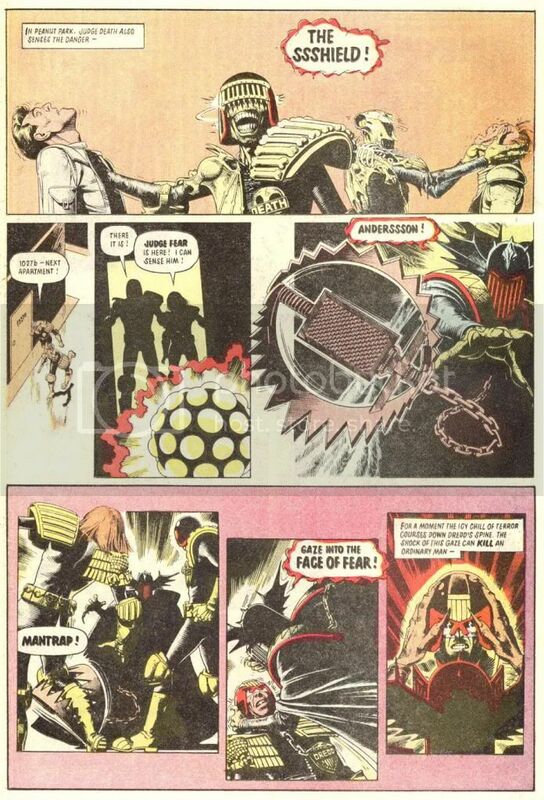 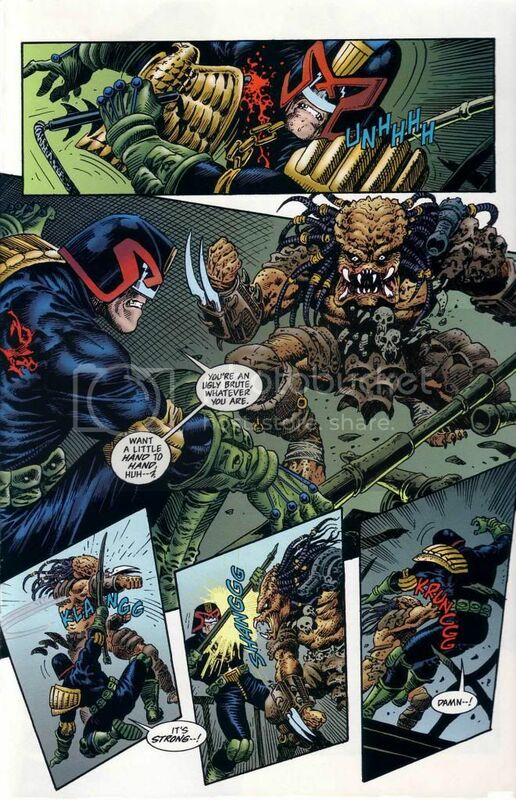 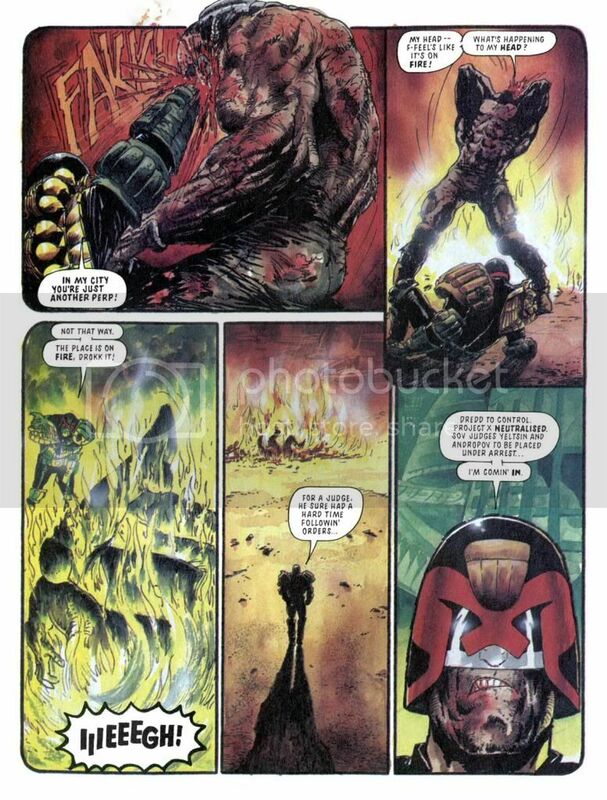 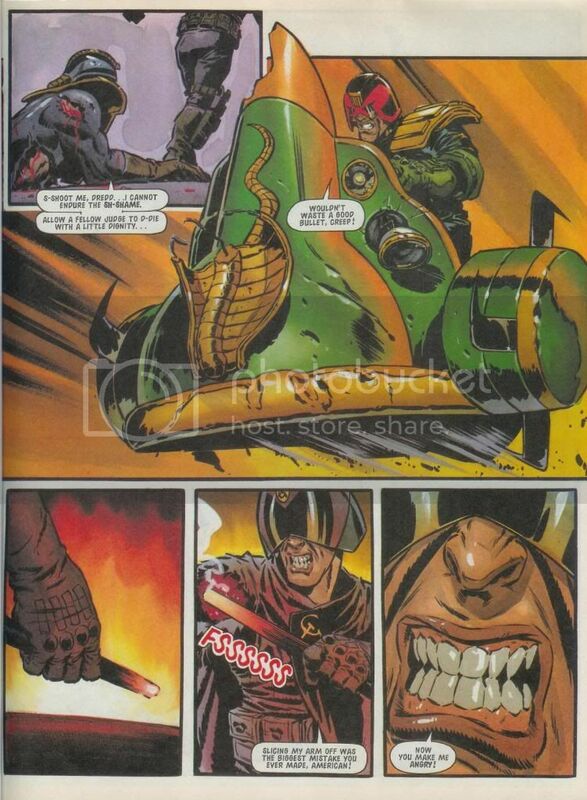 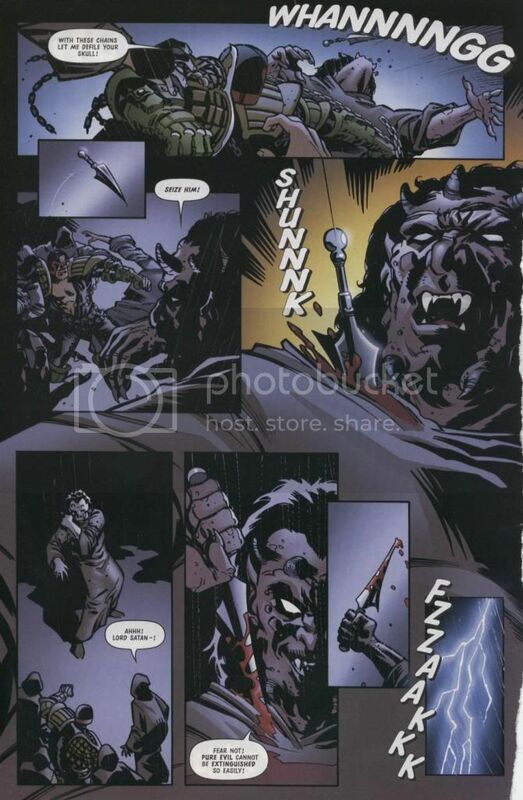 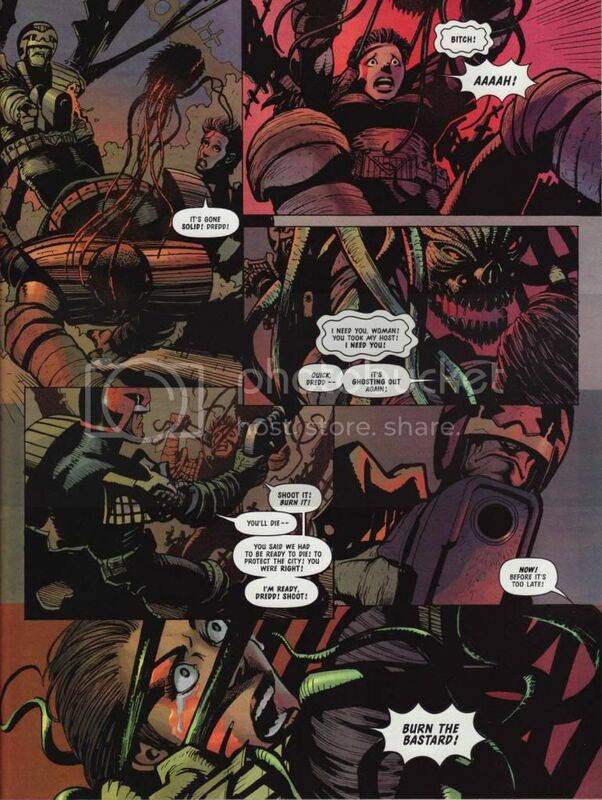 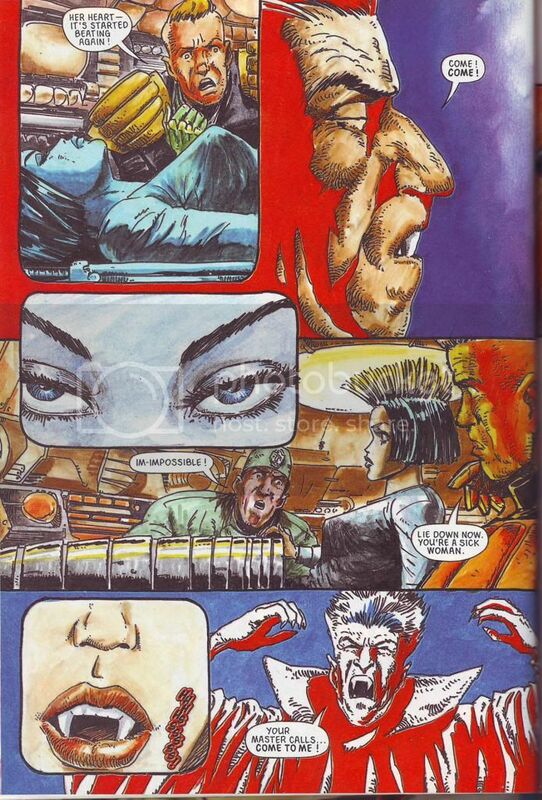 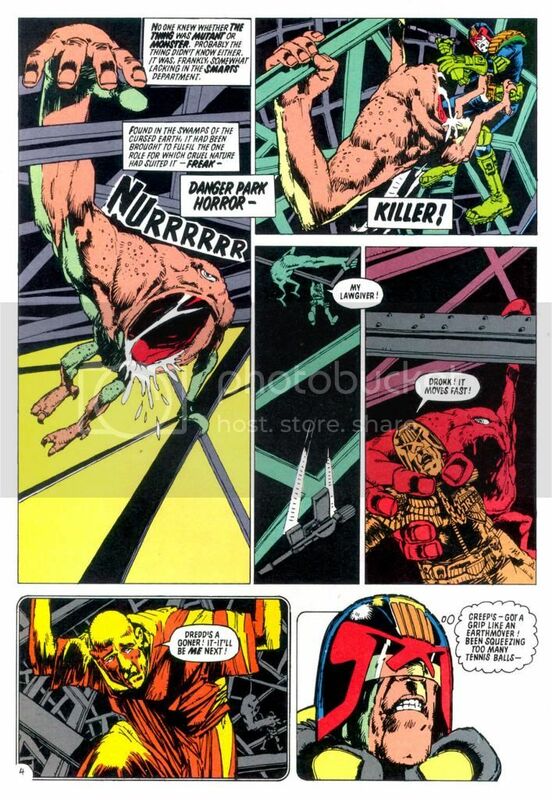 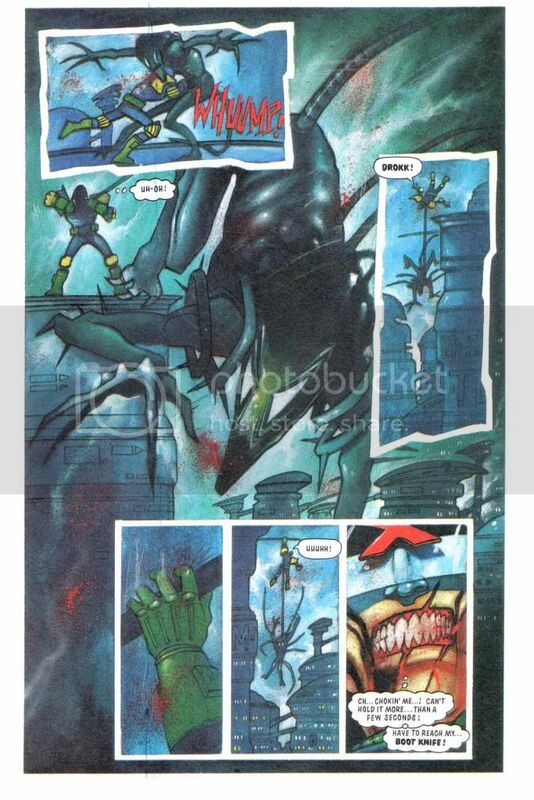 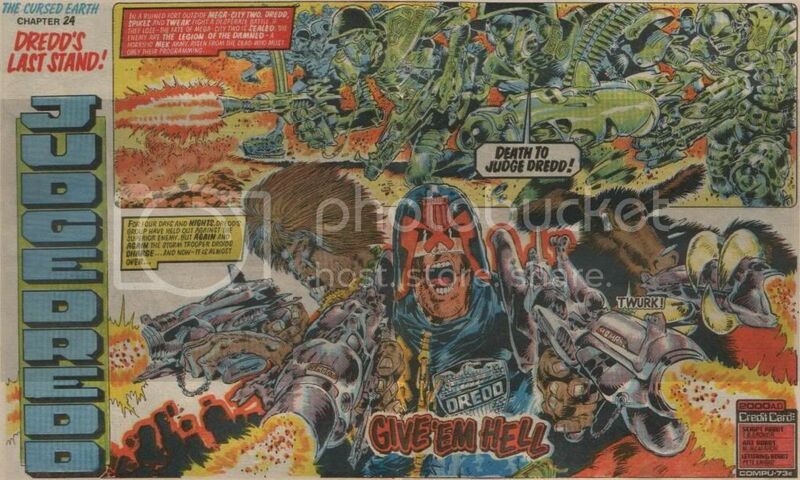 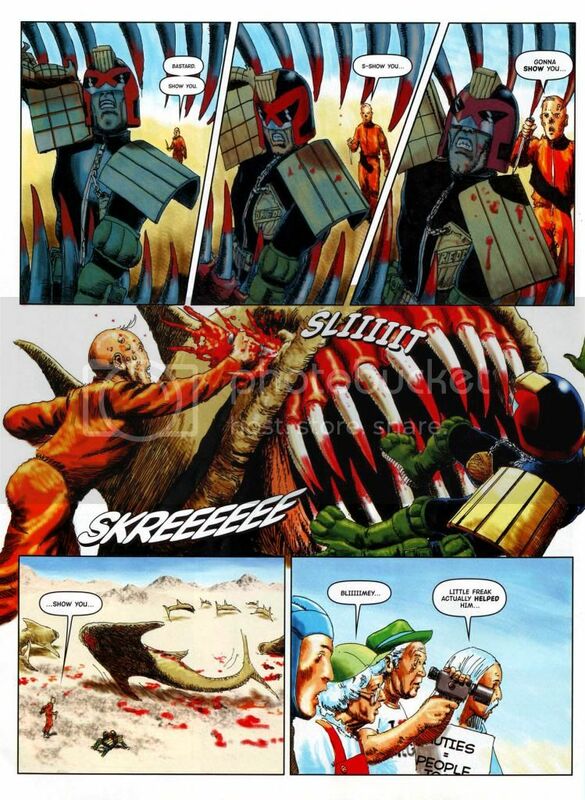 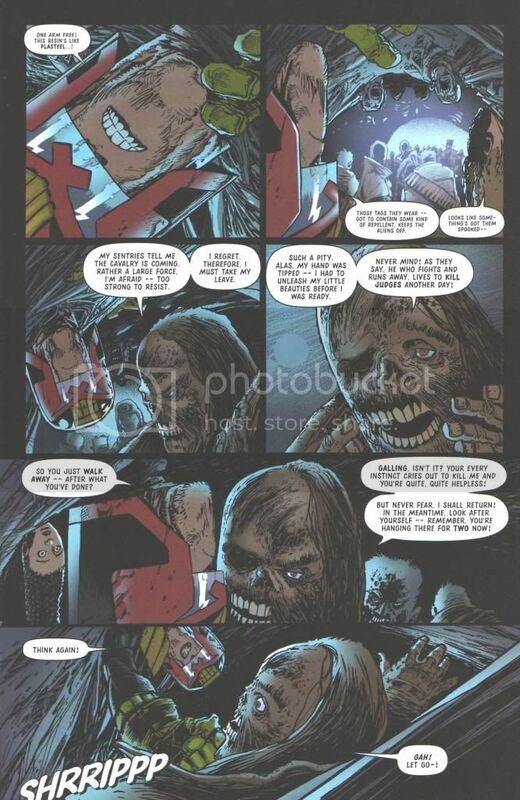 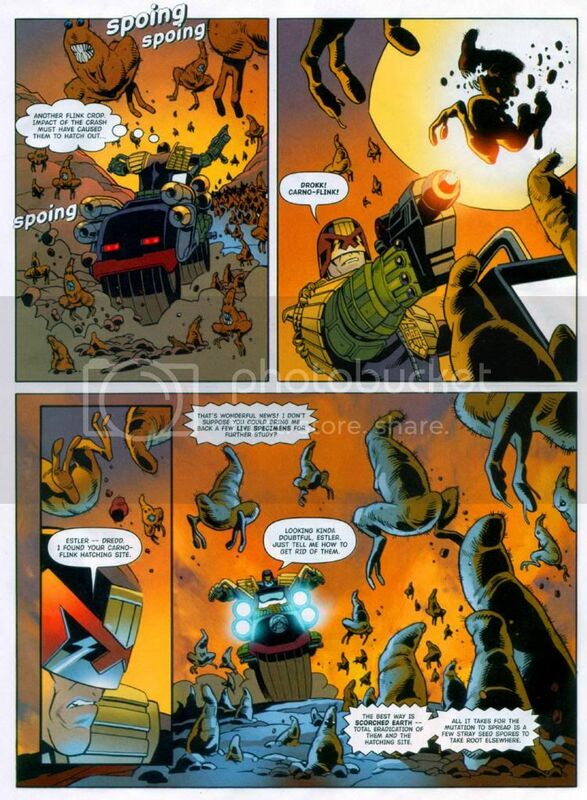 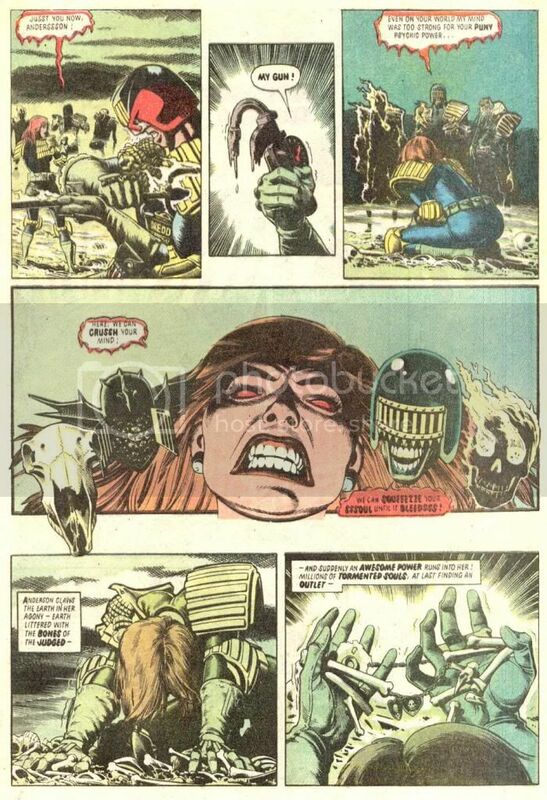 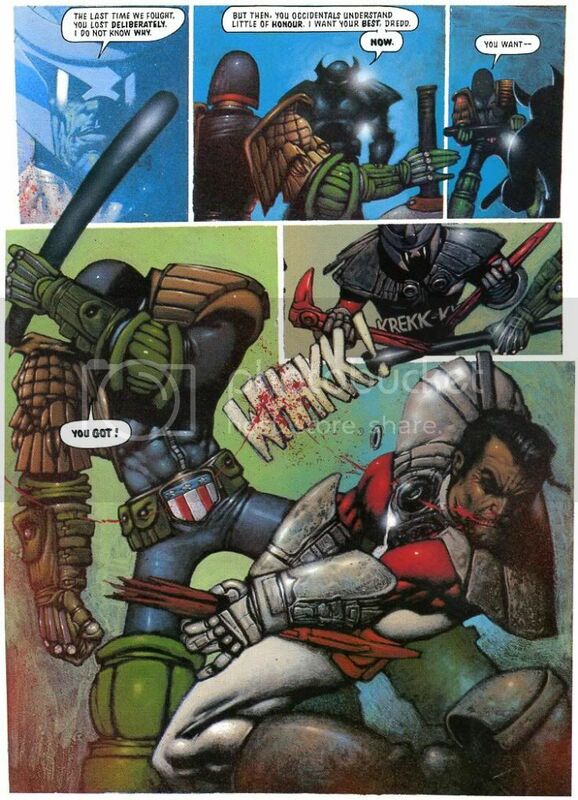 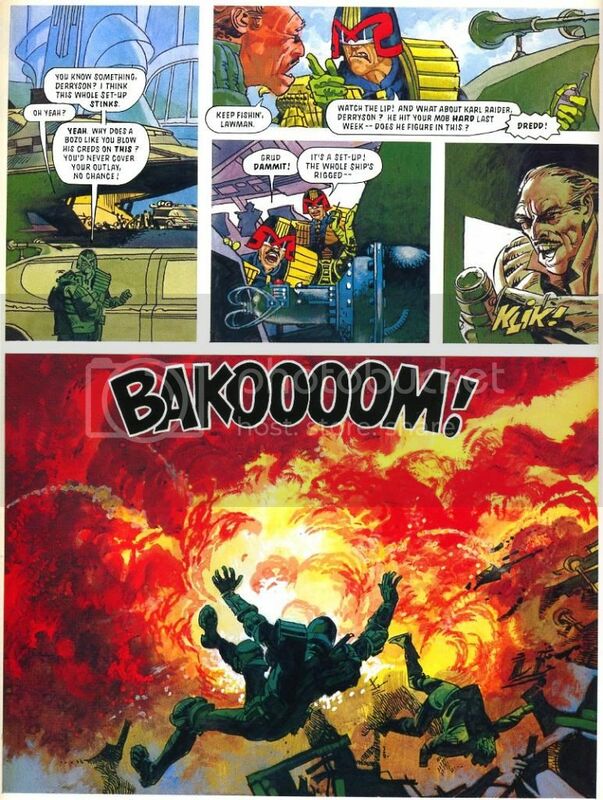 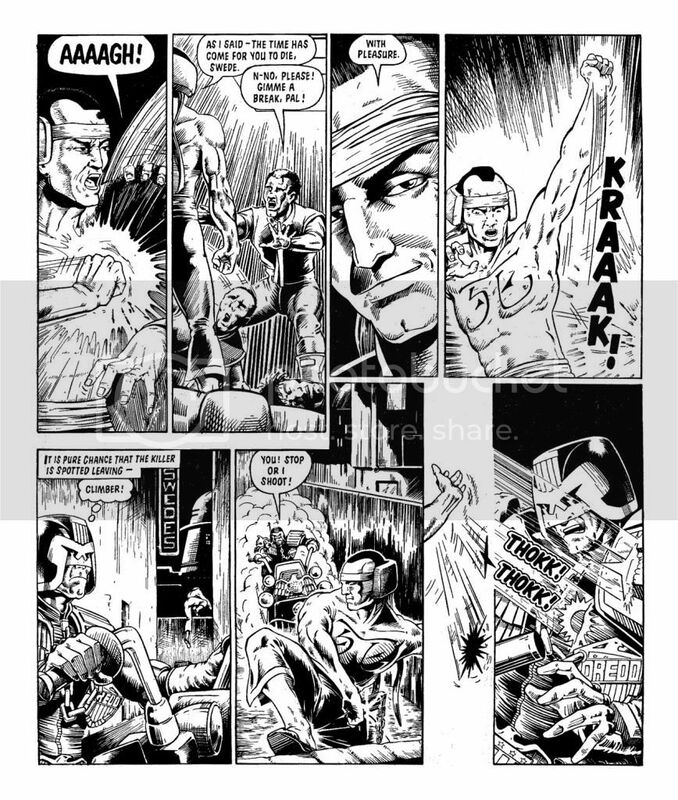 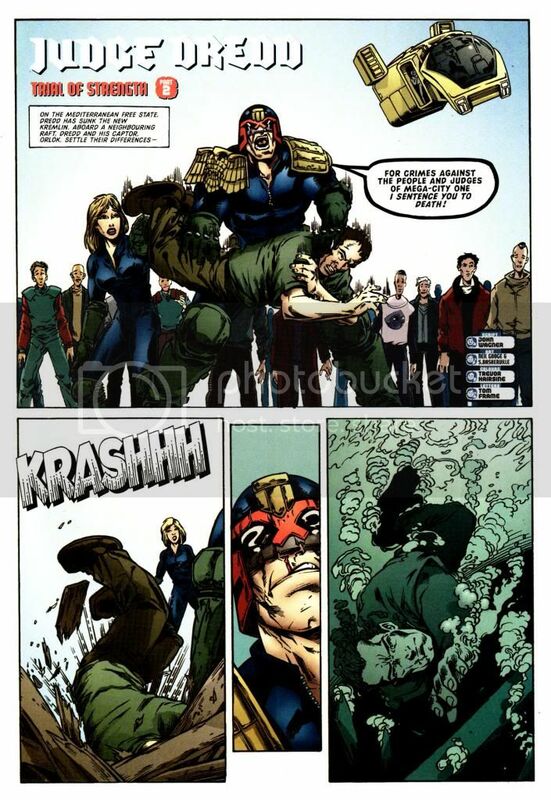 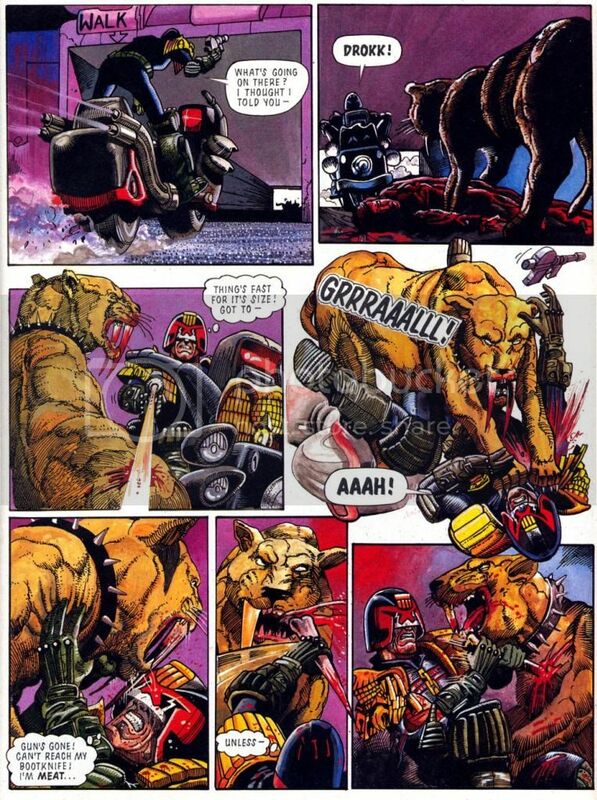 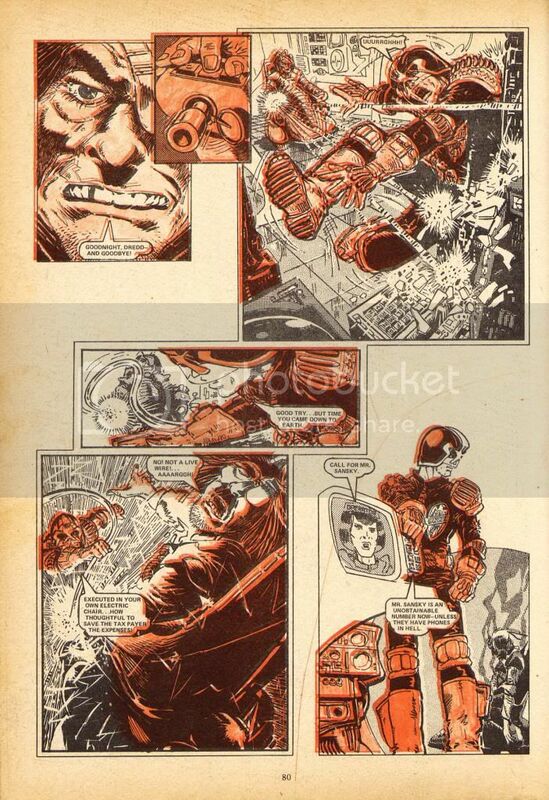 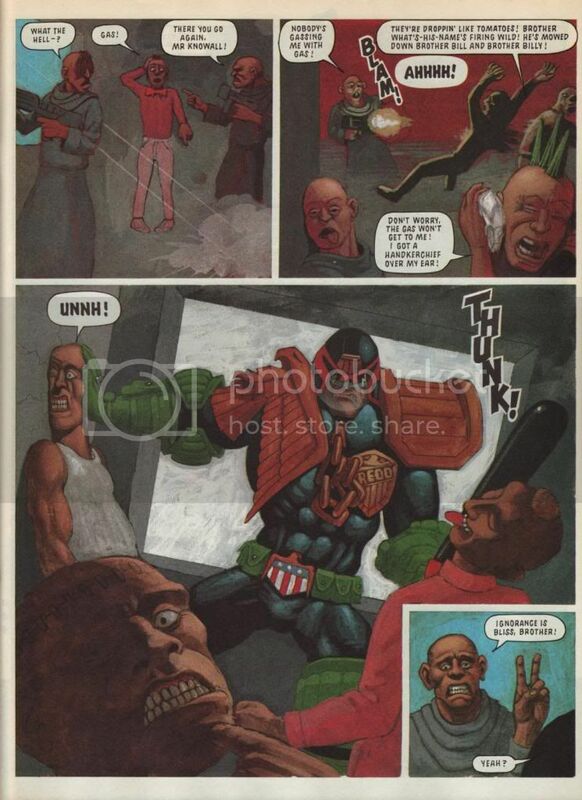 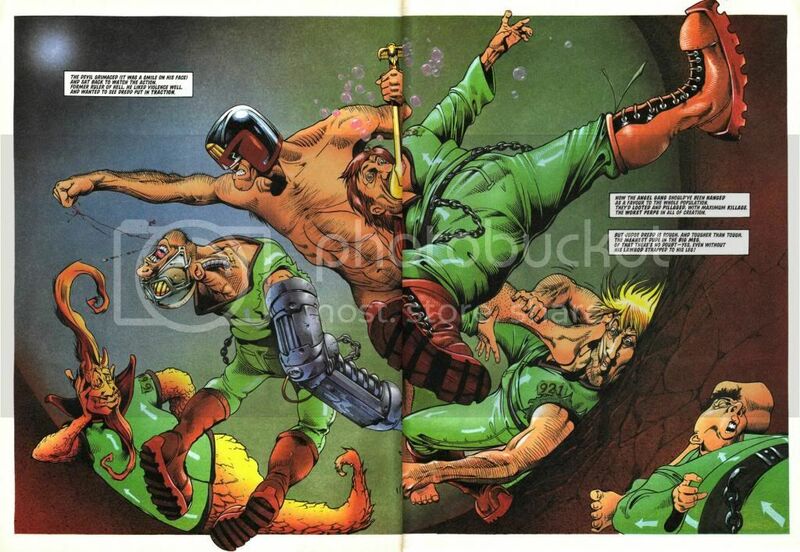 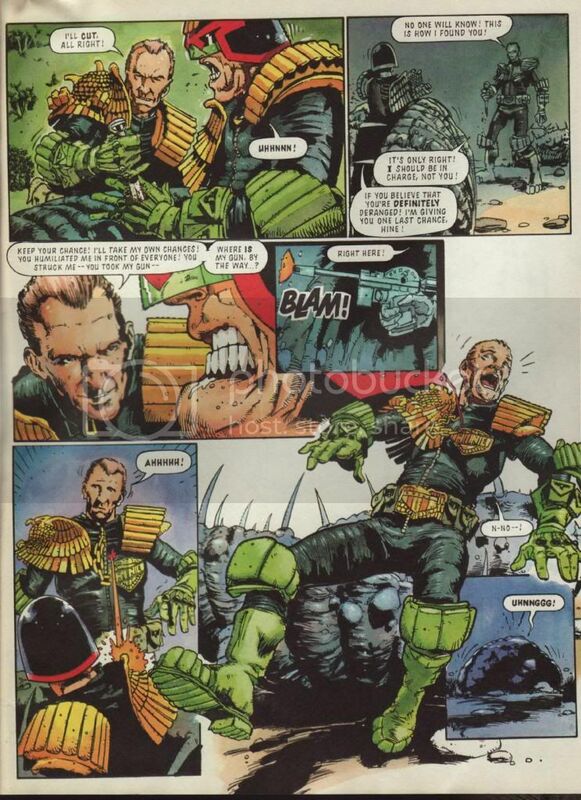 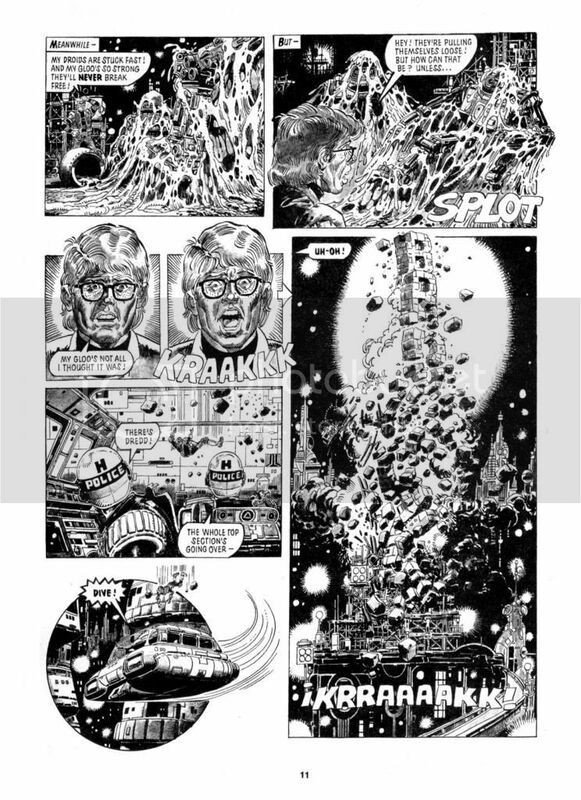 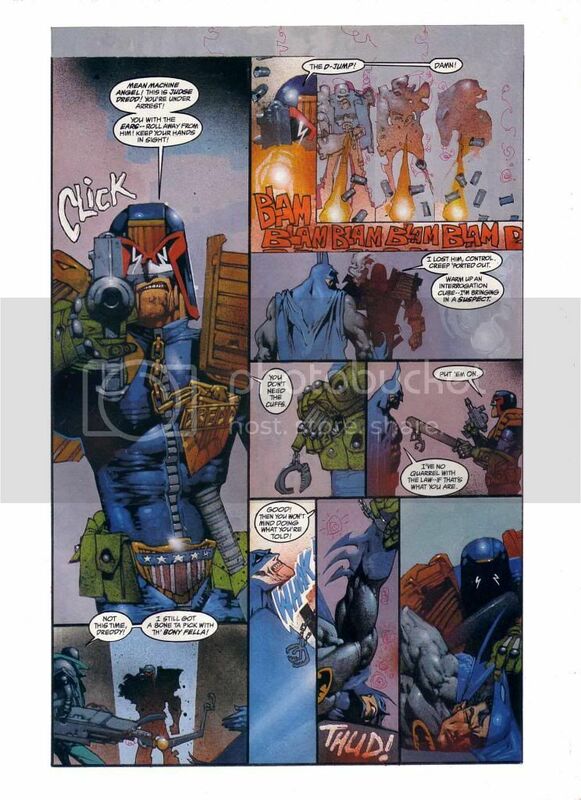 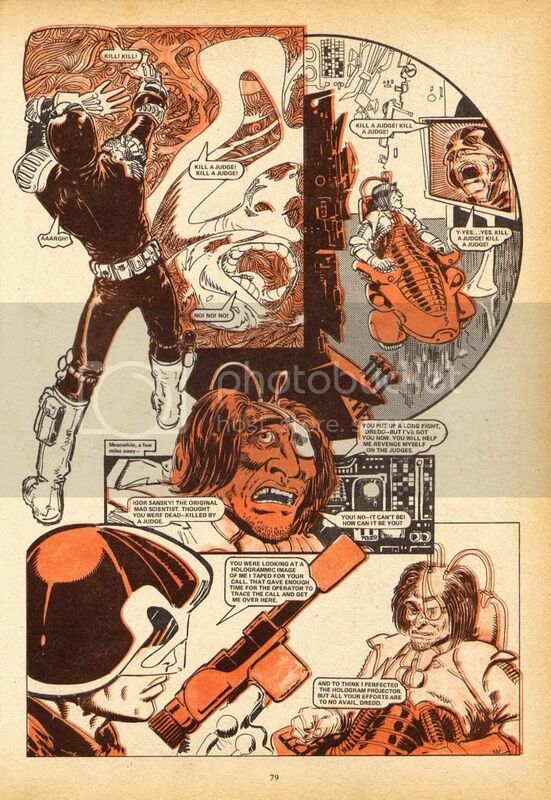 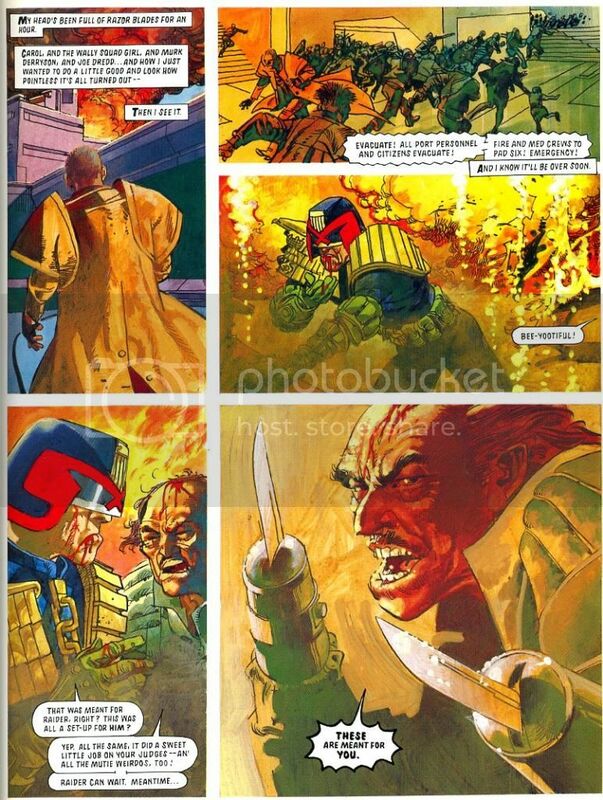 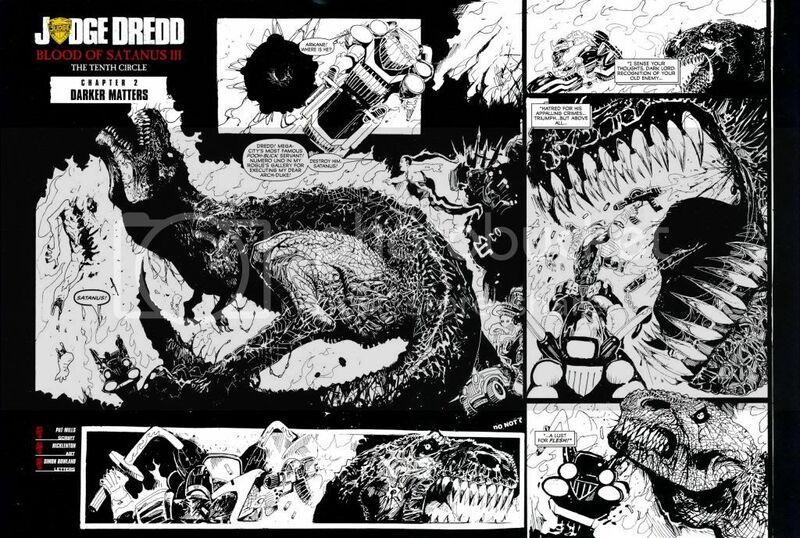 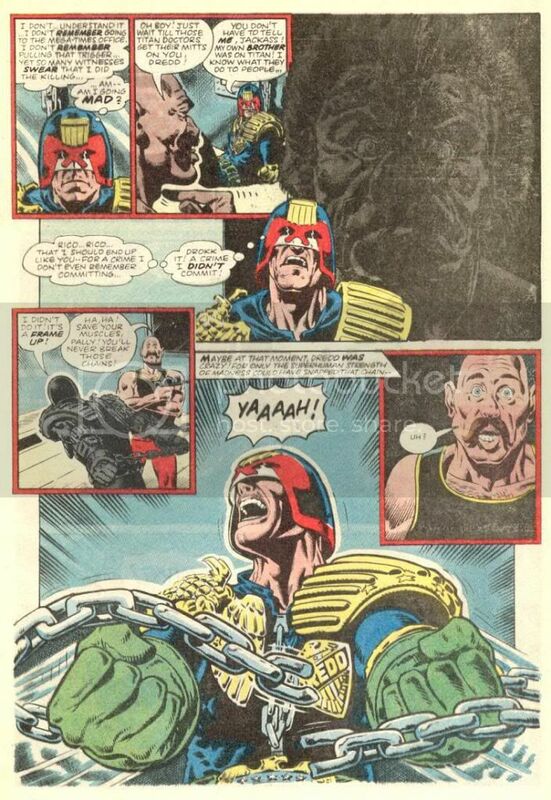 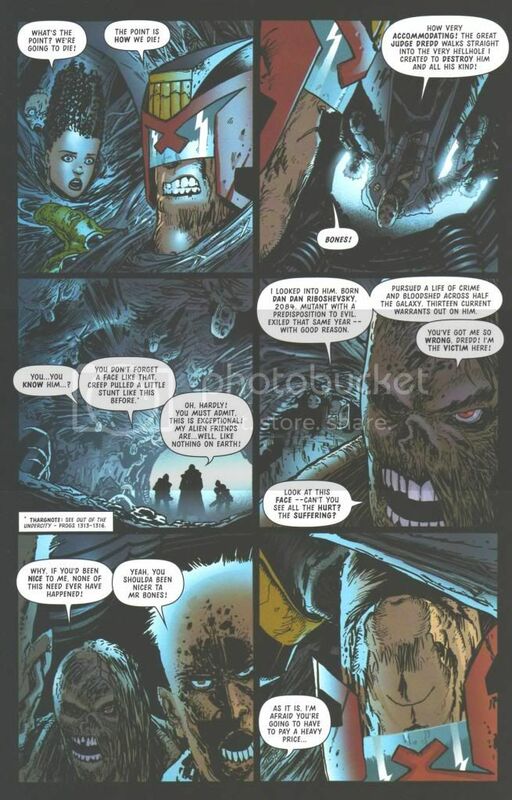 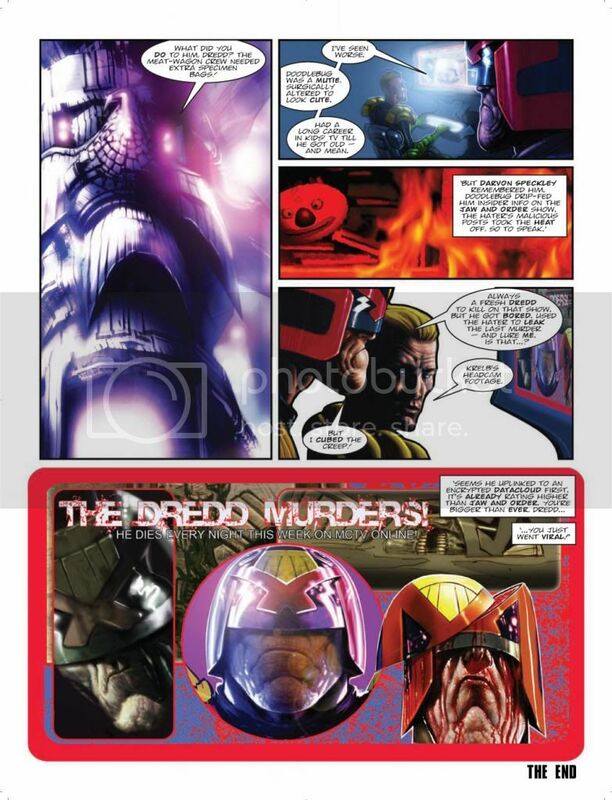 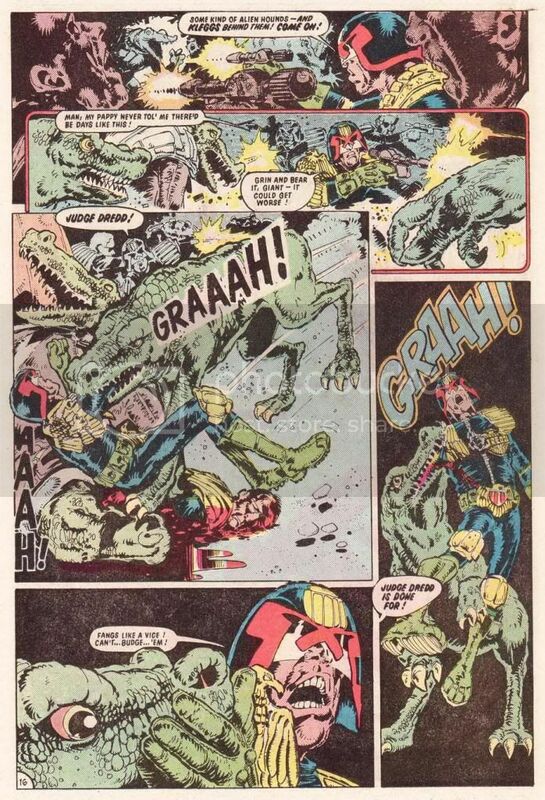 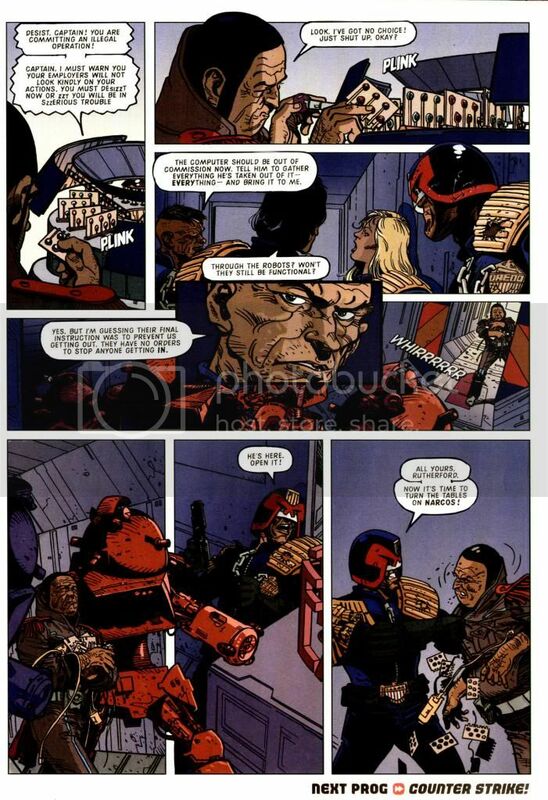 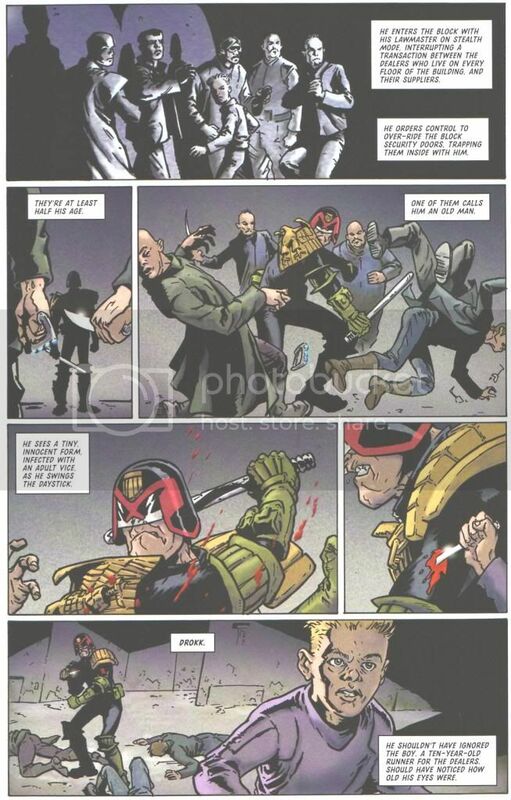 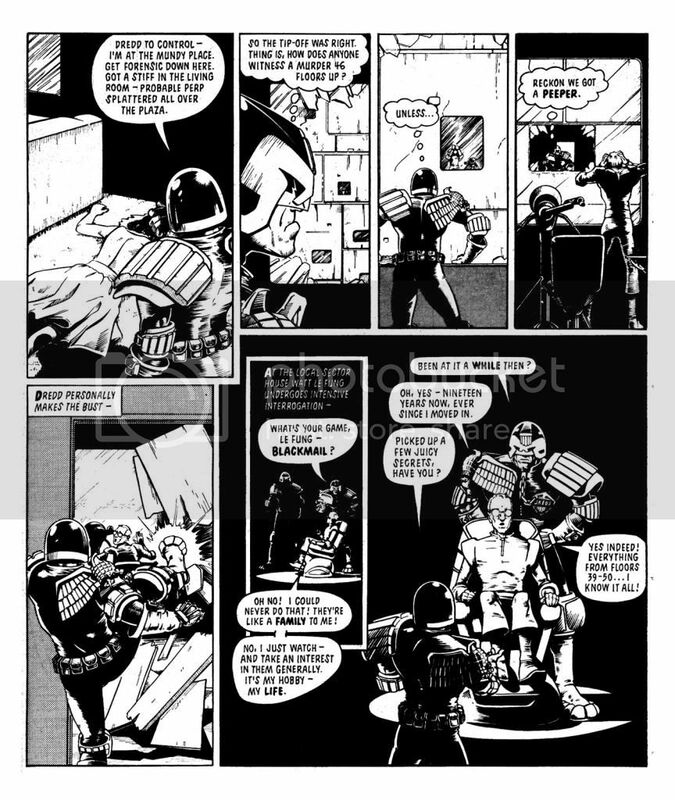 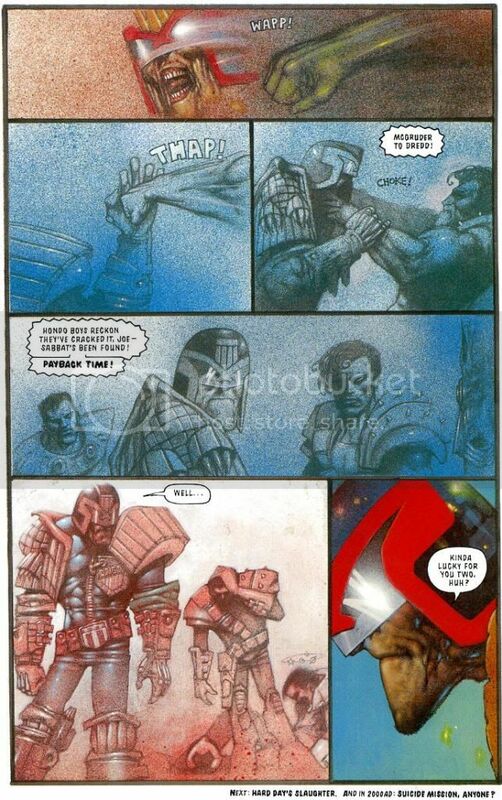 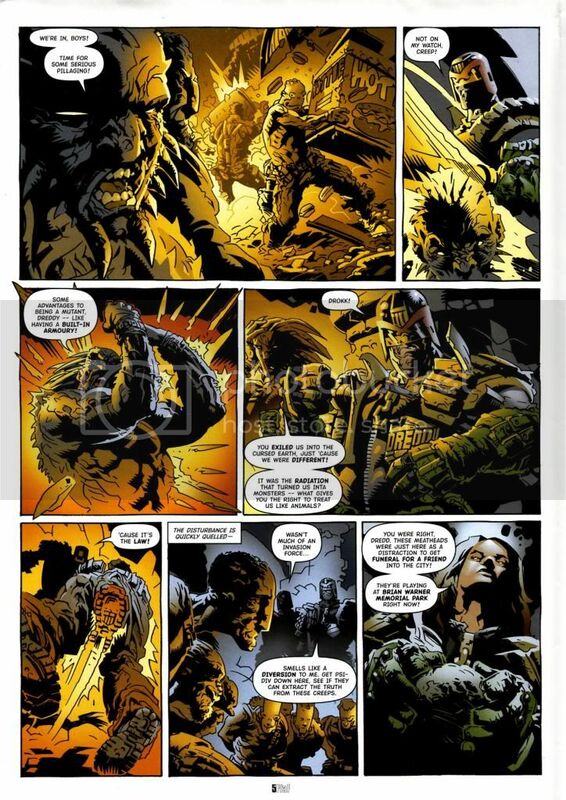 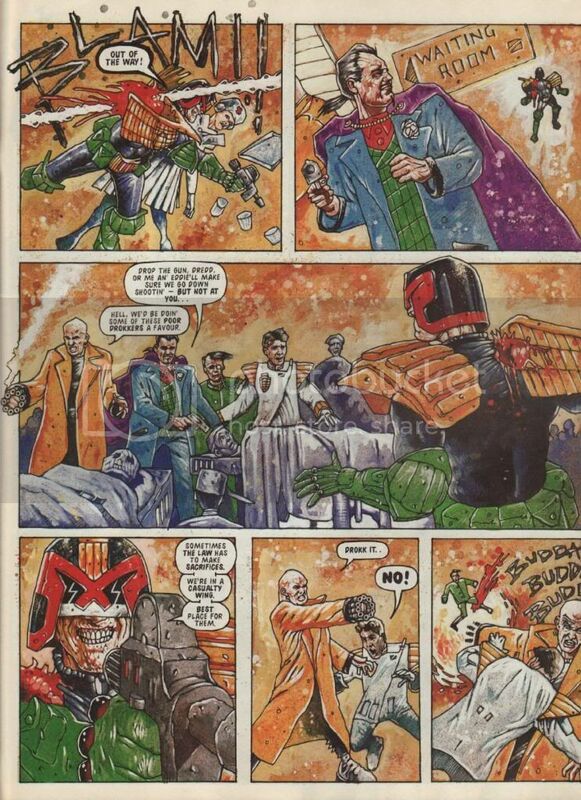 Some examples of Dredd dealing with damage from bladed weapons, claws, teeth, shrapnel etc. 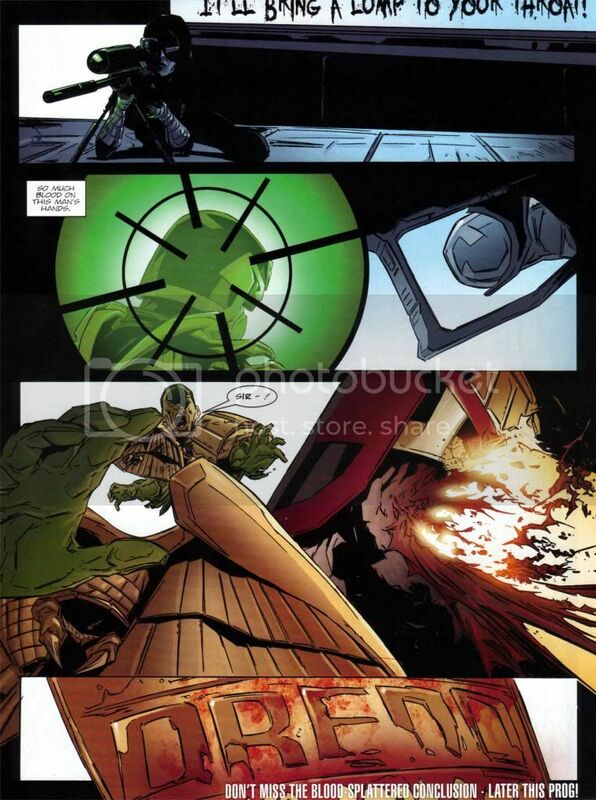 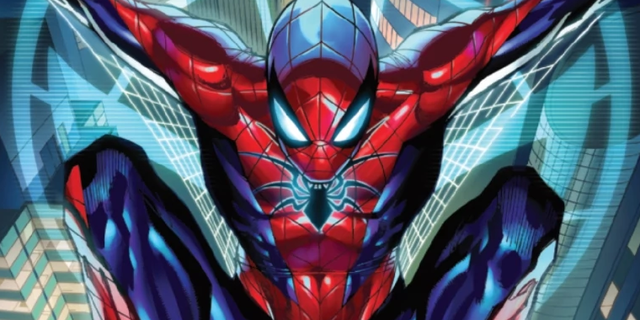 Shrugs off multiple large pieces of shrapnel impaling him through the shoulder. 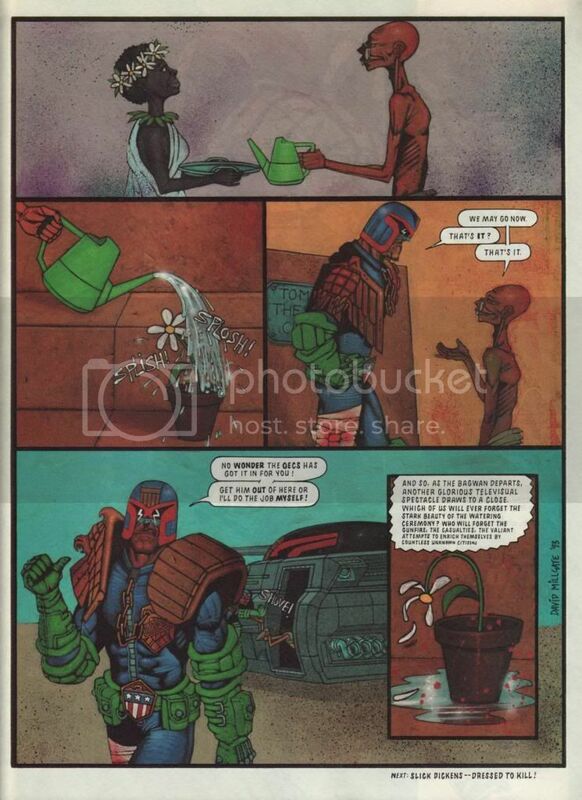 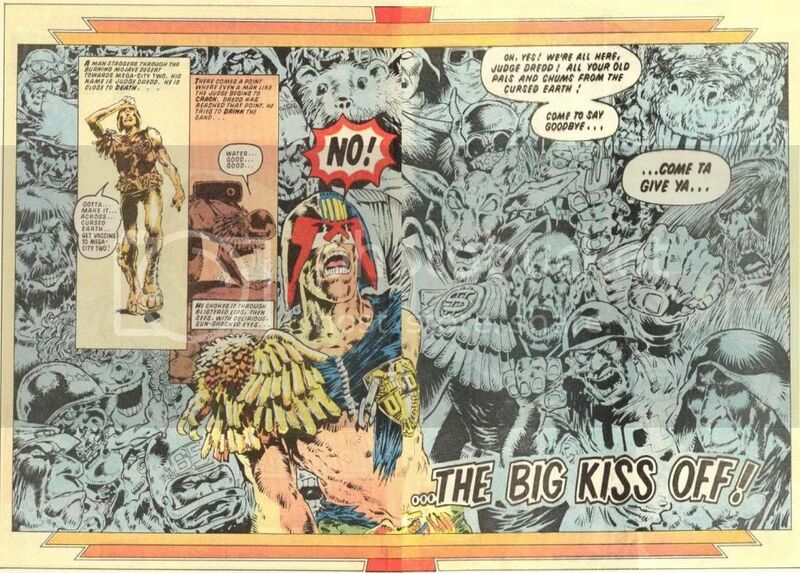 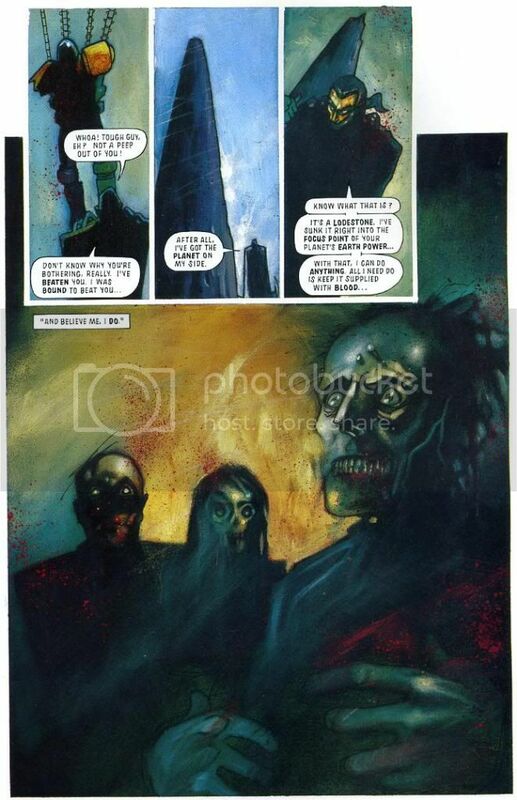 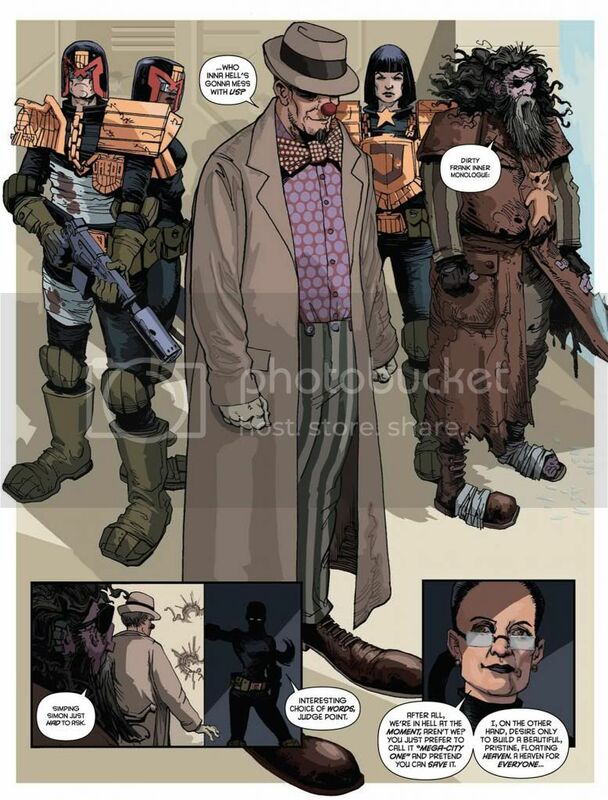 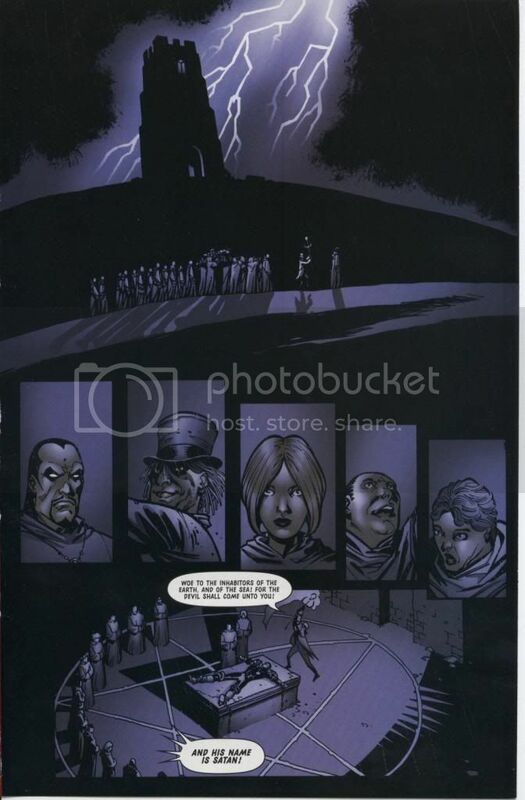 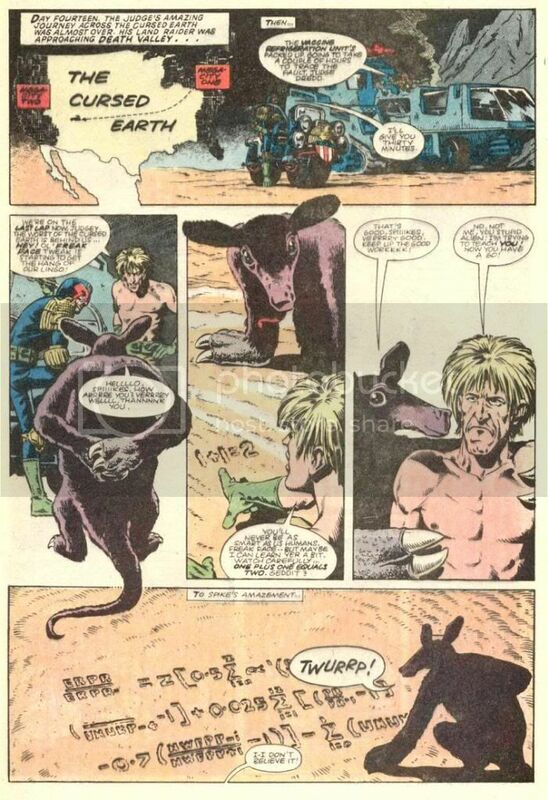 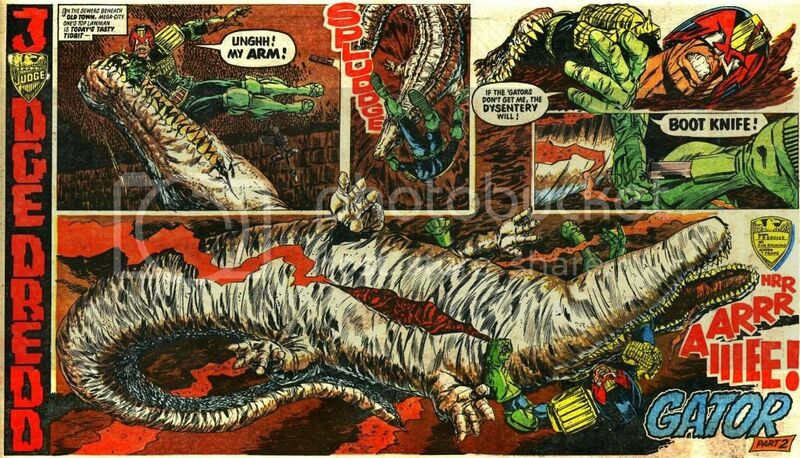 2000AD: It’s Your Funeral Creep! 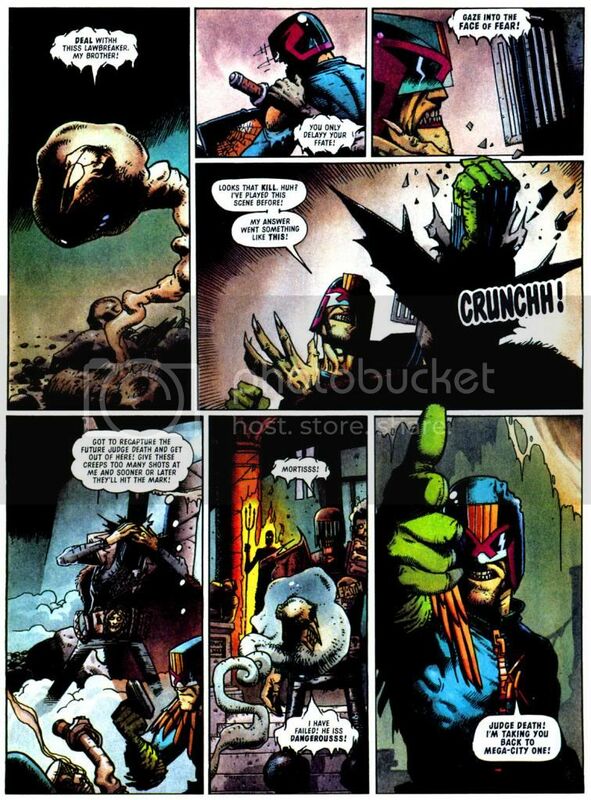 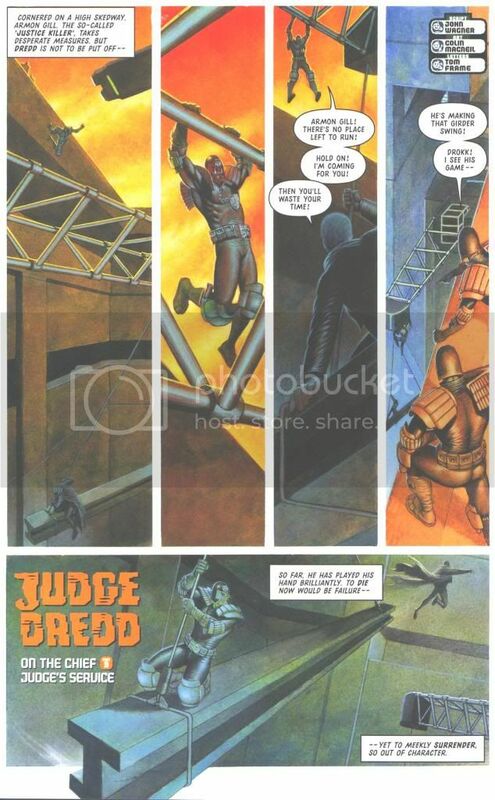 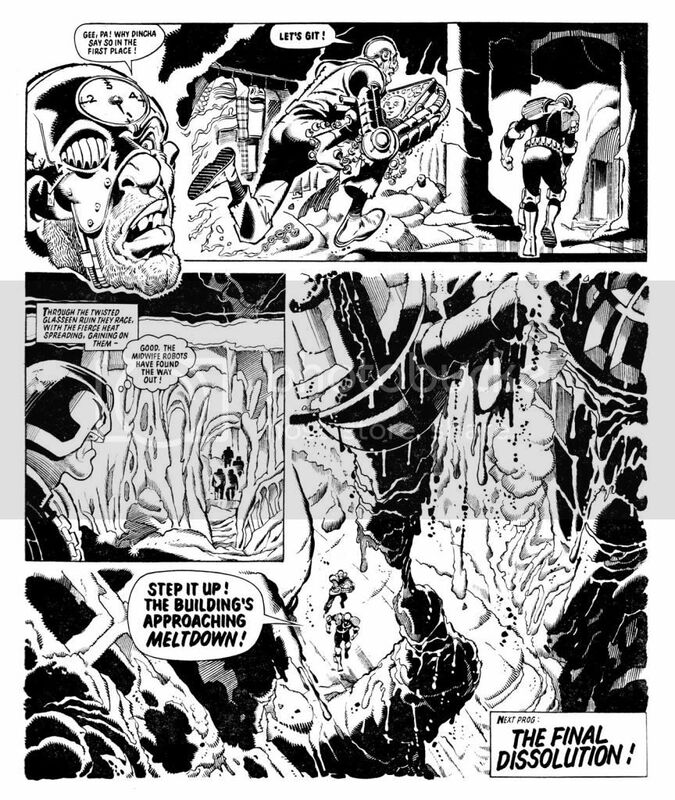 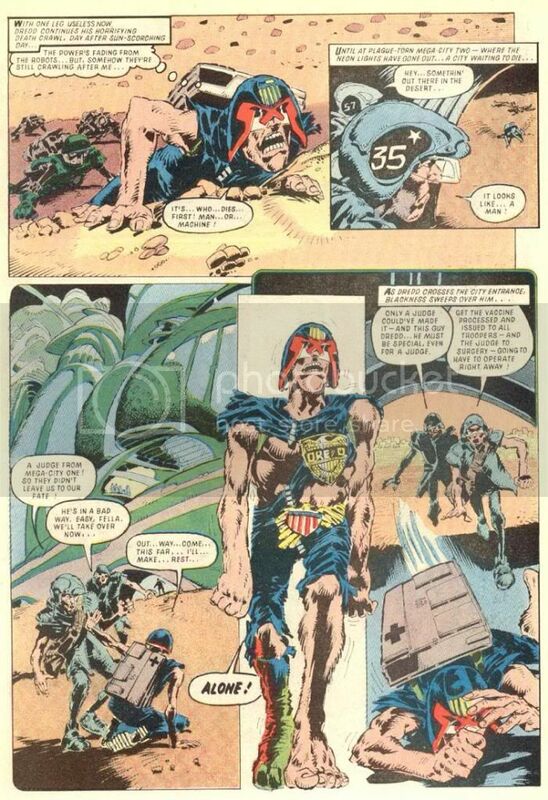 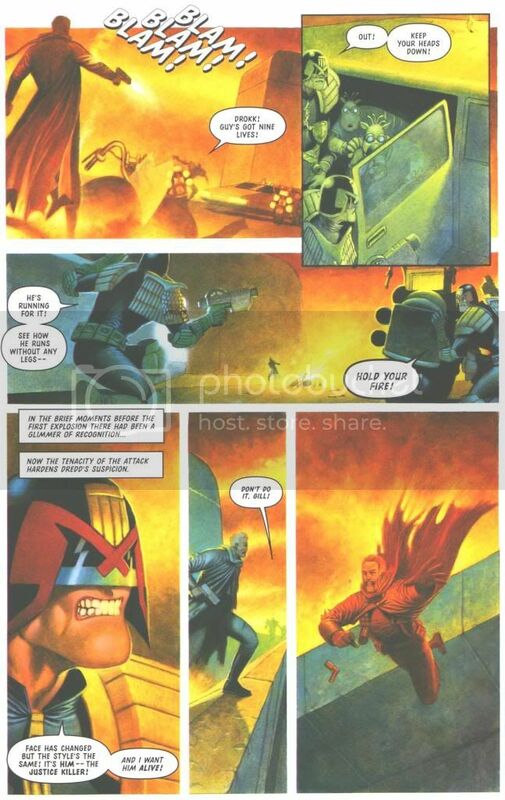 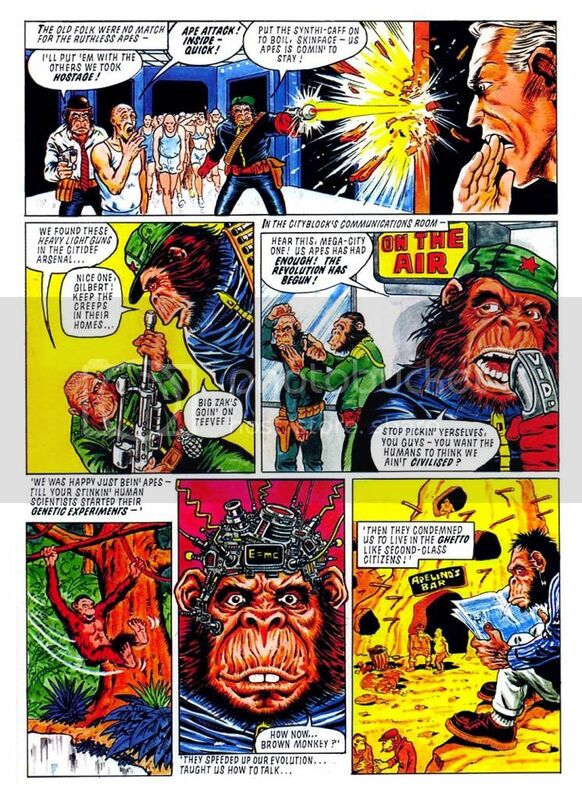 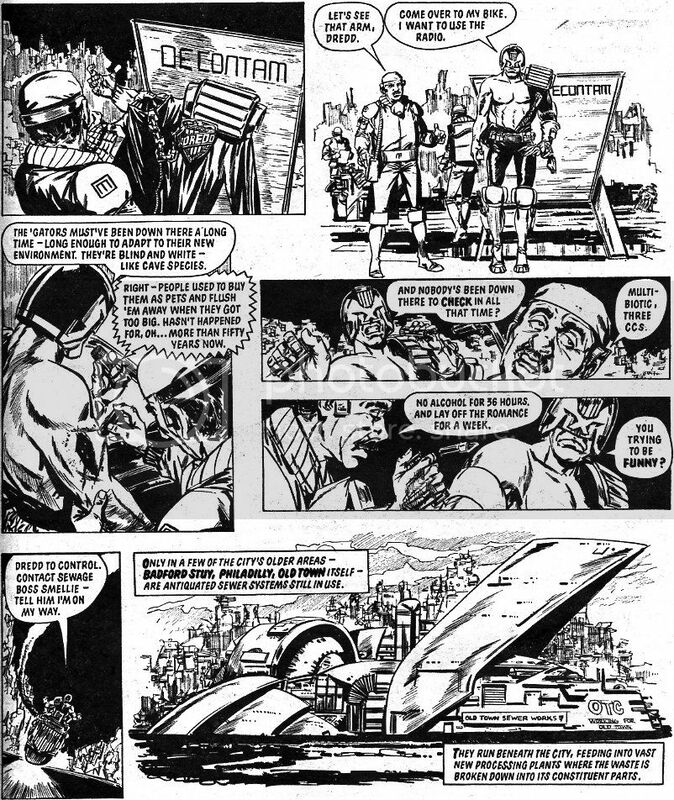 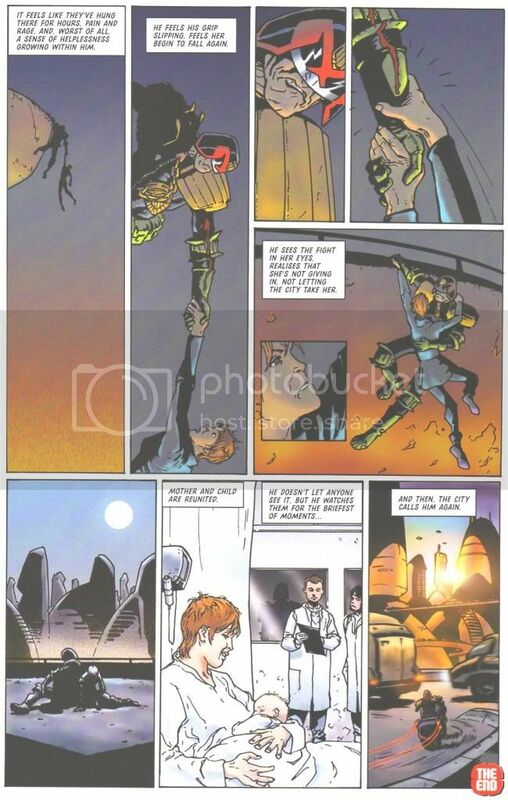 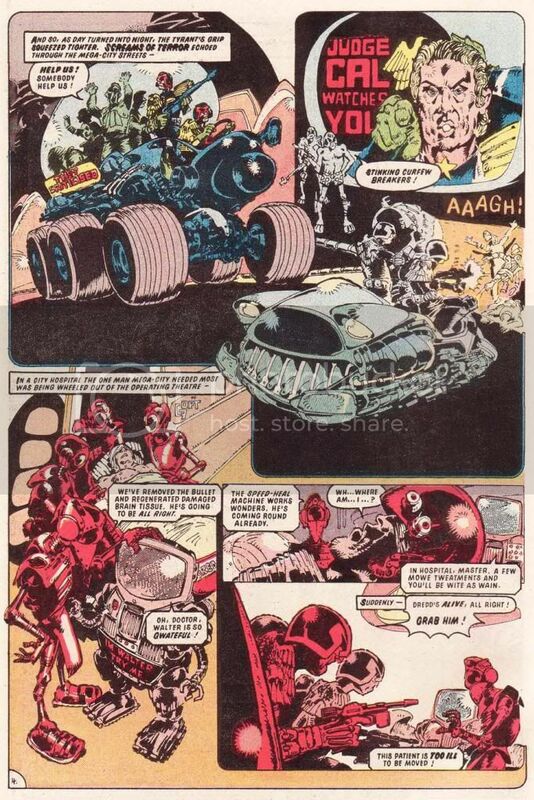 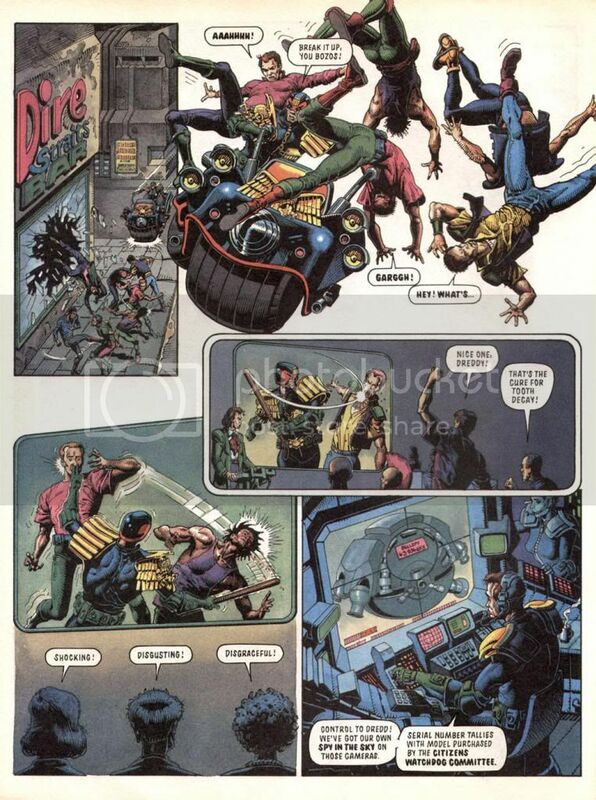 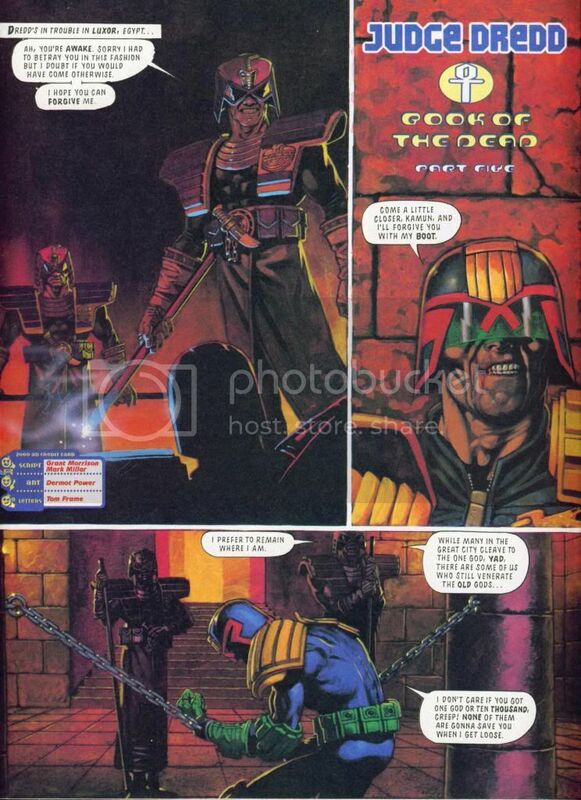 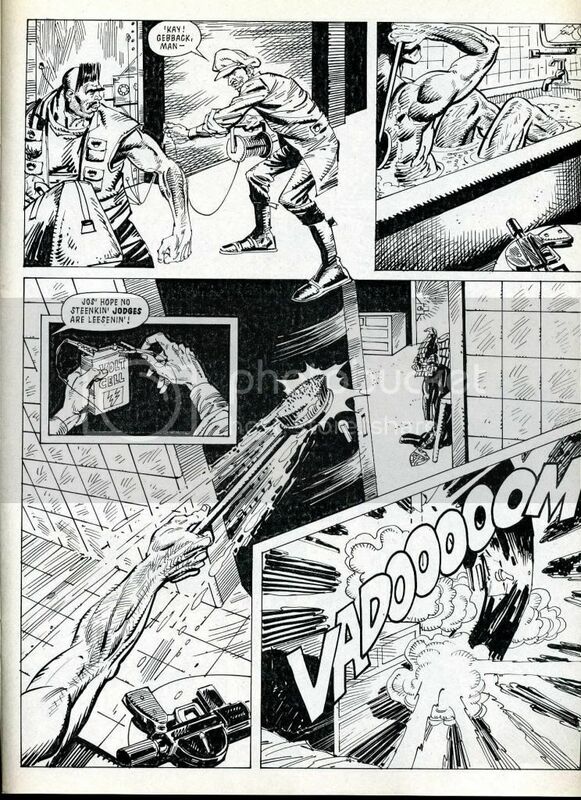 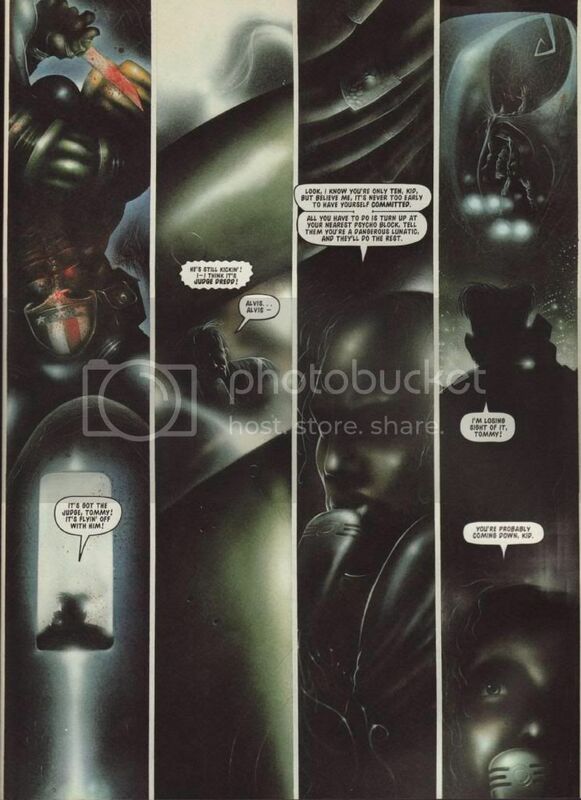 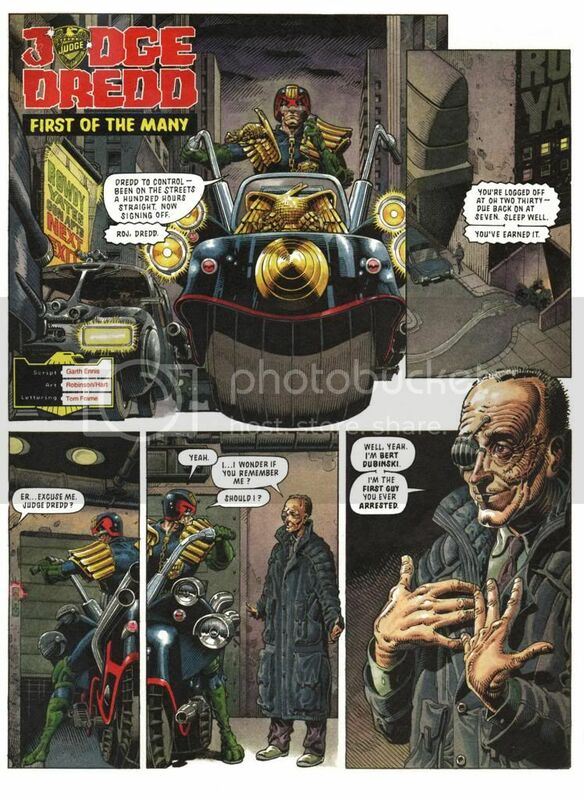 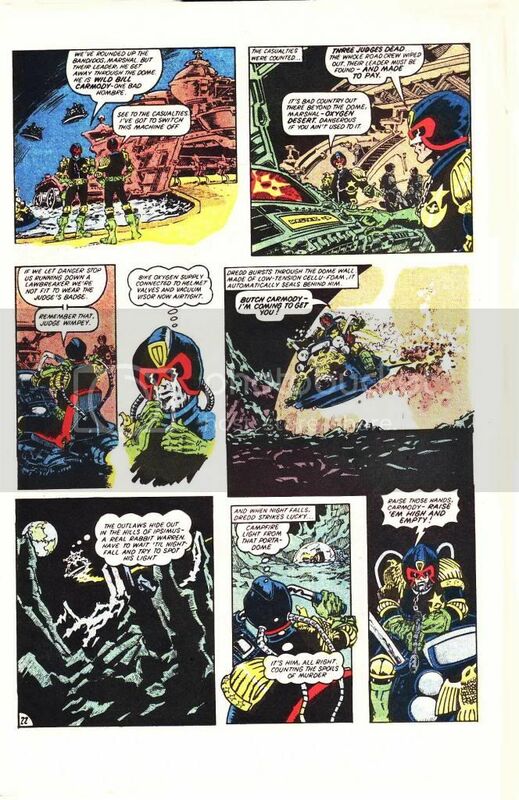 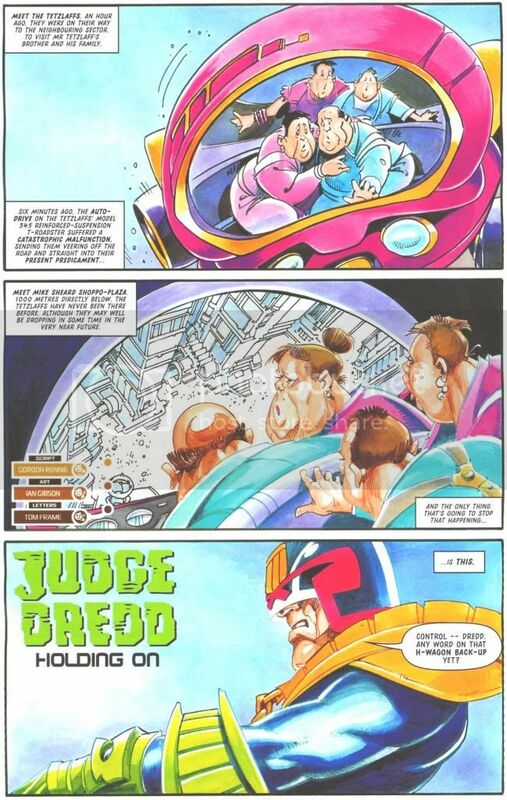 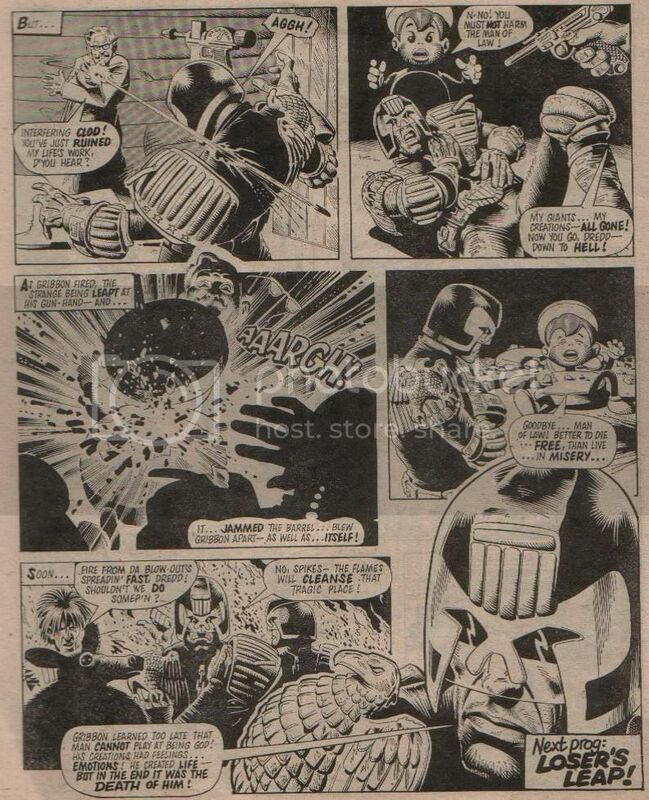 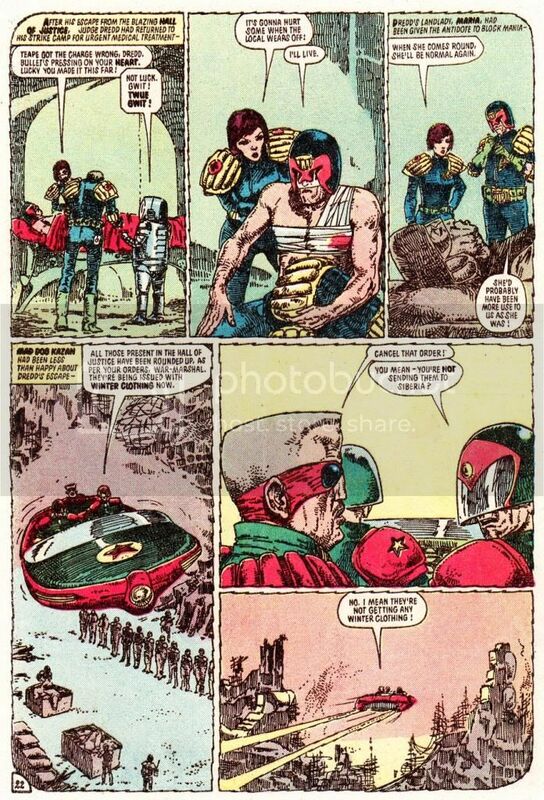 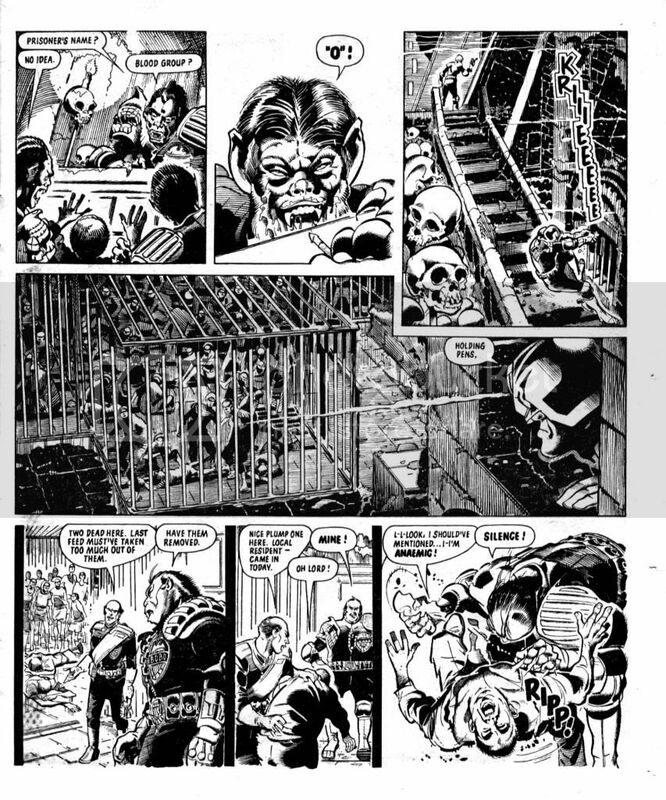 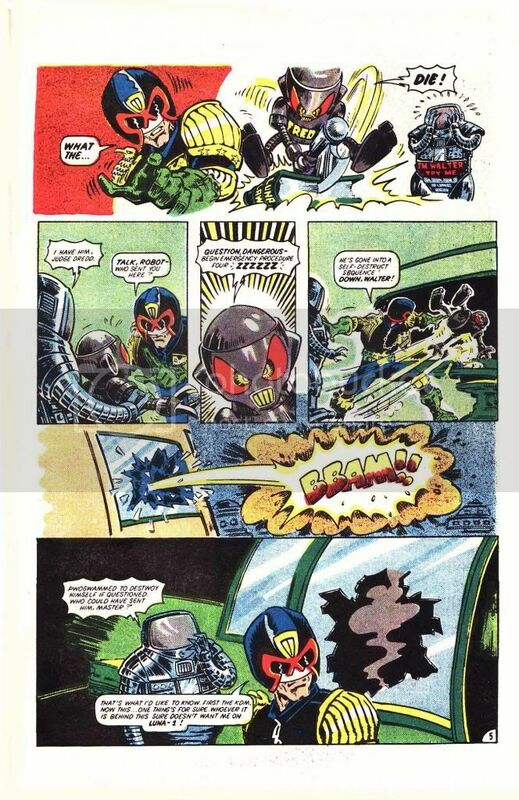 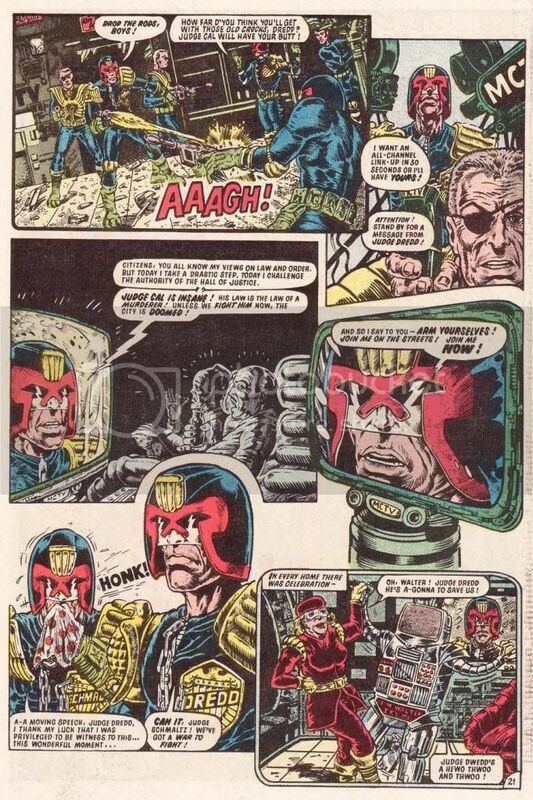 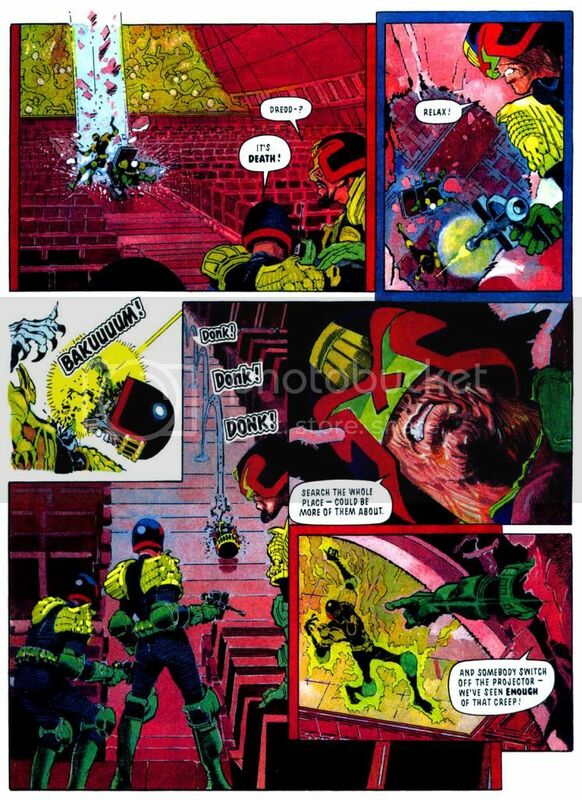 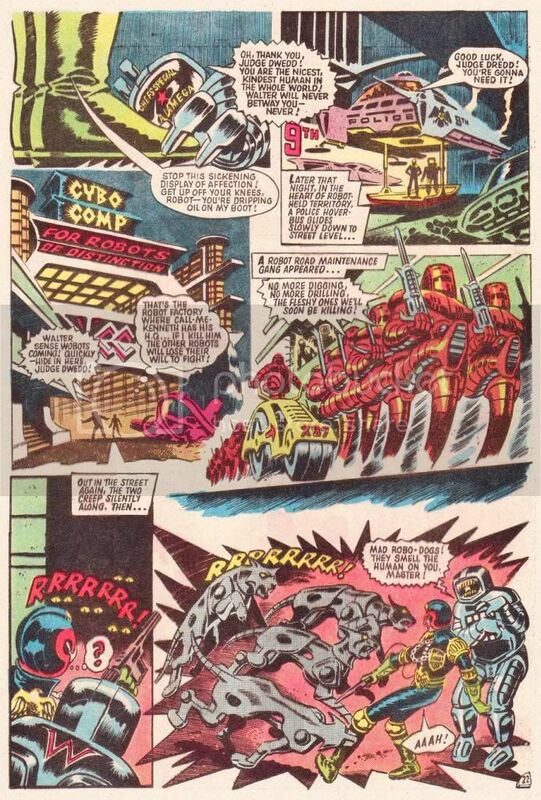 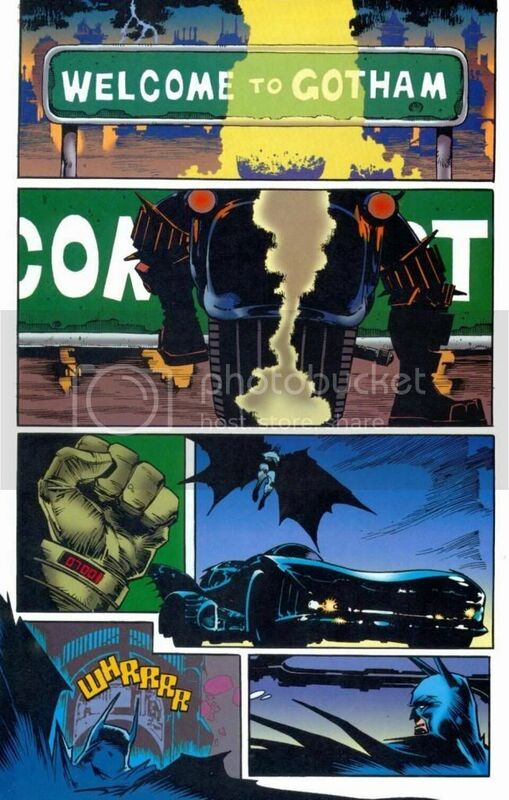 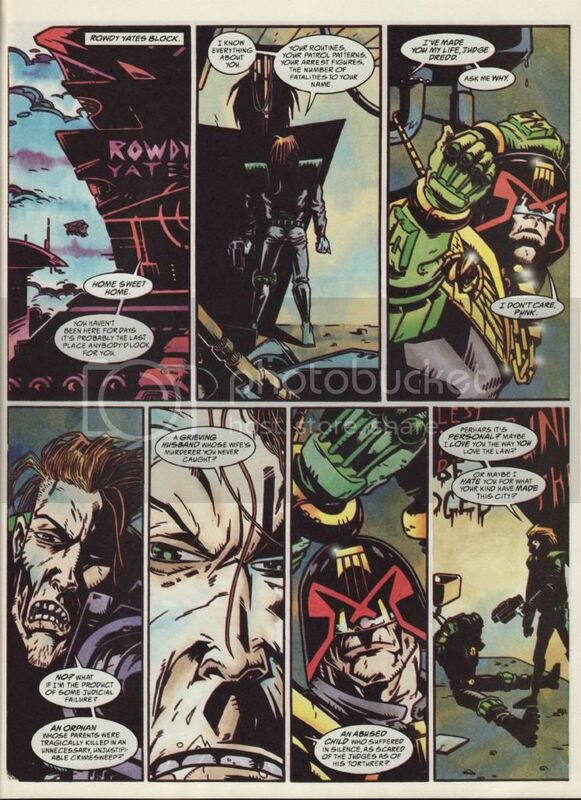 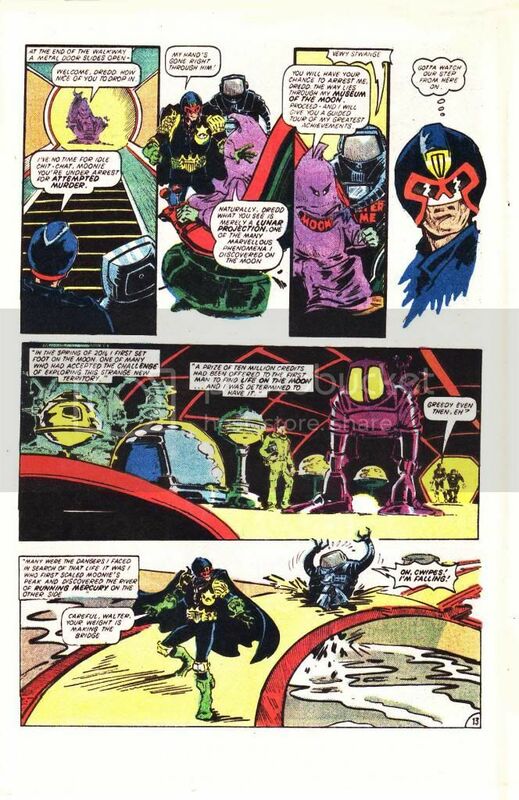 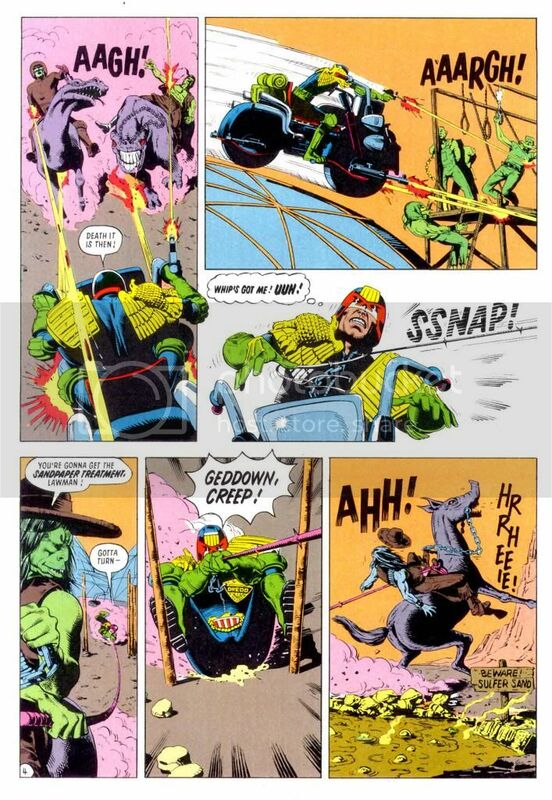 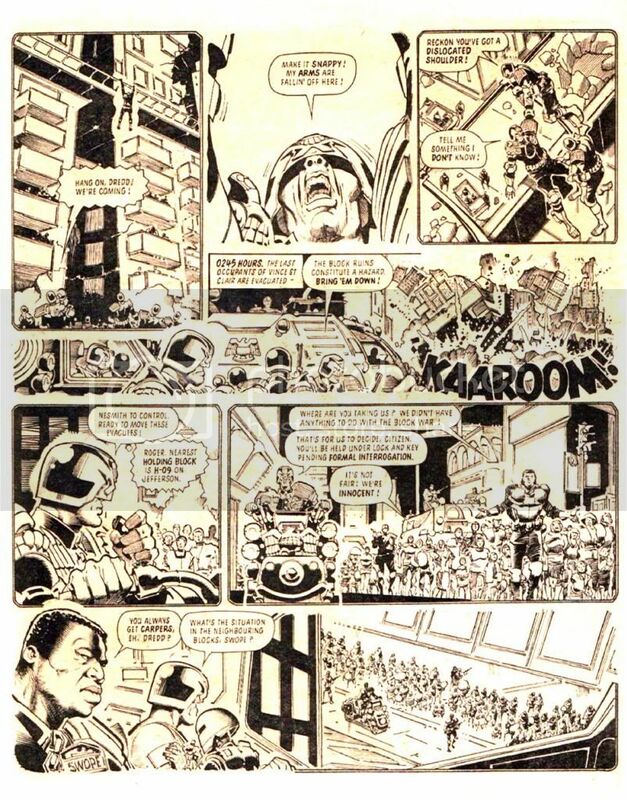 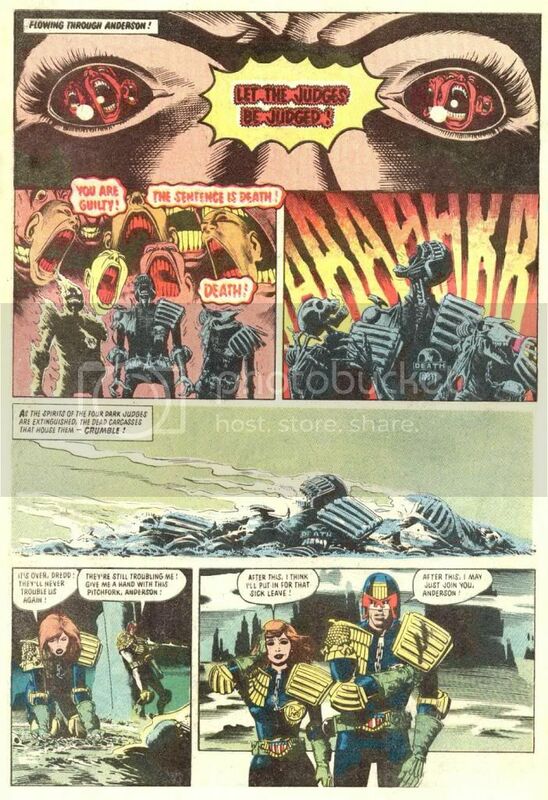 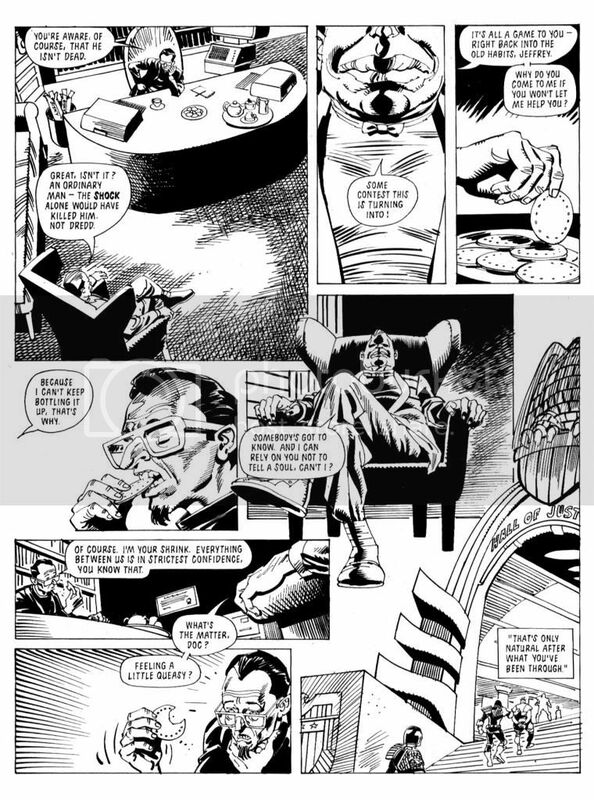 A few examples of Dredd being more machine than man!